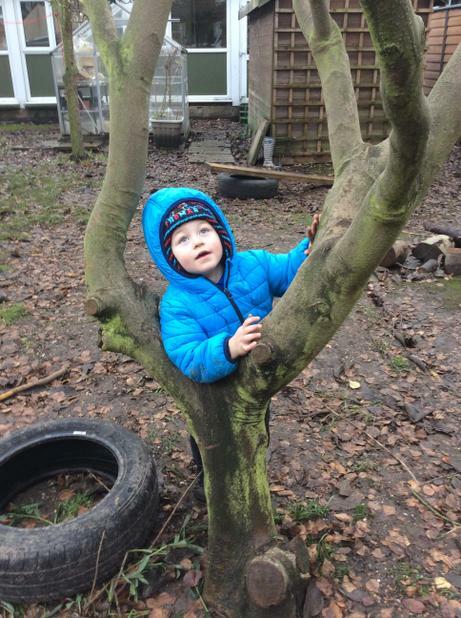 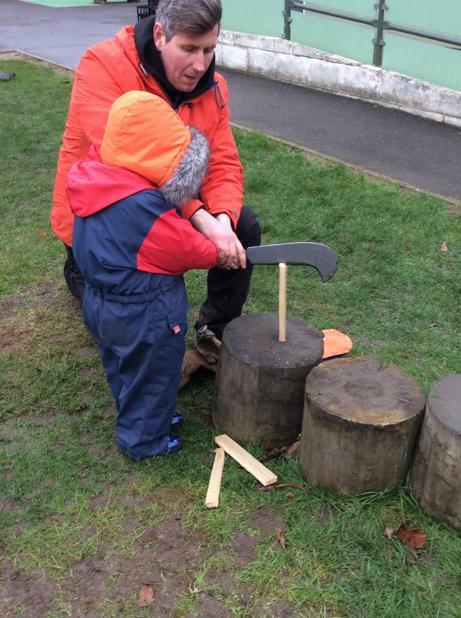 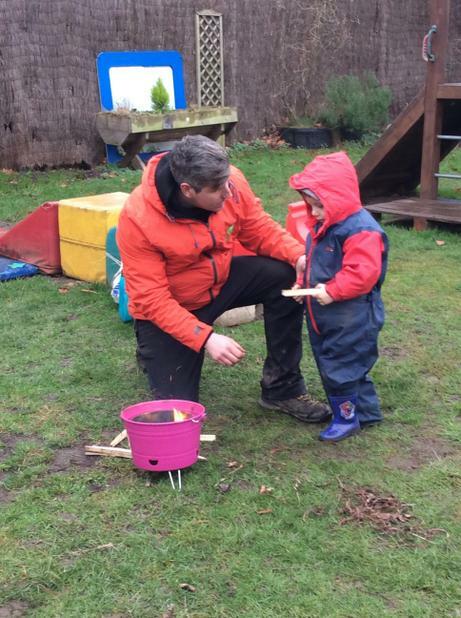 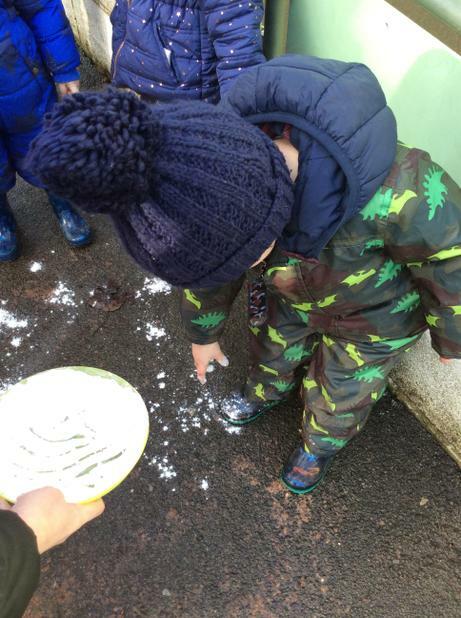 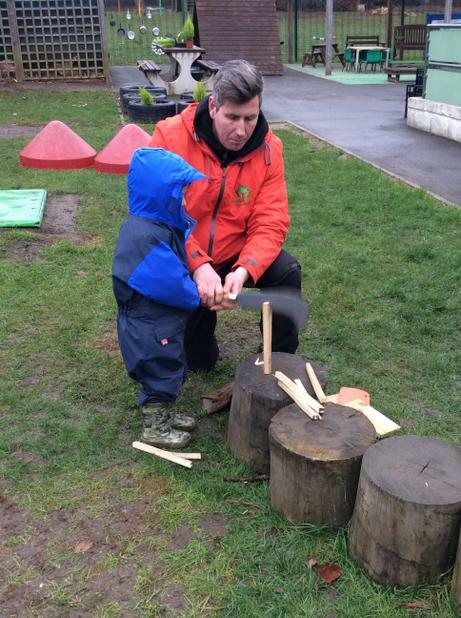 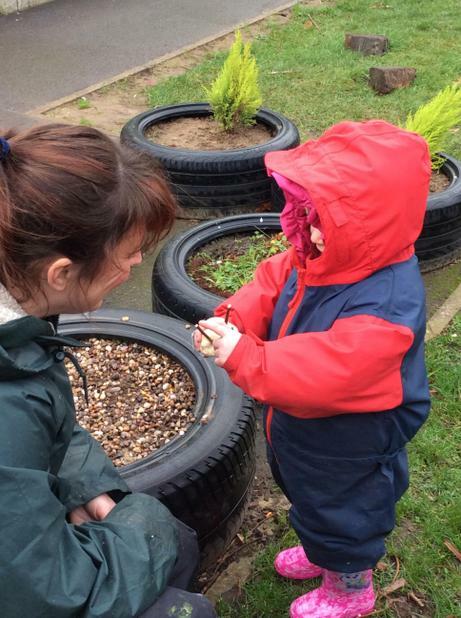 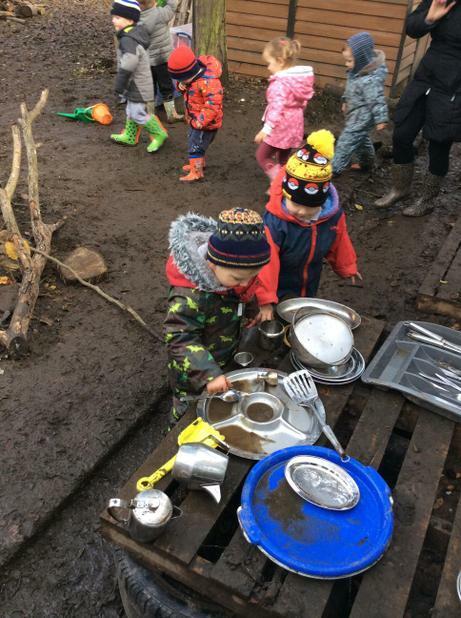 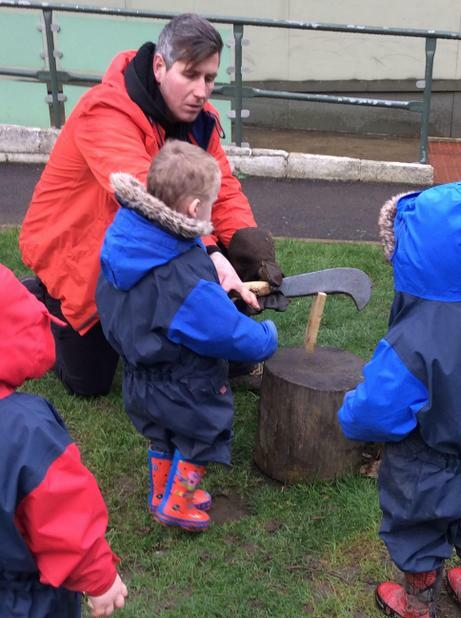 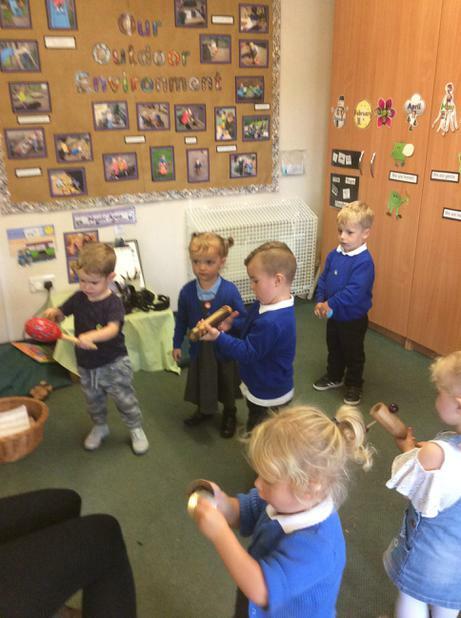 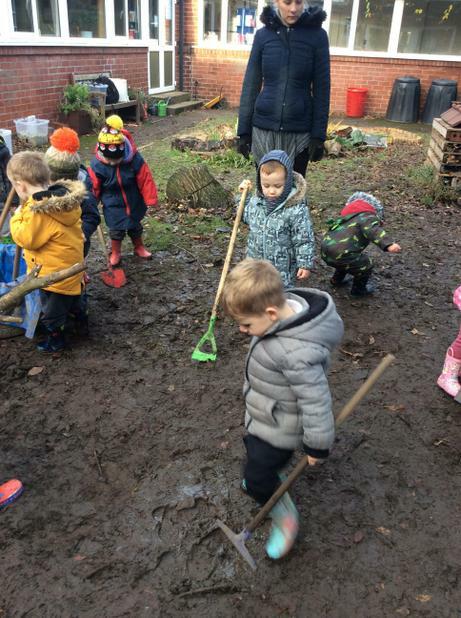 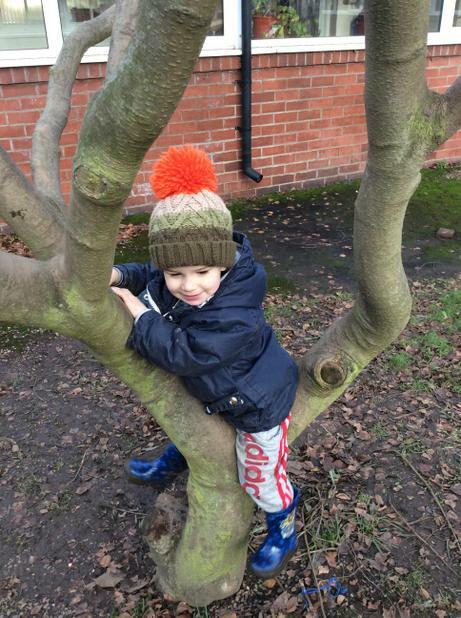 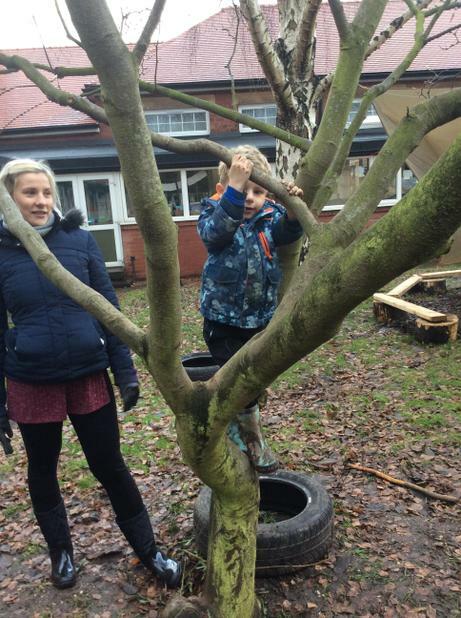 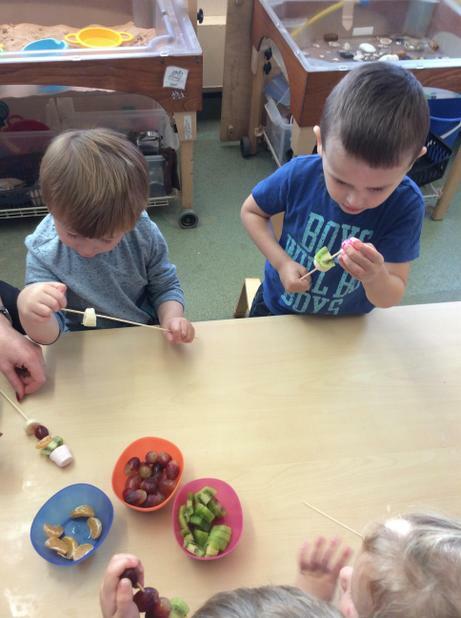 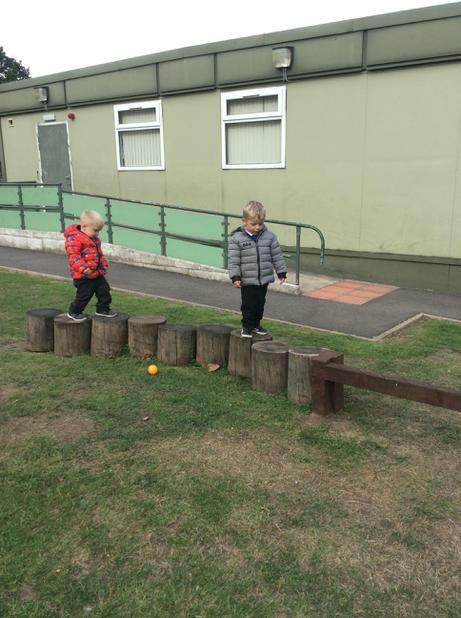 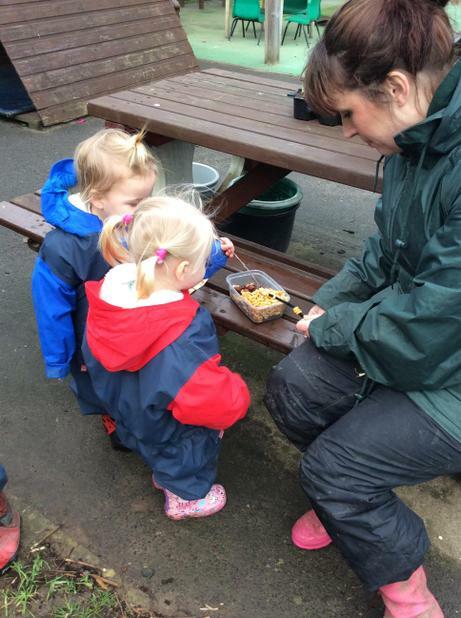 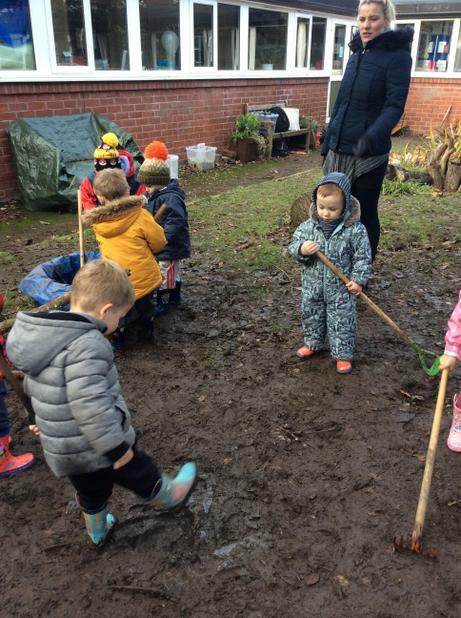 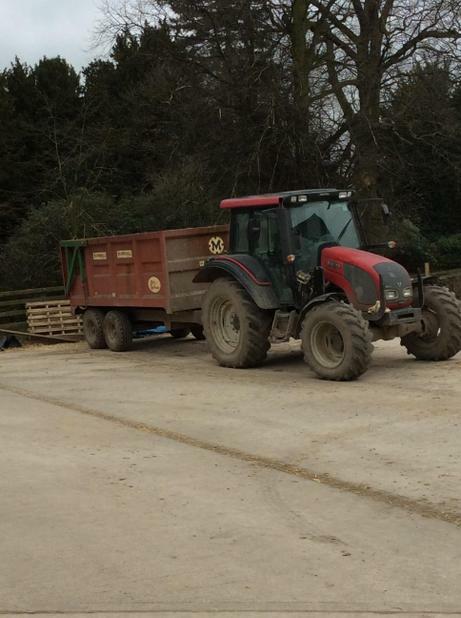 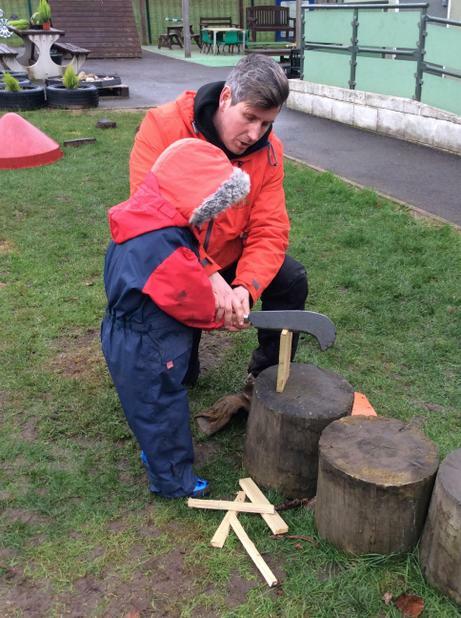 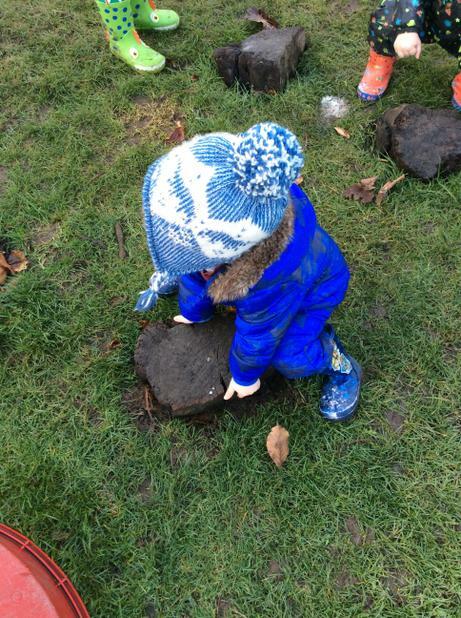 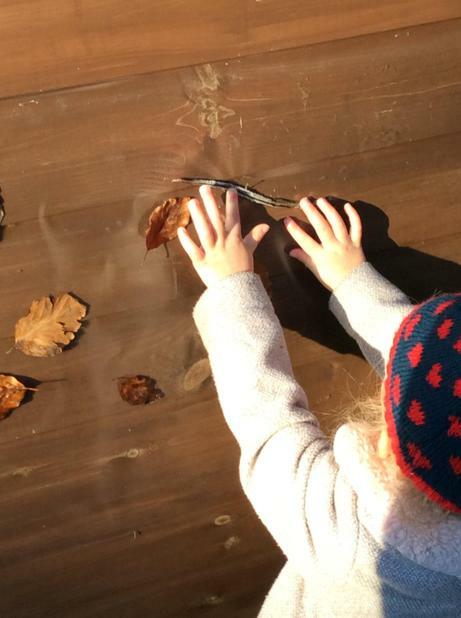 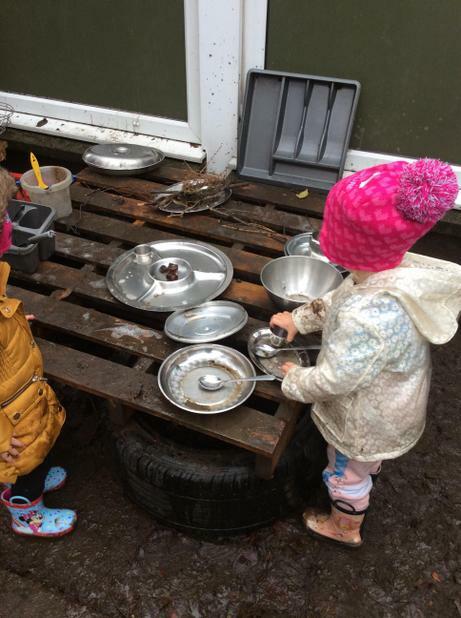 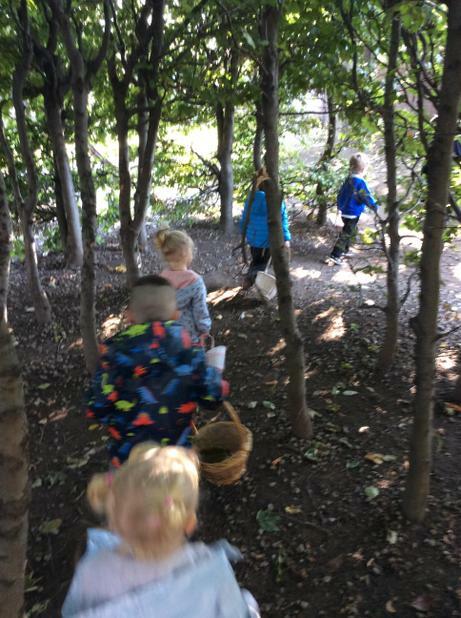 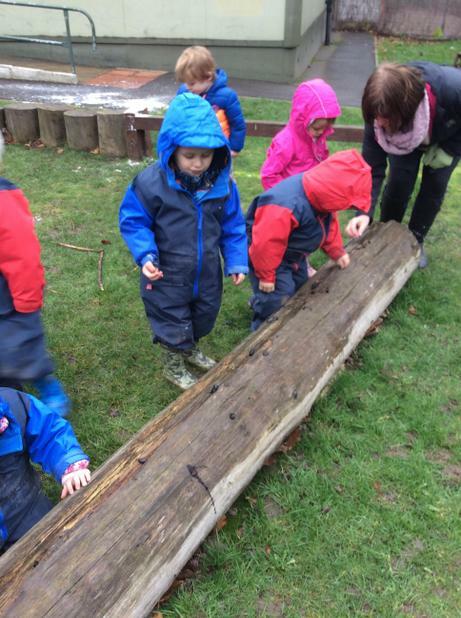 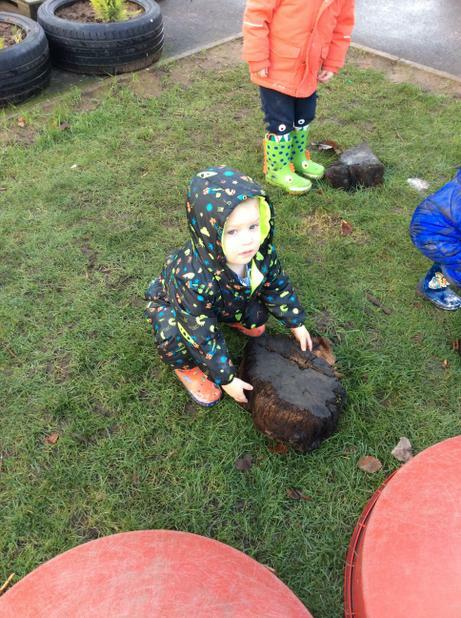 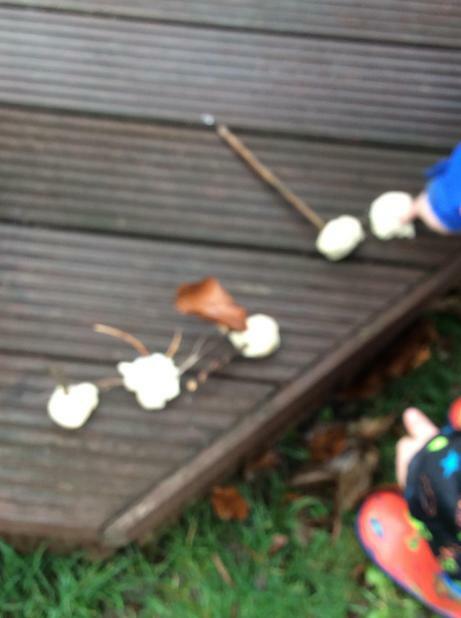 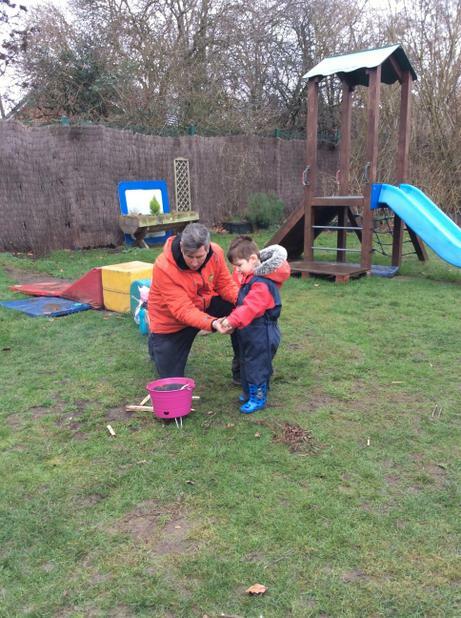 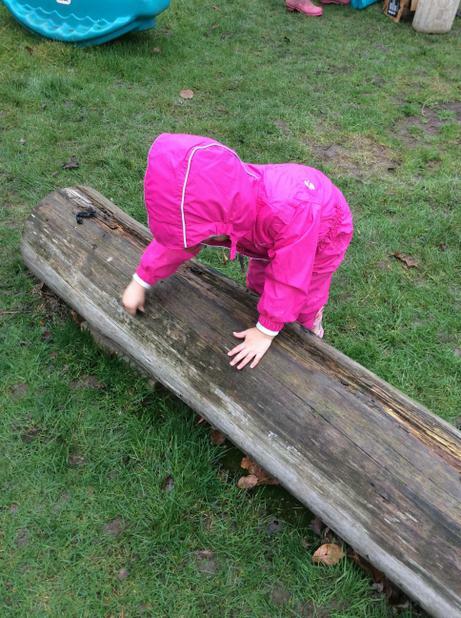 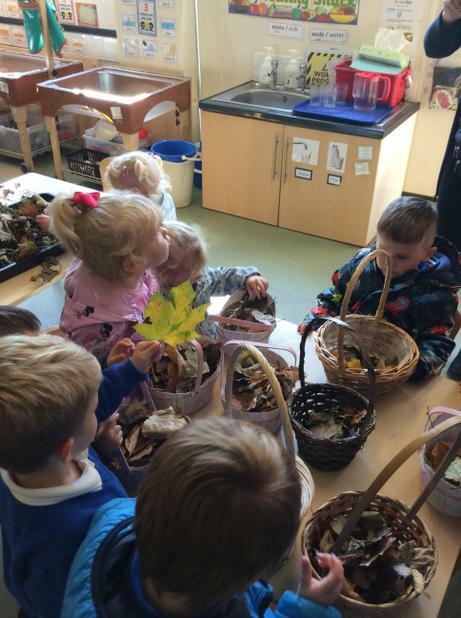 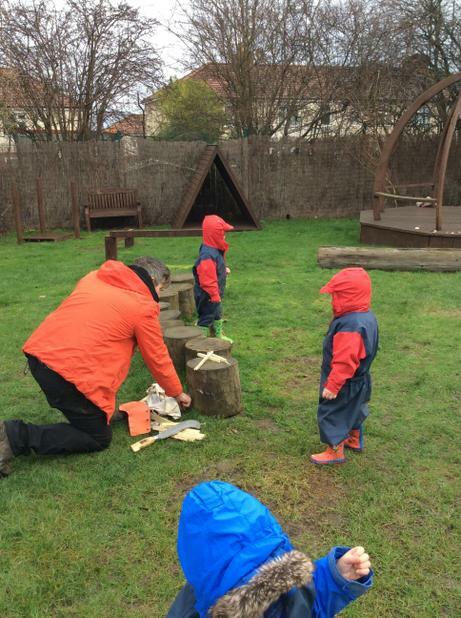 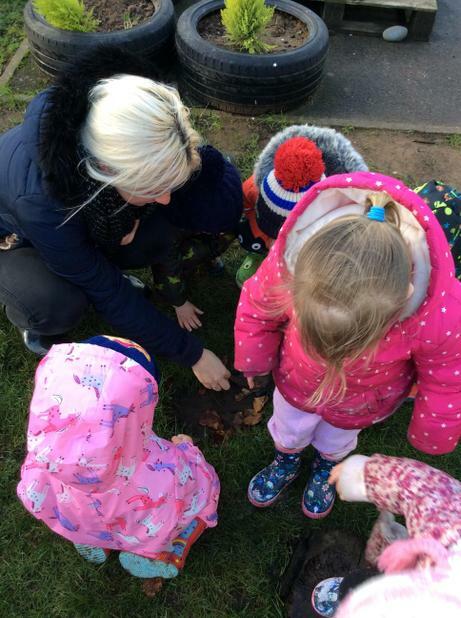 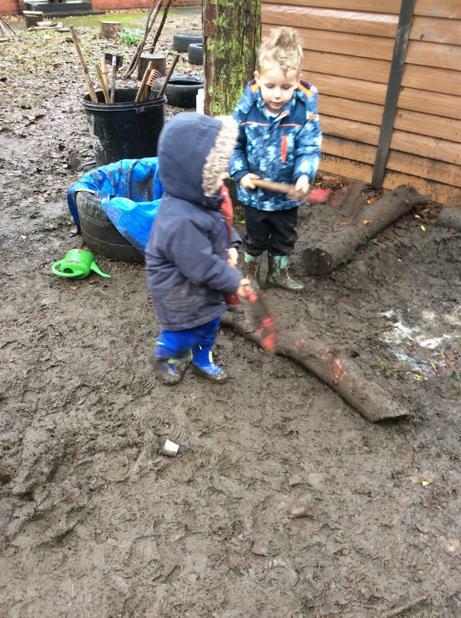 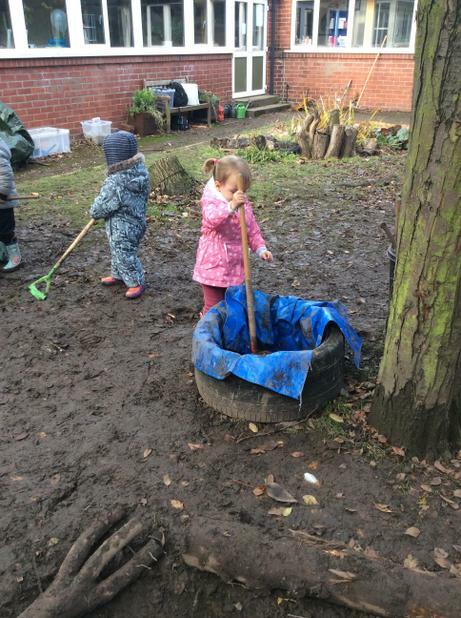 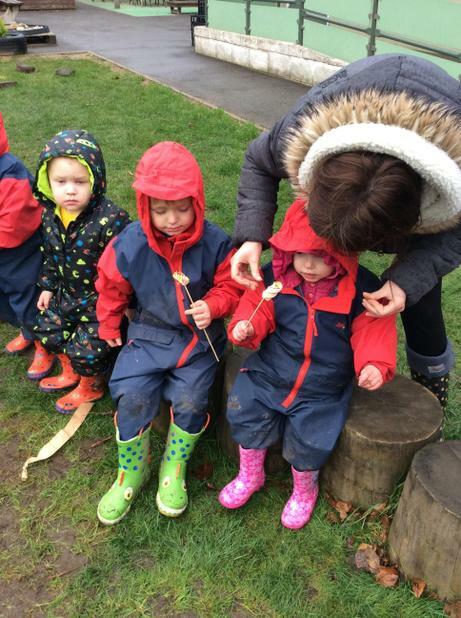 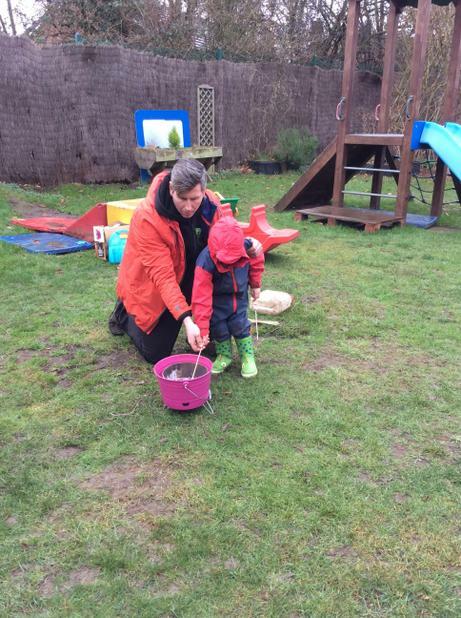 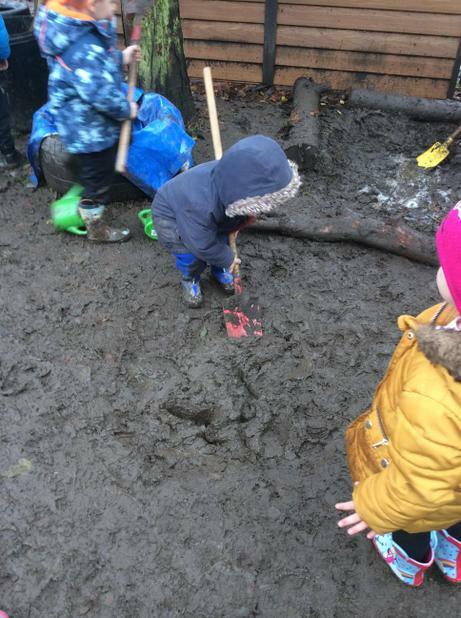 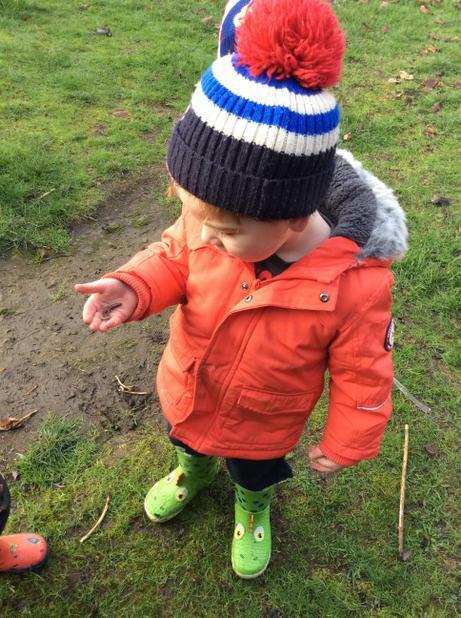 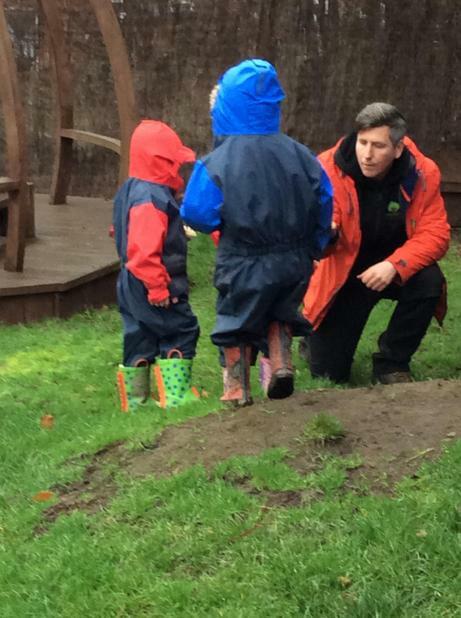 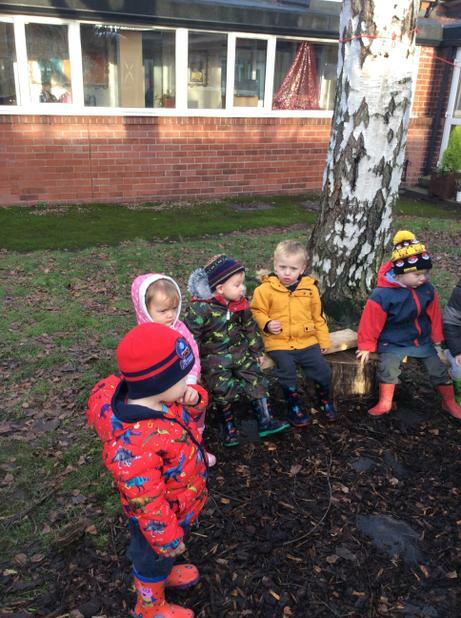 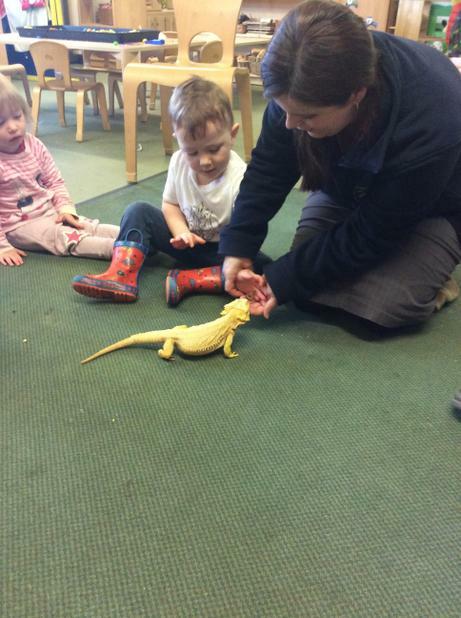 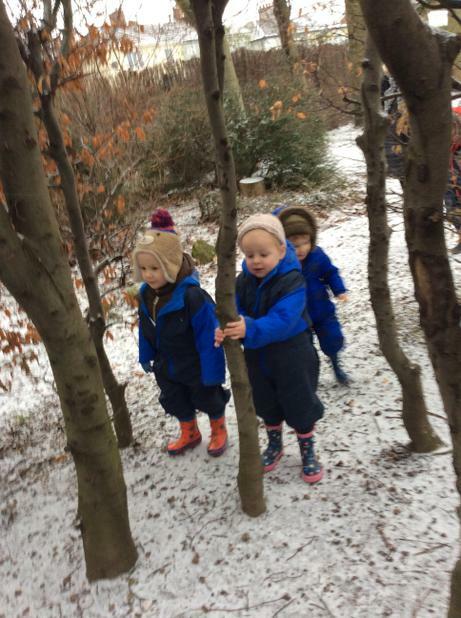 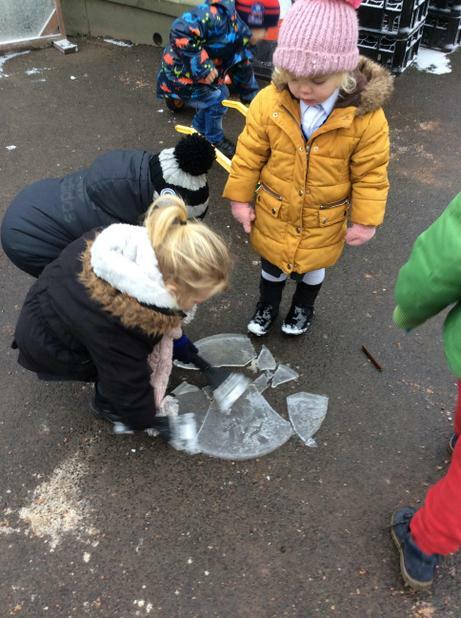 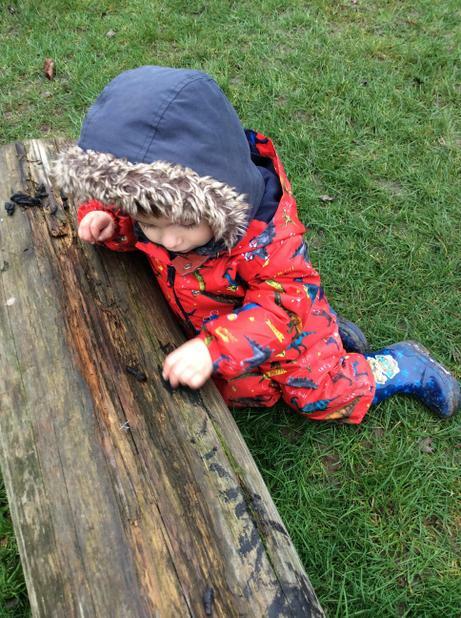 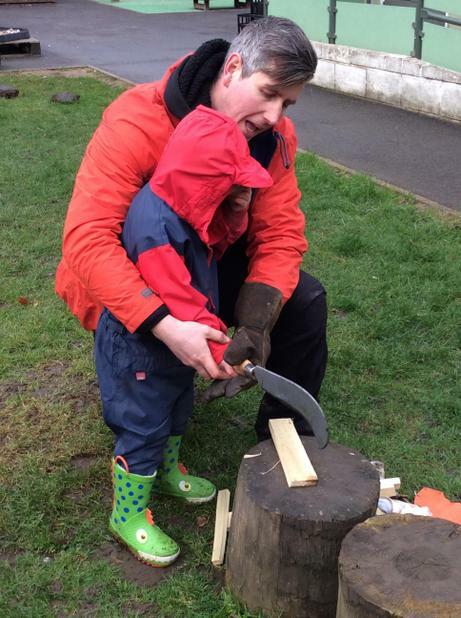 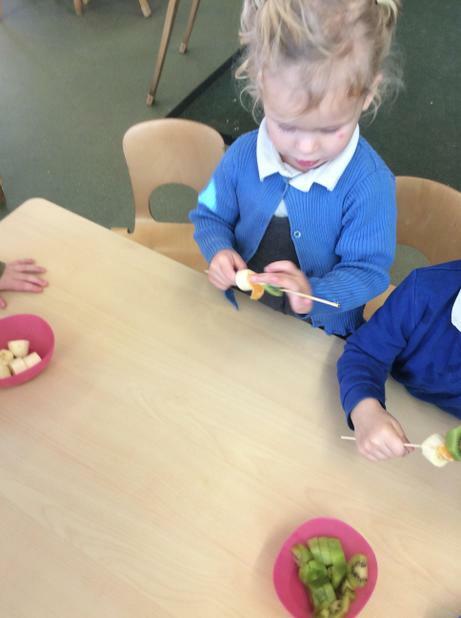 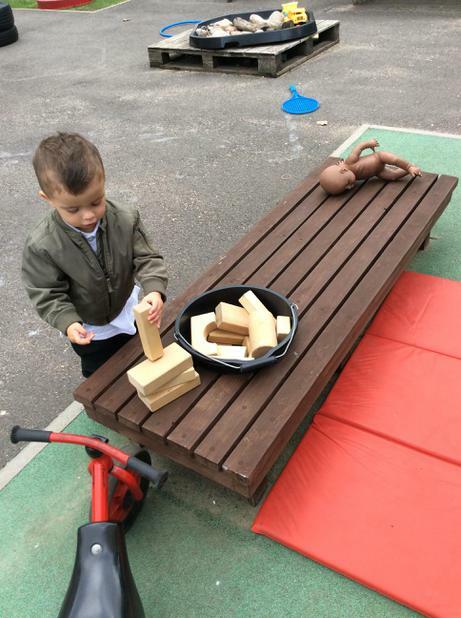 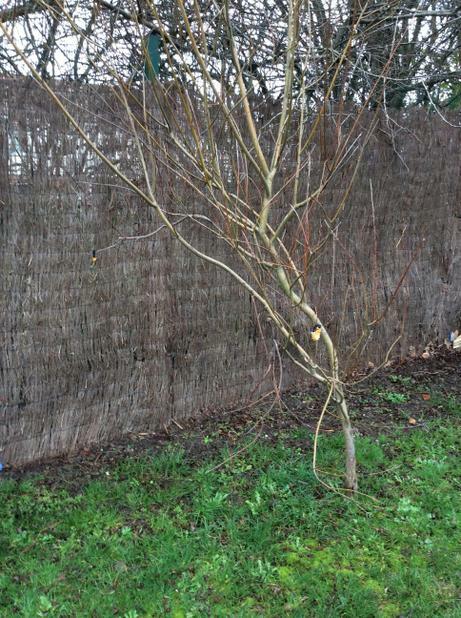 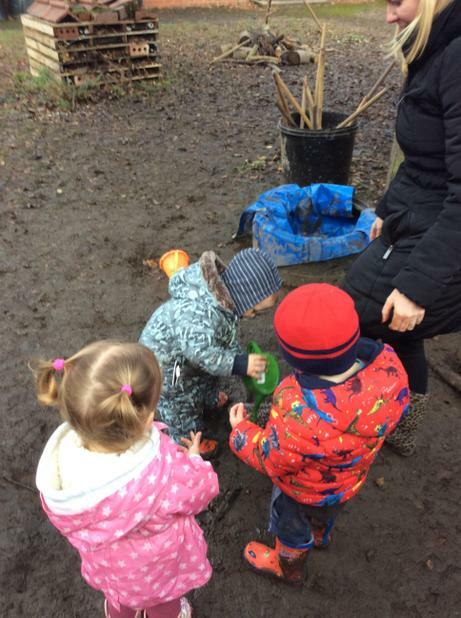 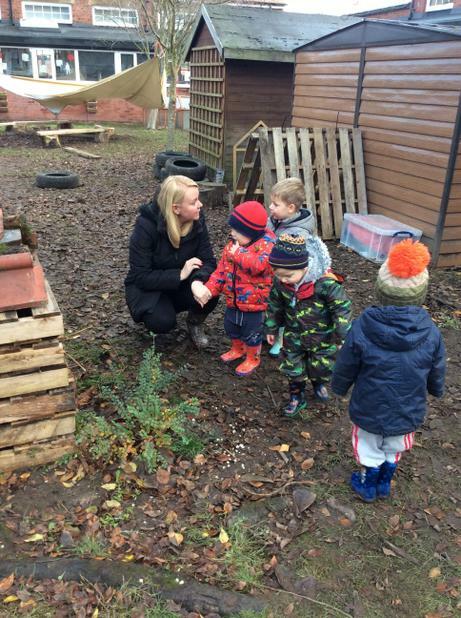 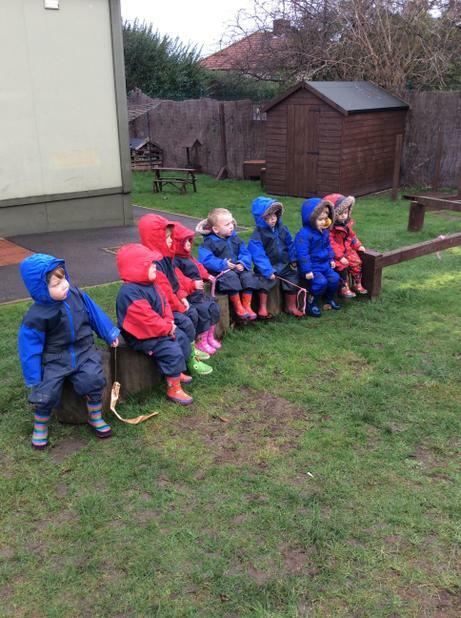 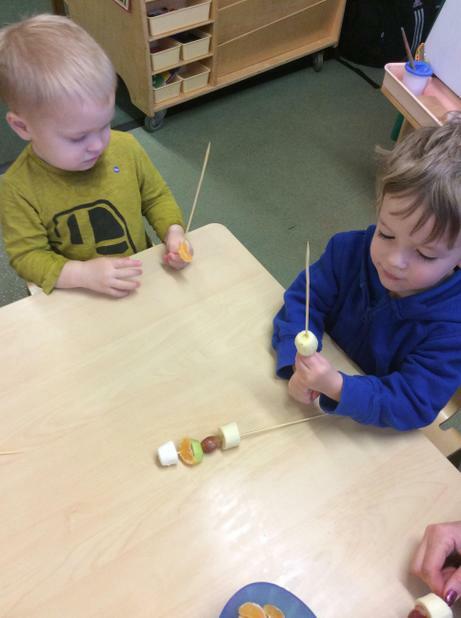 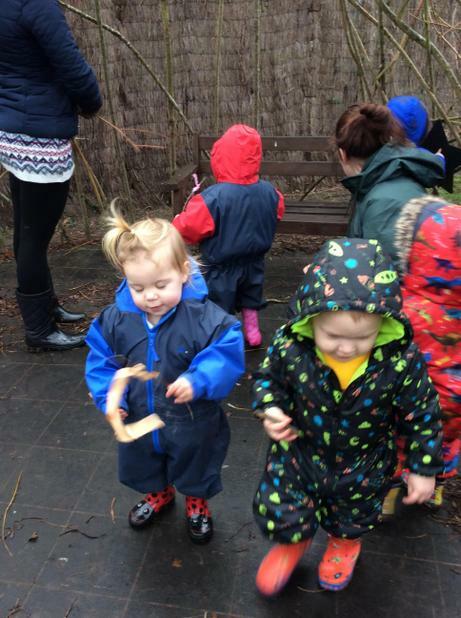 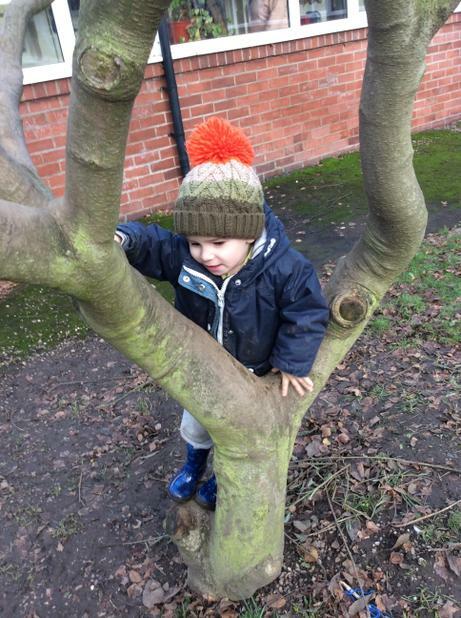 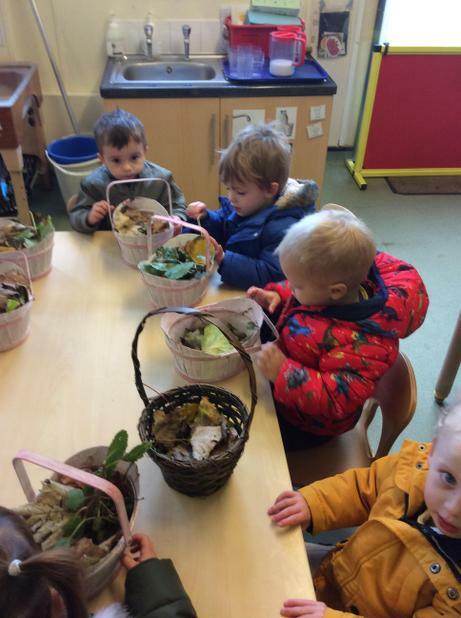 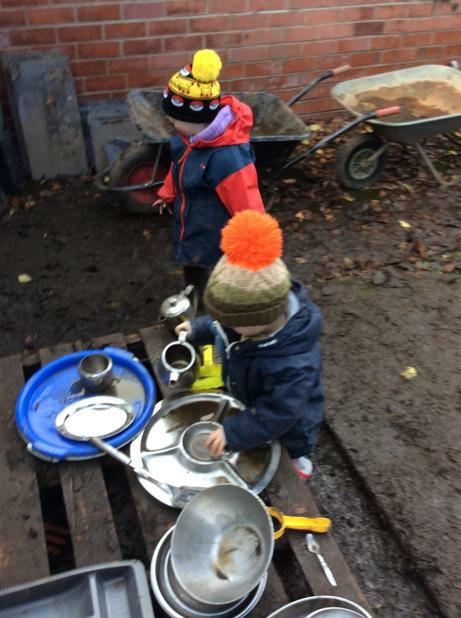 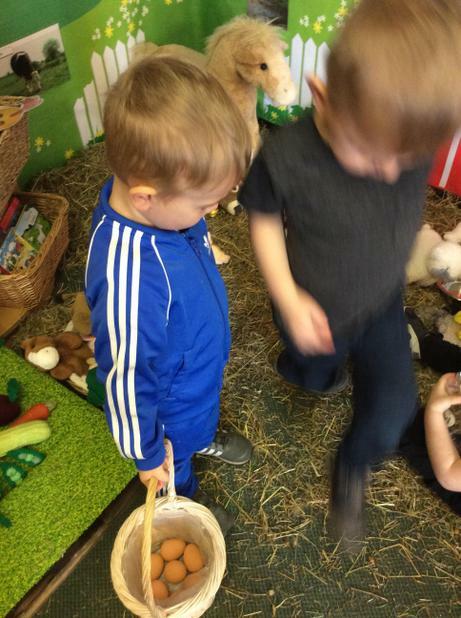 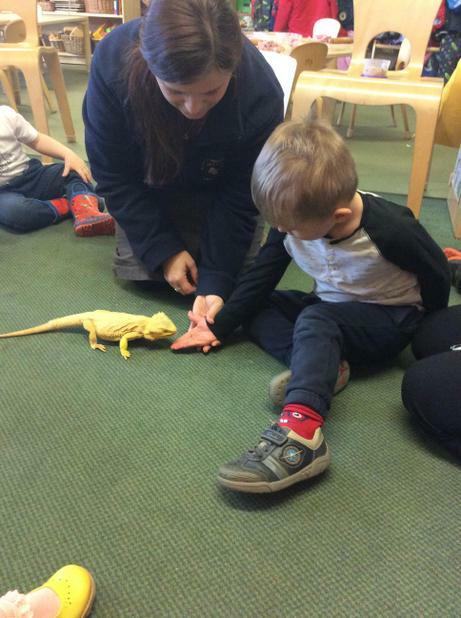 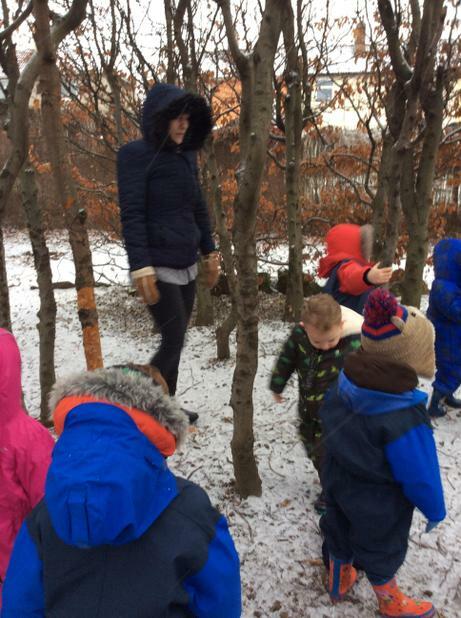 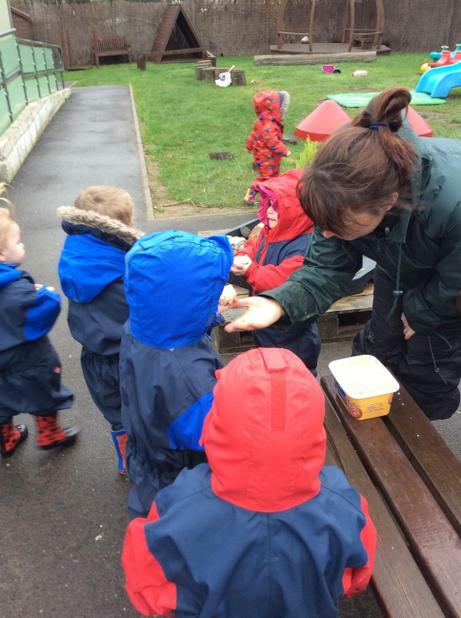 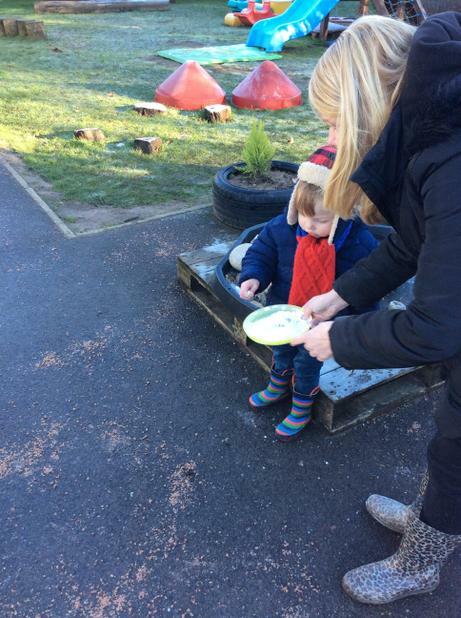 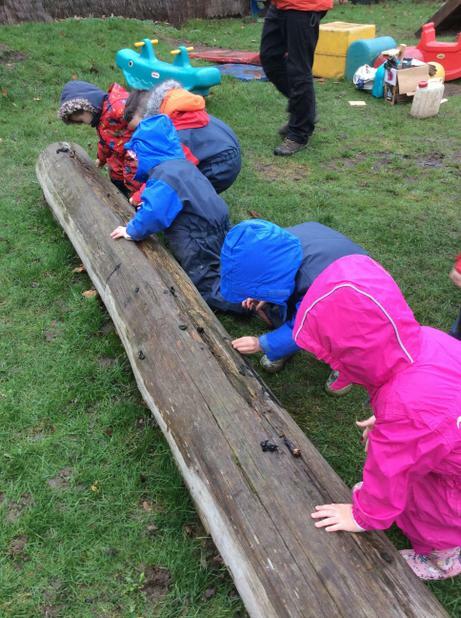 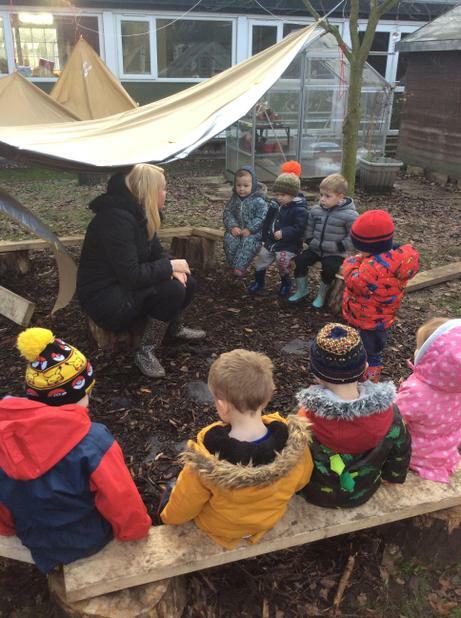 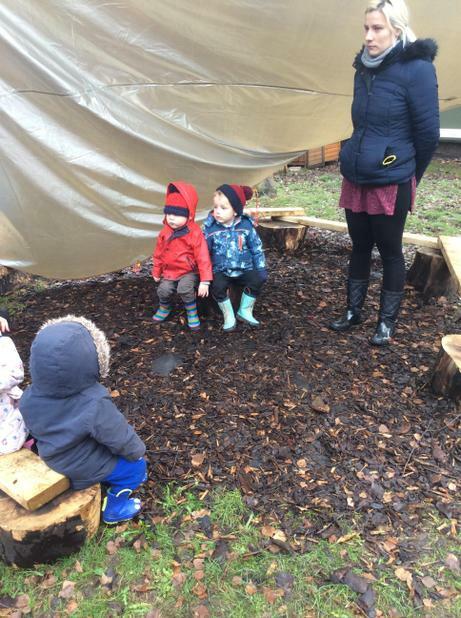 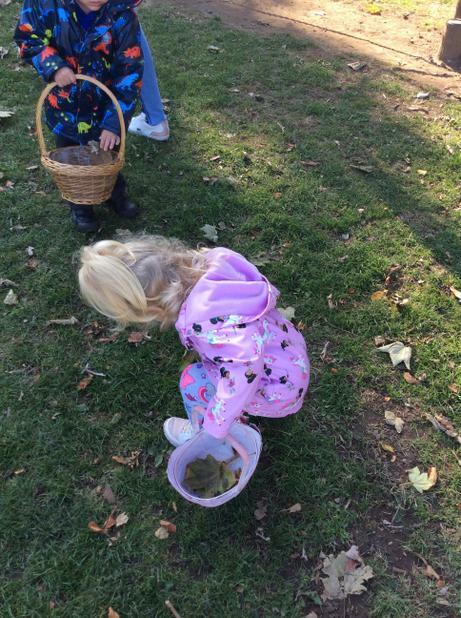 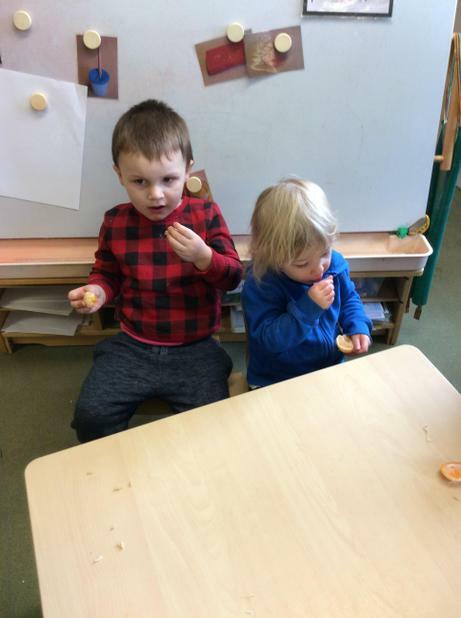 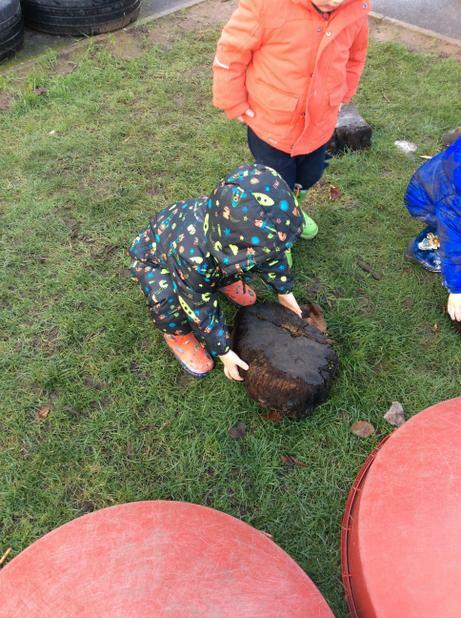 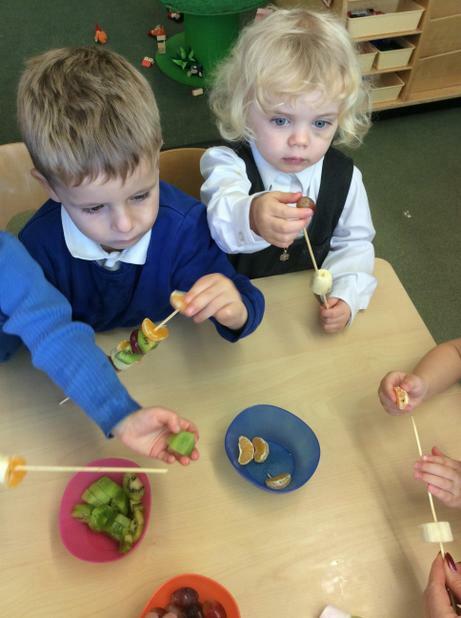 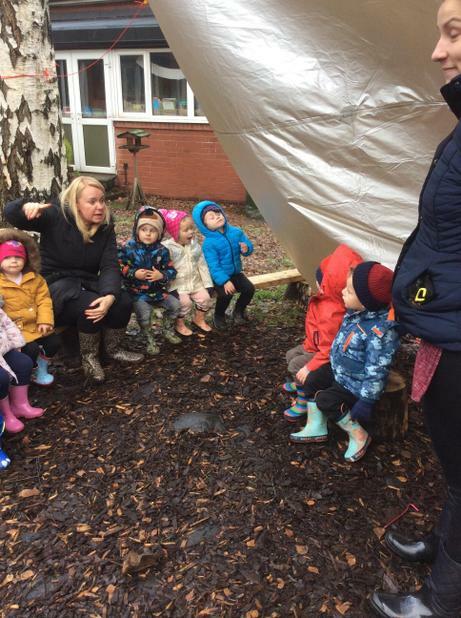 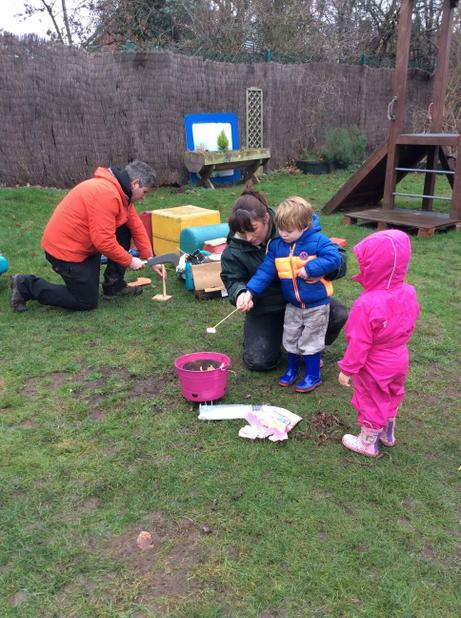 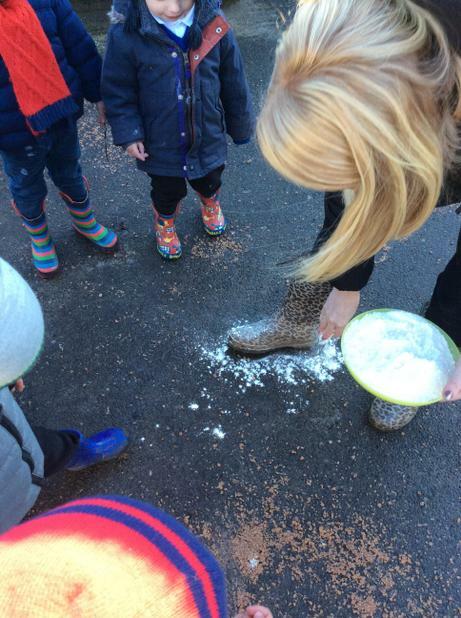 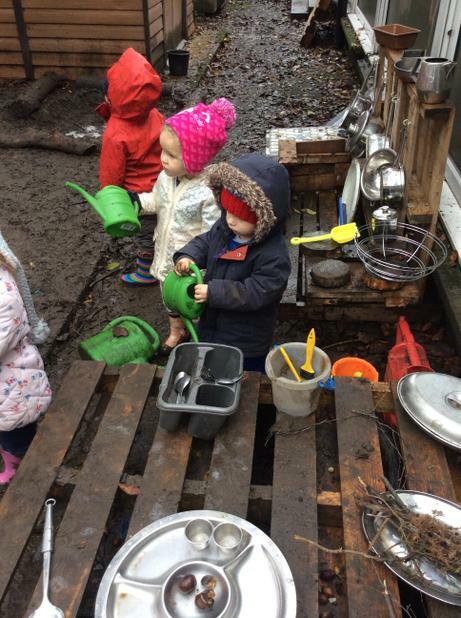 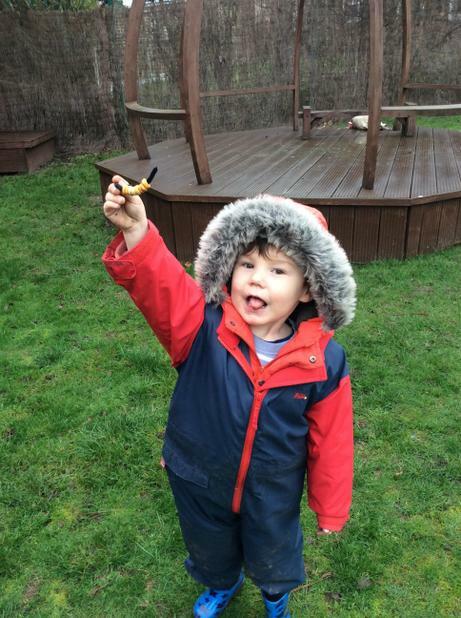 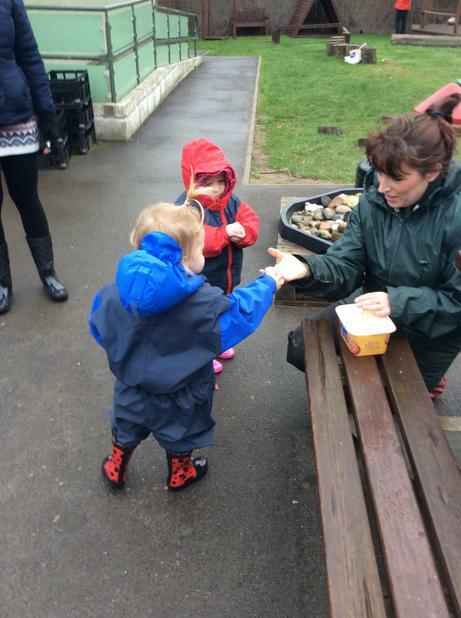 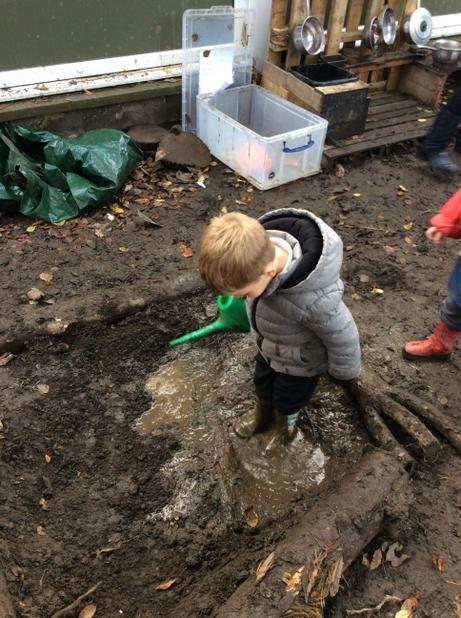 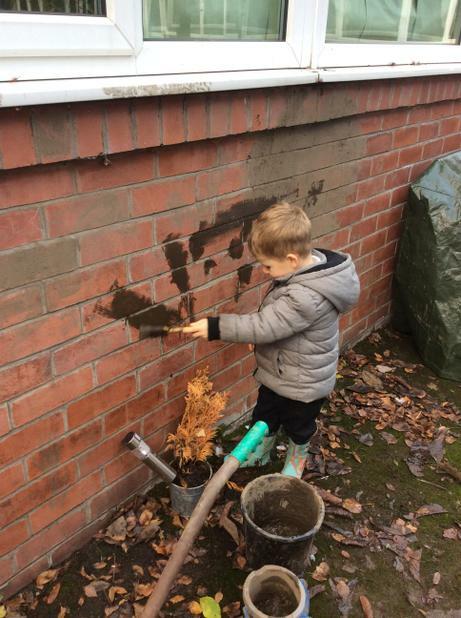 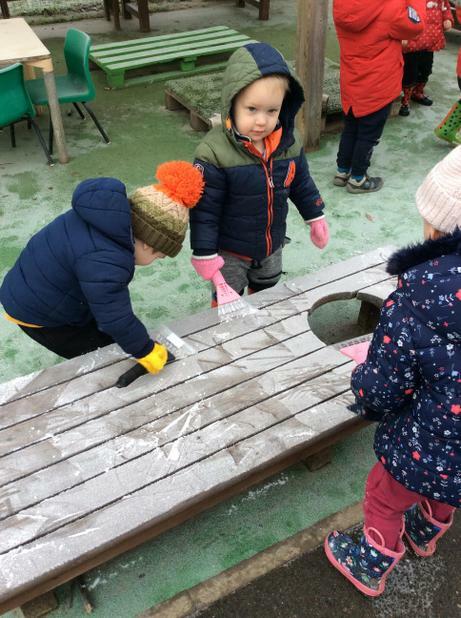 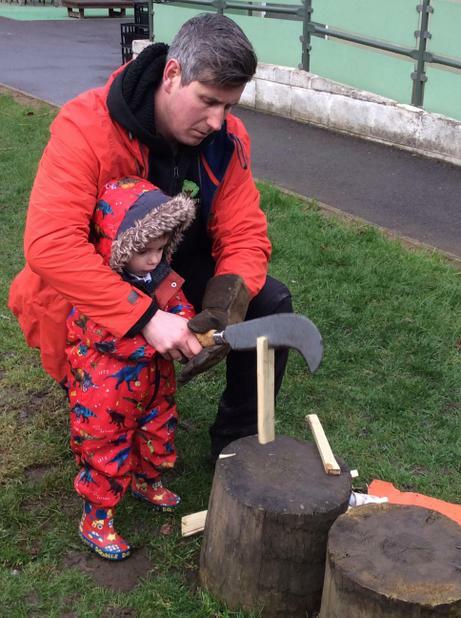 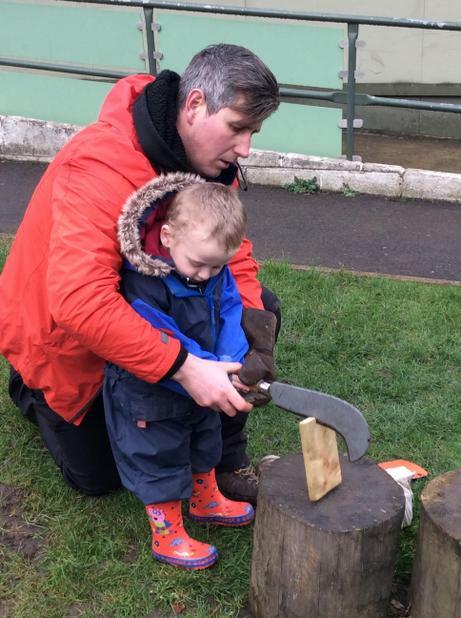 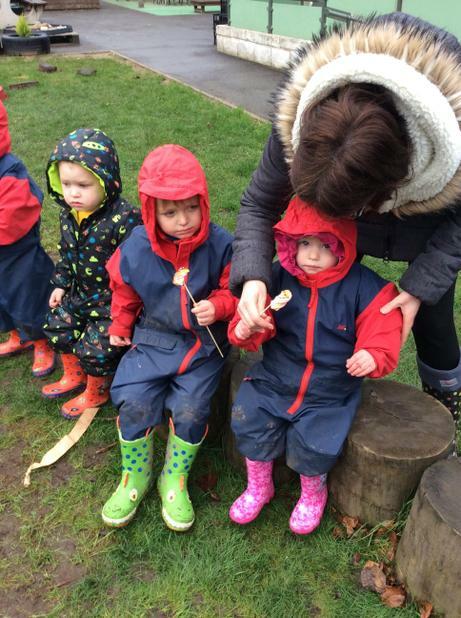 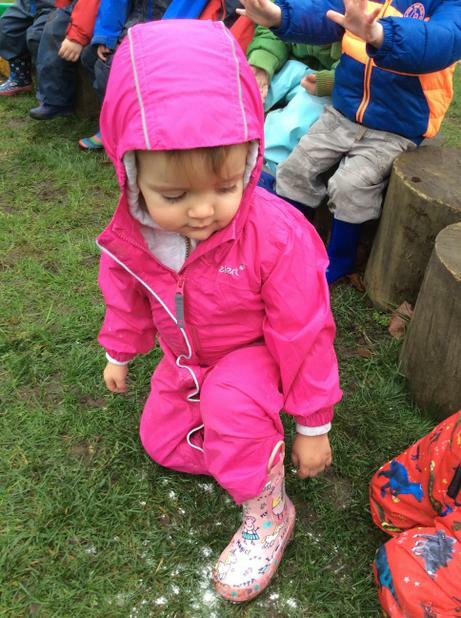 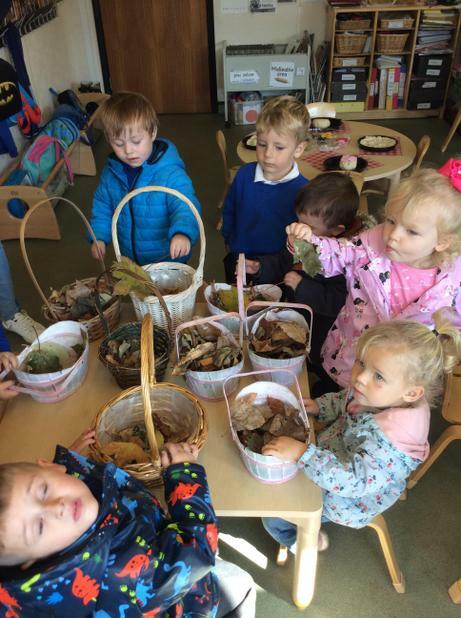 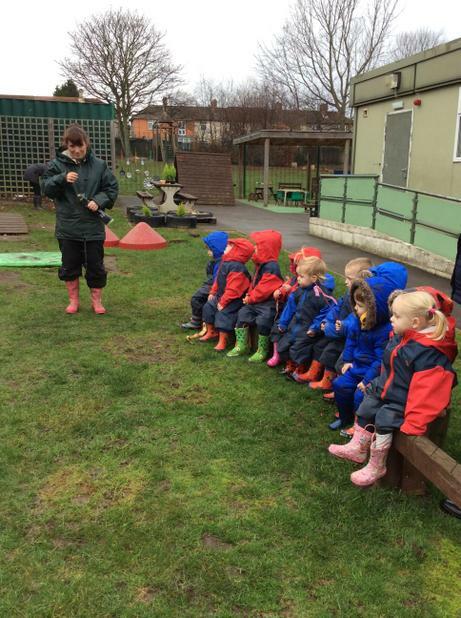 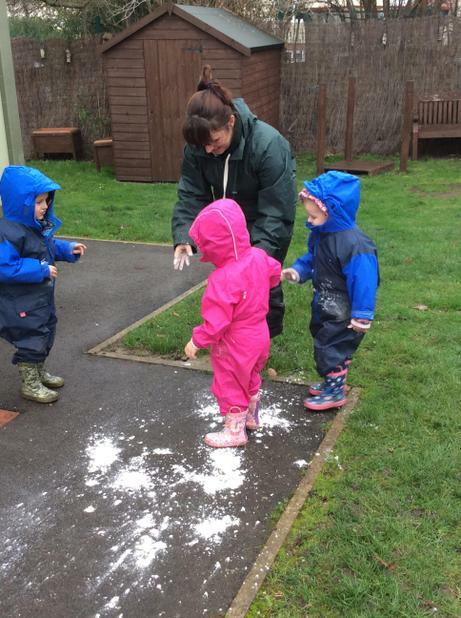 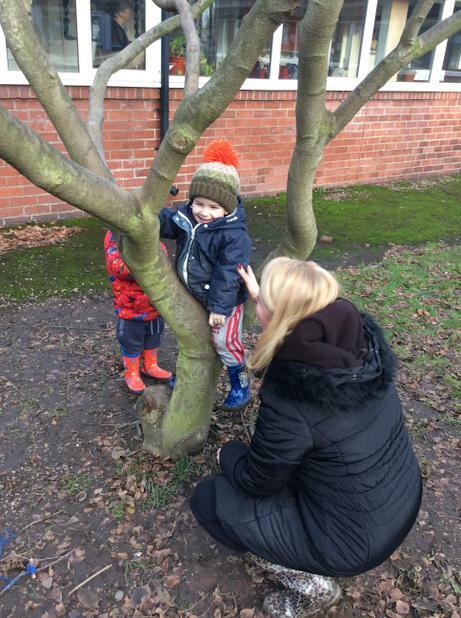 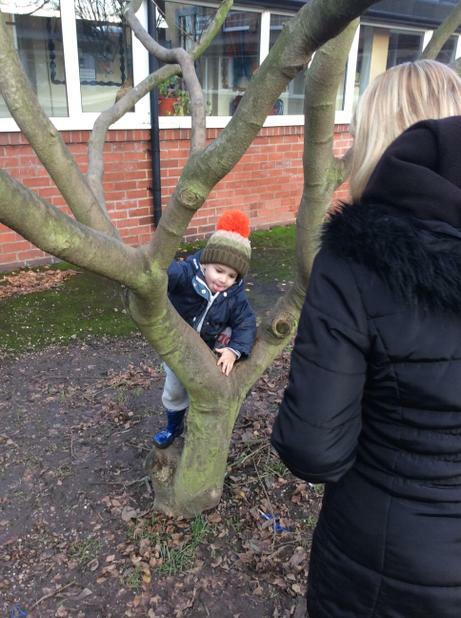 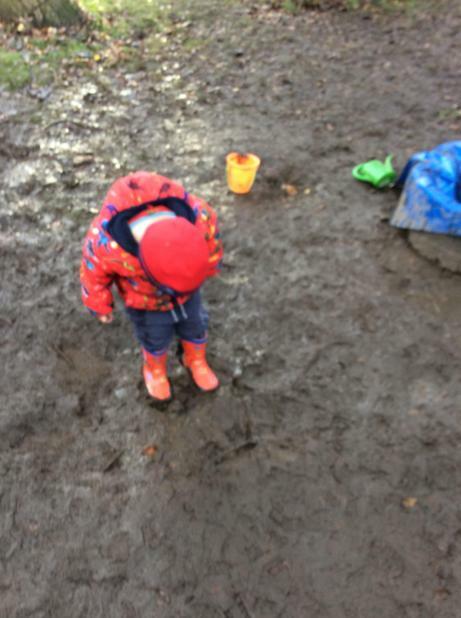 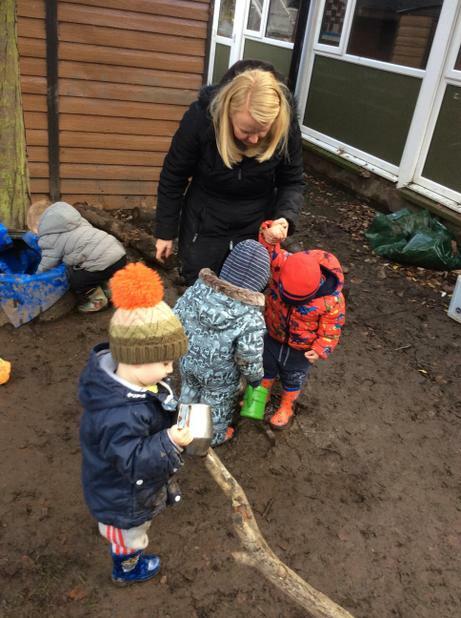 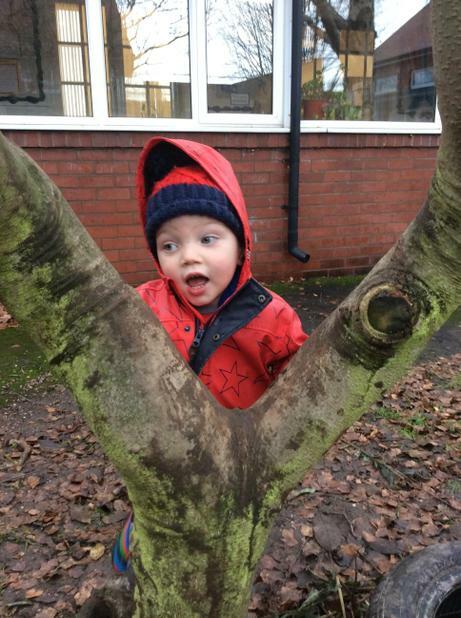 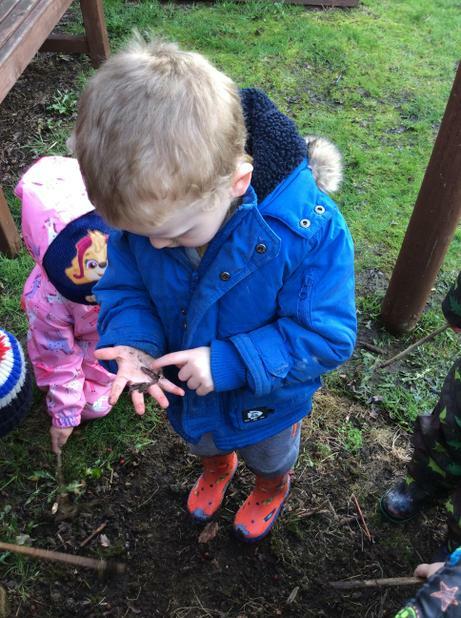 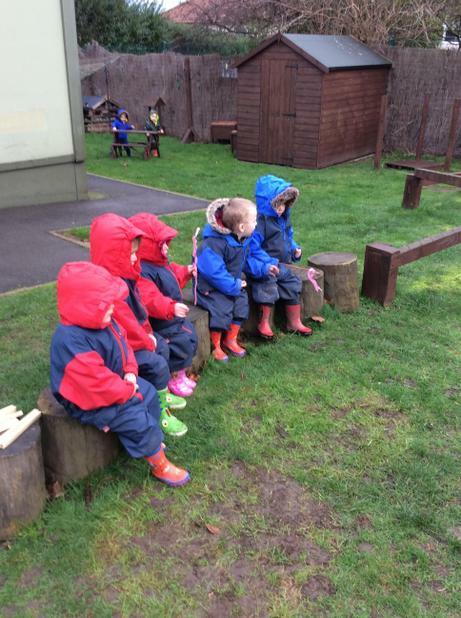 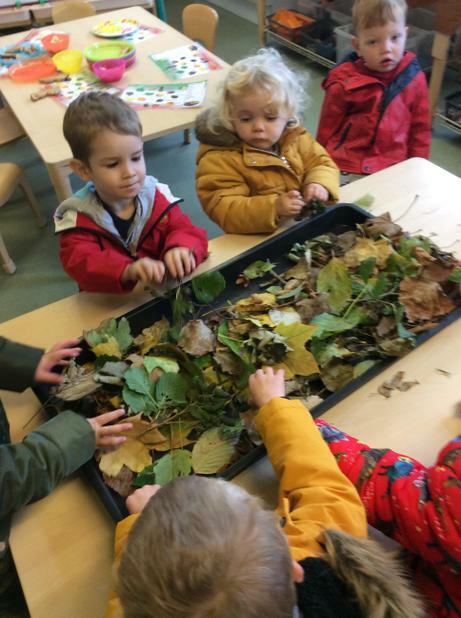 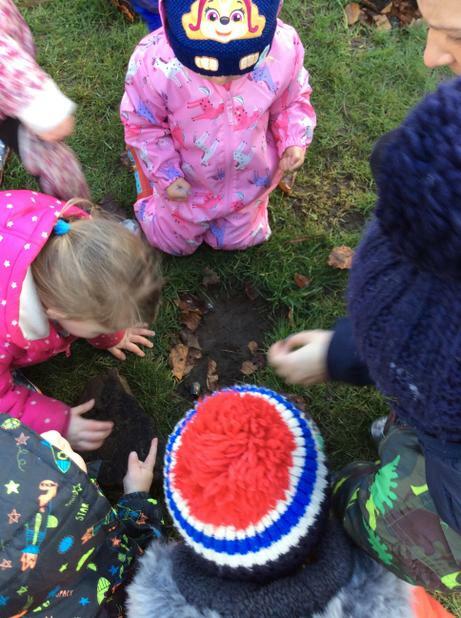 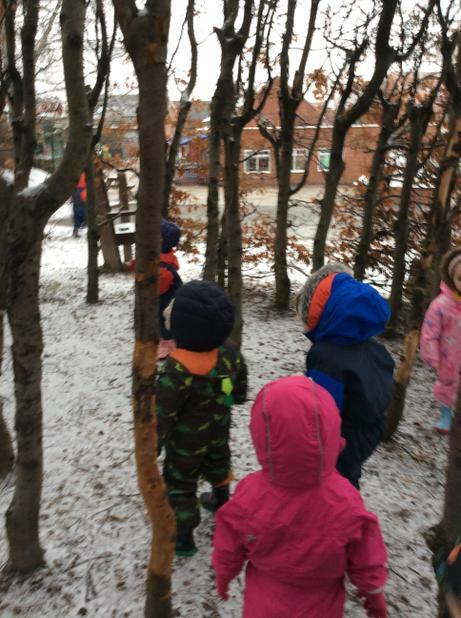 Forest School sessions this week. 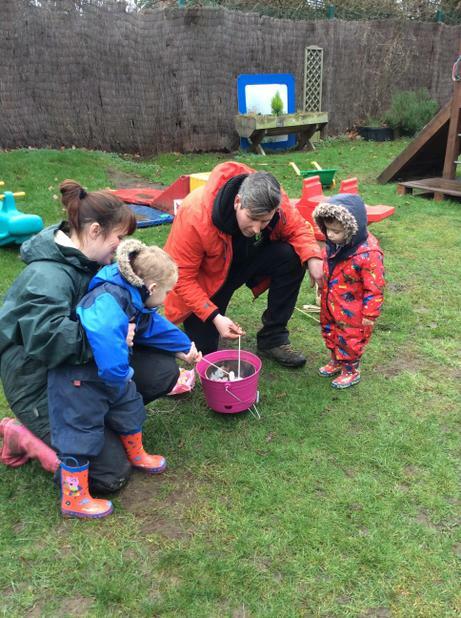 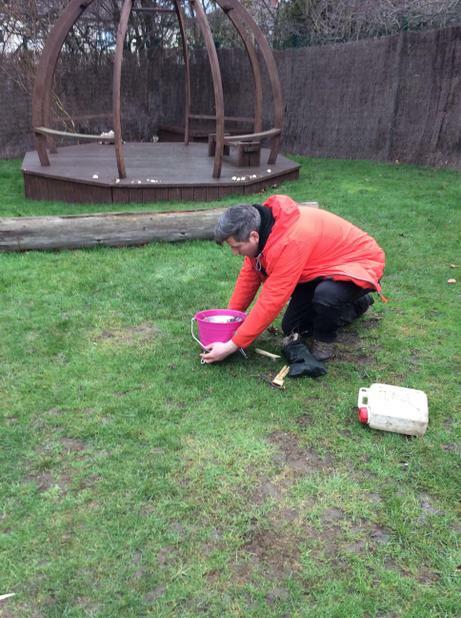 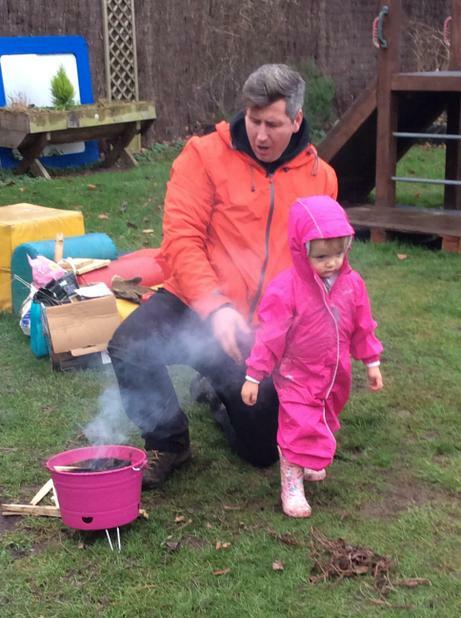 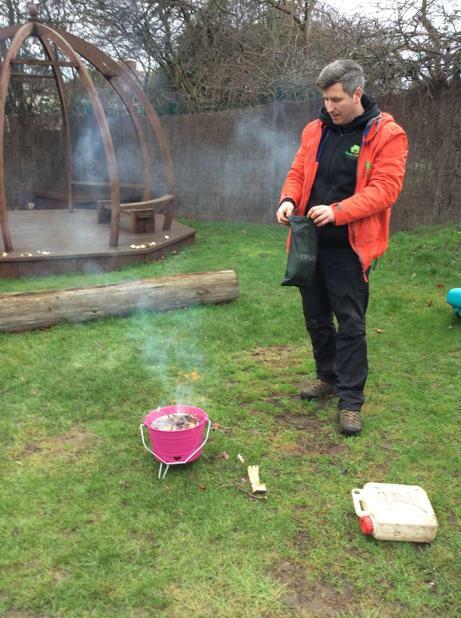 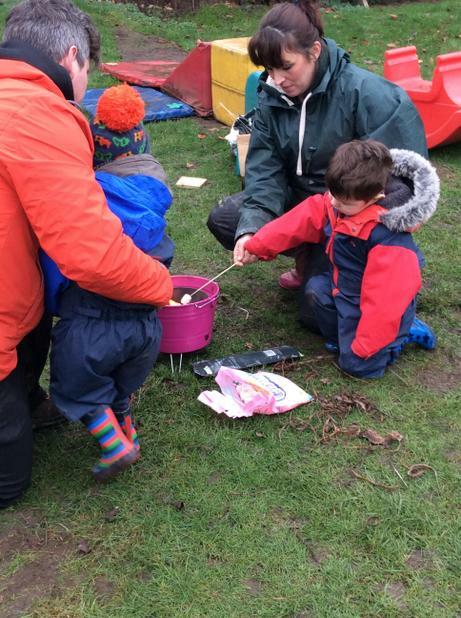 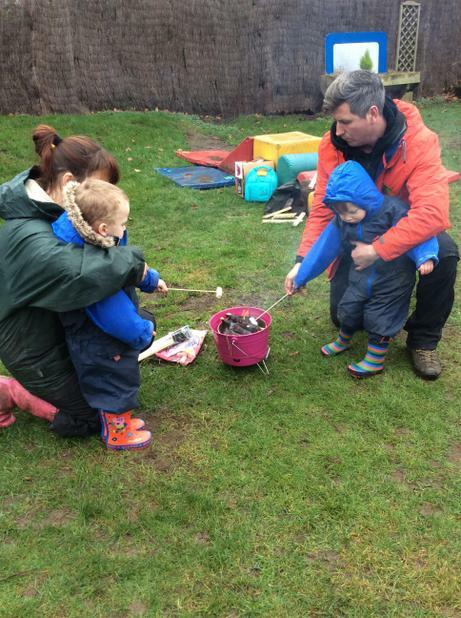 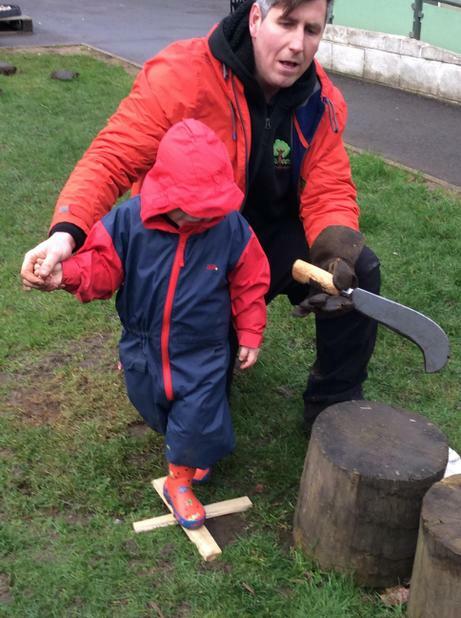 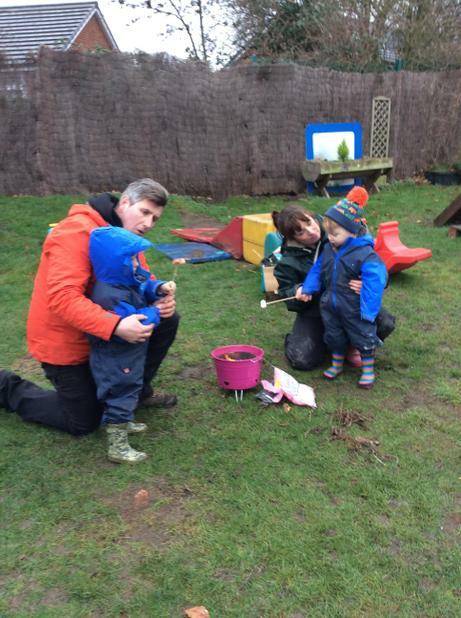 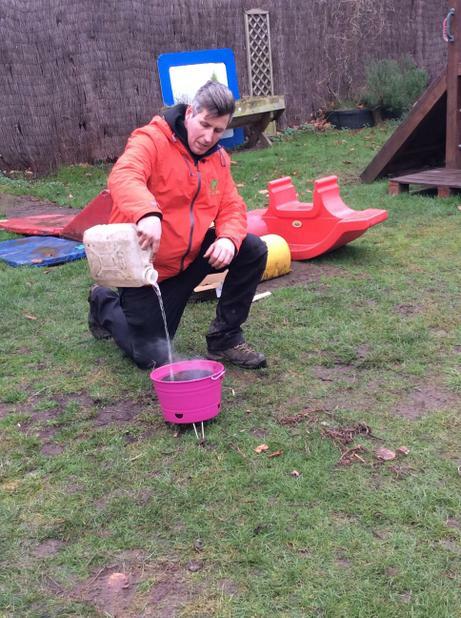 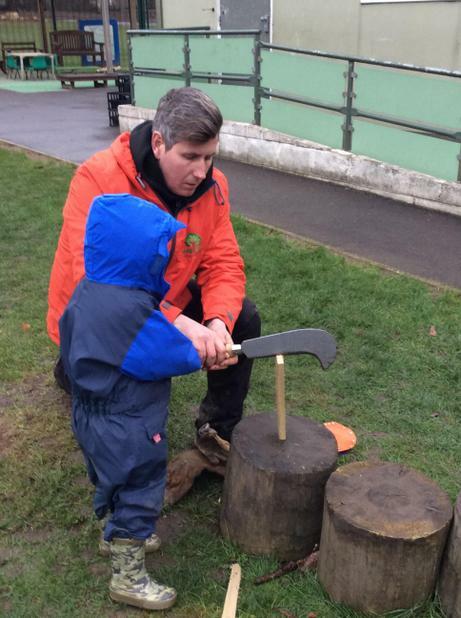 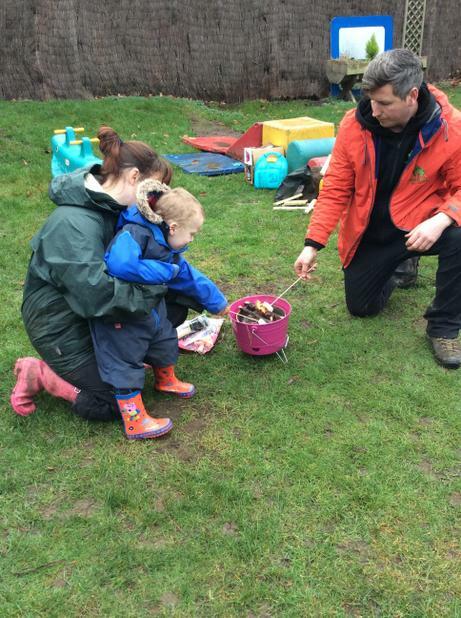 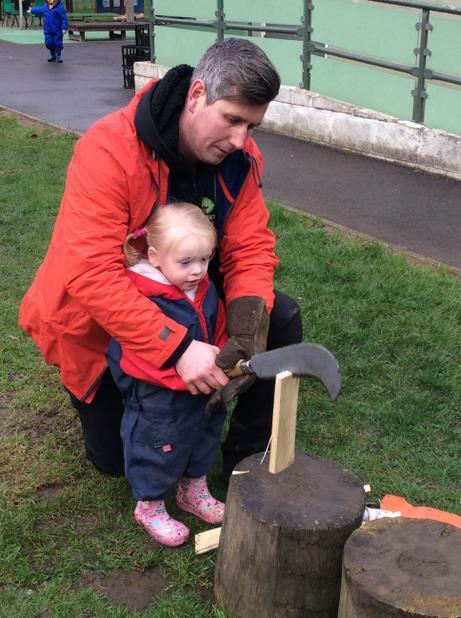 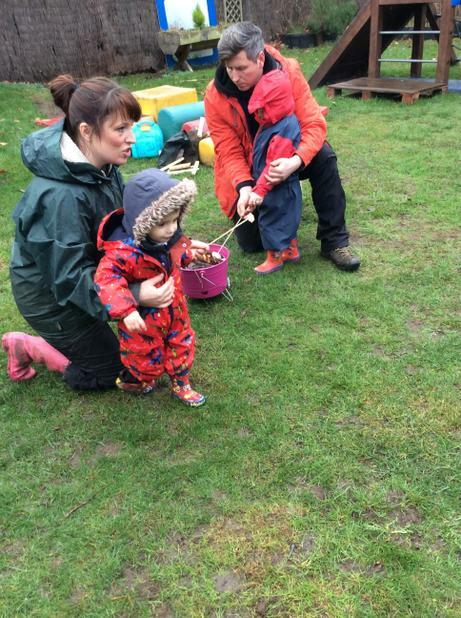 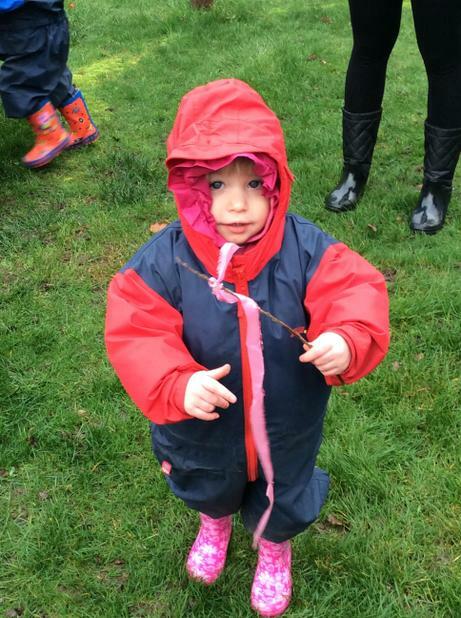 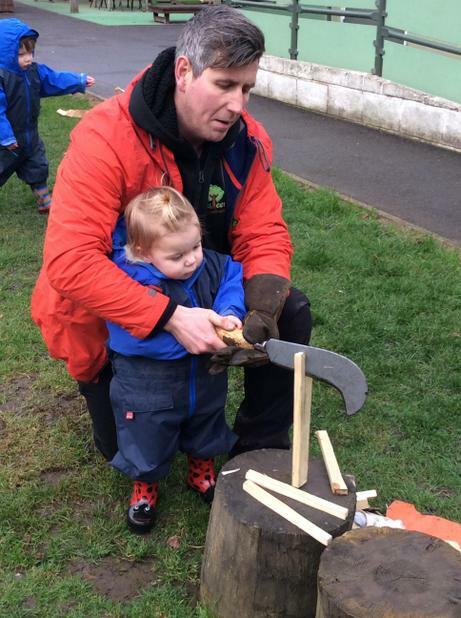 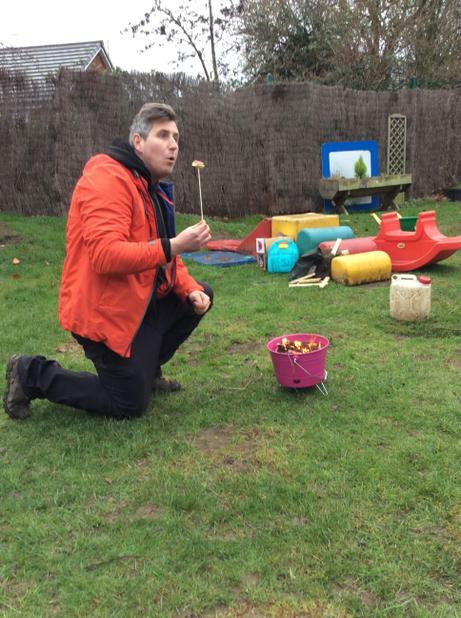 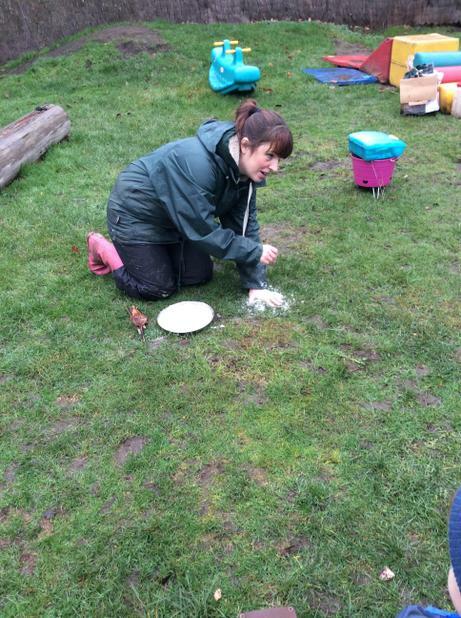 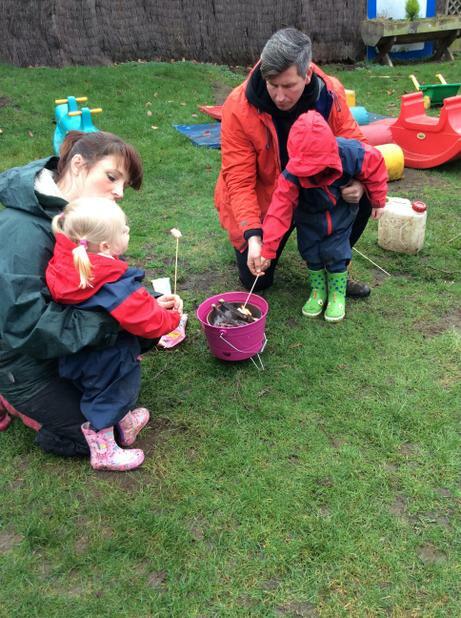 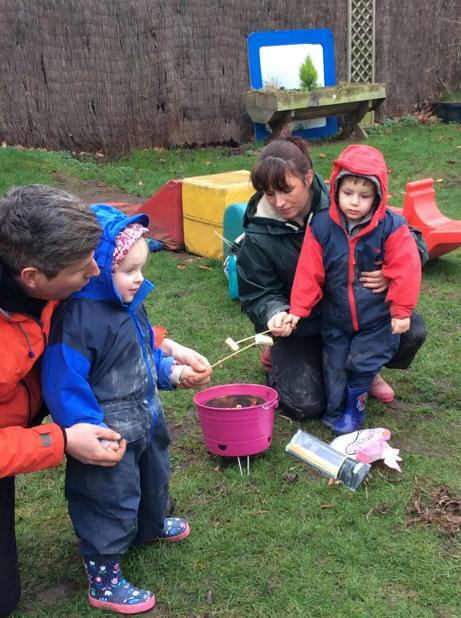 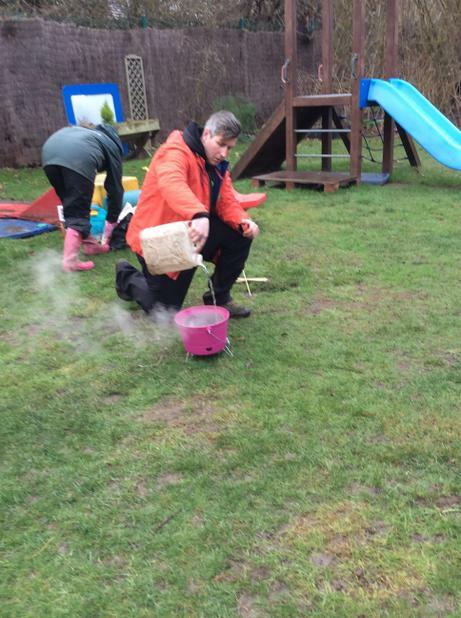 Smarties Forest schools launch day. 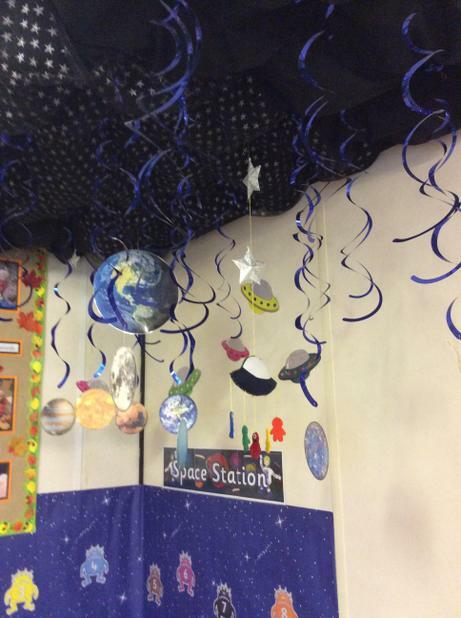 Our Space topic. 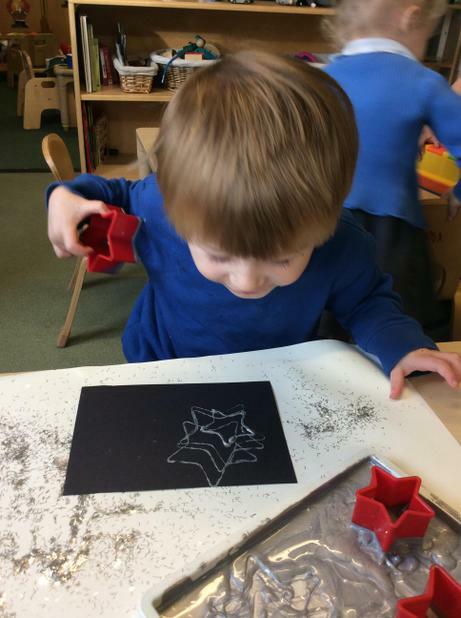 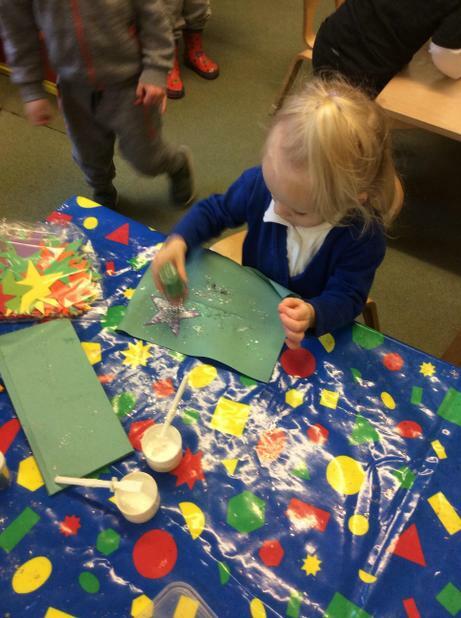 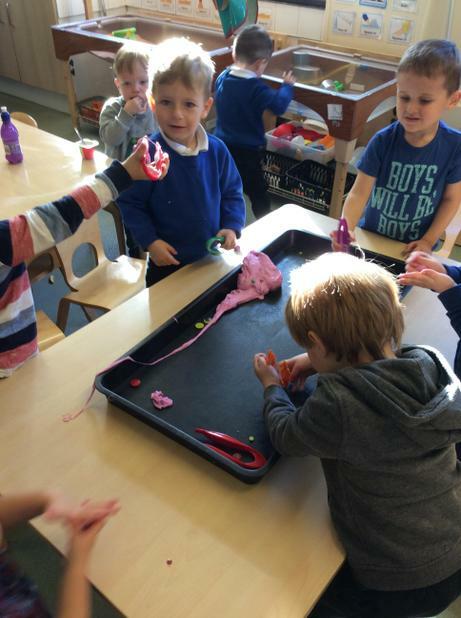 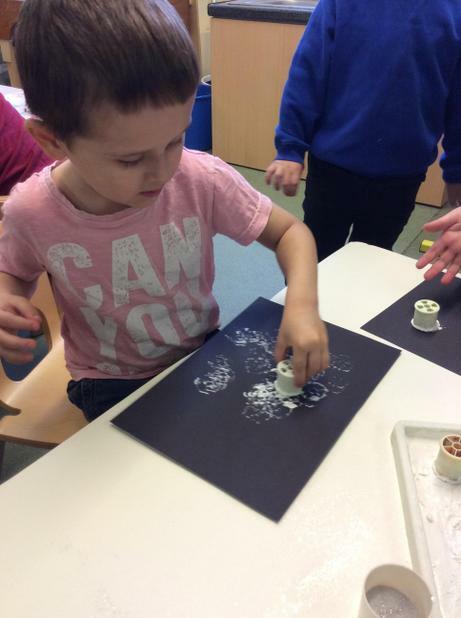 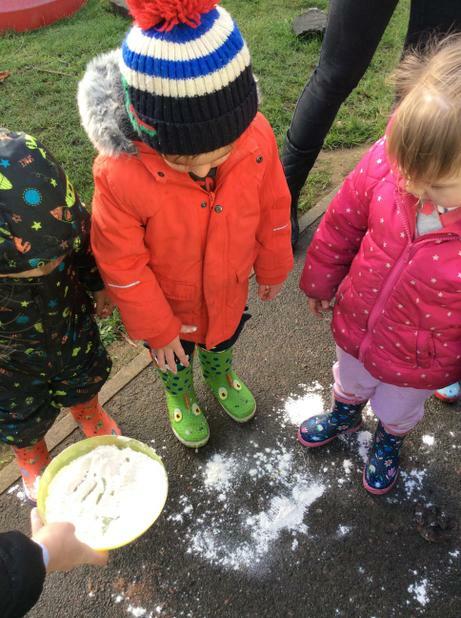 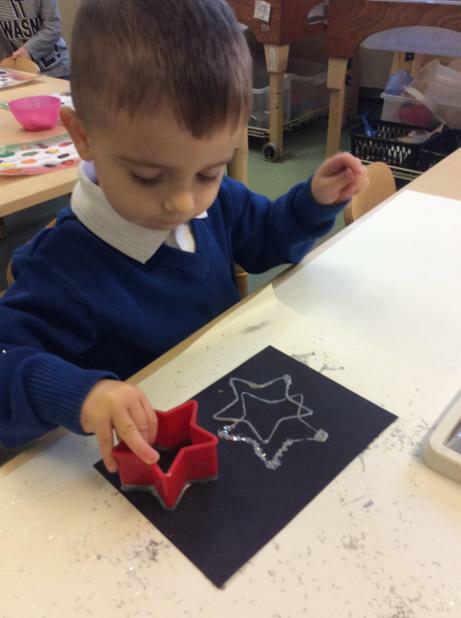 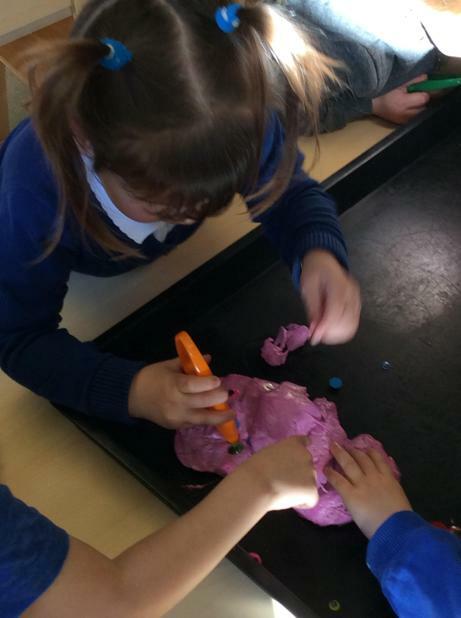 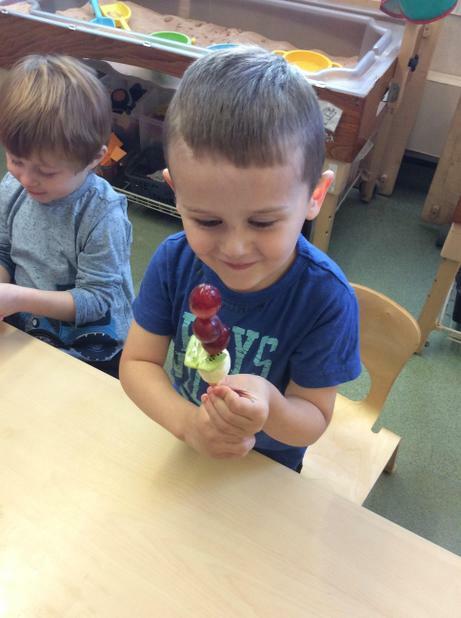 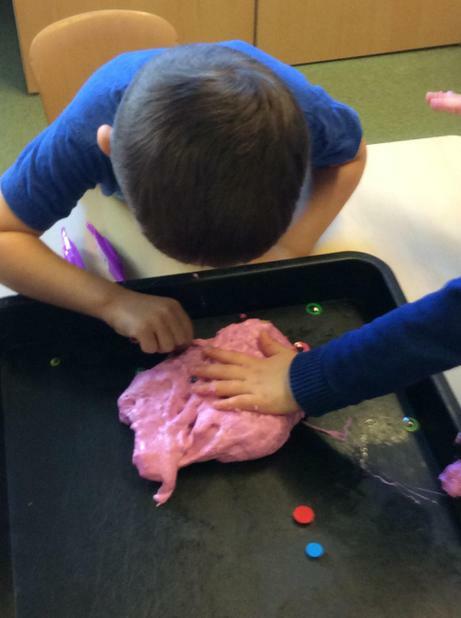 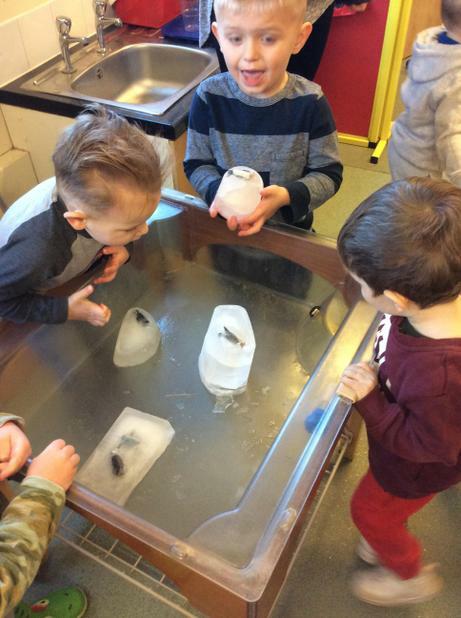 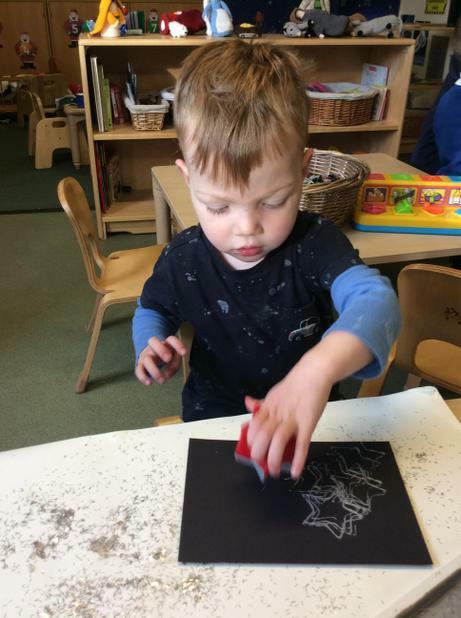 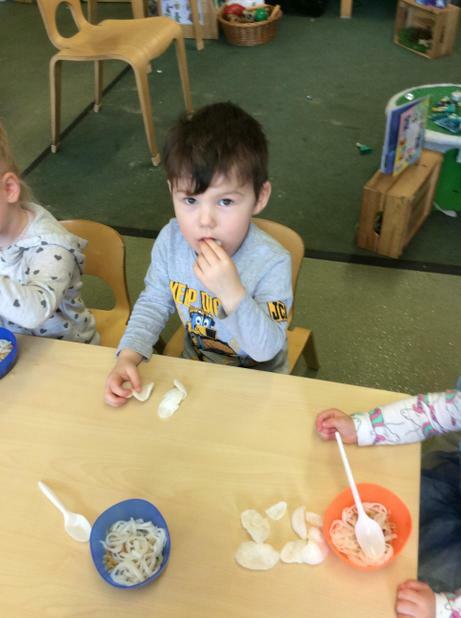 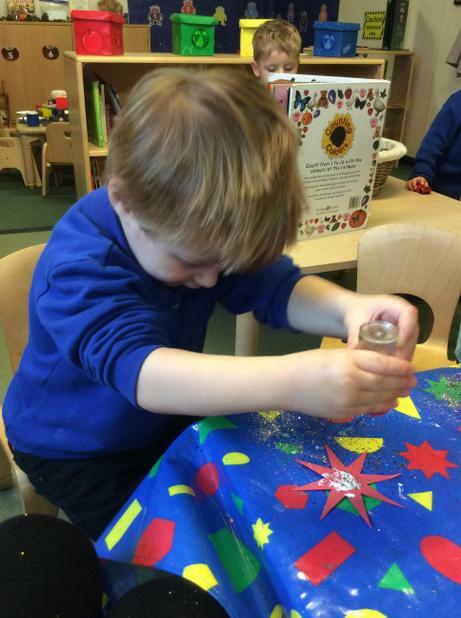 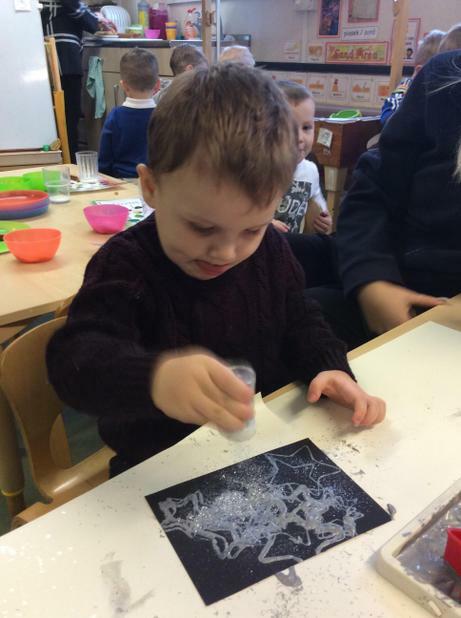 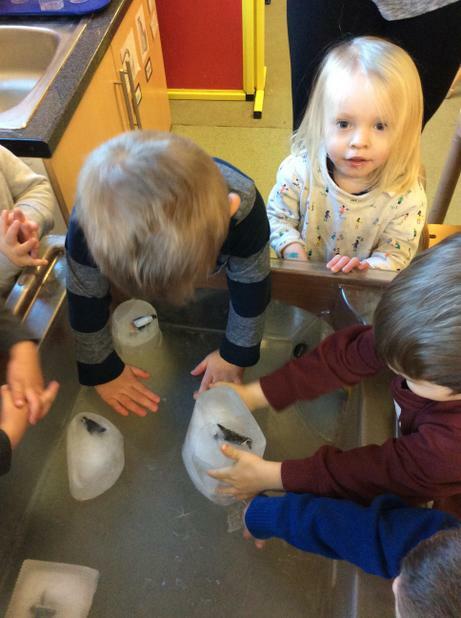 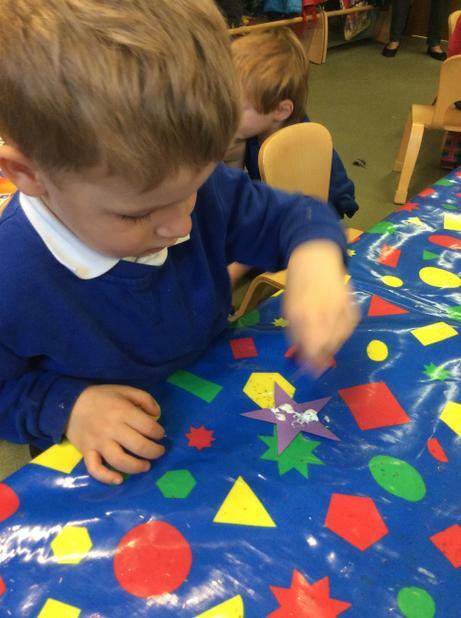 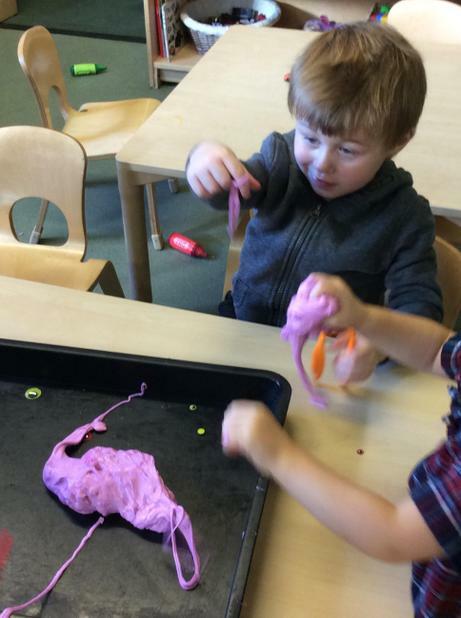 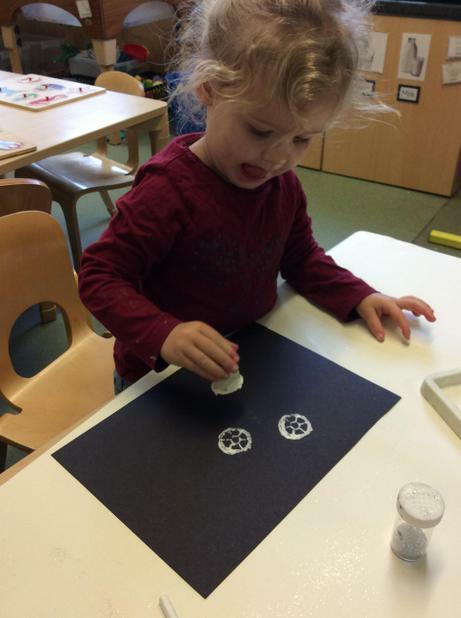 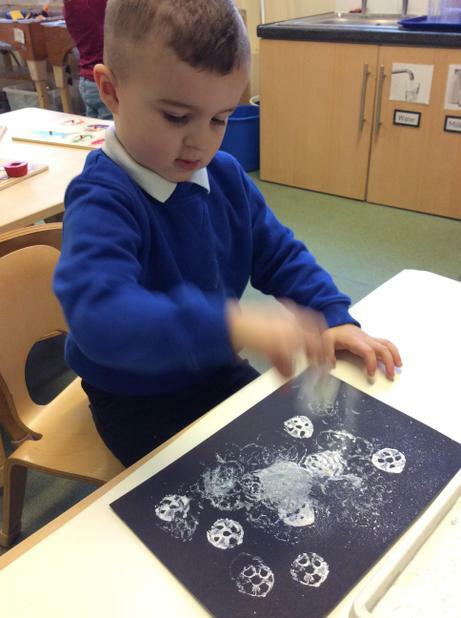 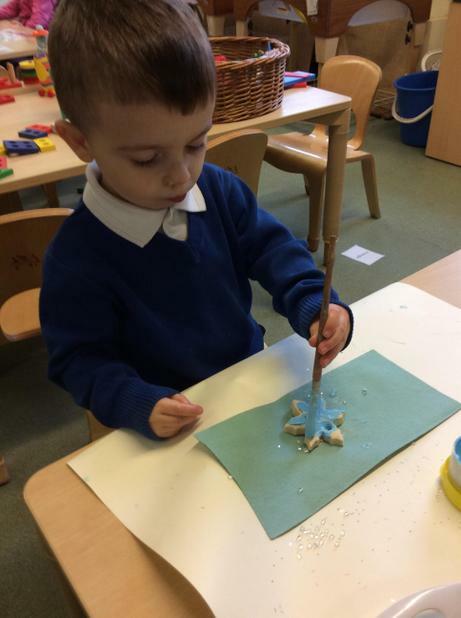 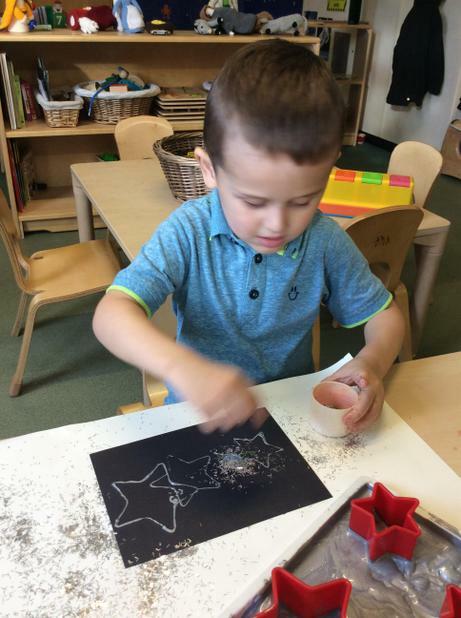 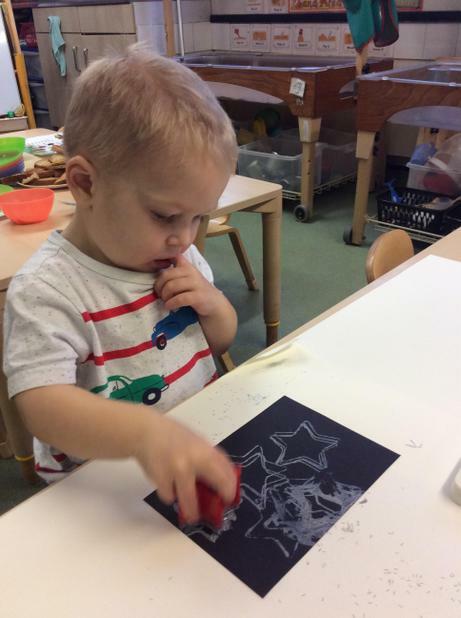 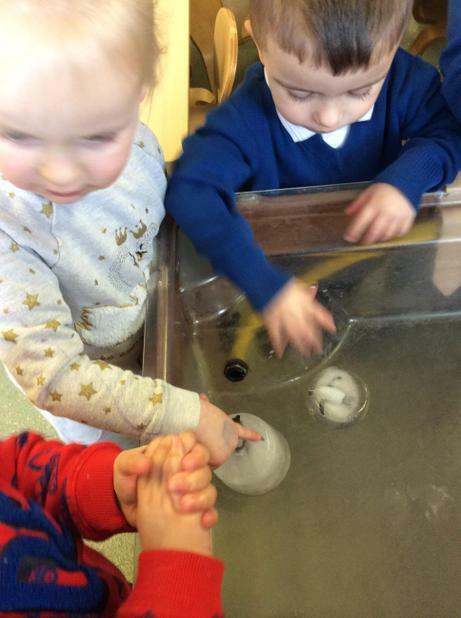 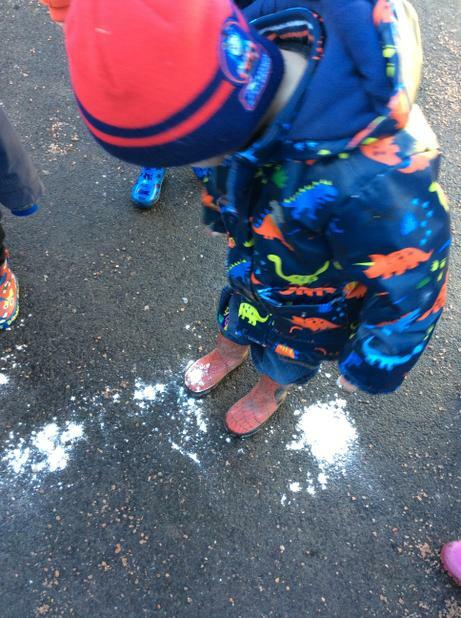 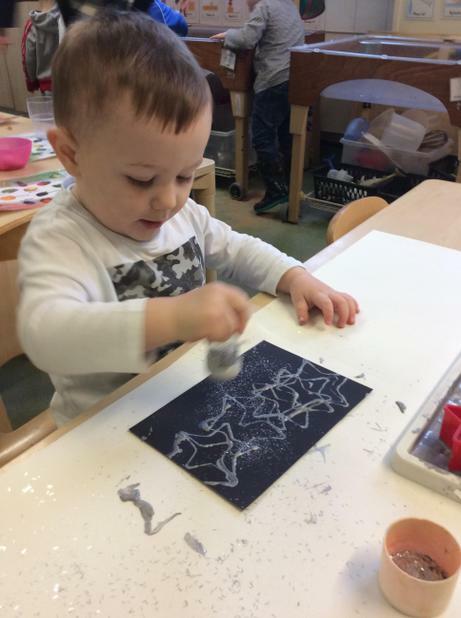 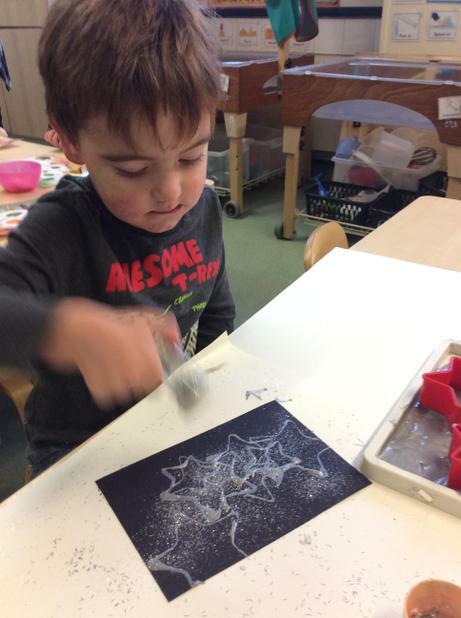 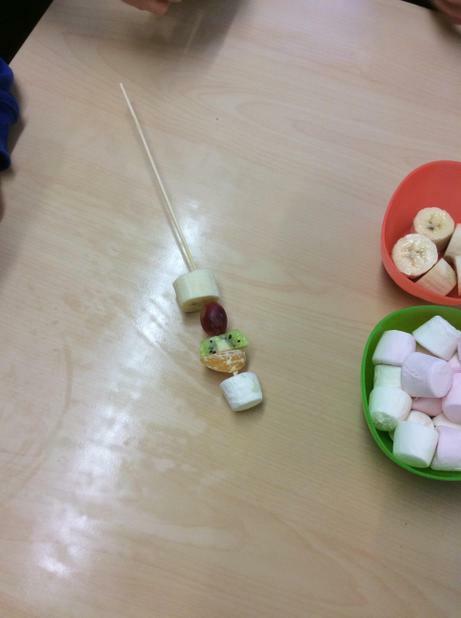 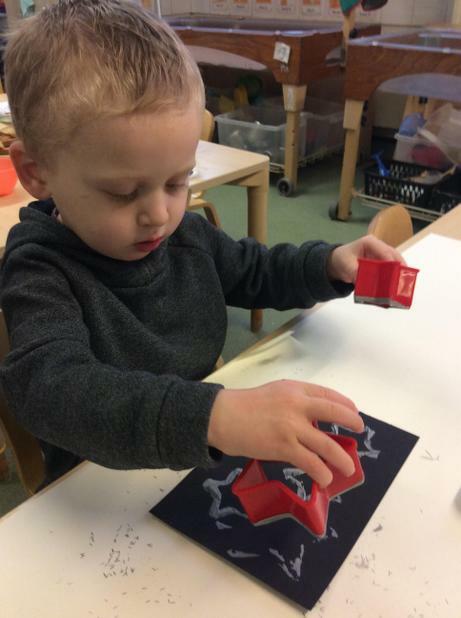 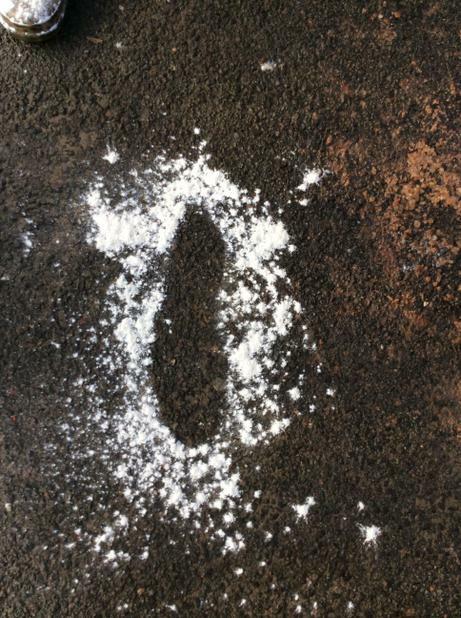 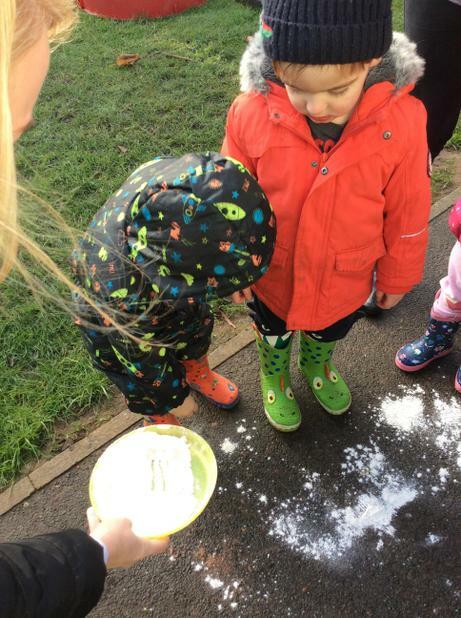 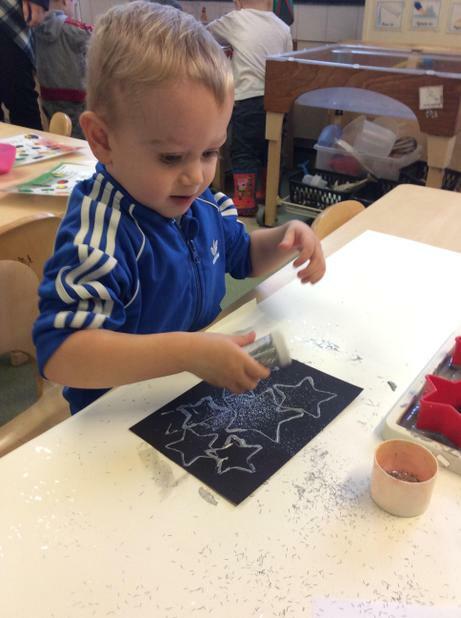 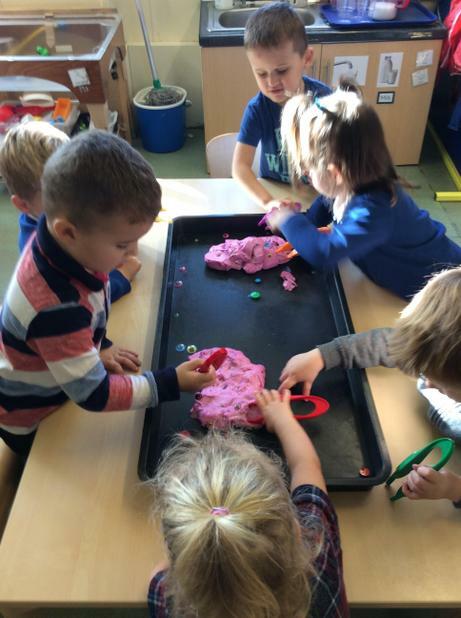 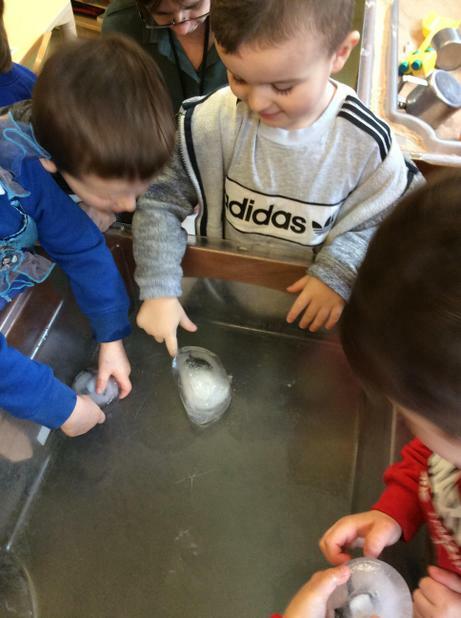 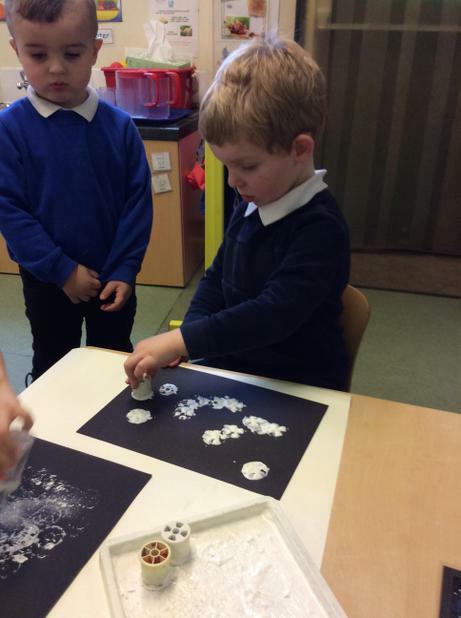 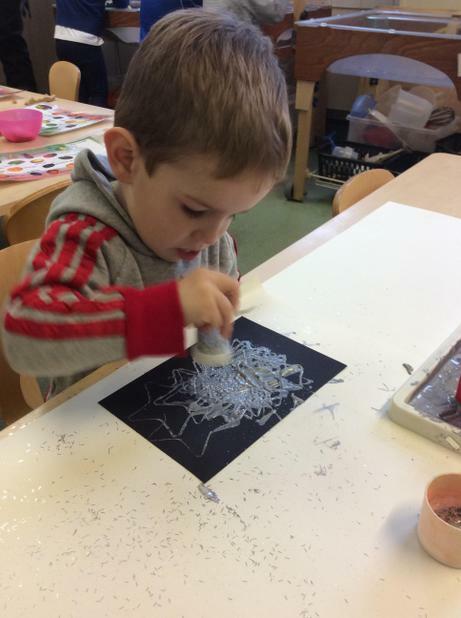 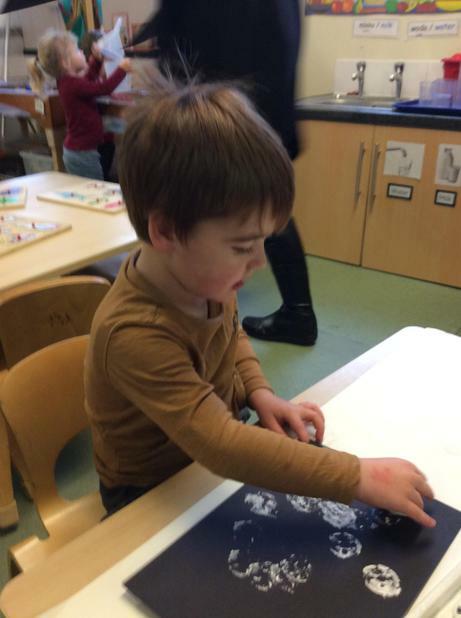 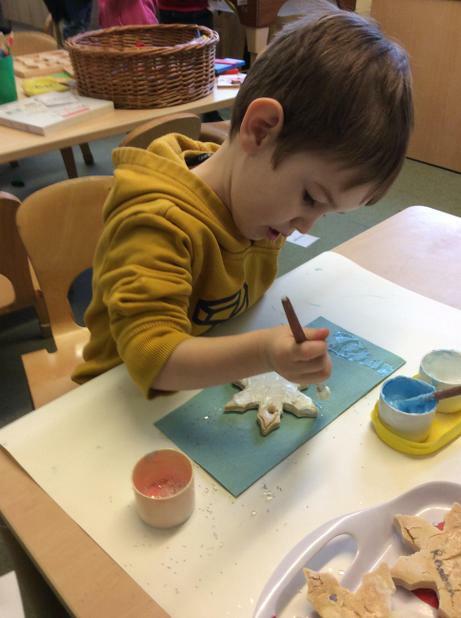 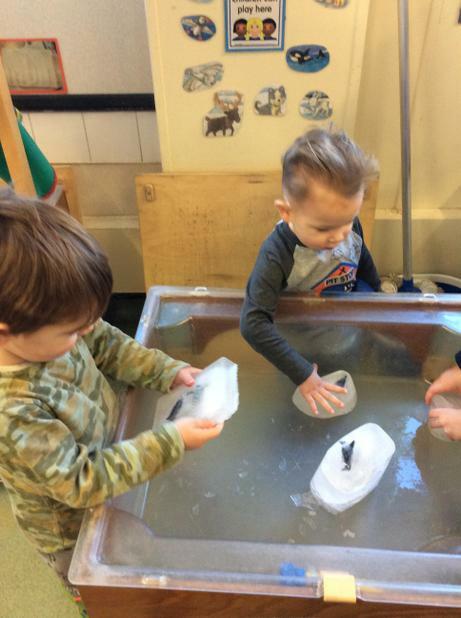 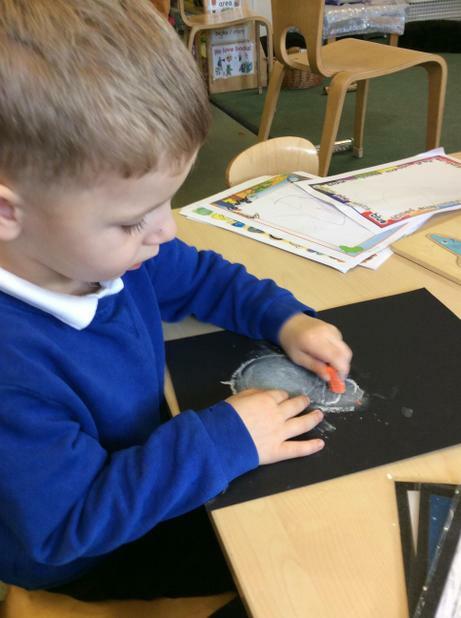 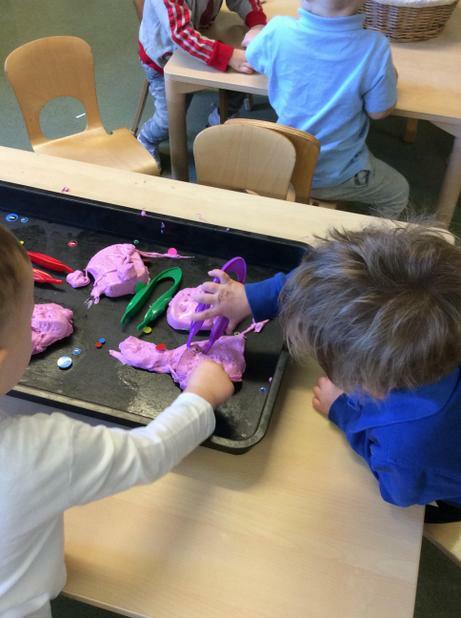 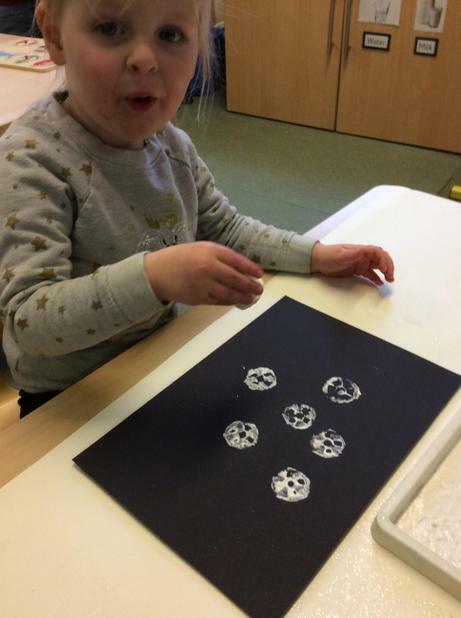 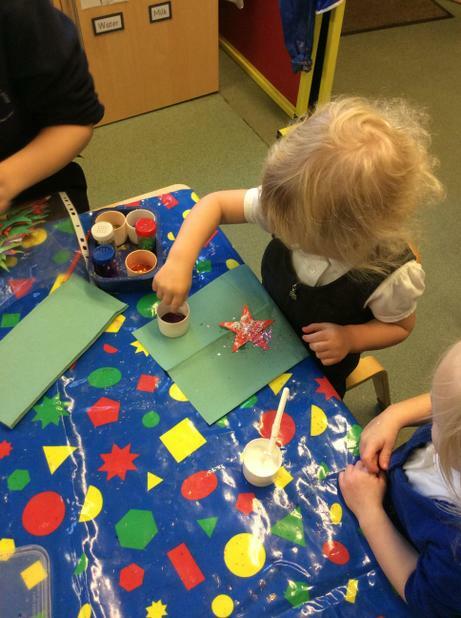 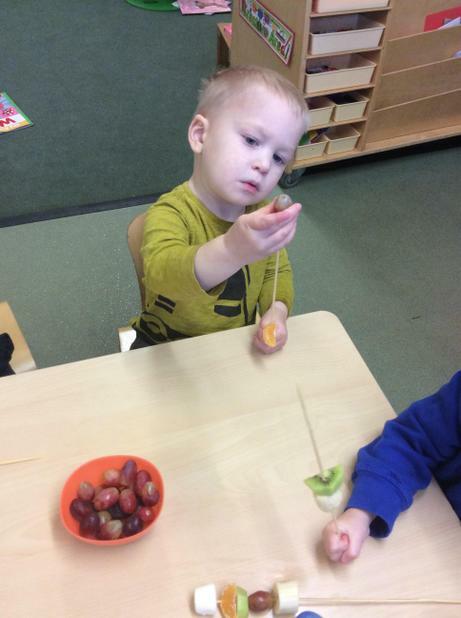 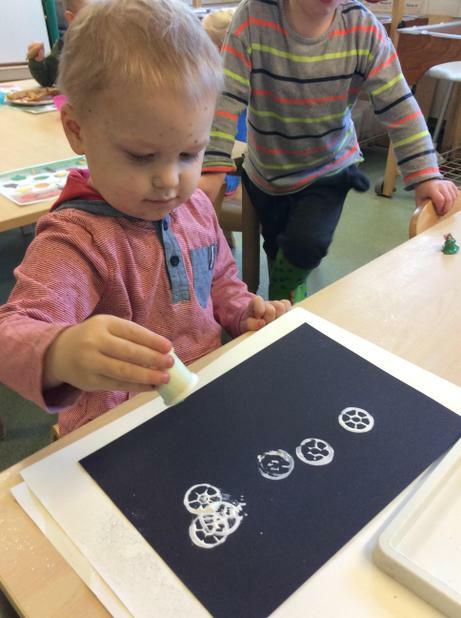 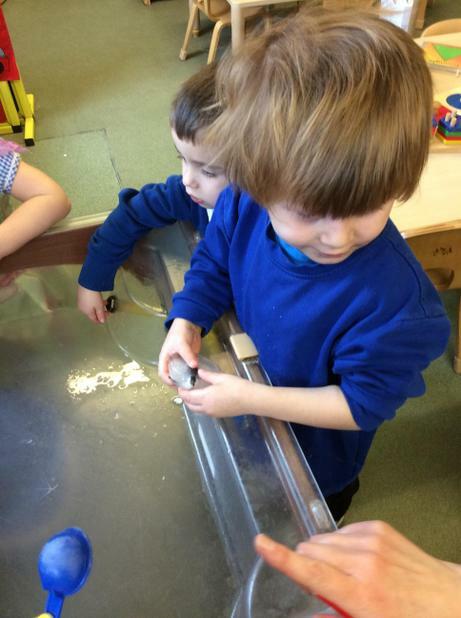 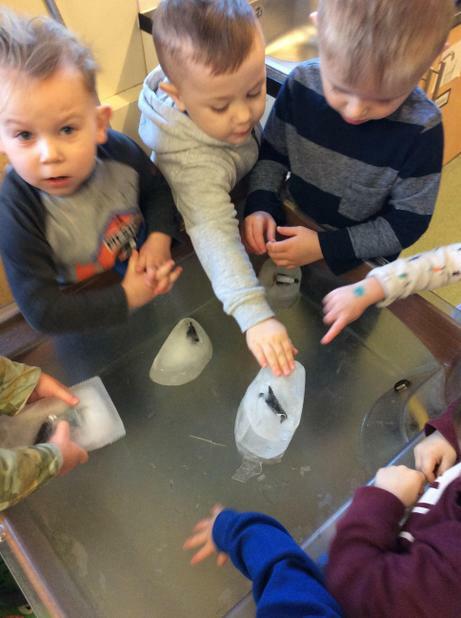 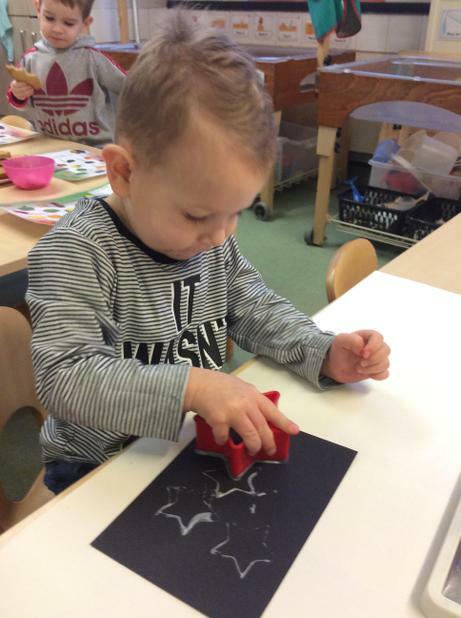 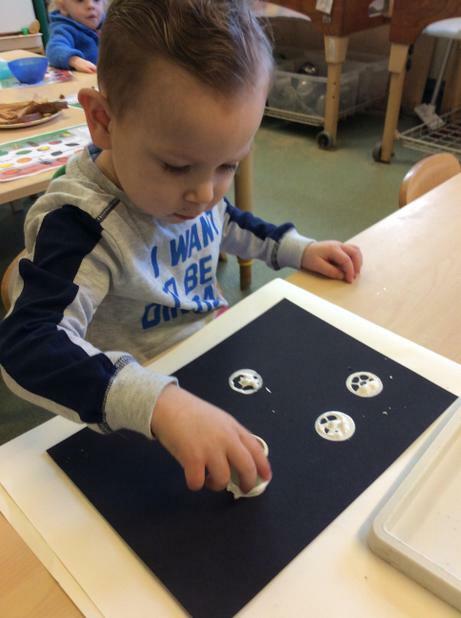 We explored alien gloop and moon sand, created our own galaxy of stars and made fruit space rockets. 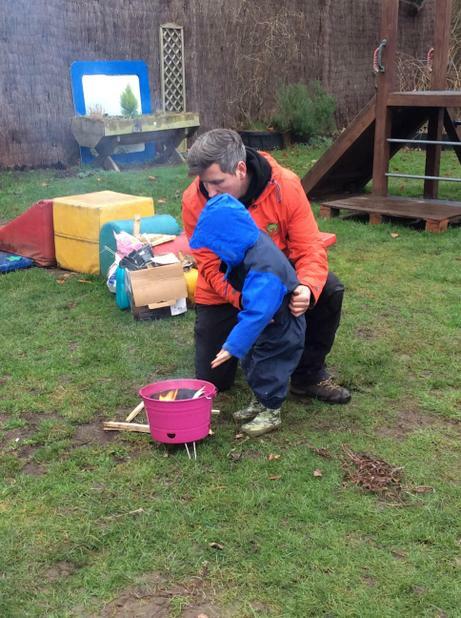 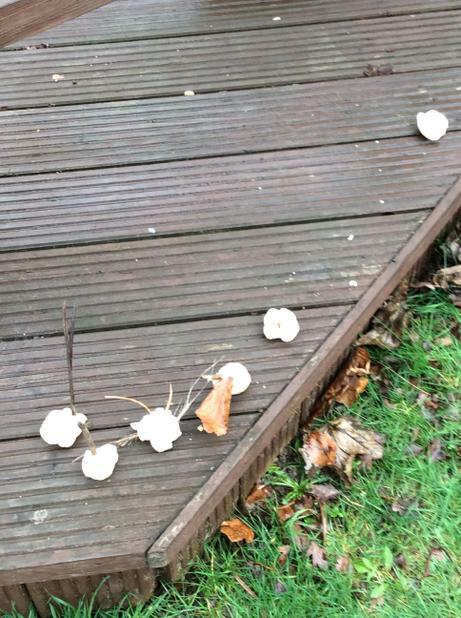 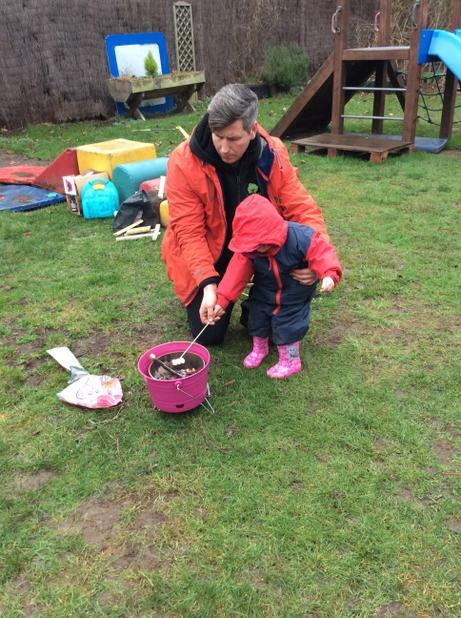 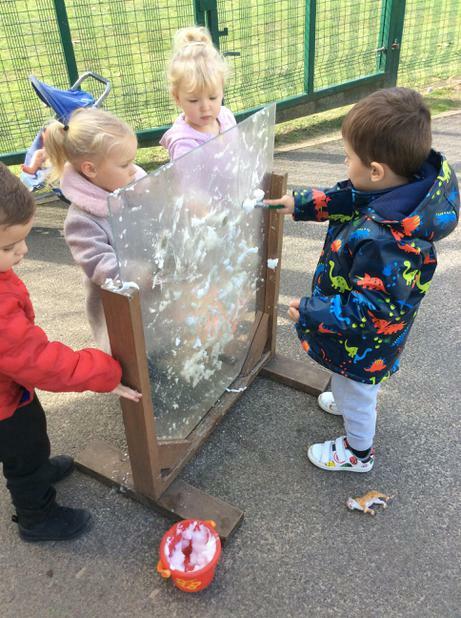 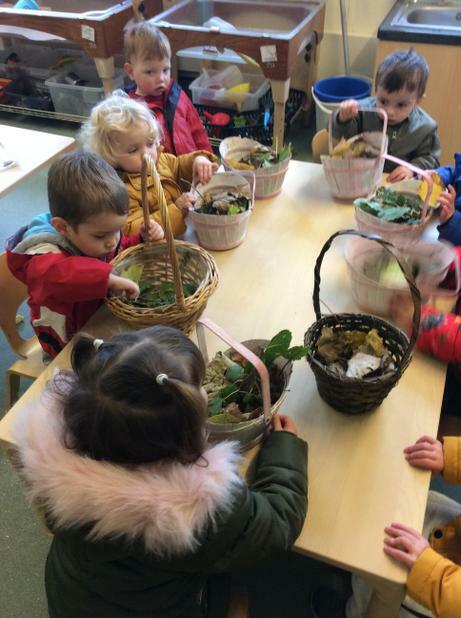 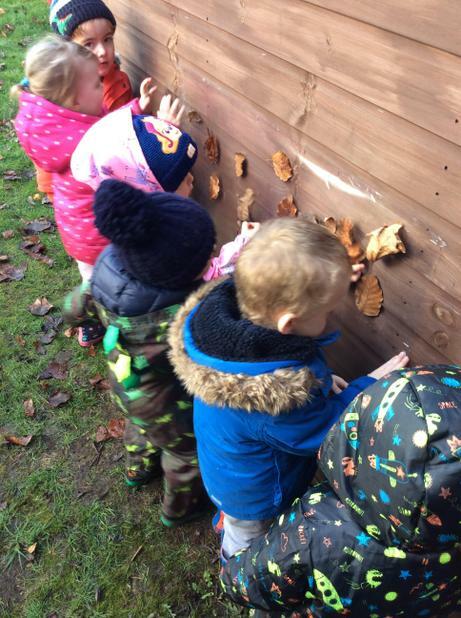 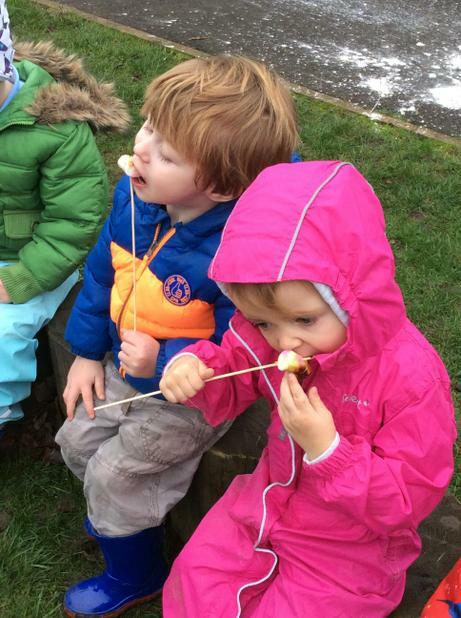 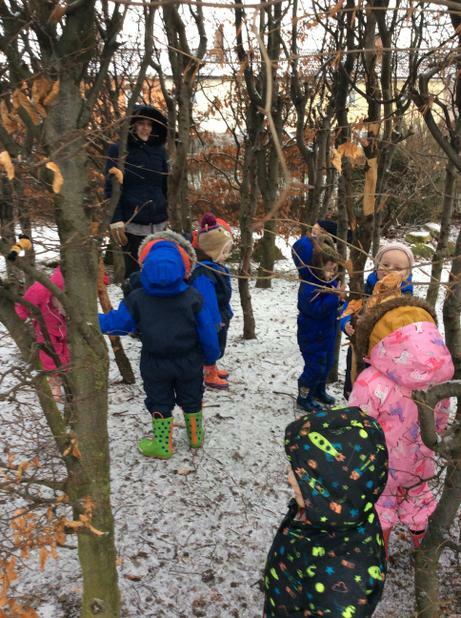 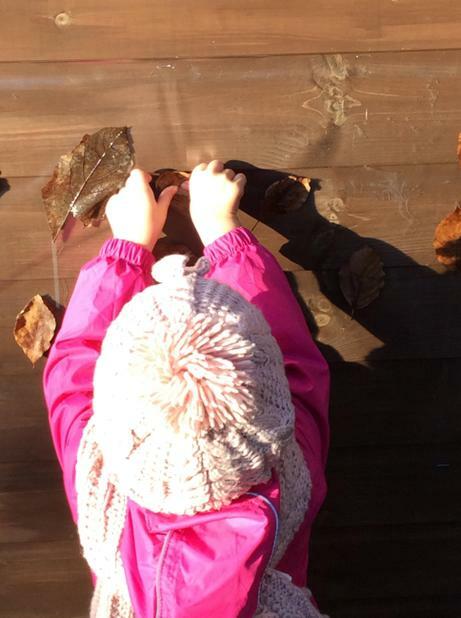 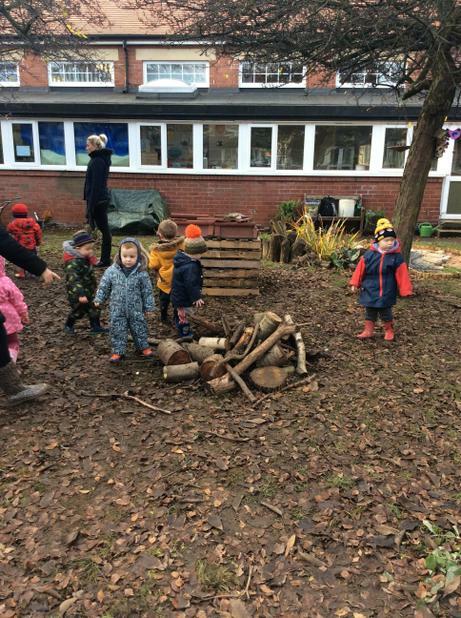 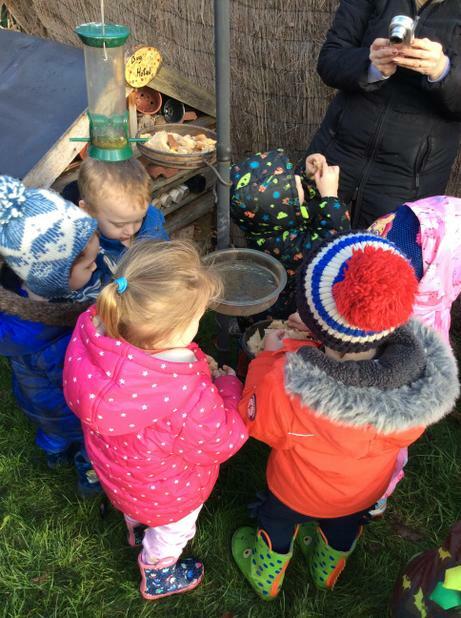 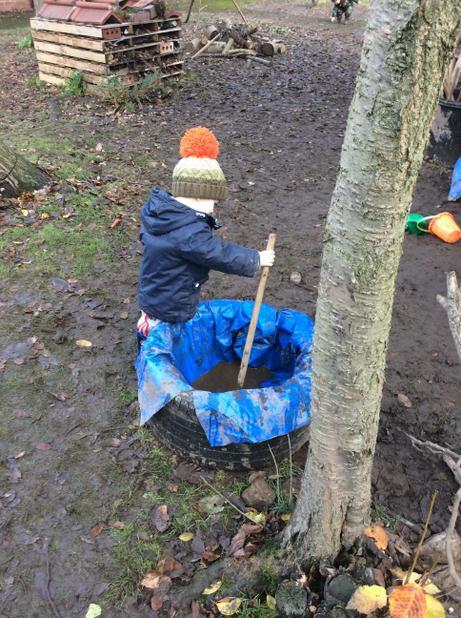 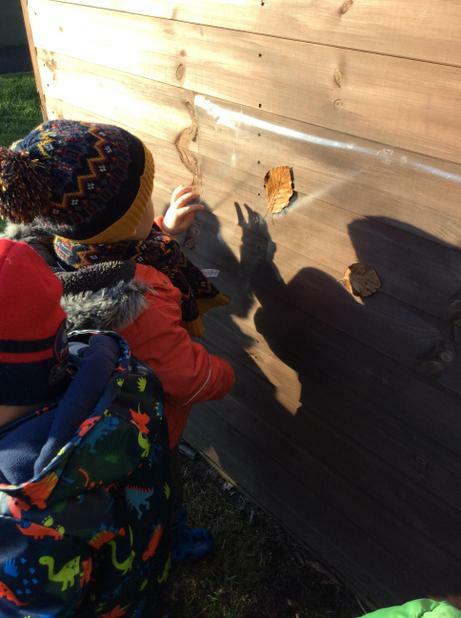 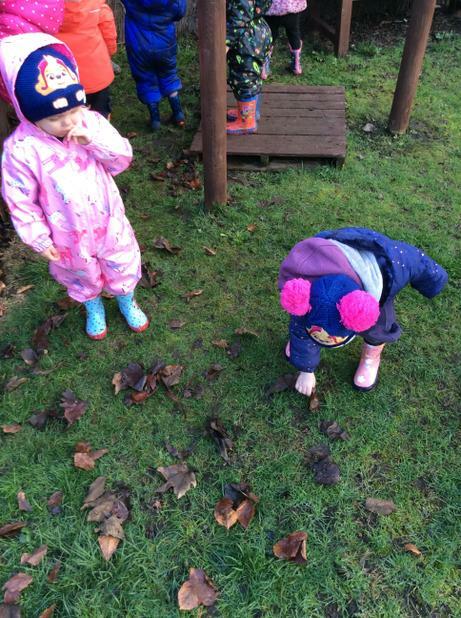 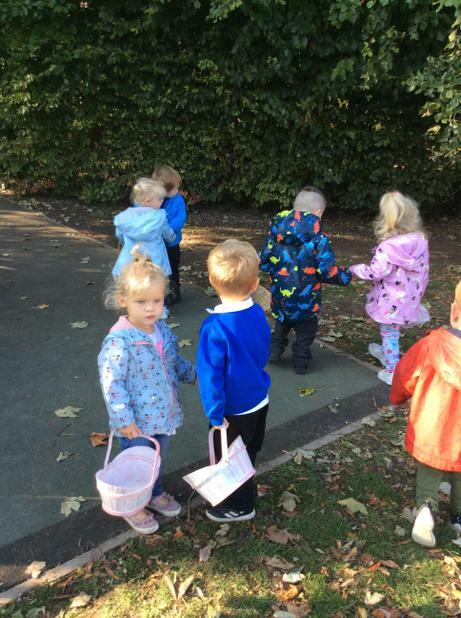 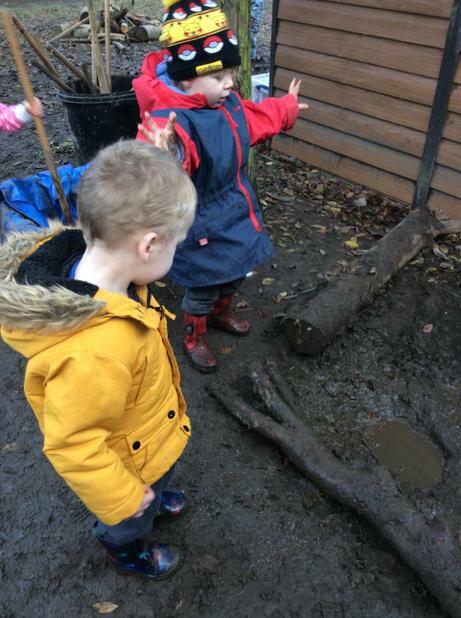 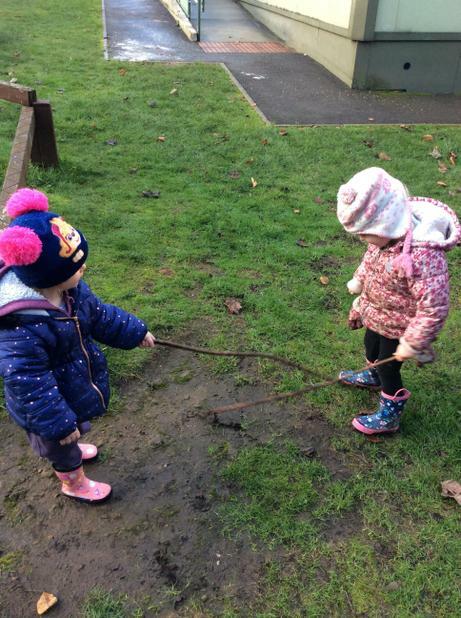 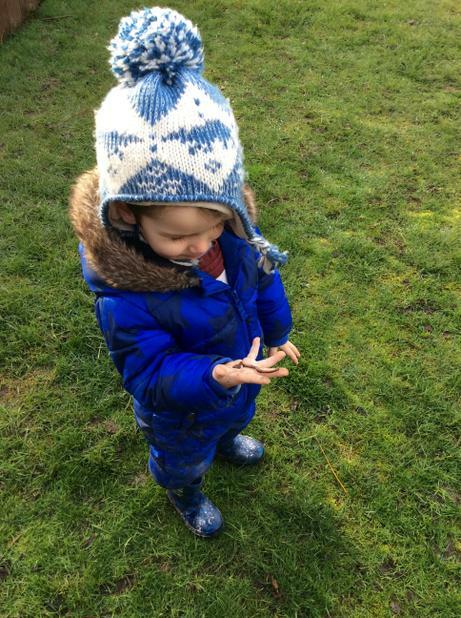 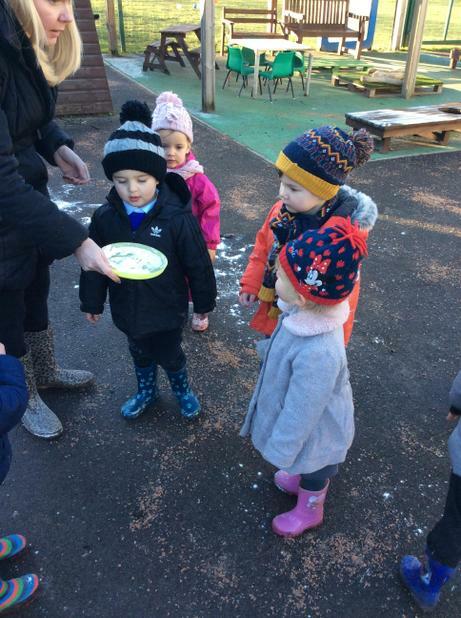 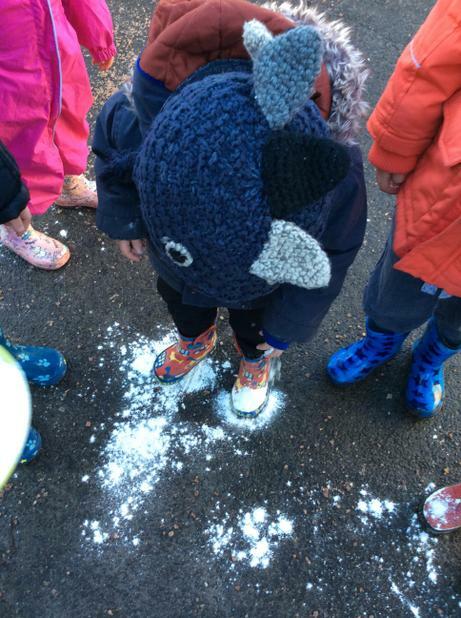 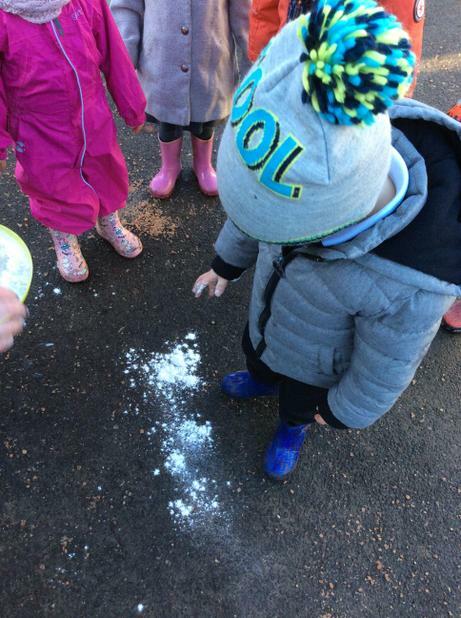 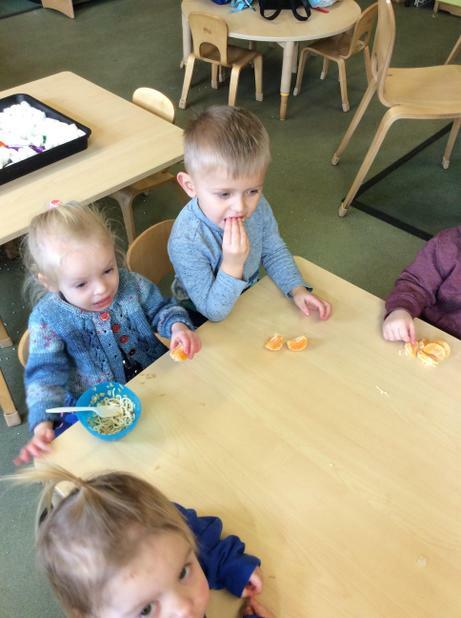 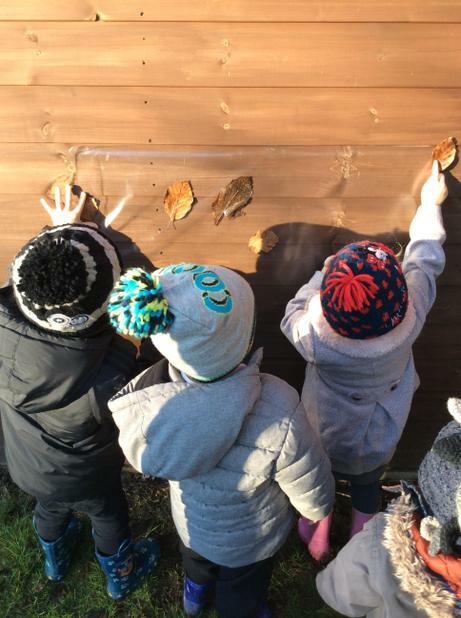 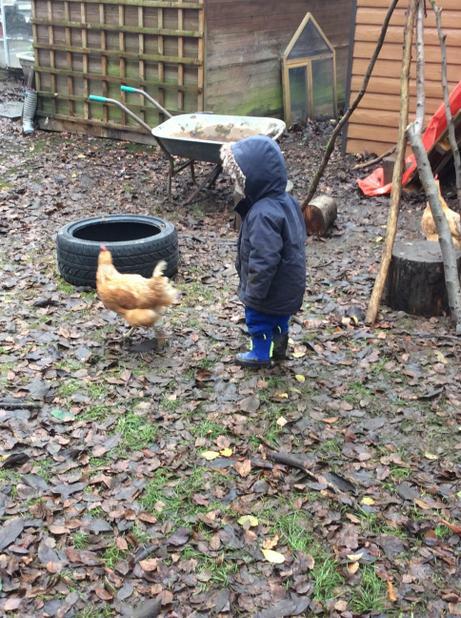 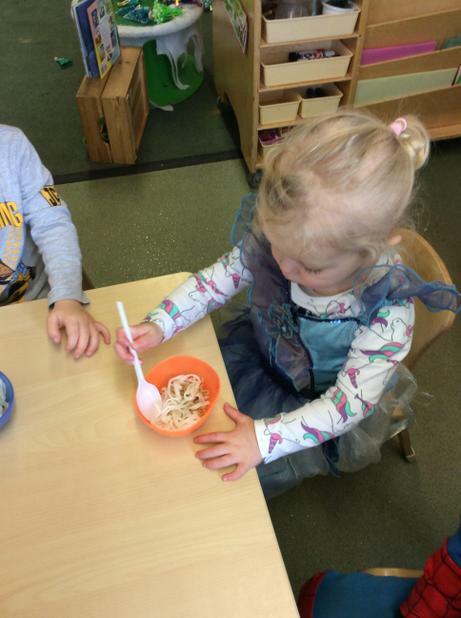 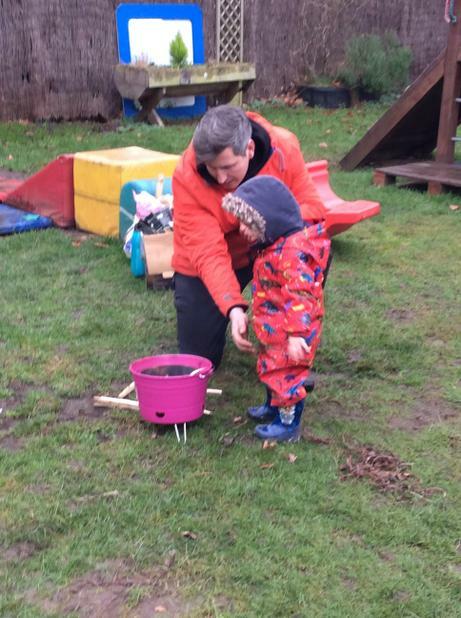 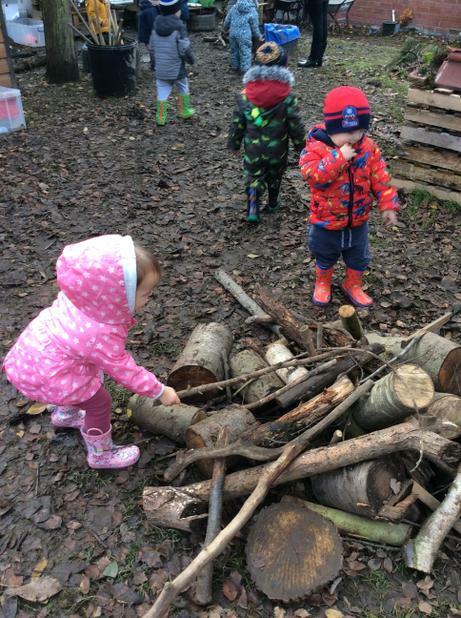 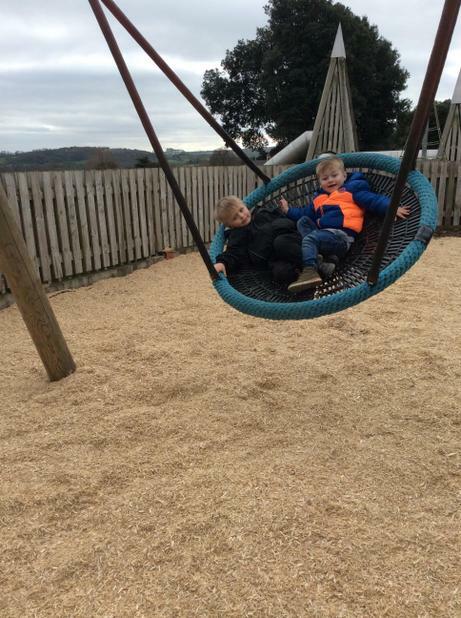 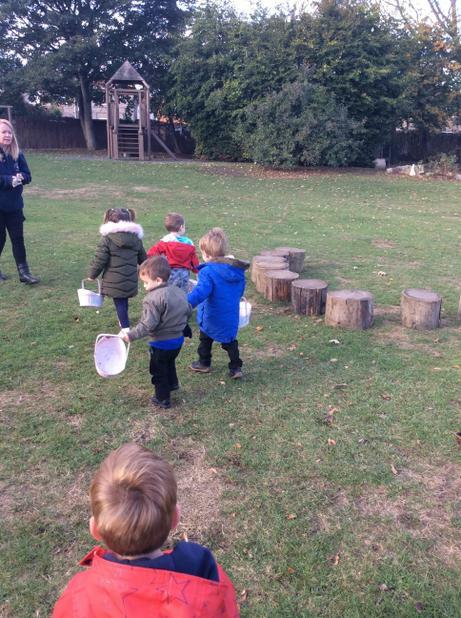 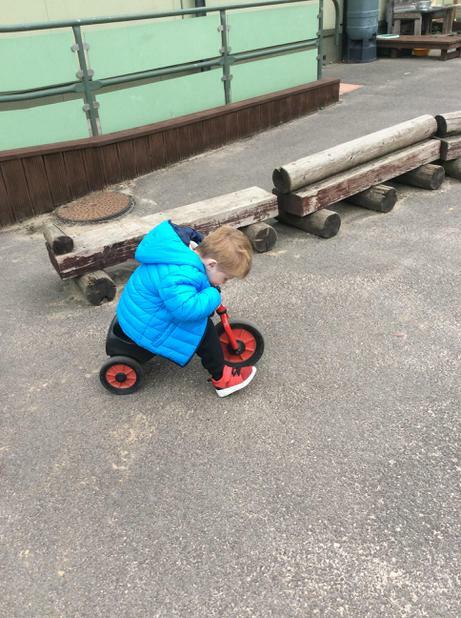 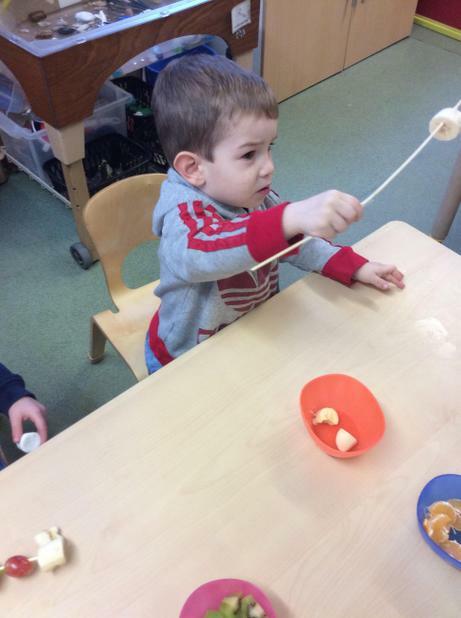 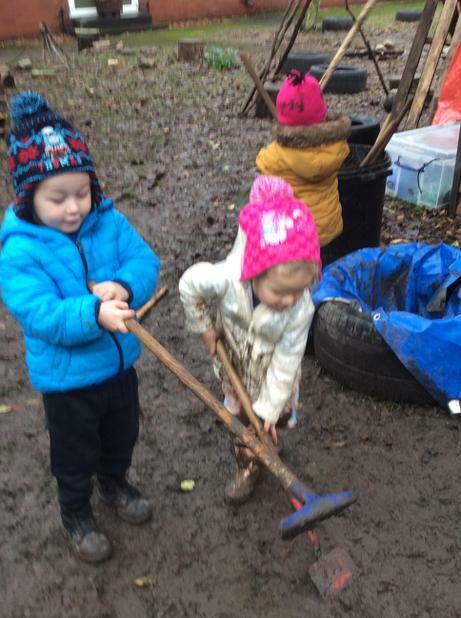 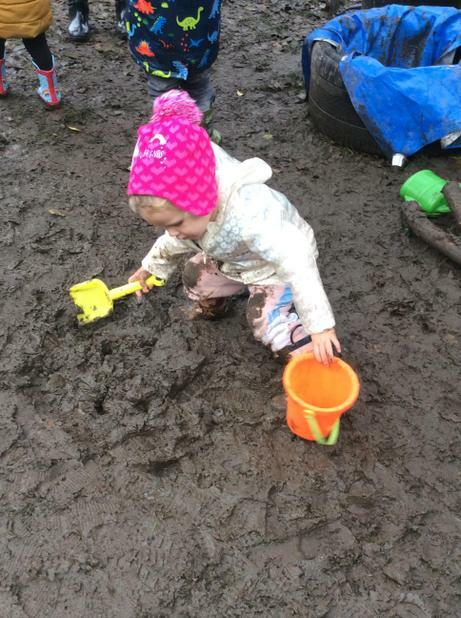 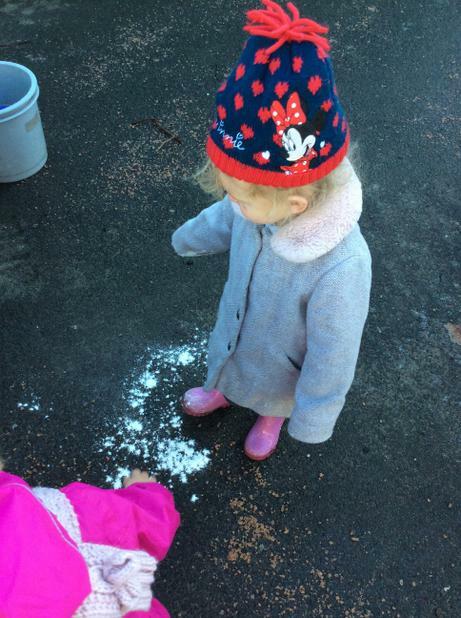 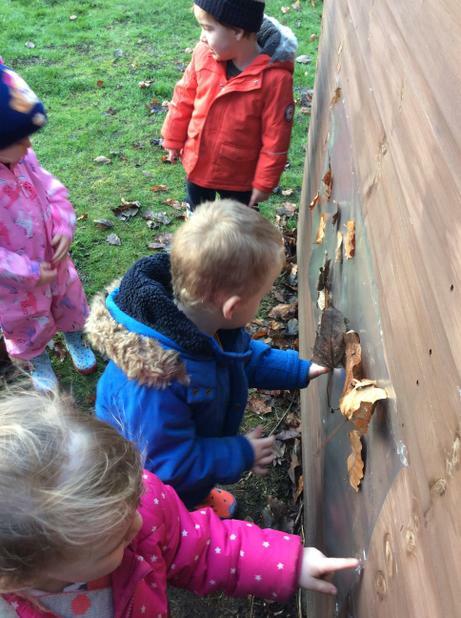 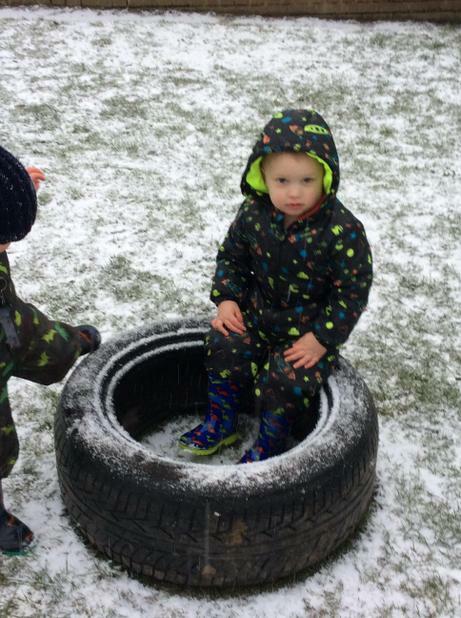 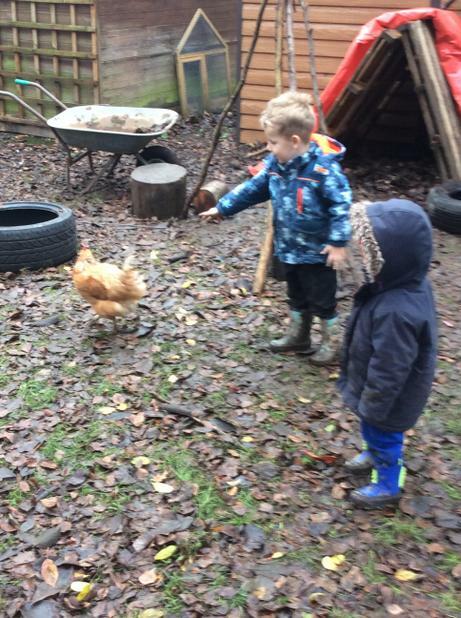 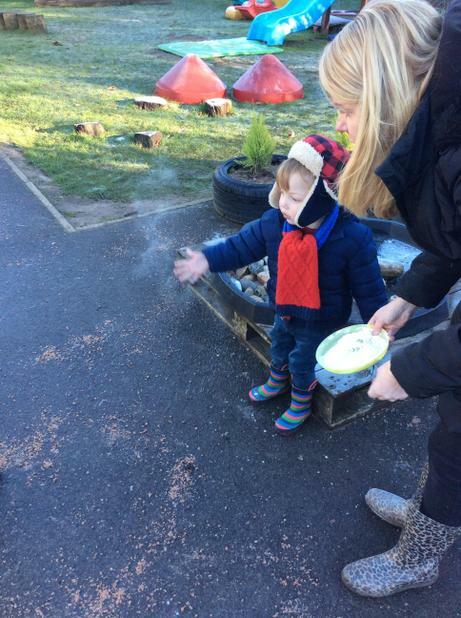 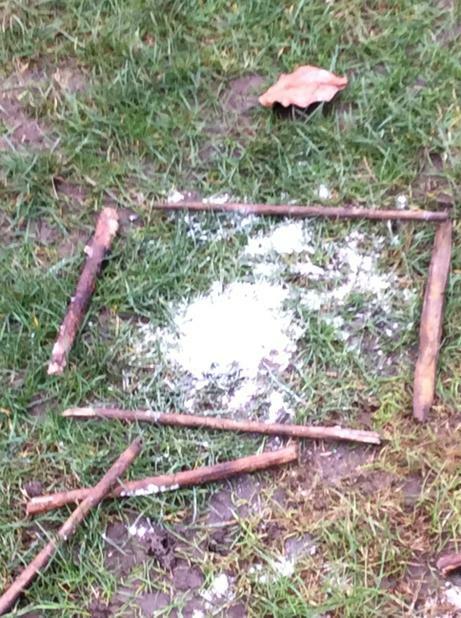 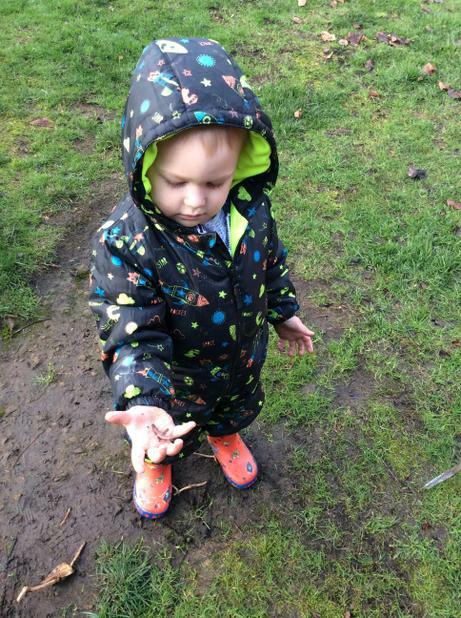 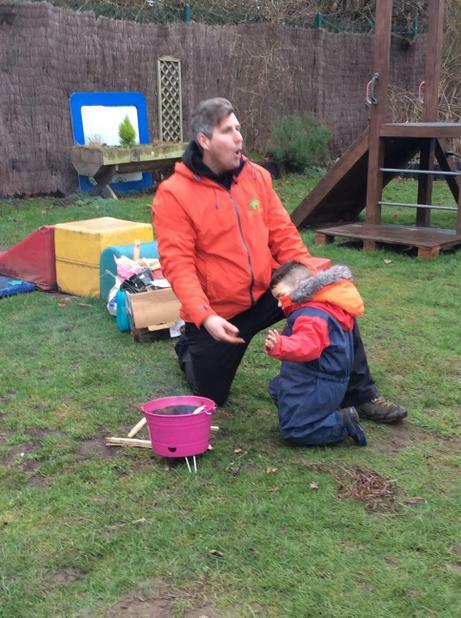 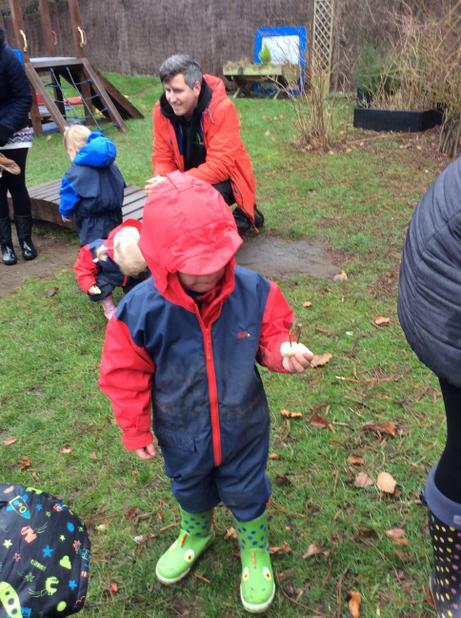 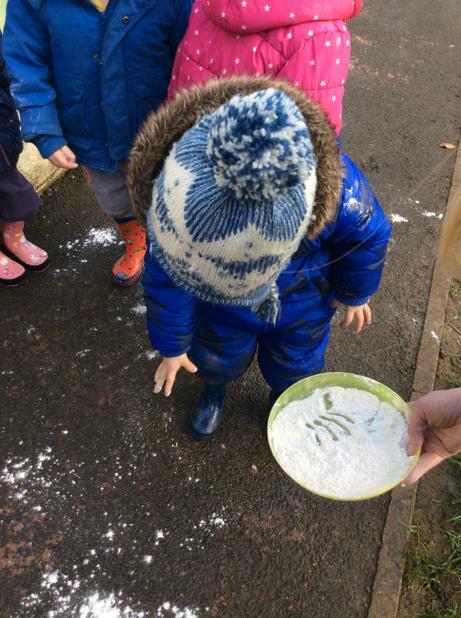 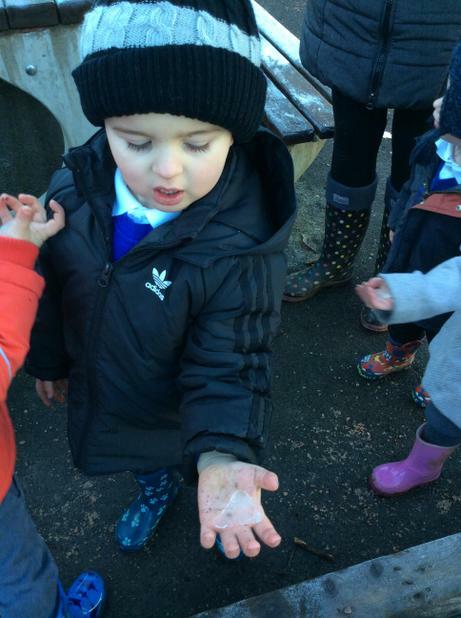 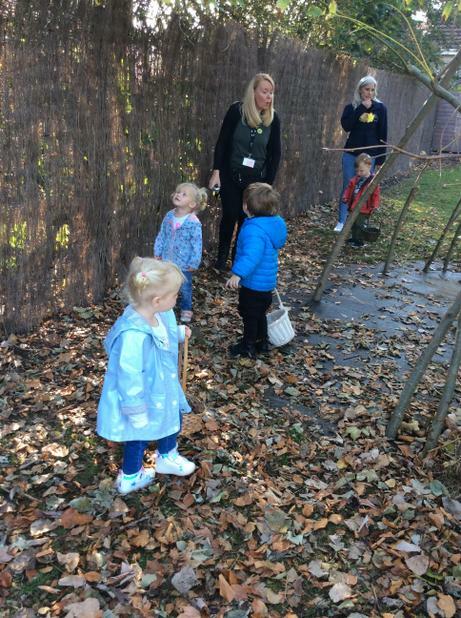 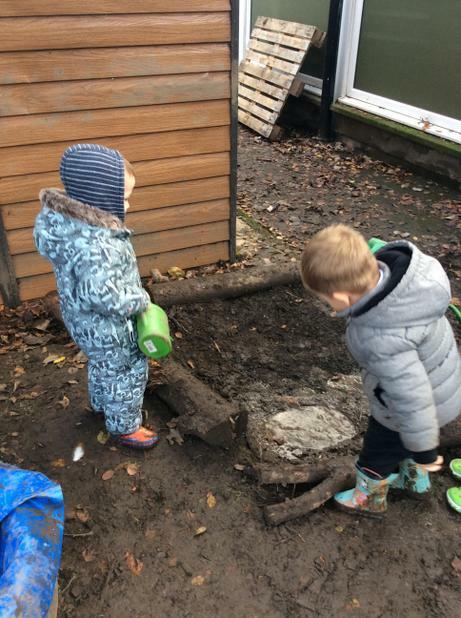 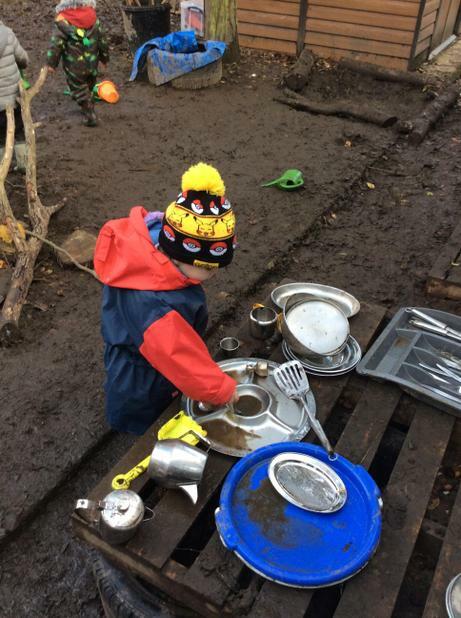 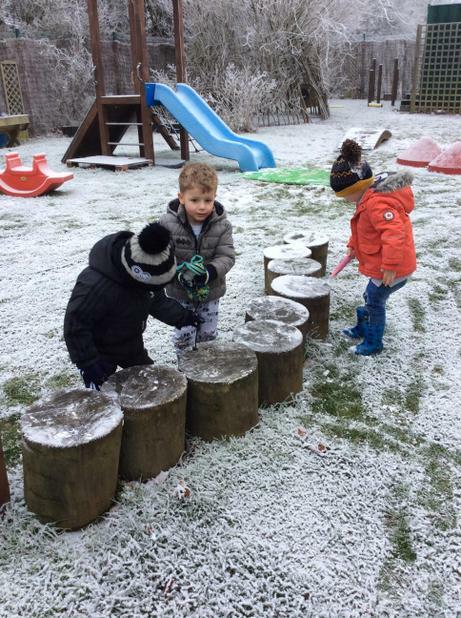 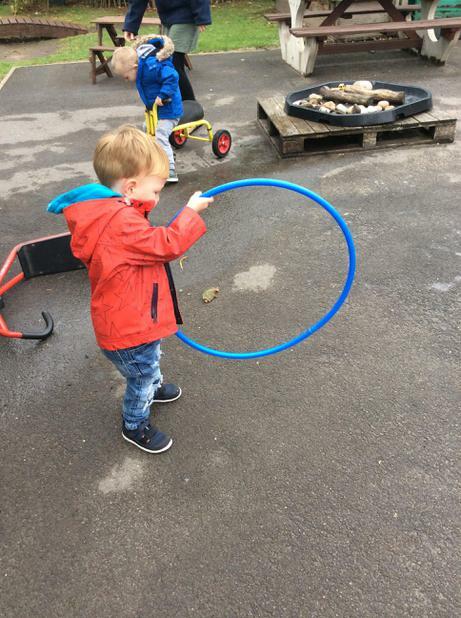 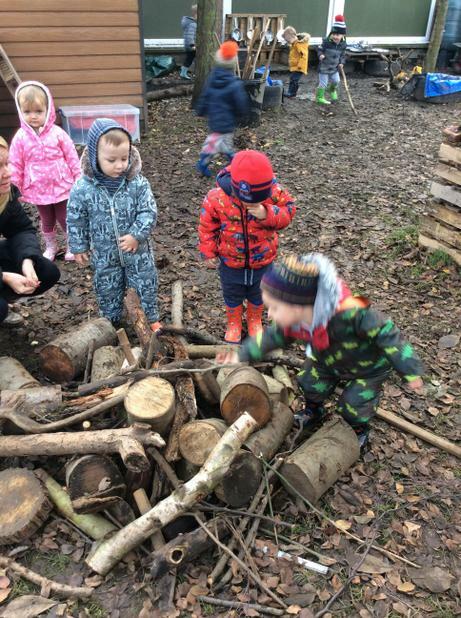 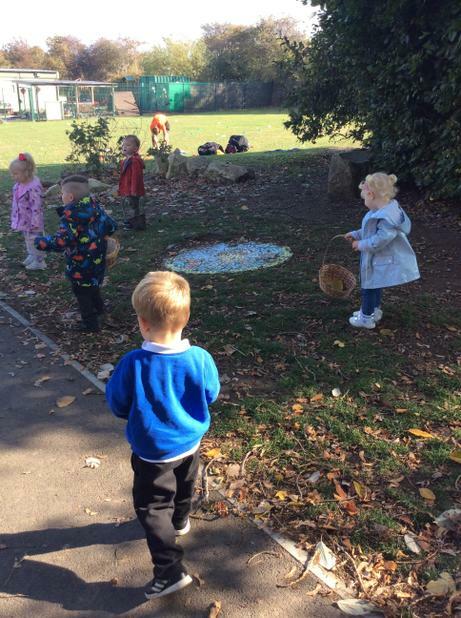 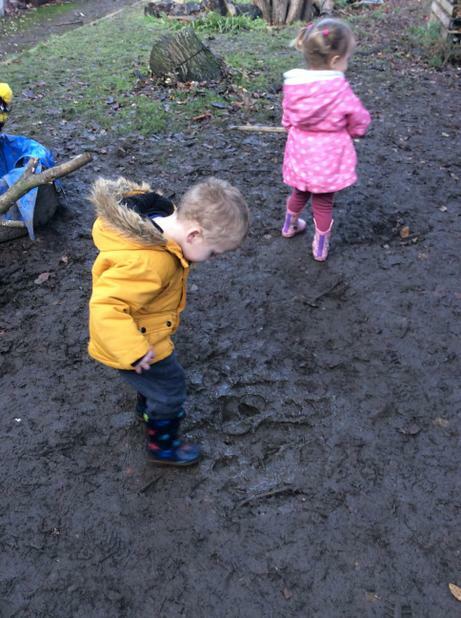 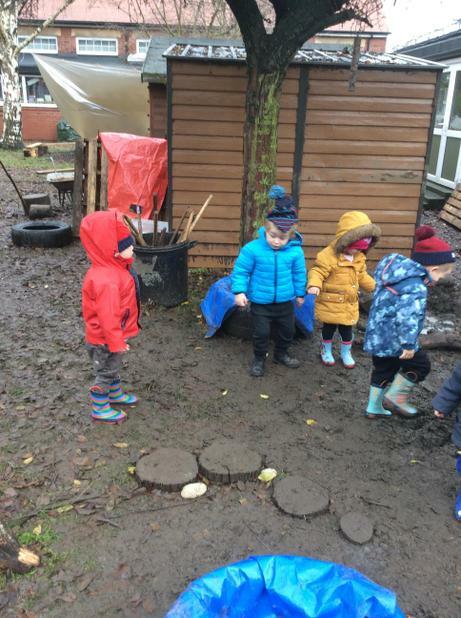 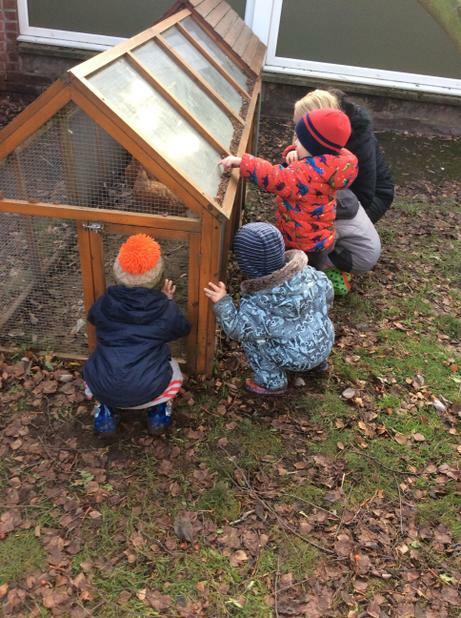 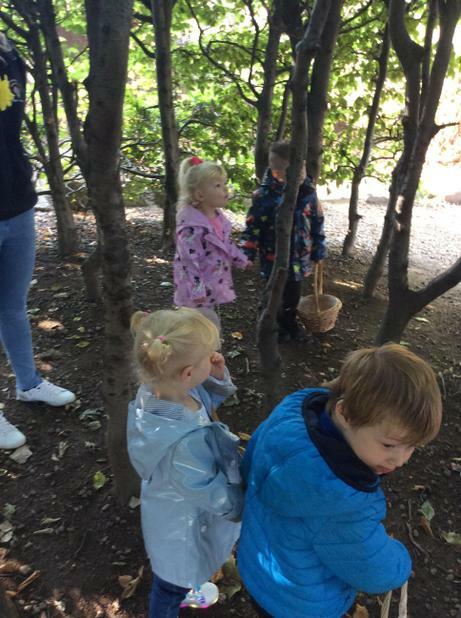 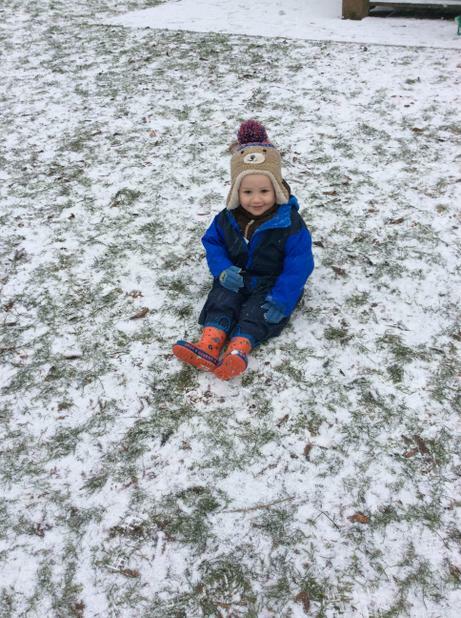 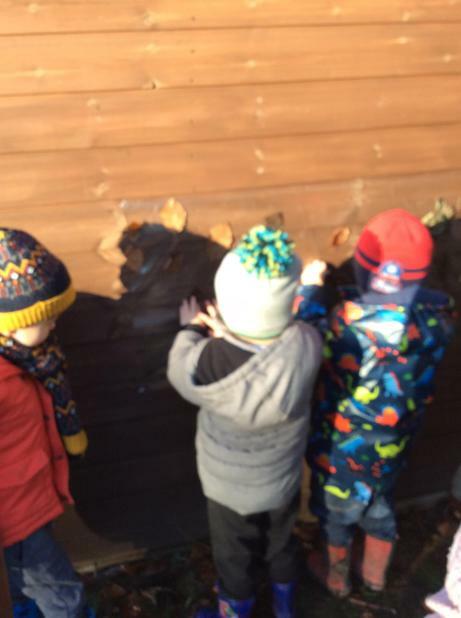 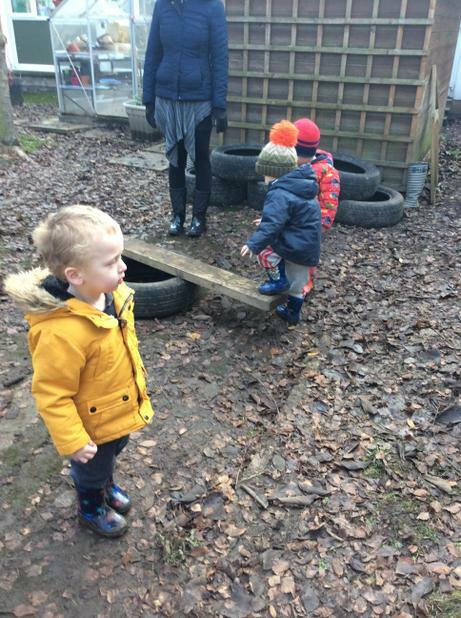 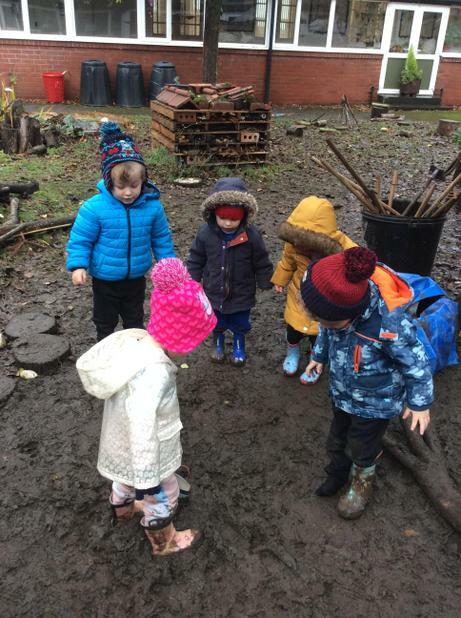 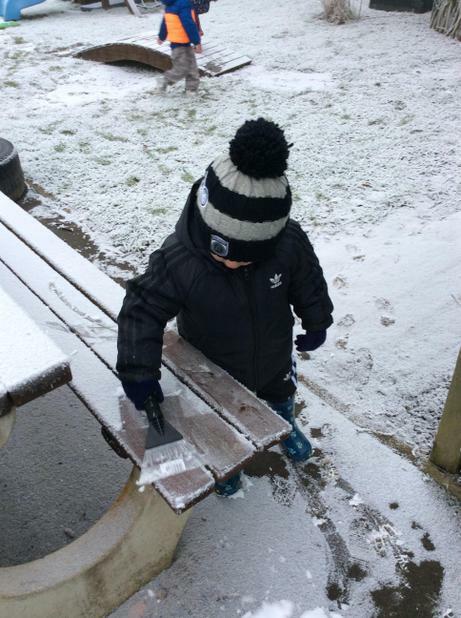 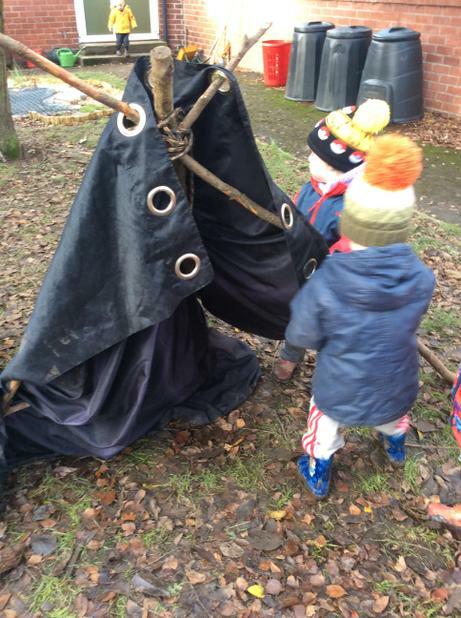 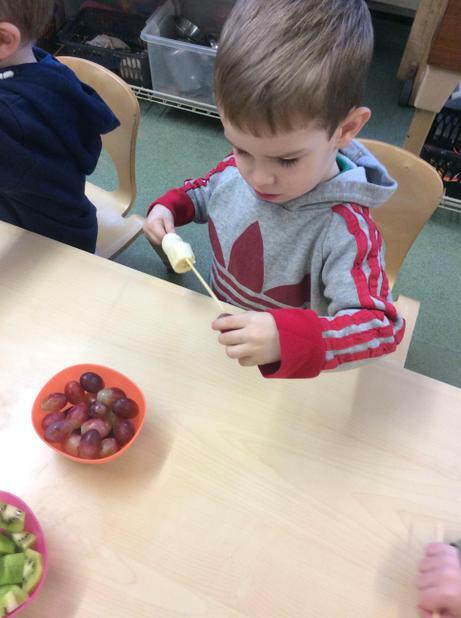 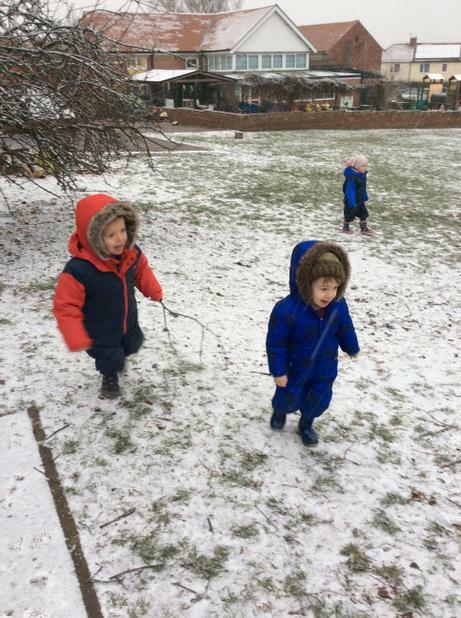 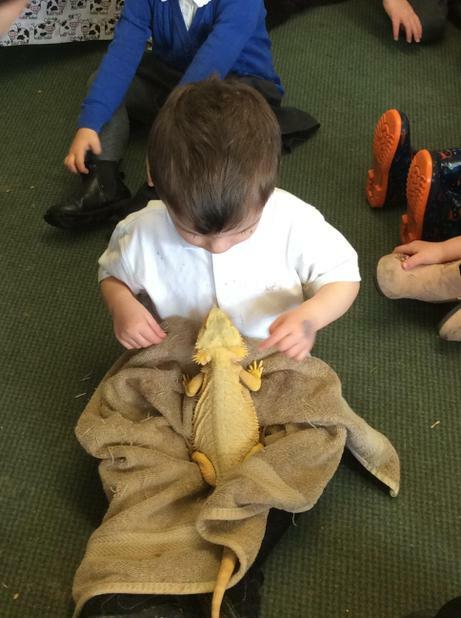 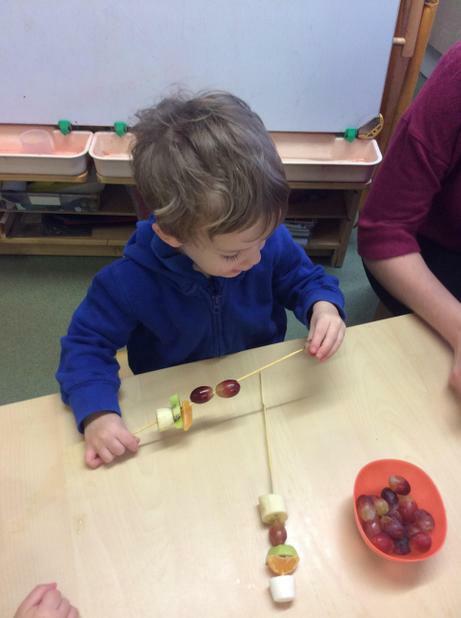 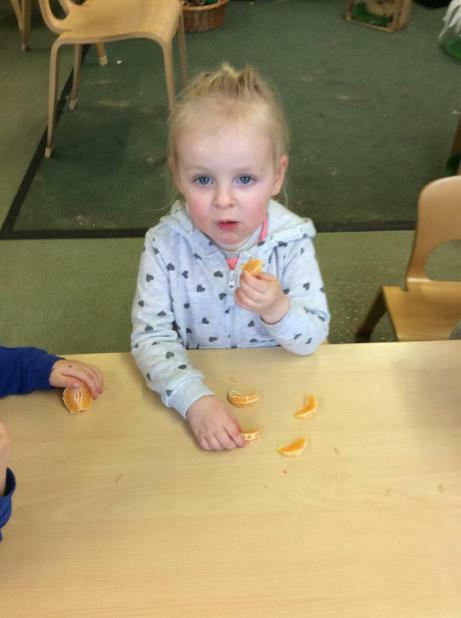 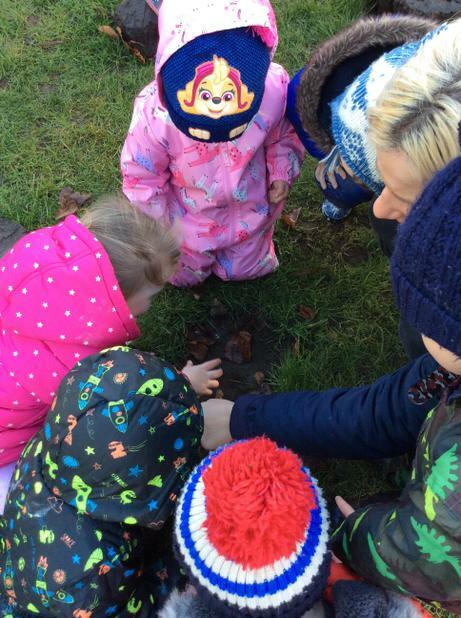 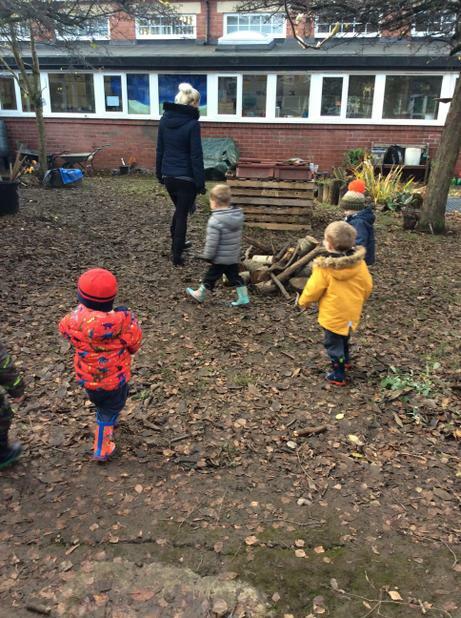 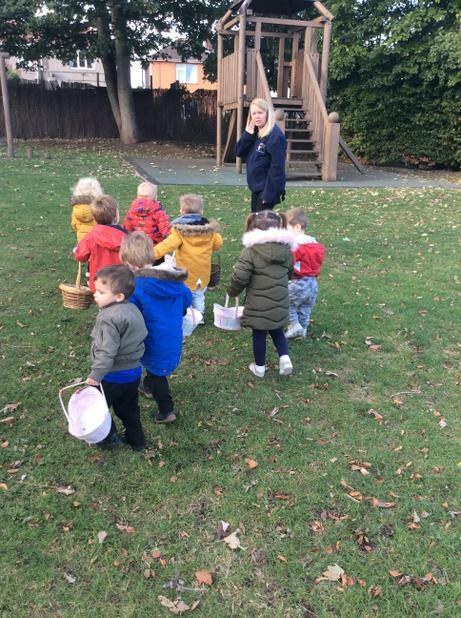 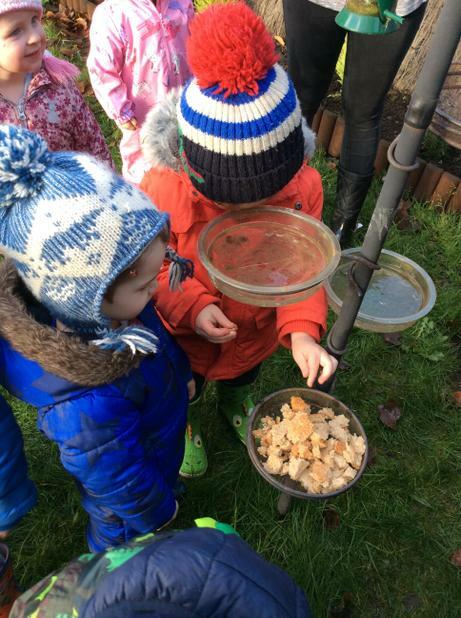 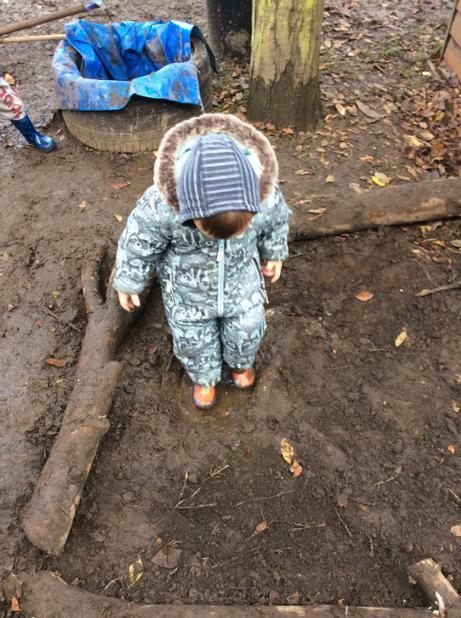 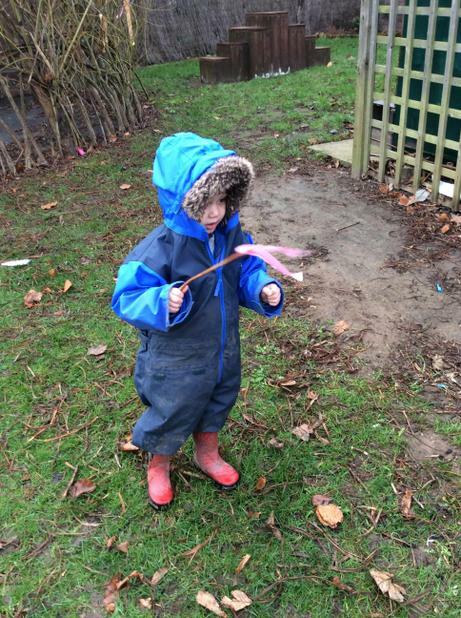 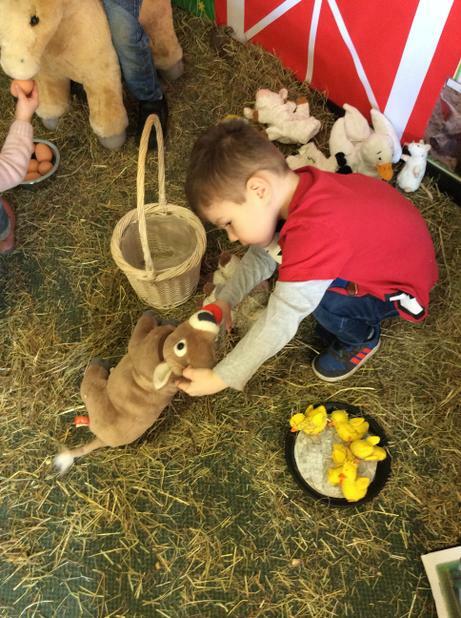 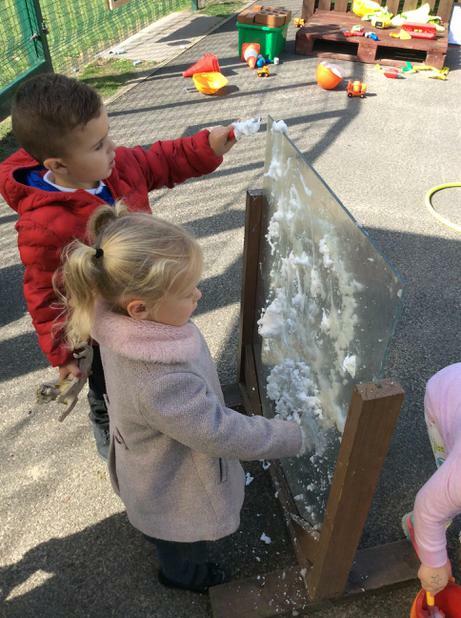 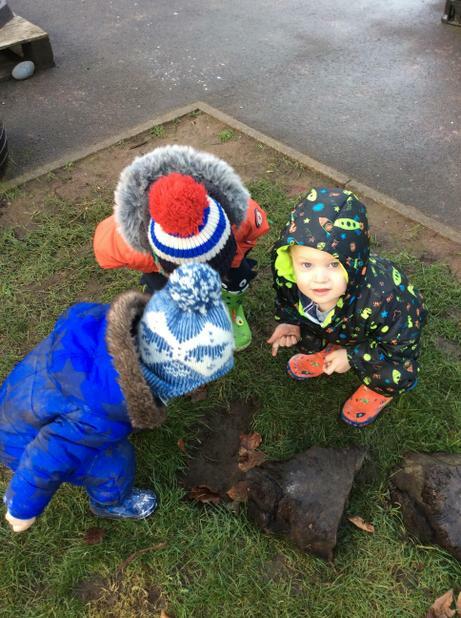 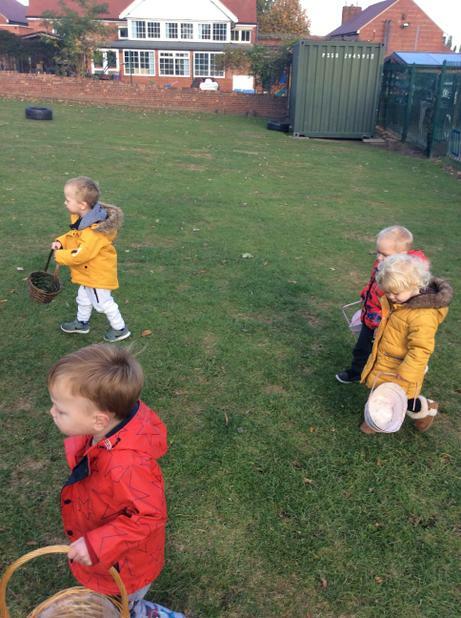 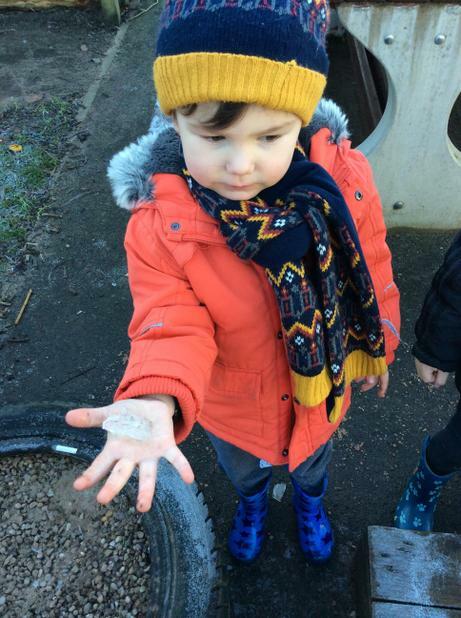 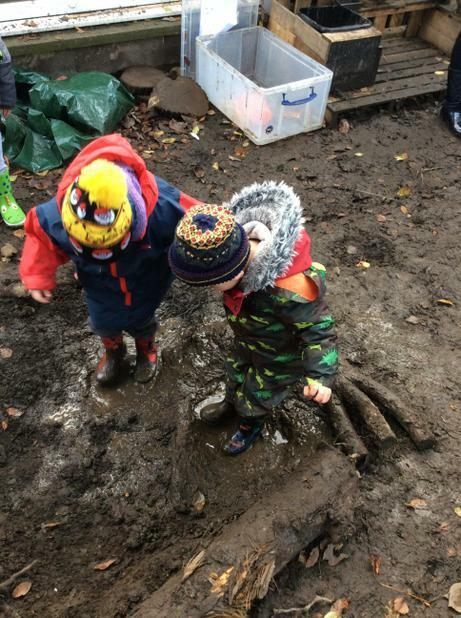 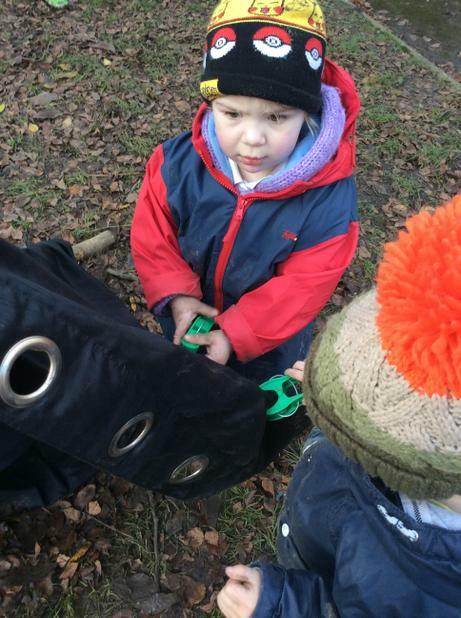 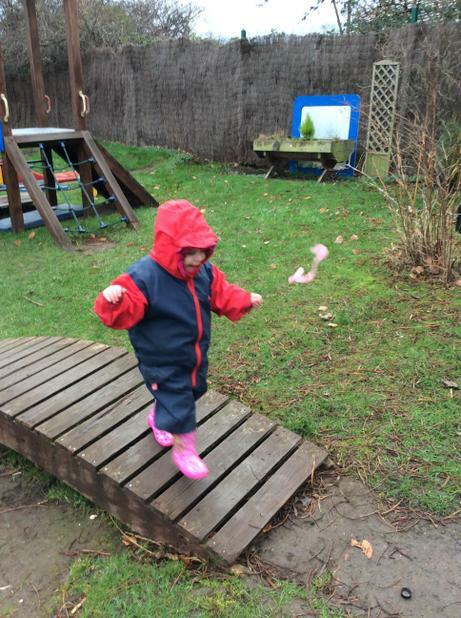 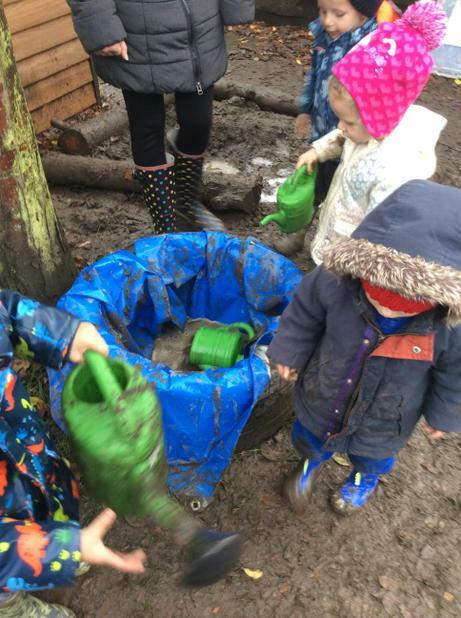 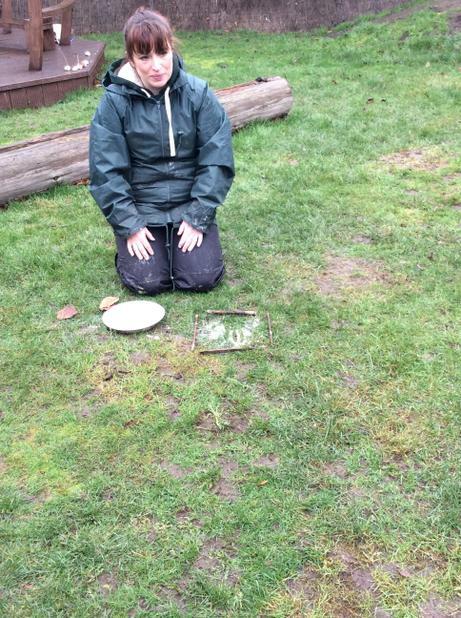 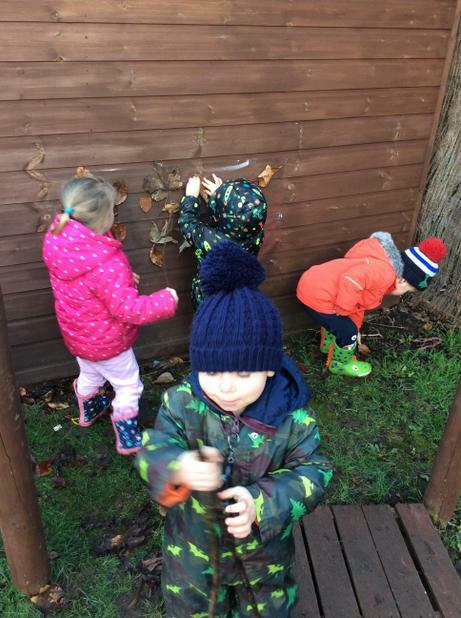 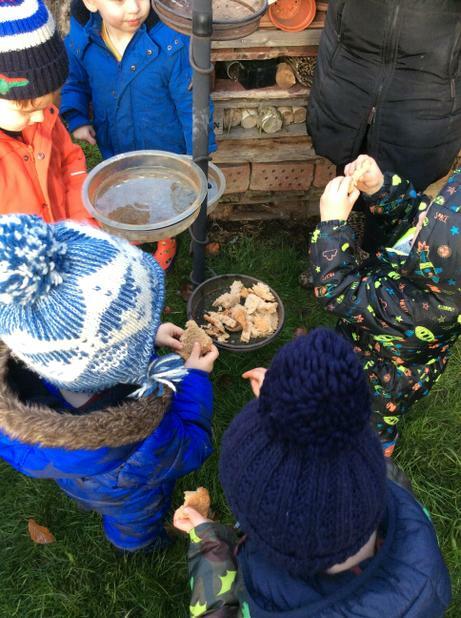 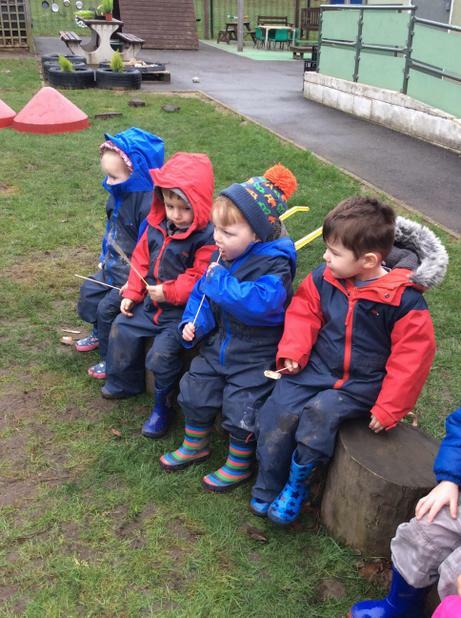 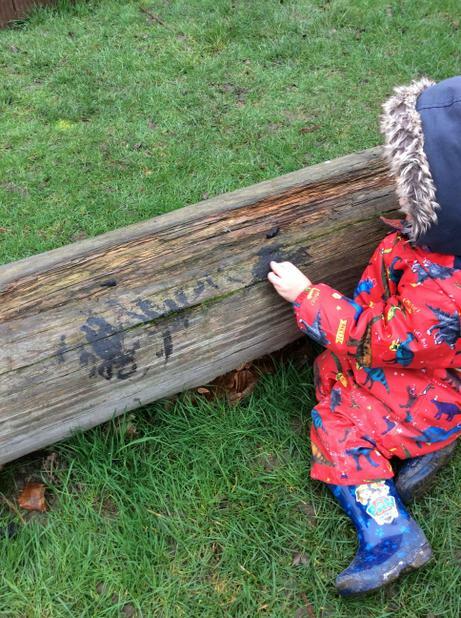 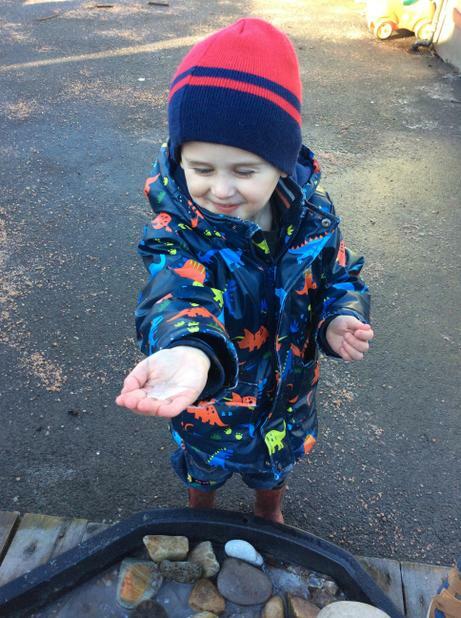 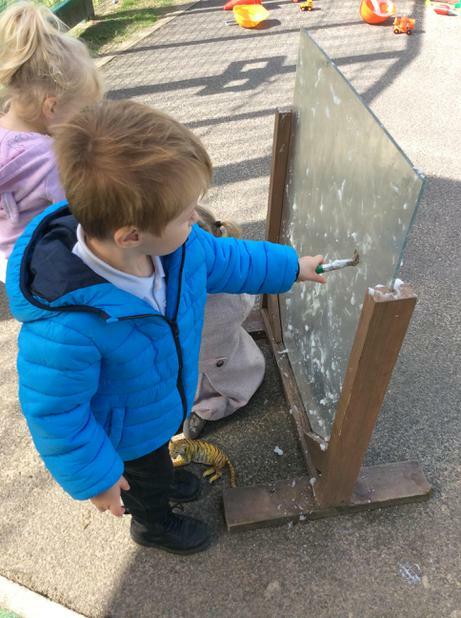 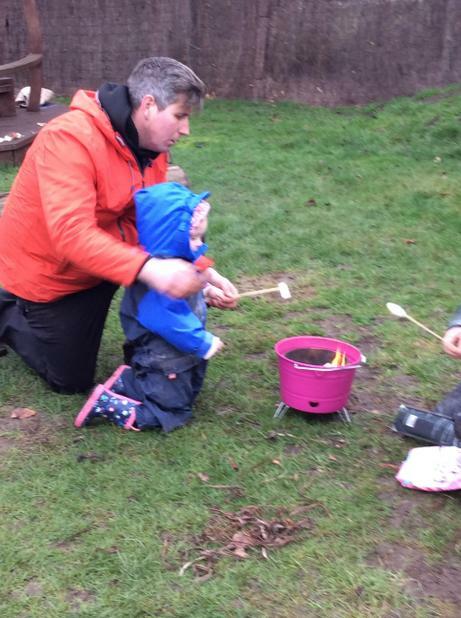 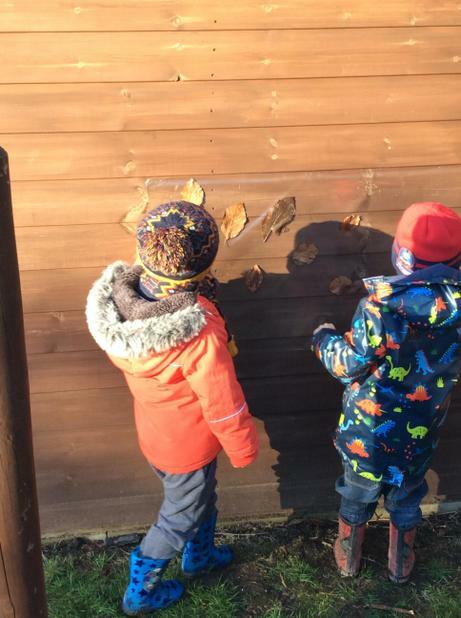 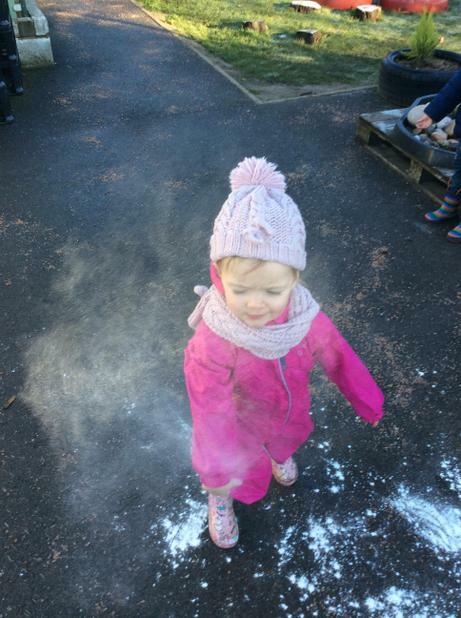 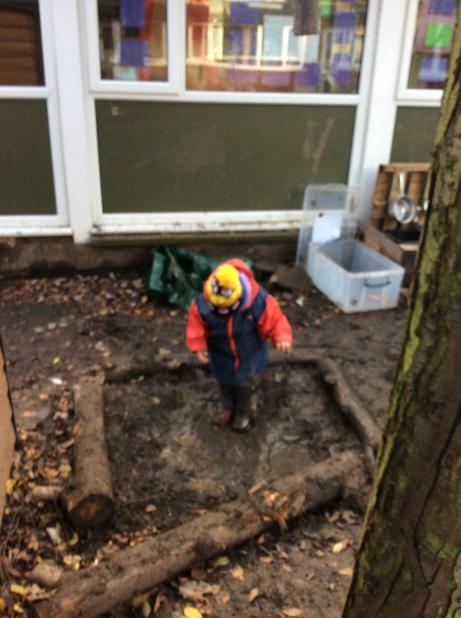 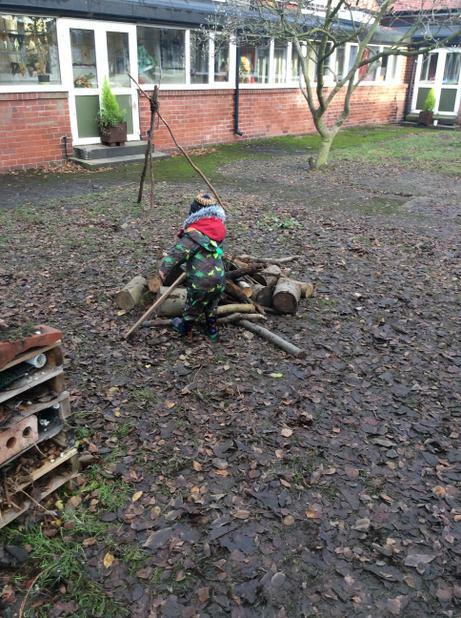 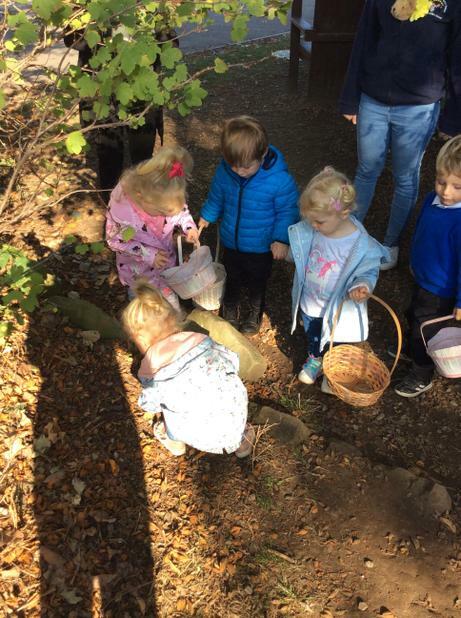 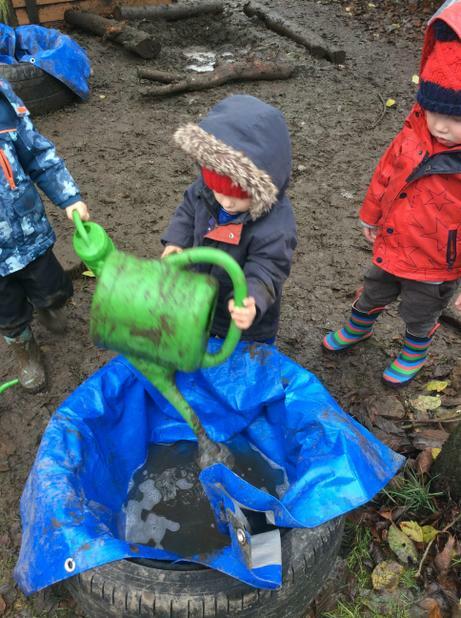 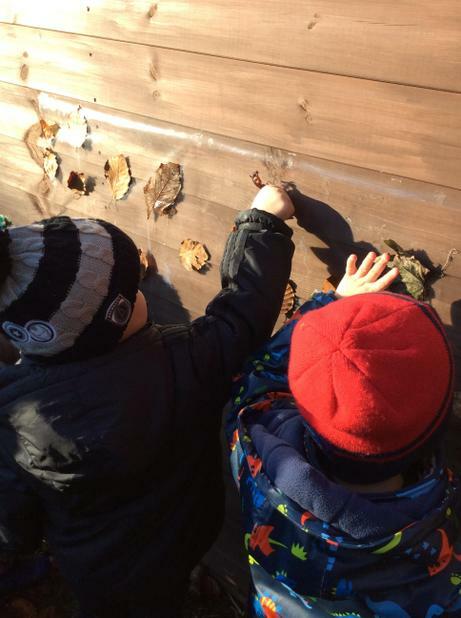 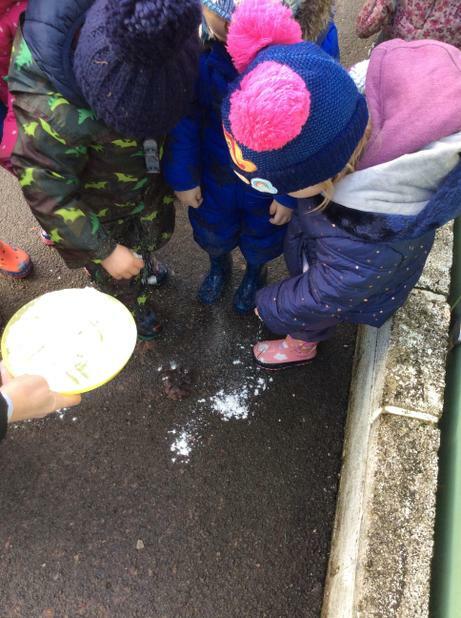 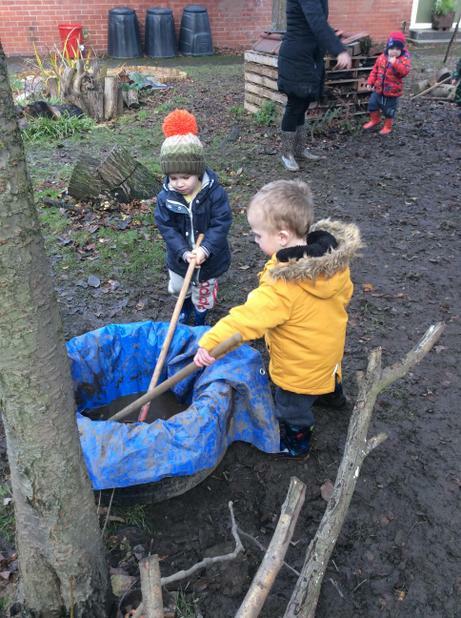 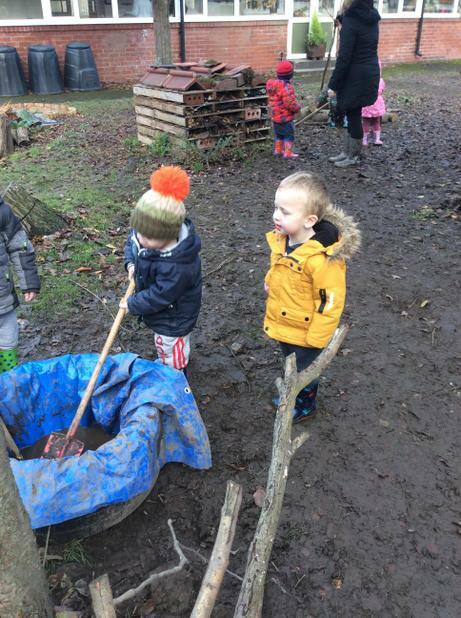 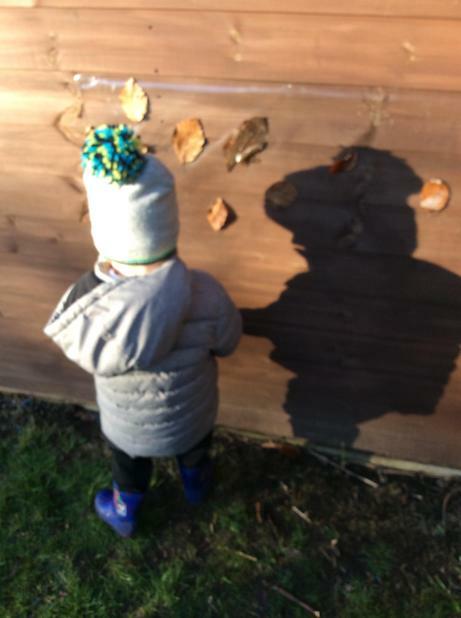 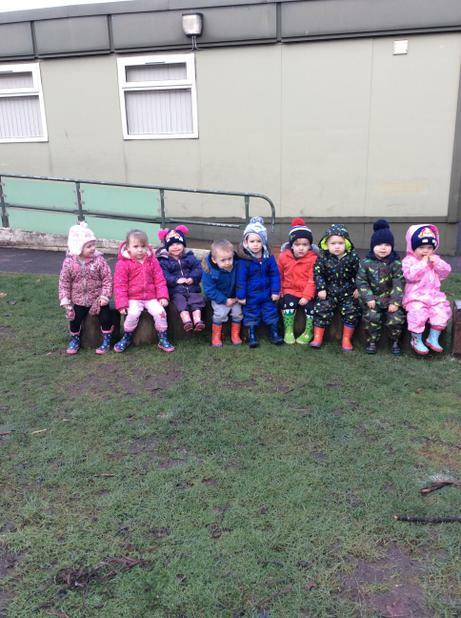 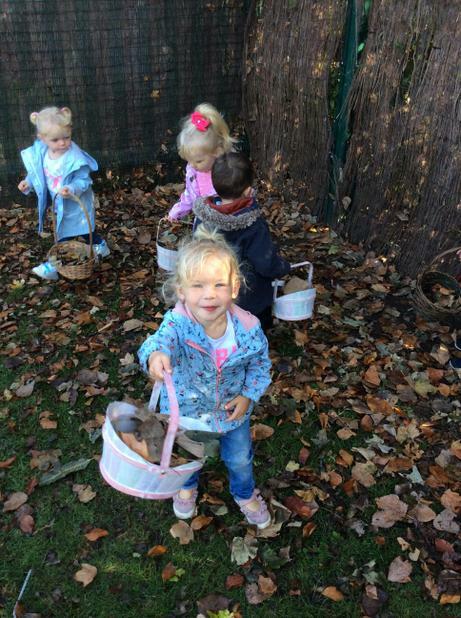 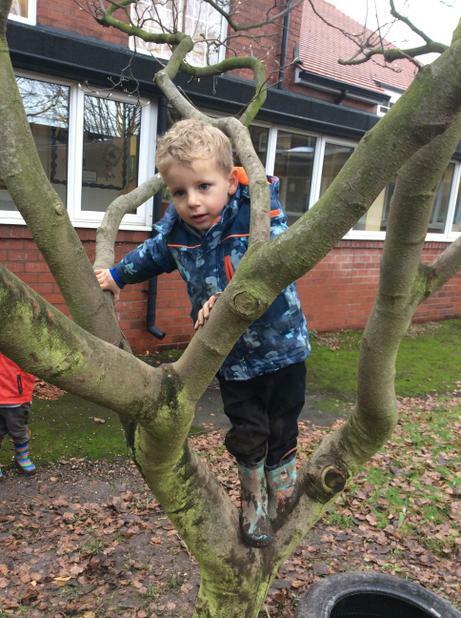 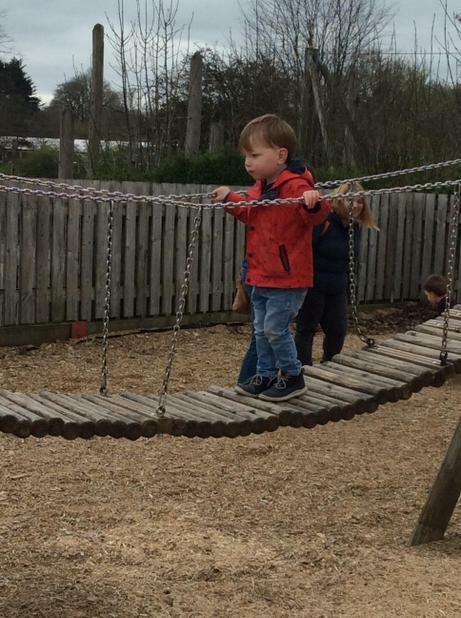 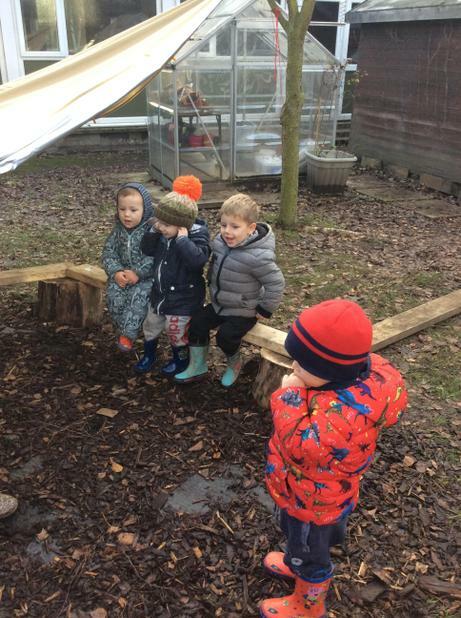 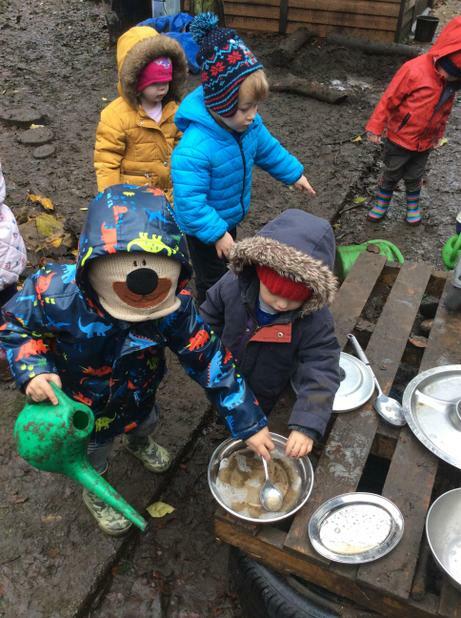 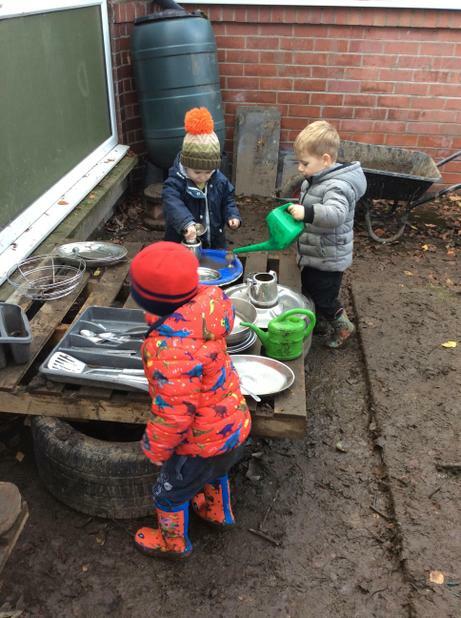 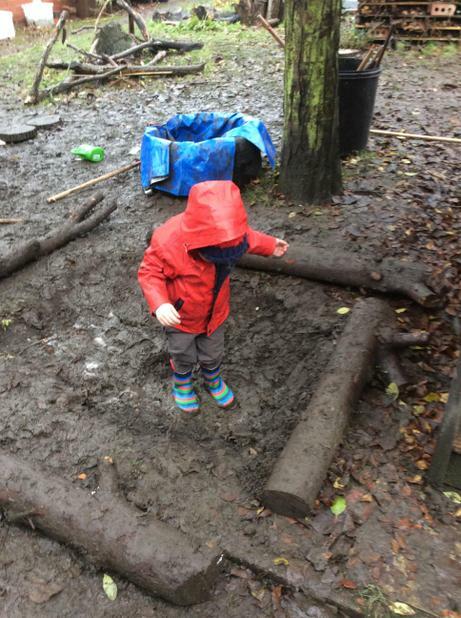 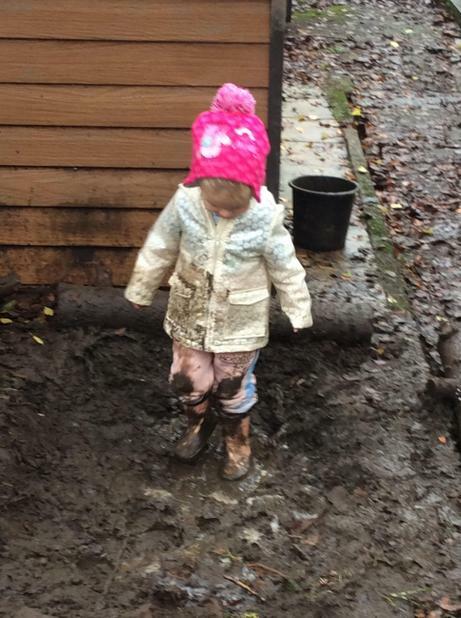 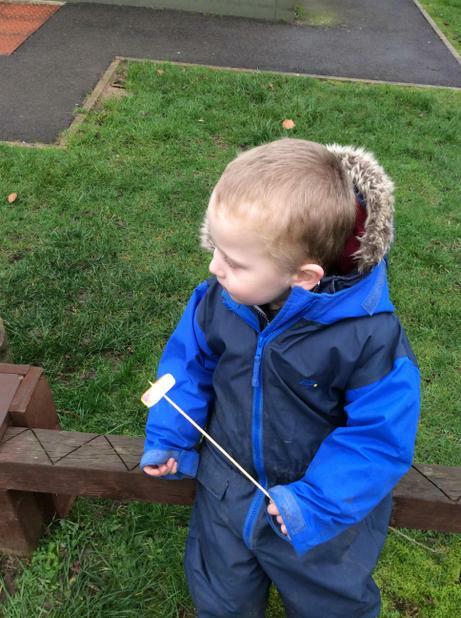 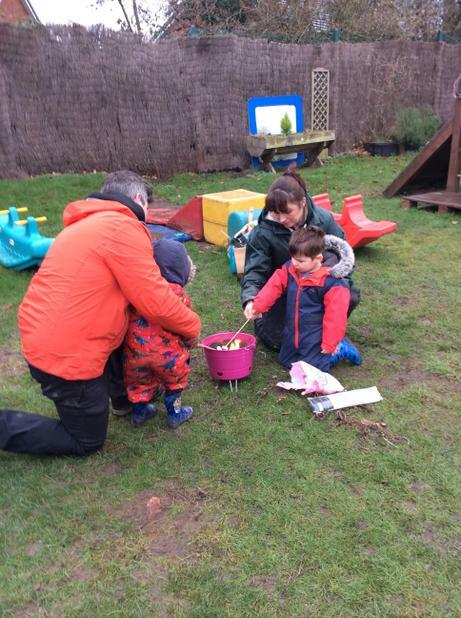 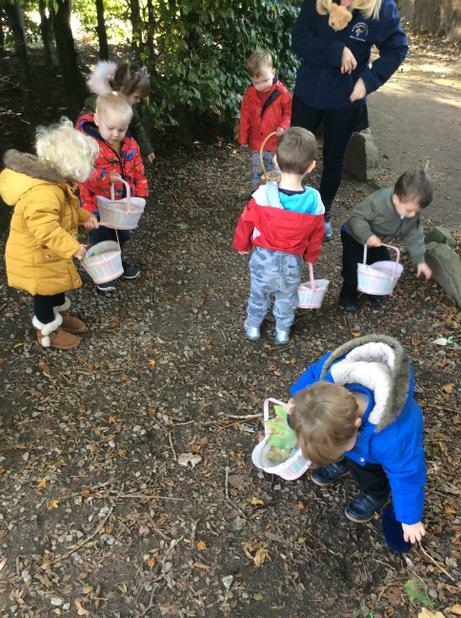 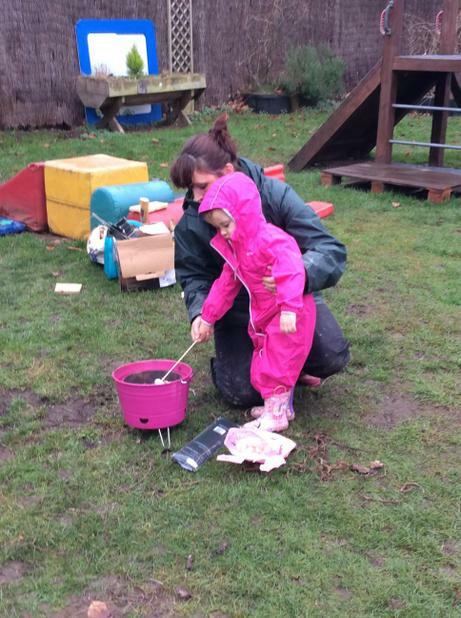 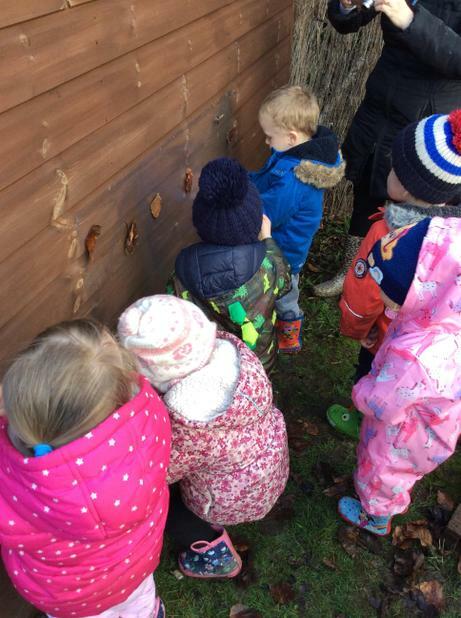 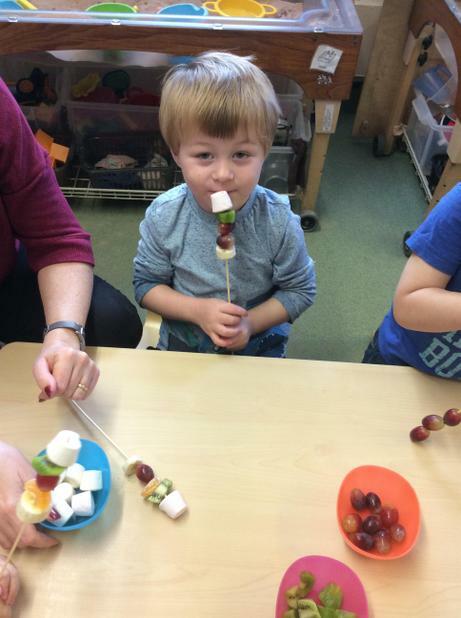 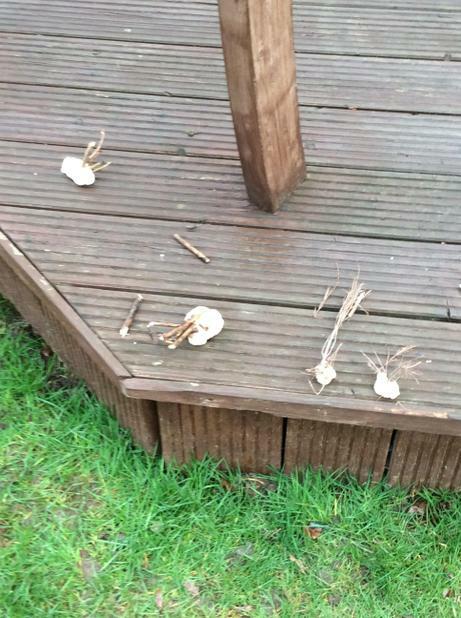 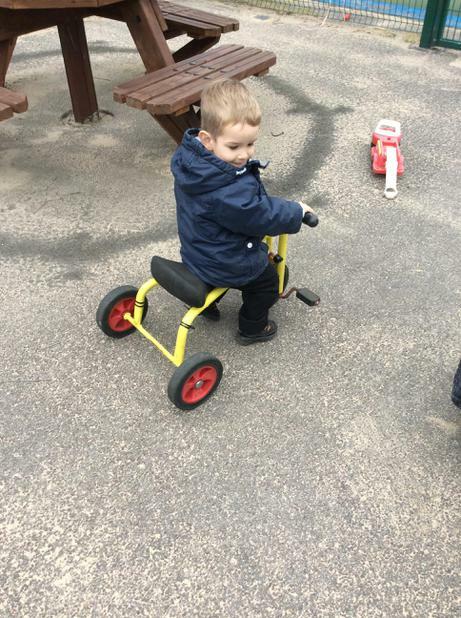 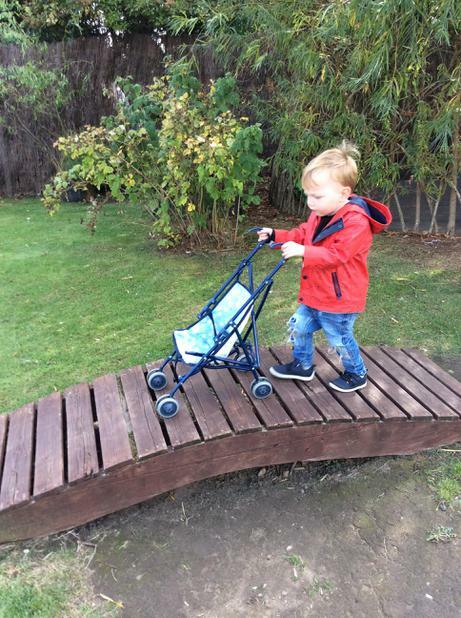 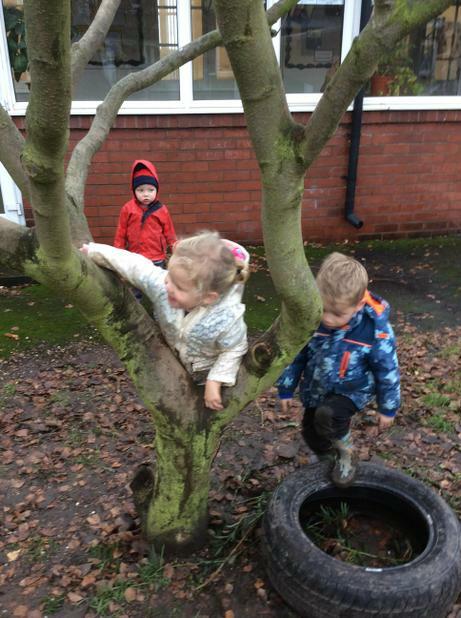 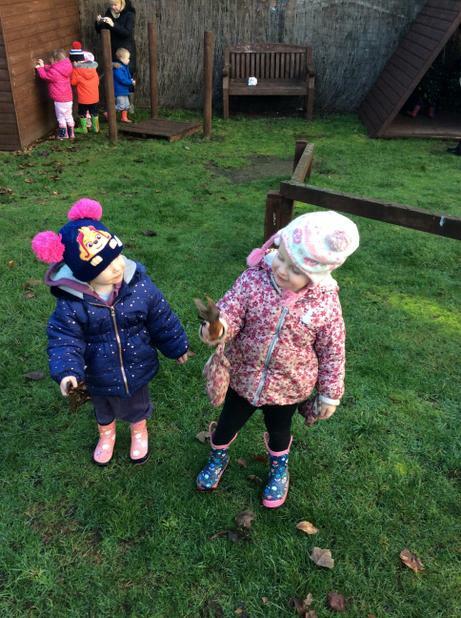 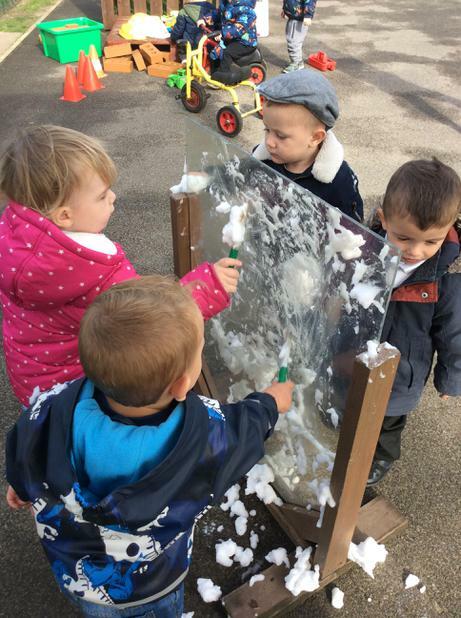 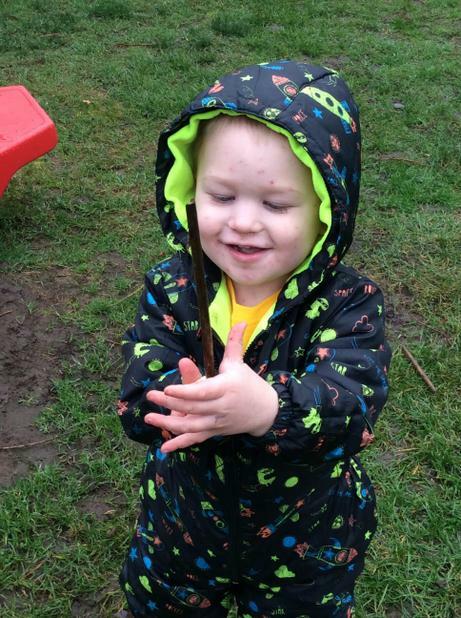 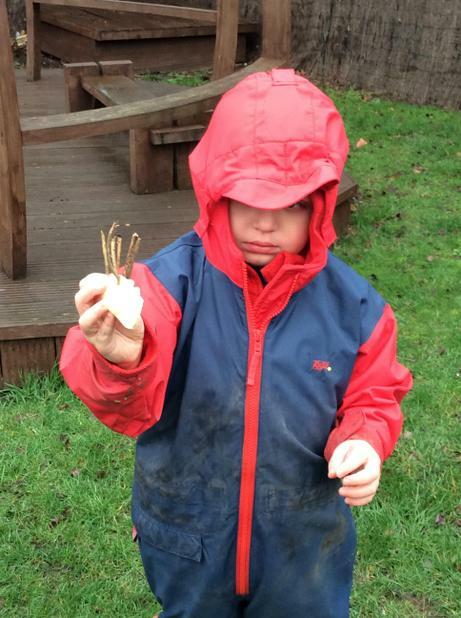 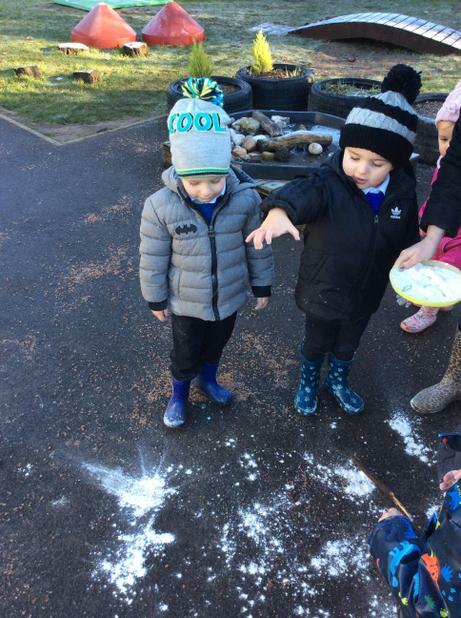 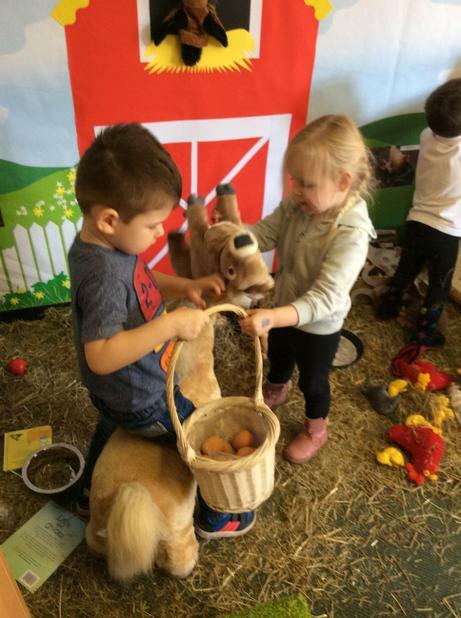 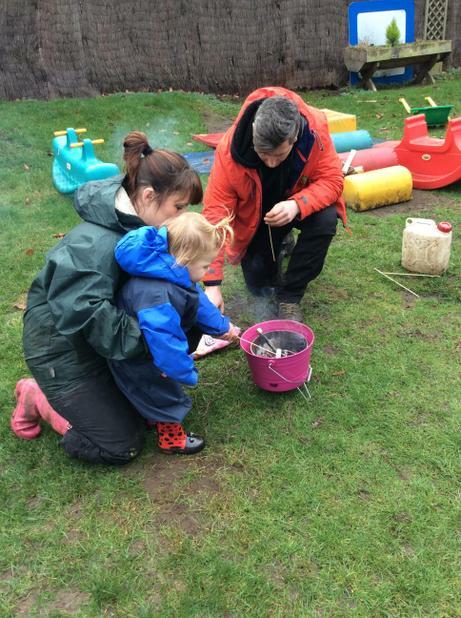 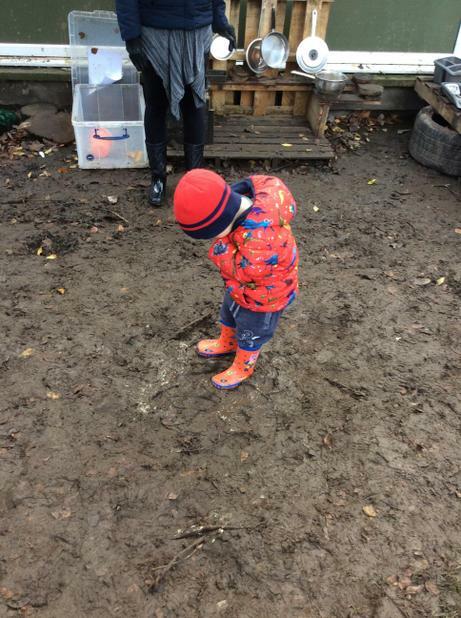 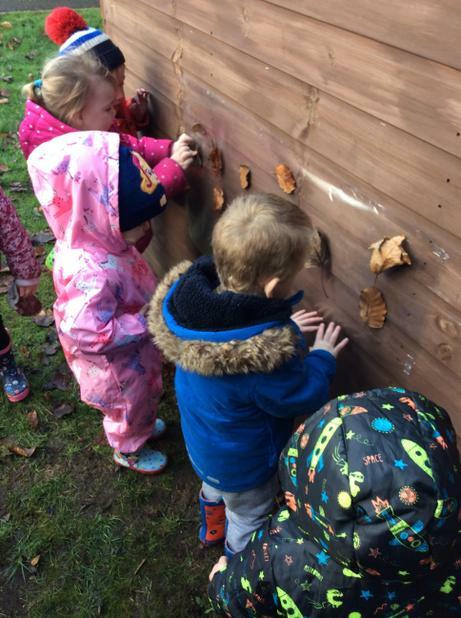 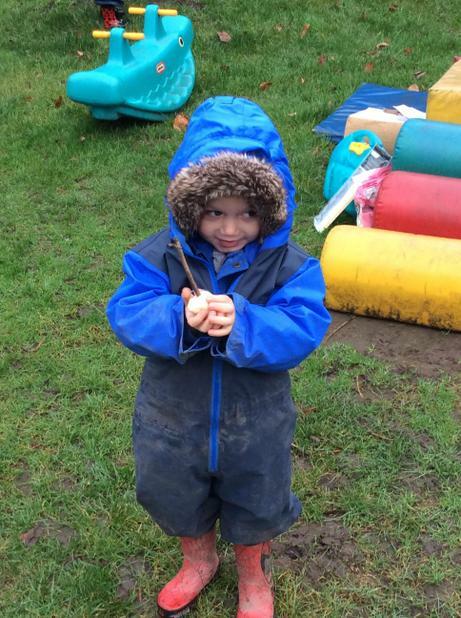 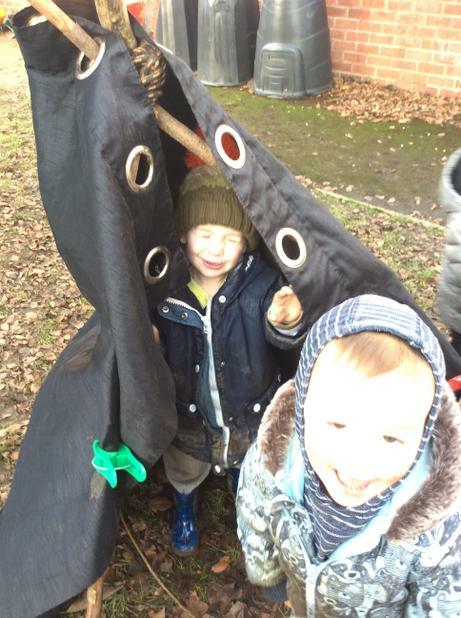 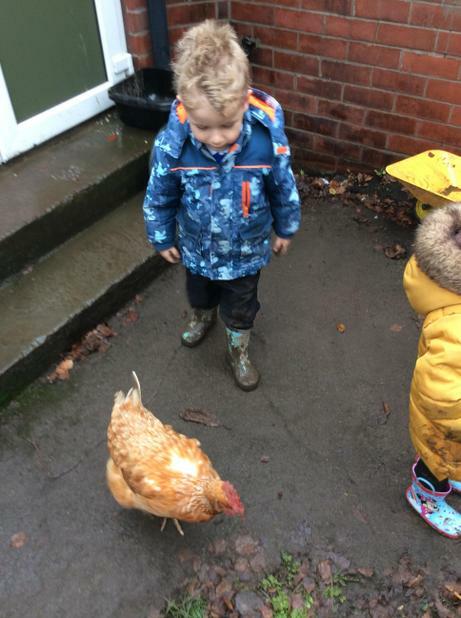 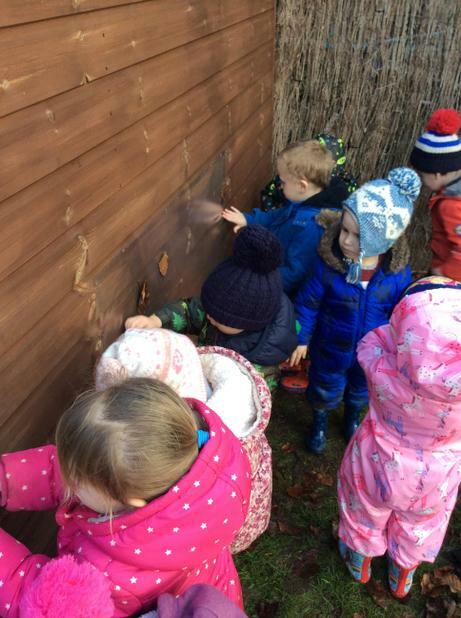 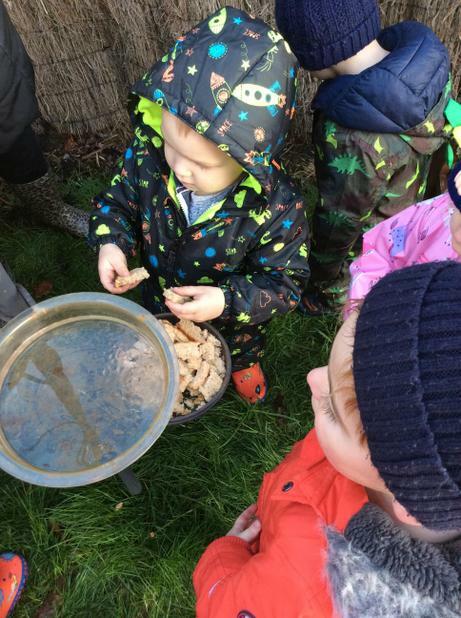 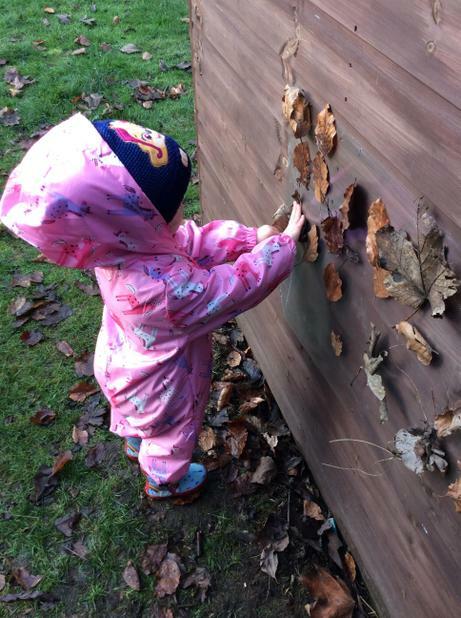 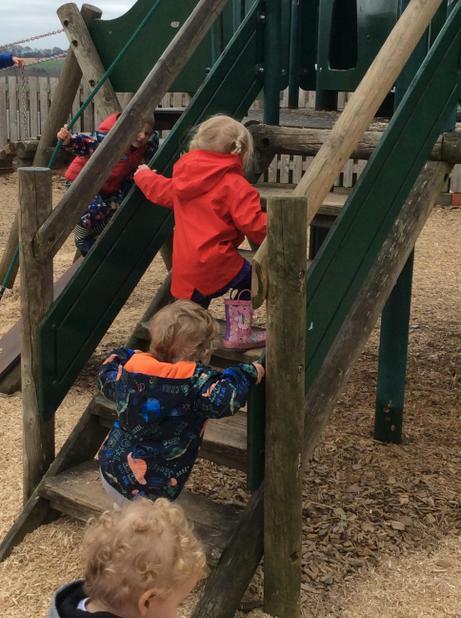 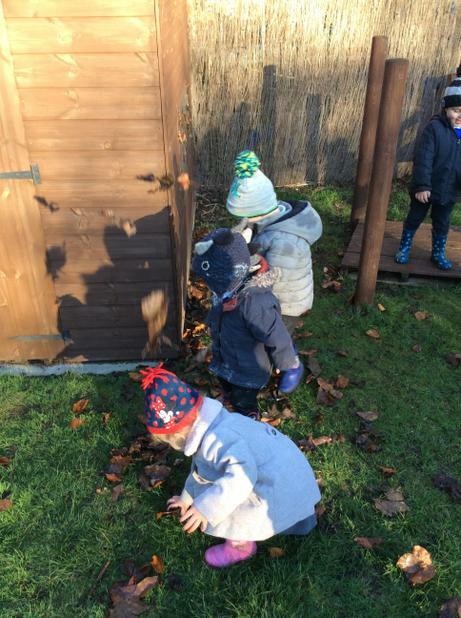 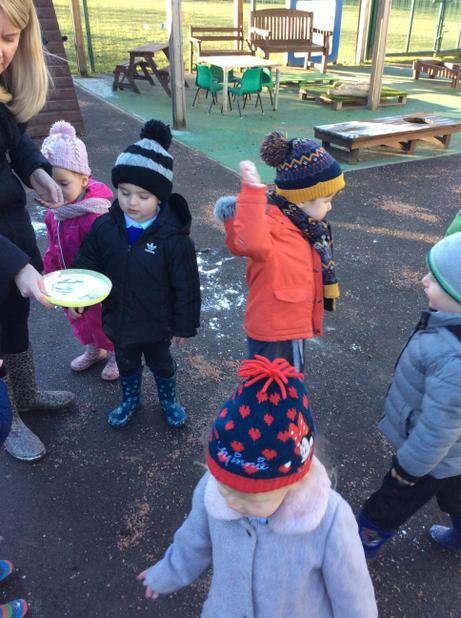 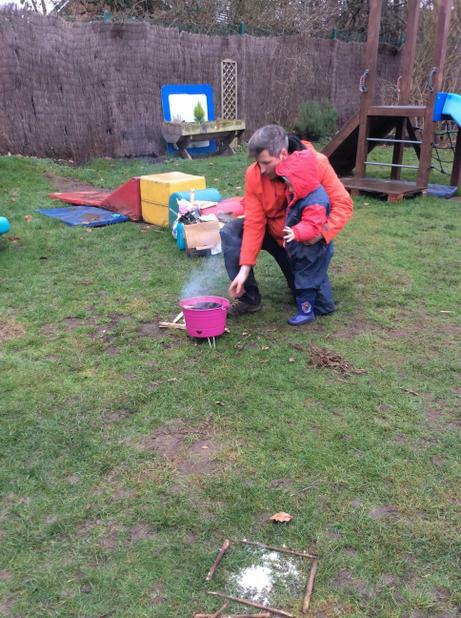 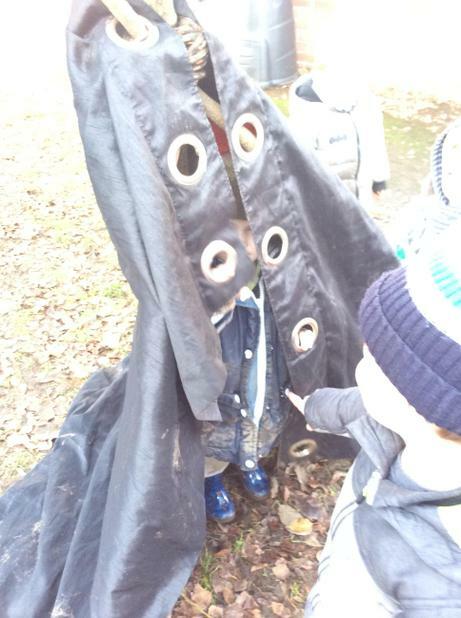 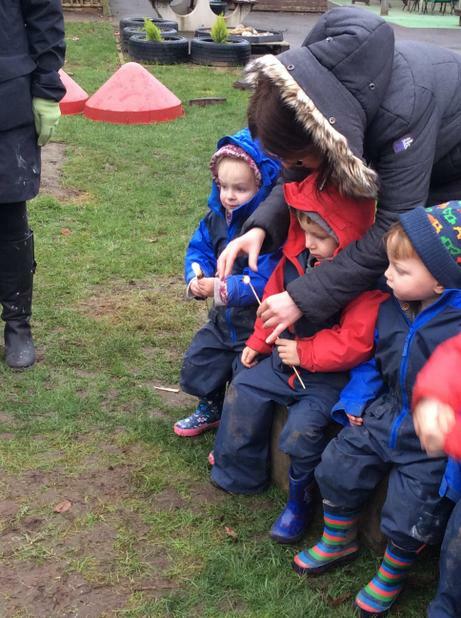 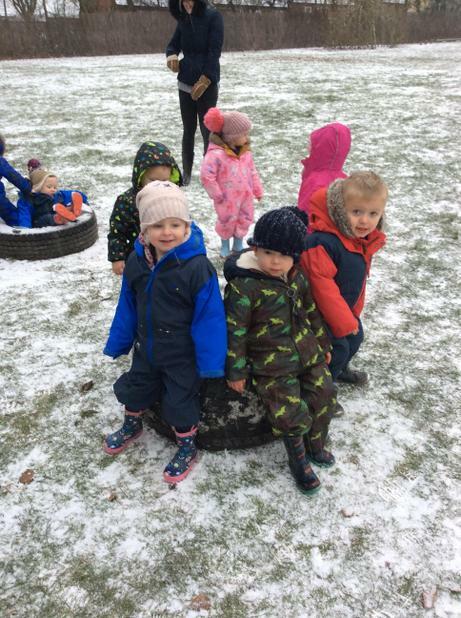 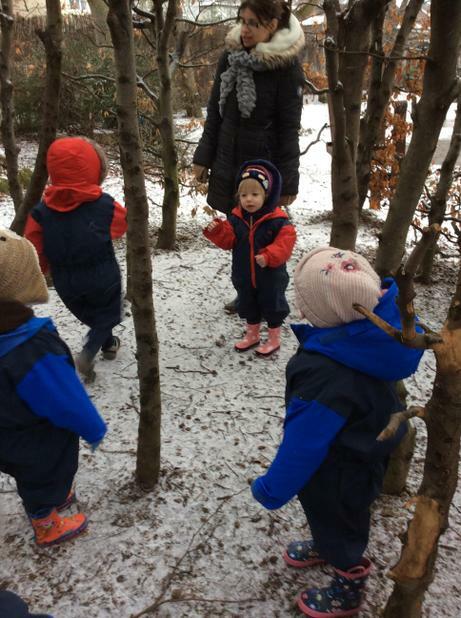 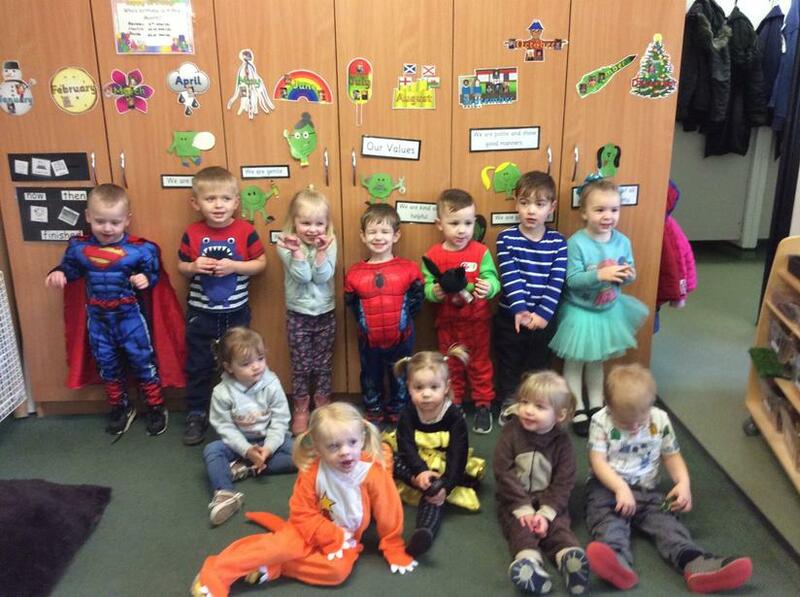 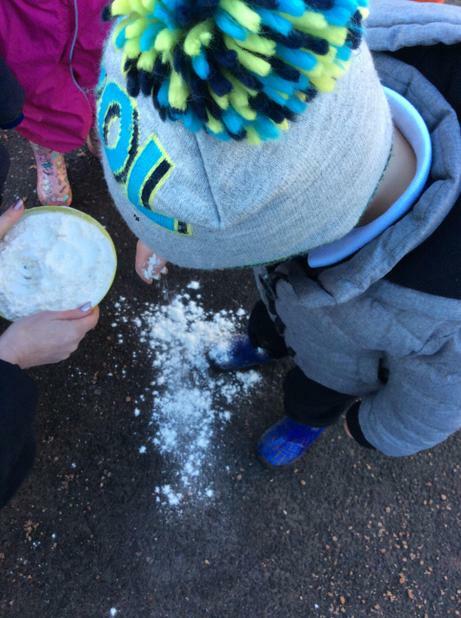 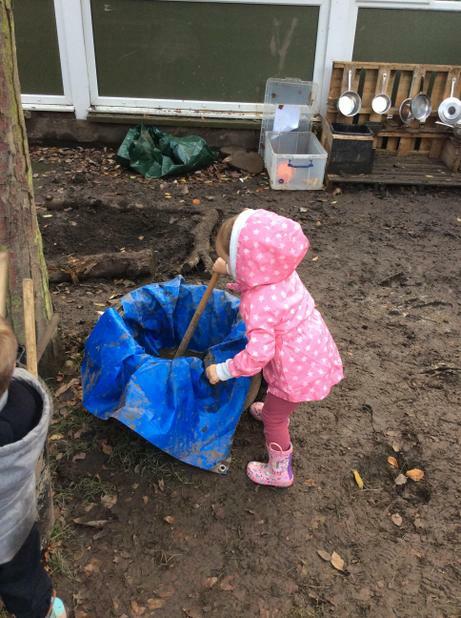 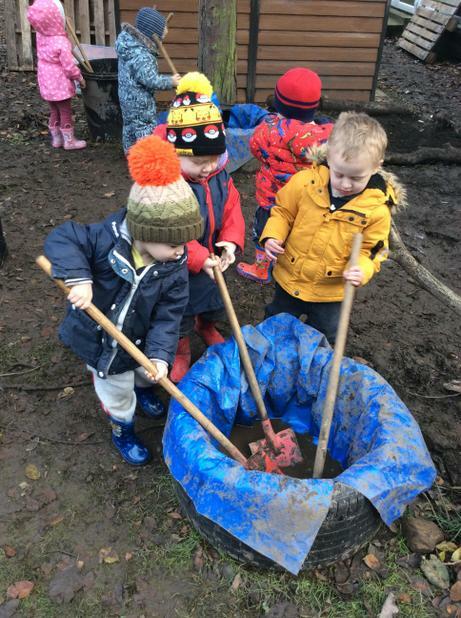 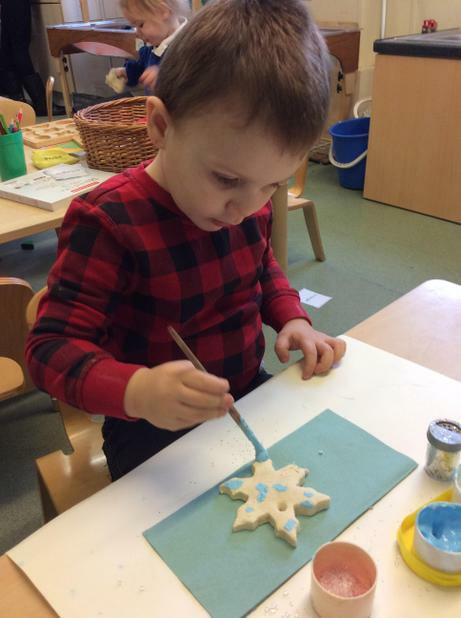 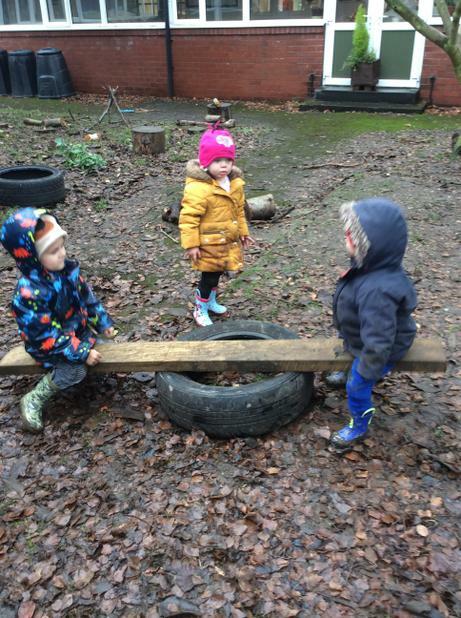 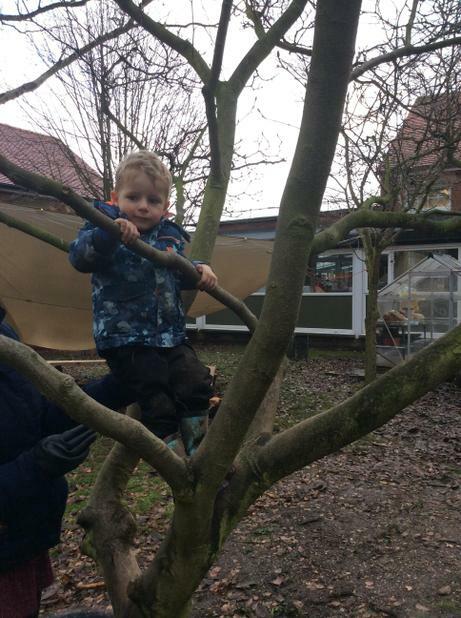 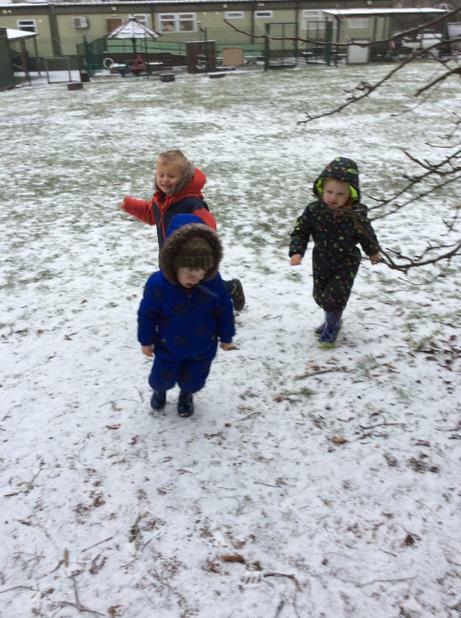 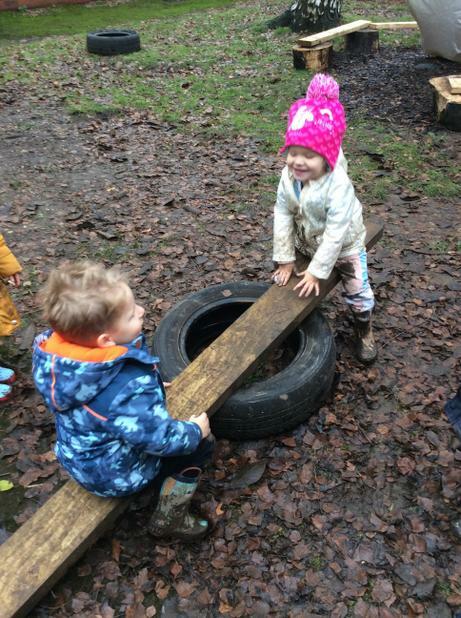 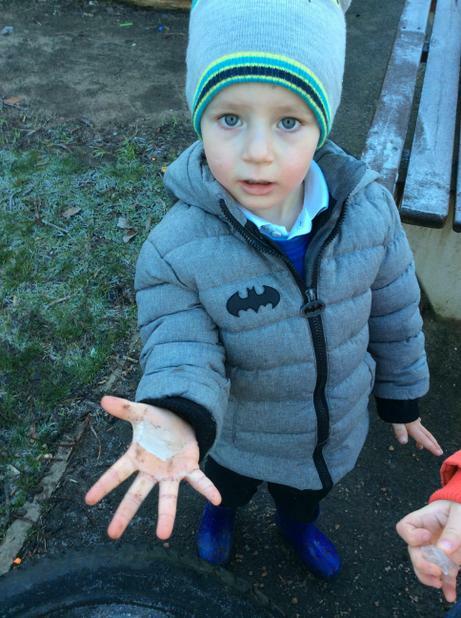 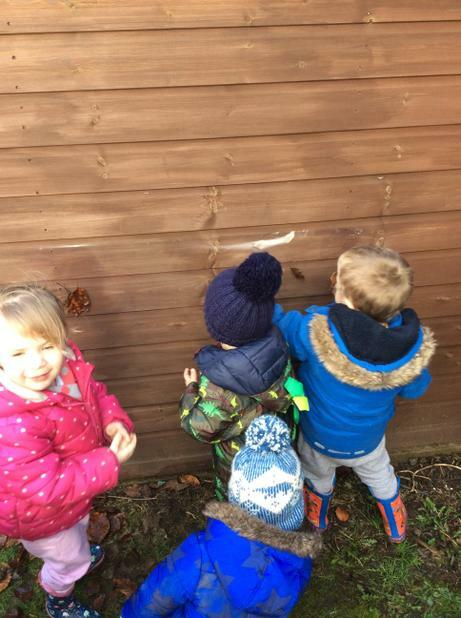 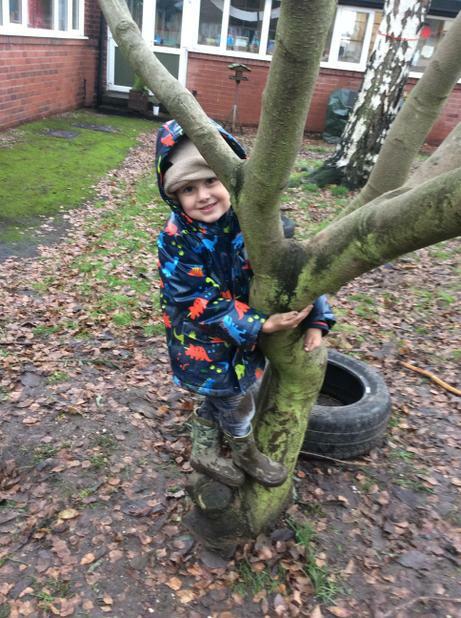 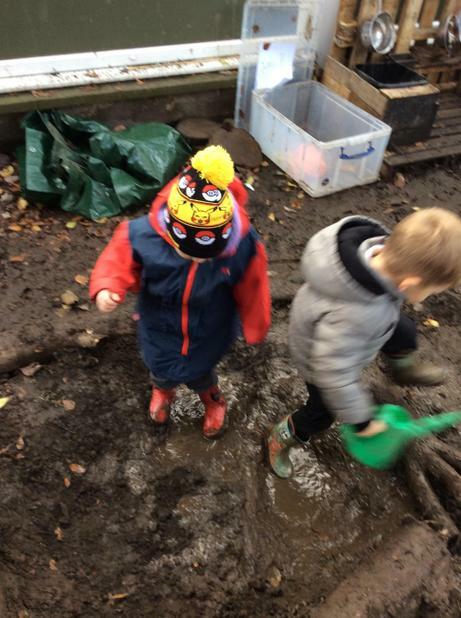 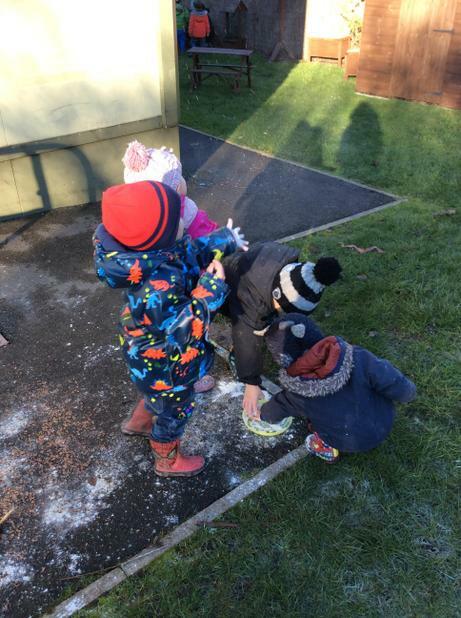 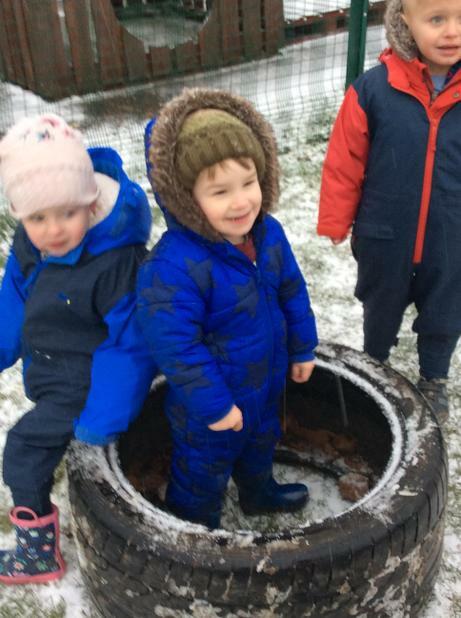 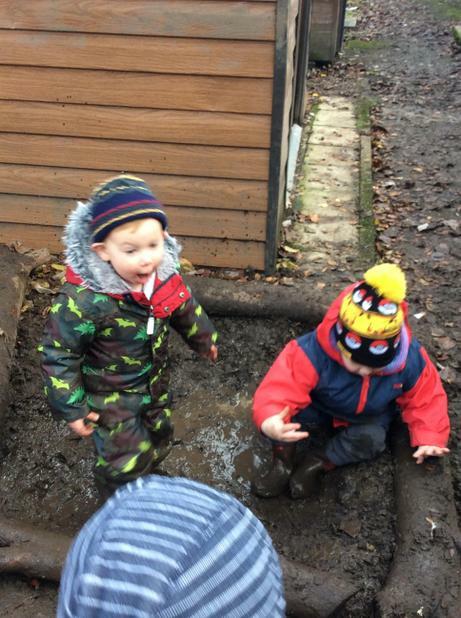 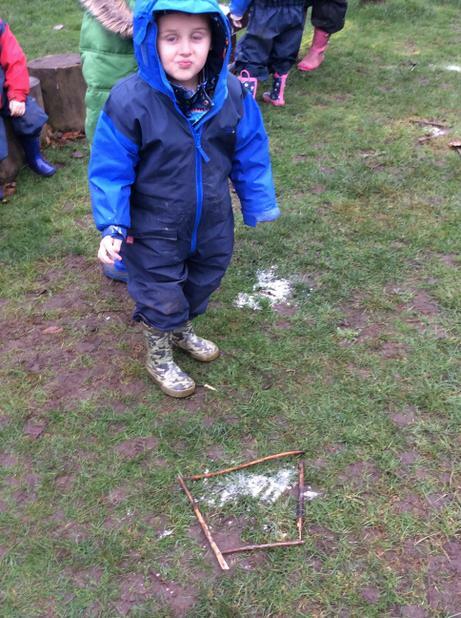 Week commencing 26/11/18 Smarties children have had a wonderful time exploring in our Forest schools area. 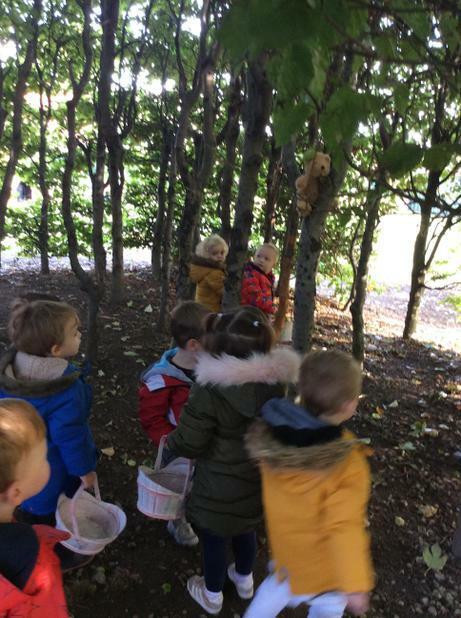 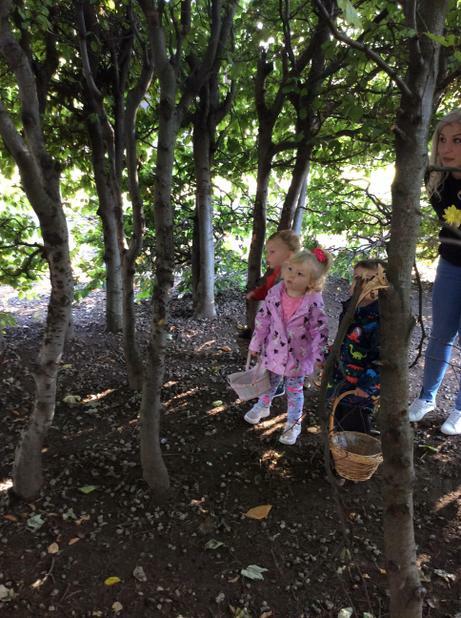 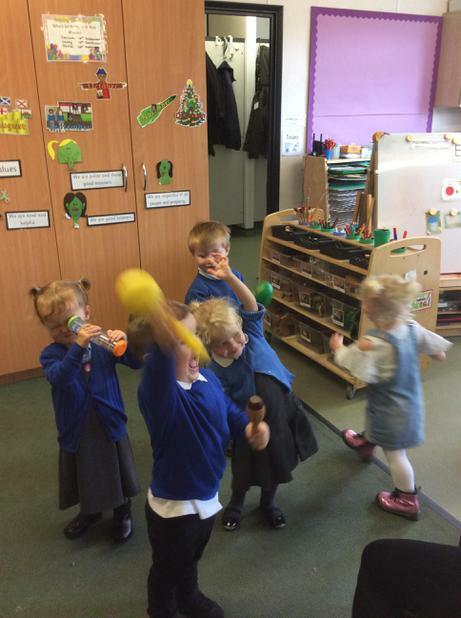 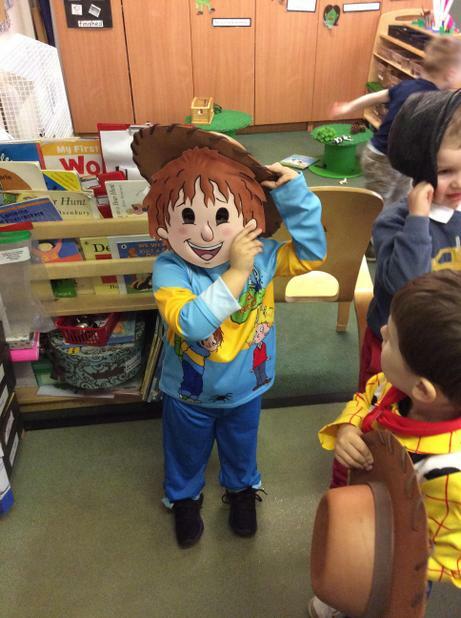 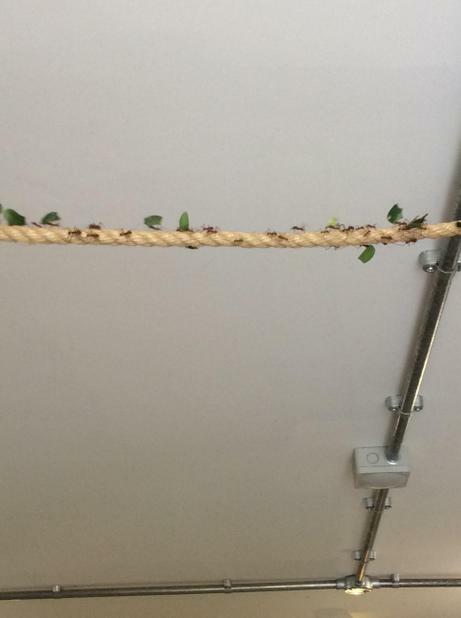 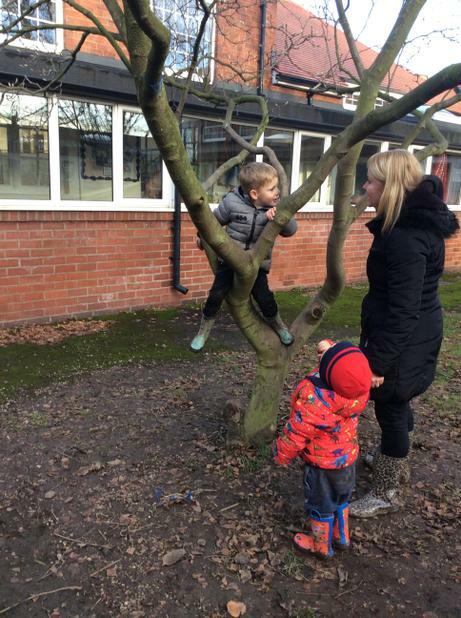 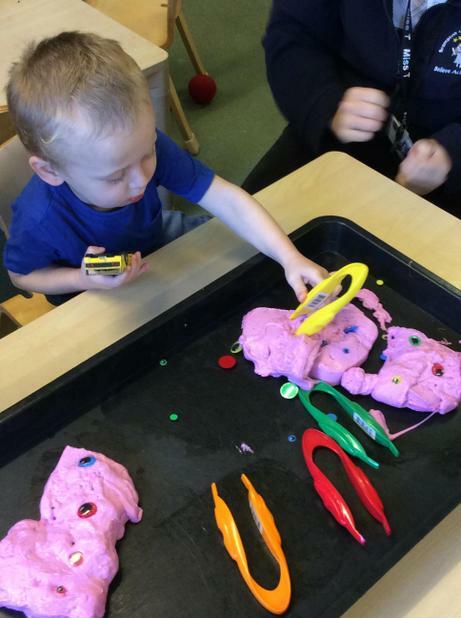 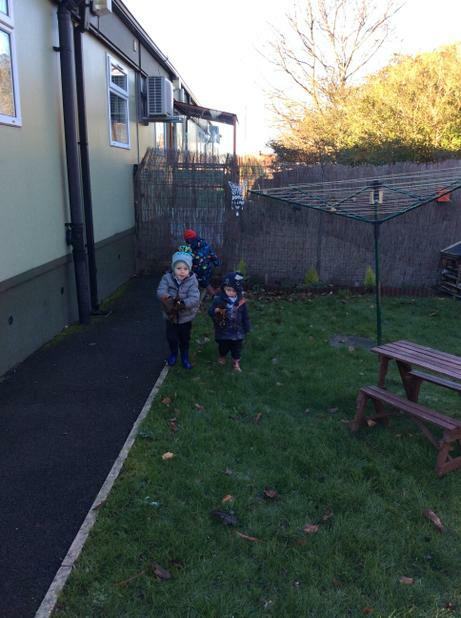 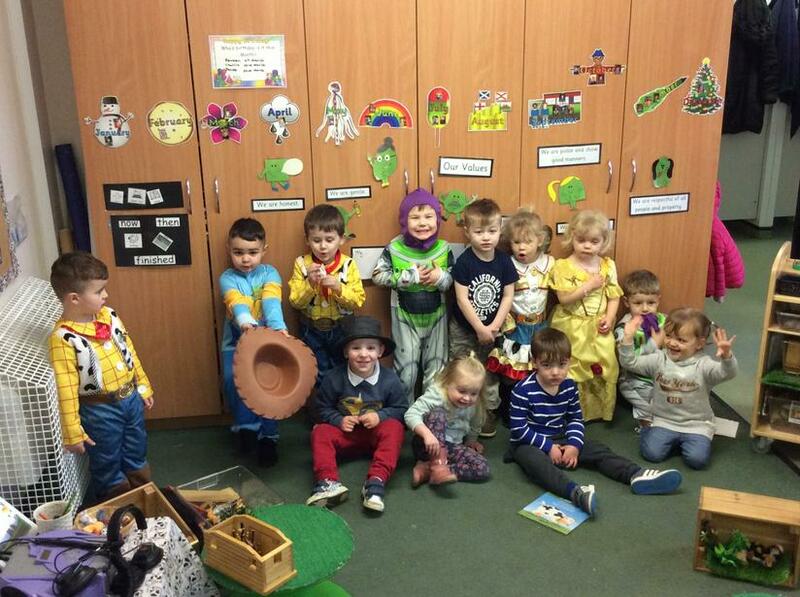 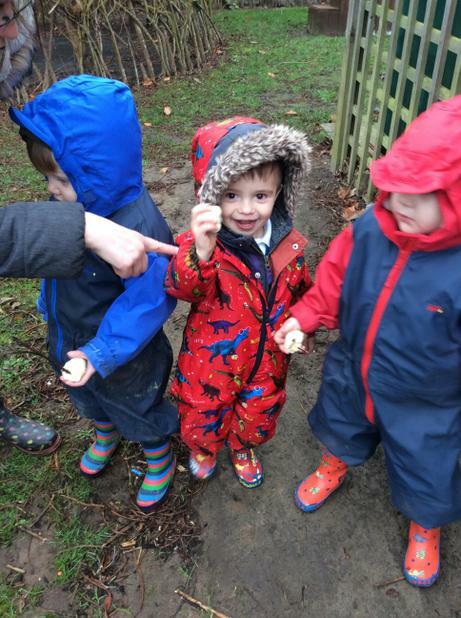 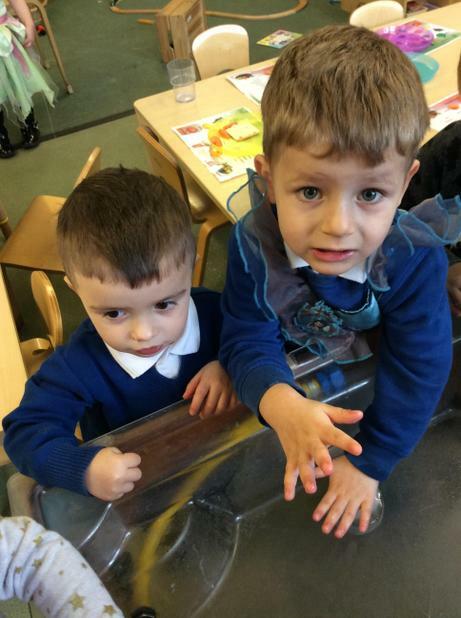 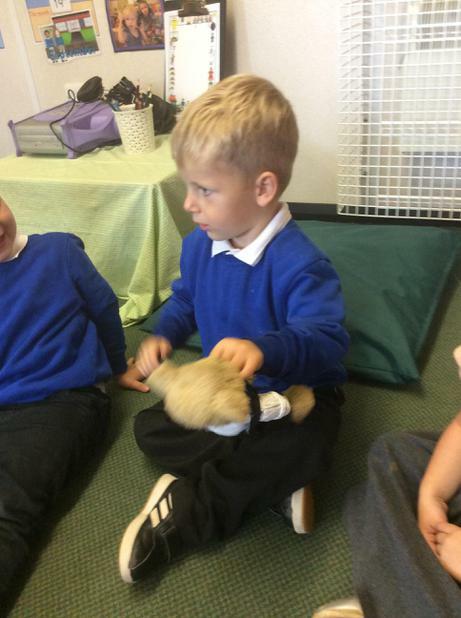 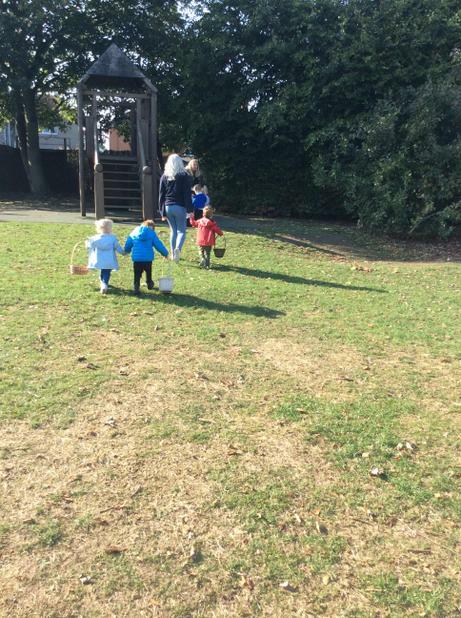 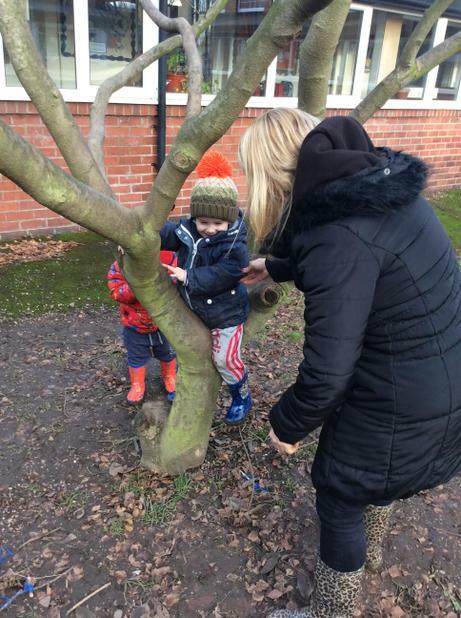 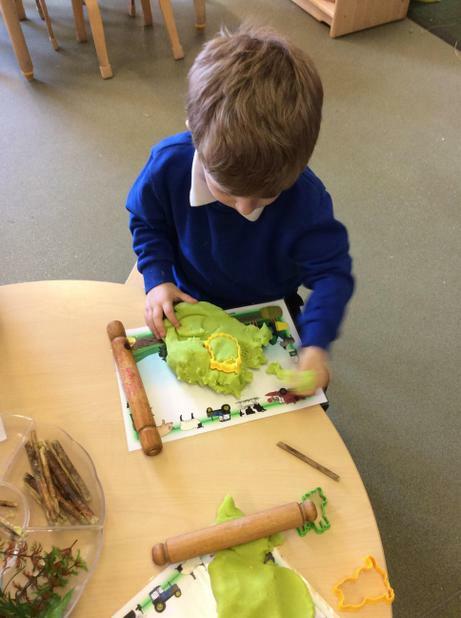 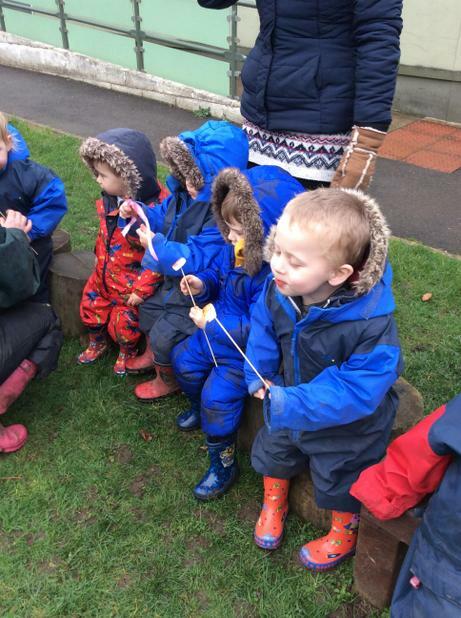 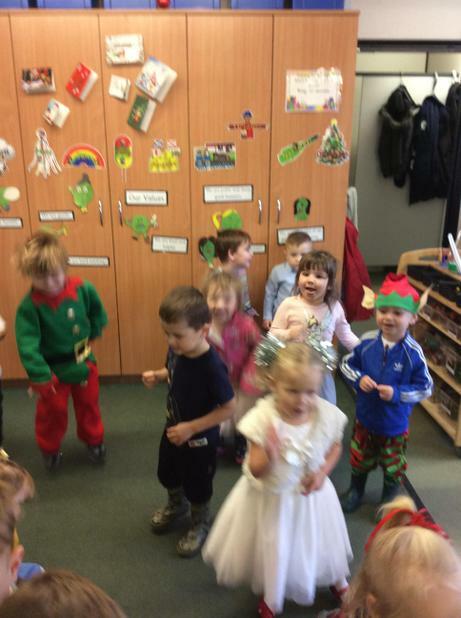 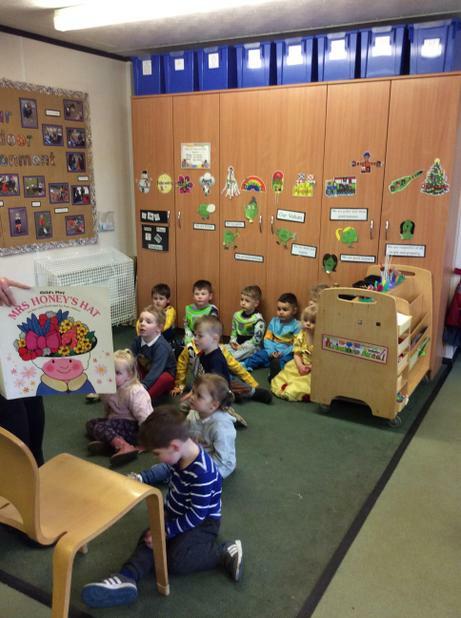 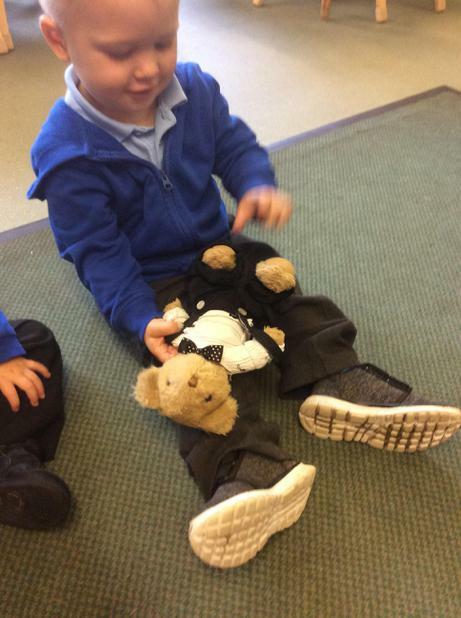 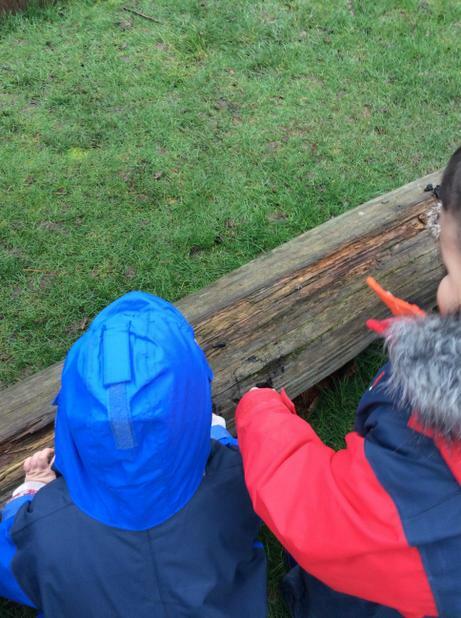 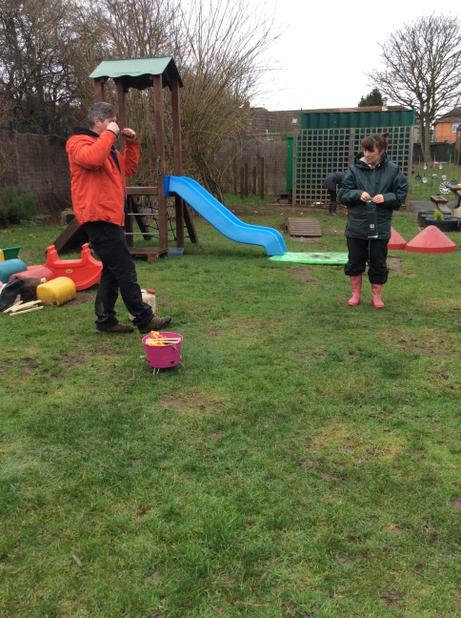 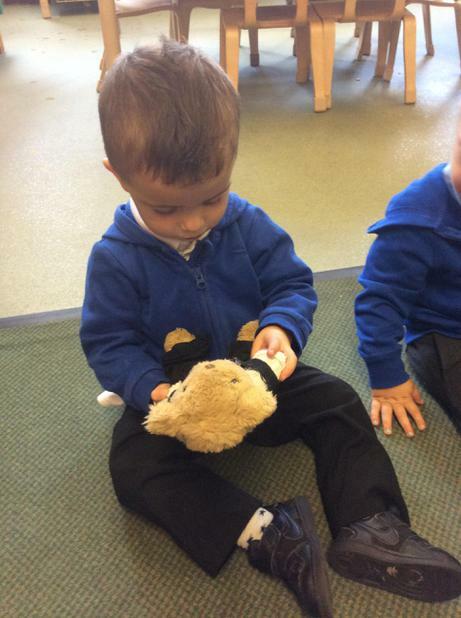 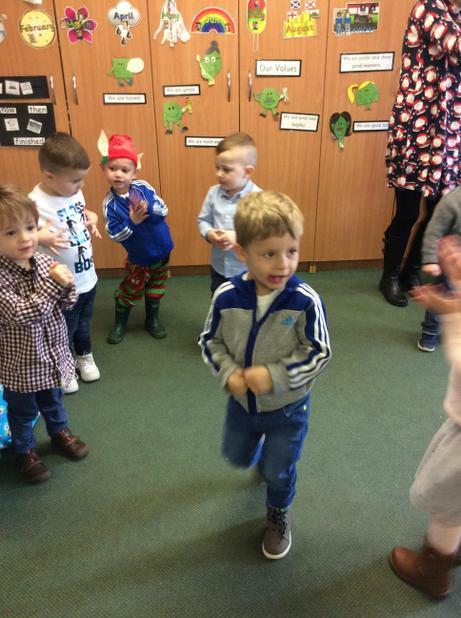 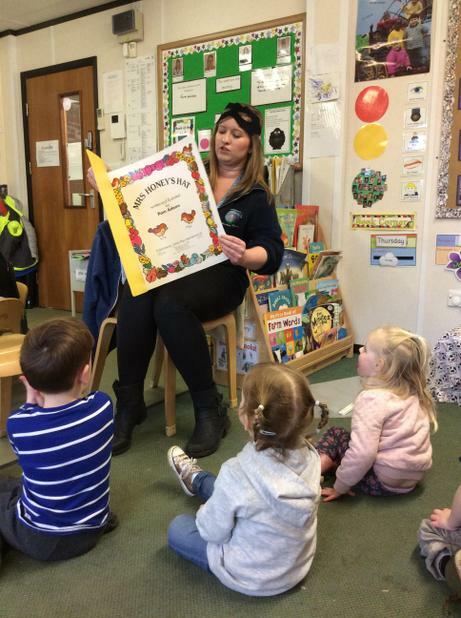 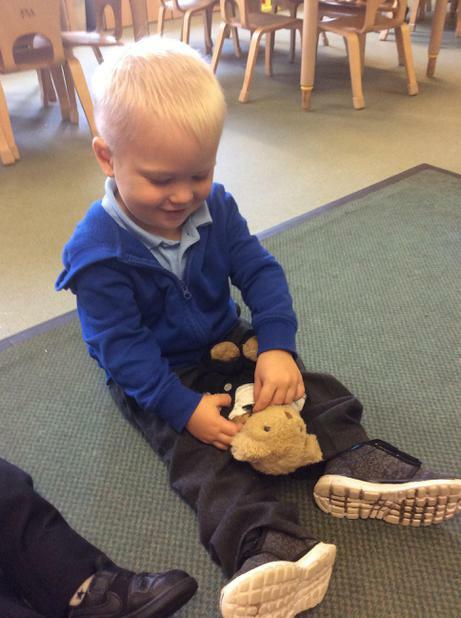 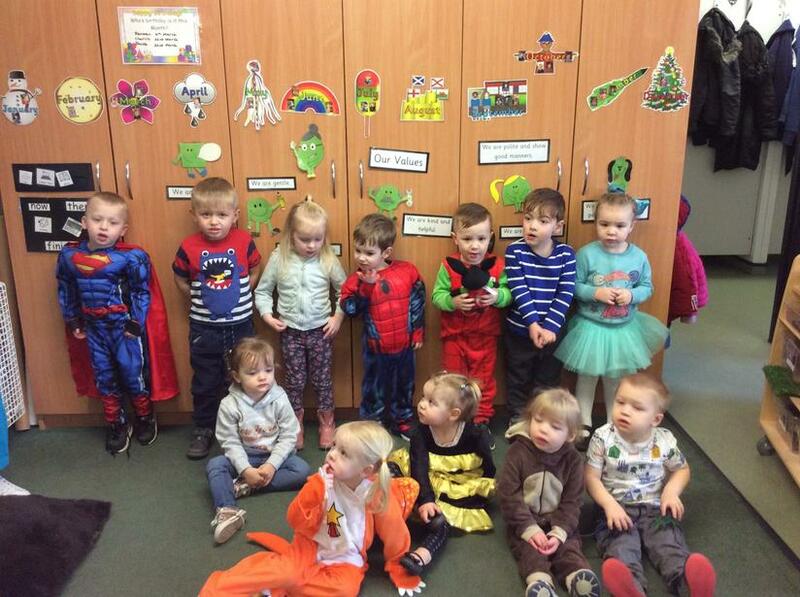 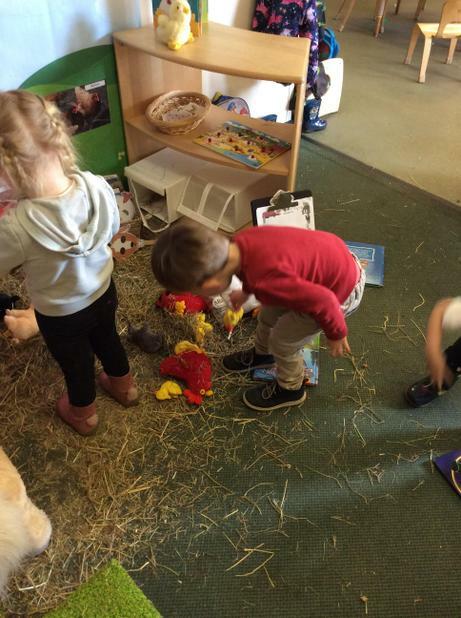 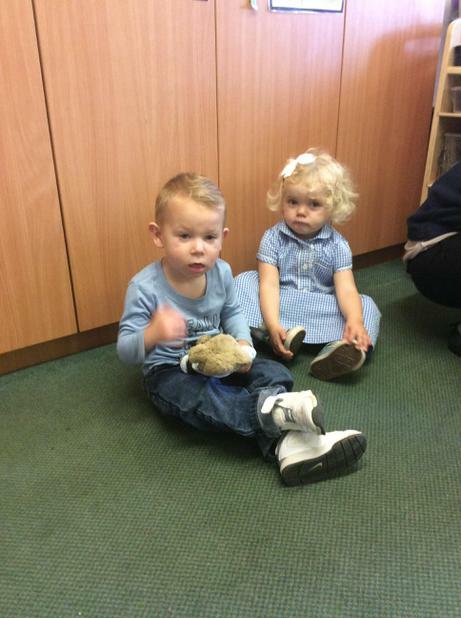 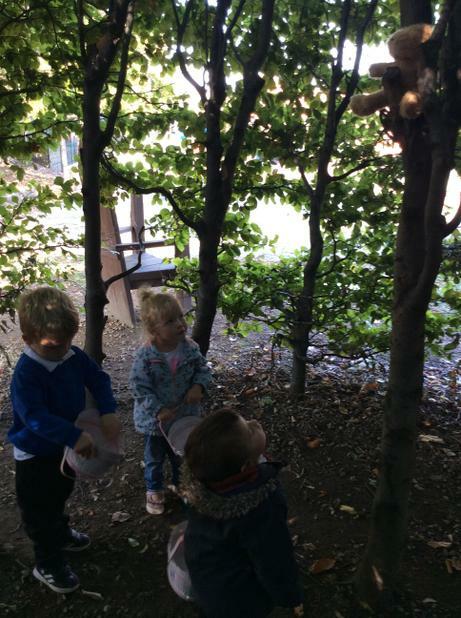 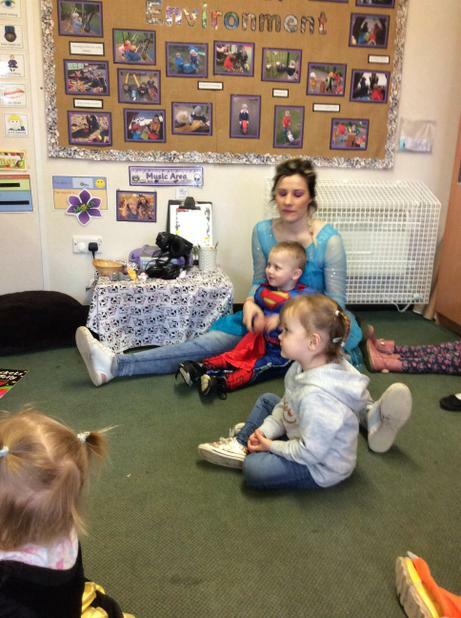 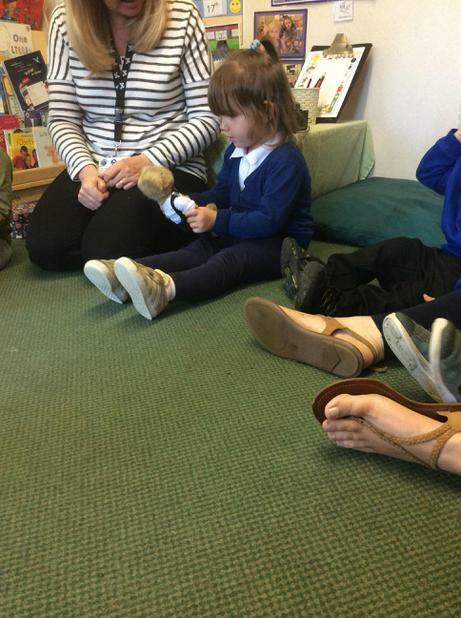 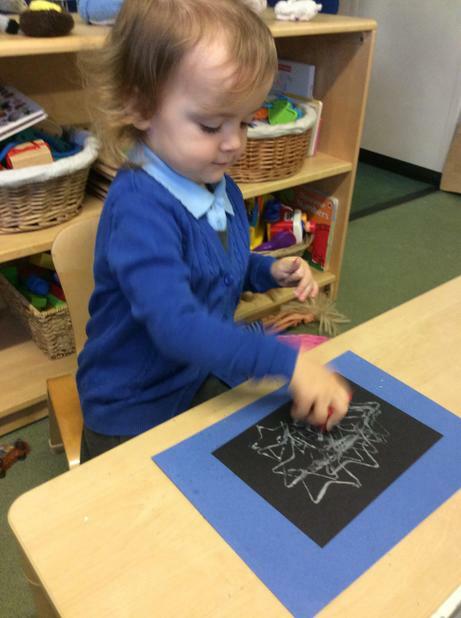 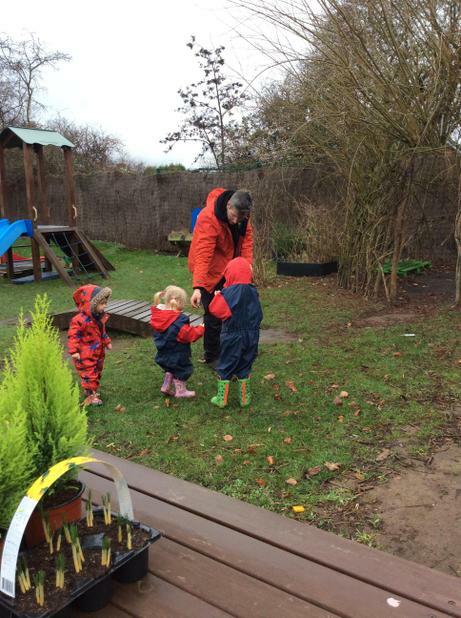 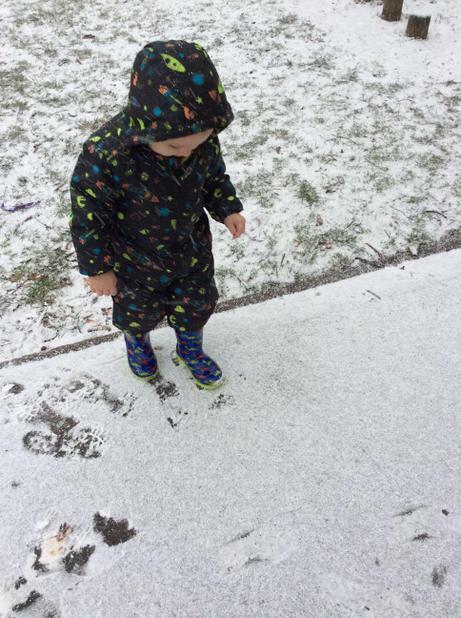 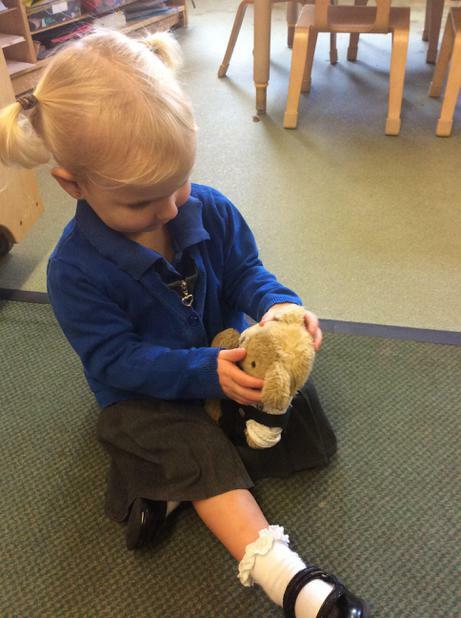 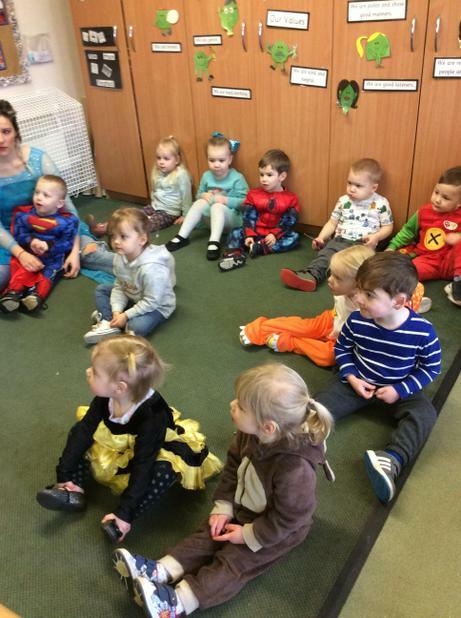 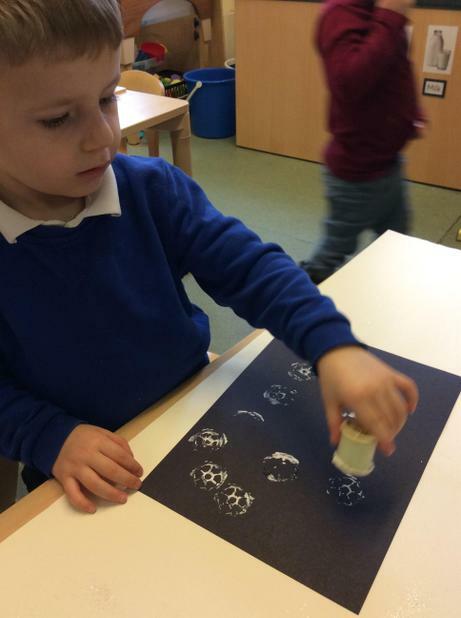 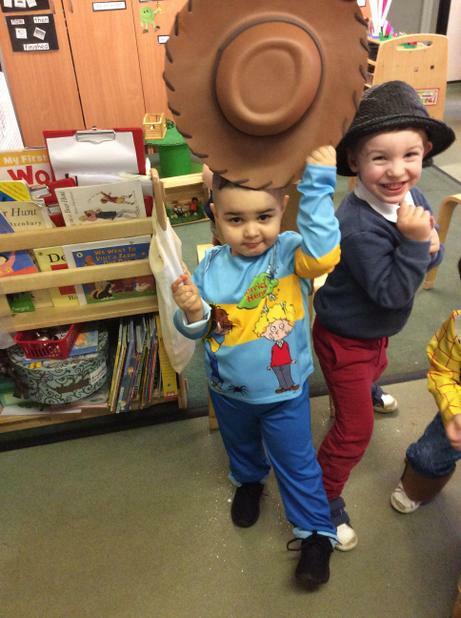 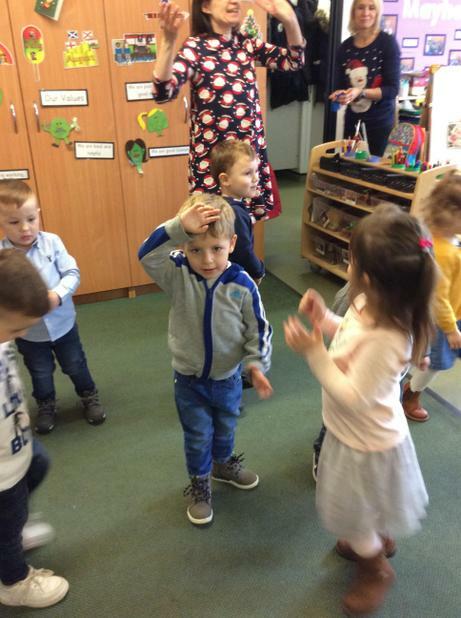 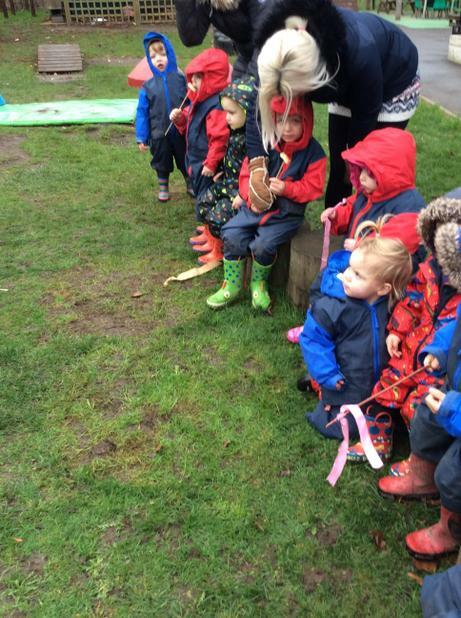 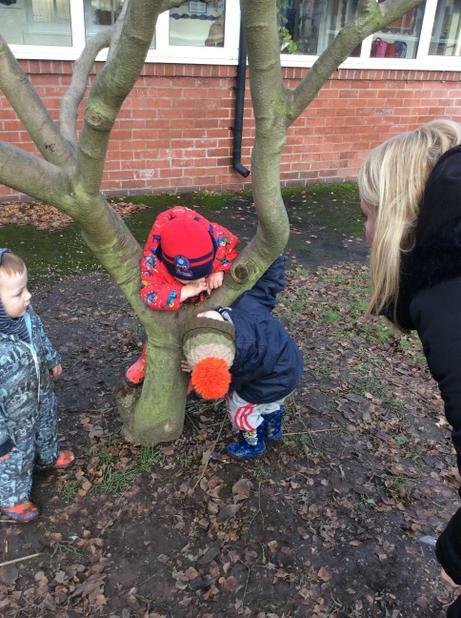 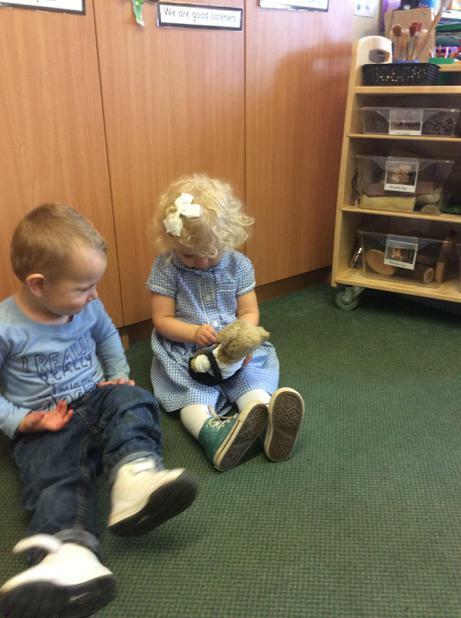 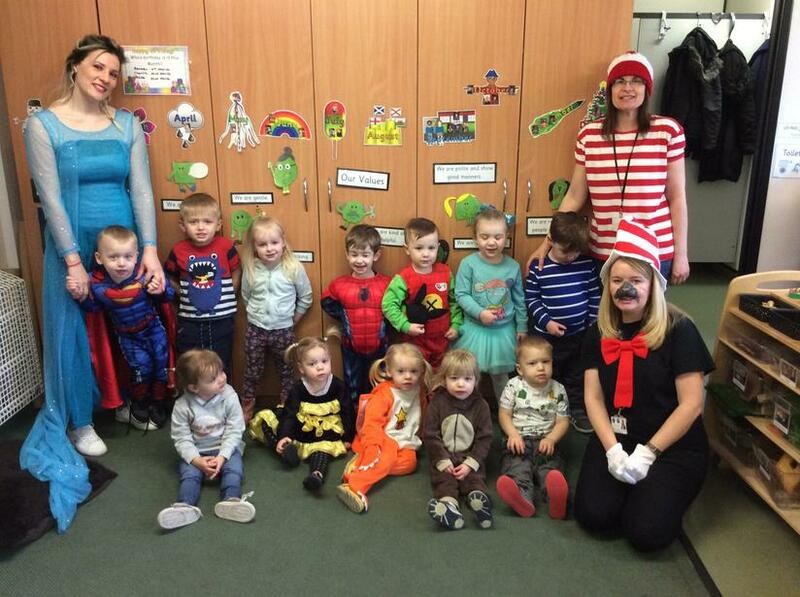 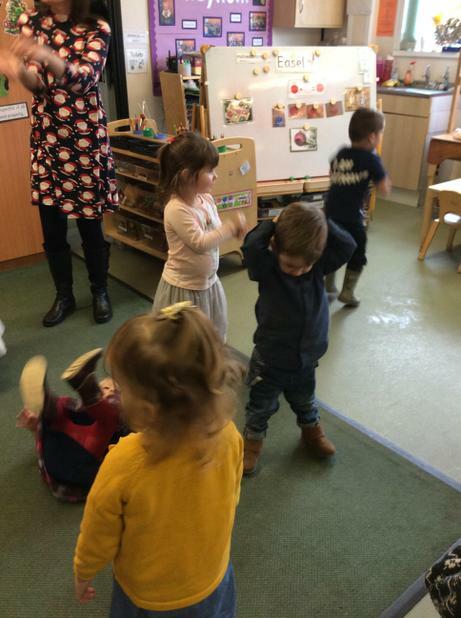 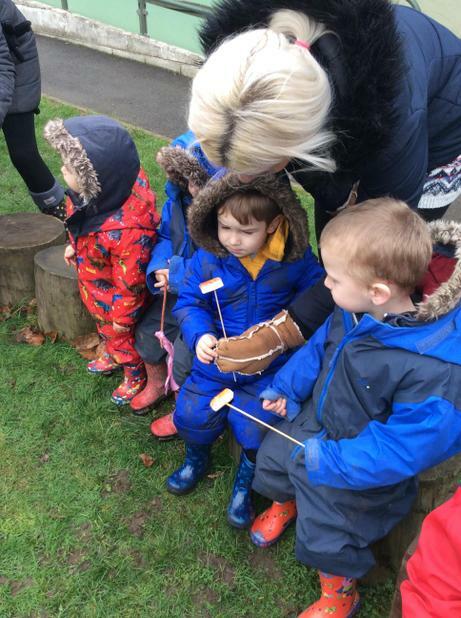 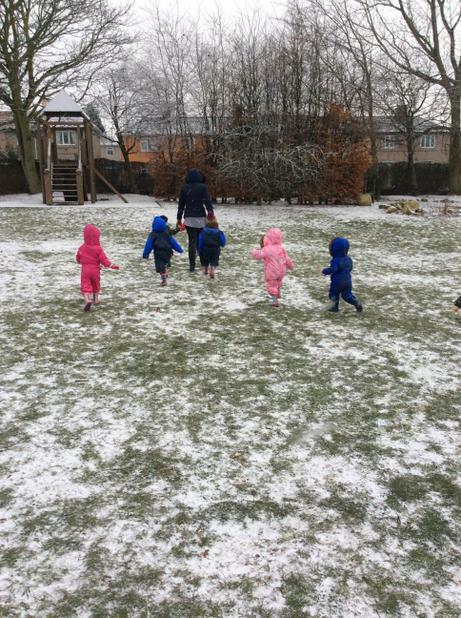 Smarties children went on a Bear hunt this week following on from our story. 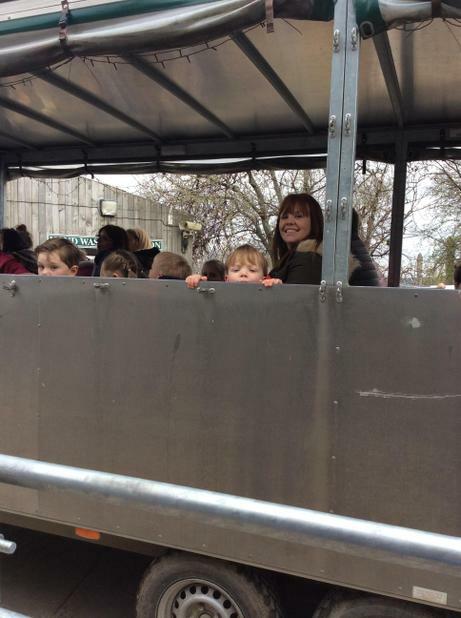 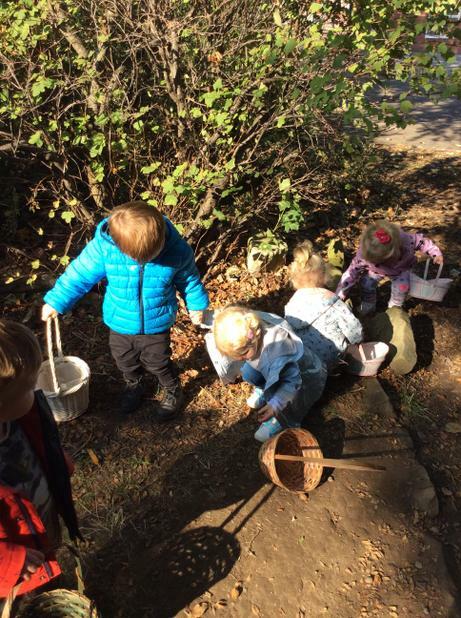 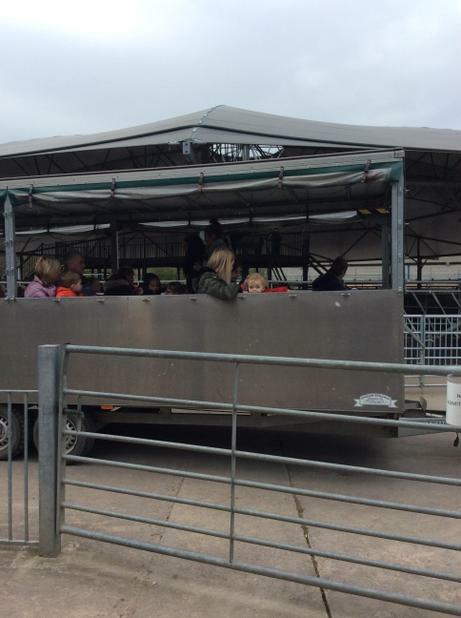 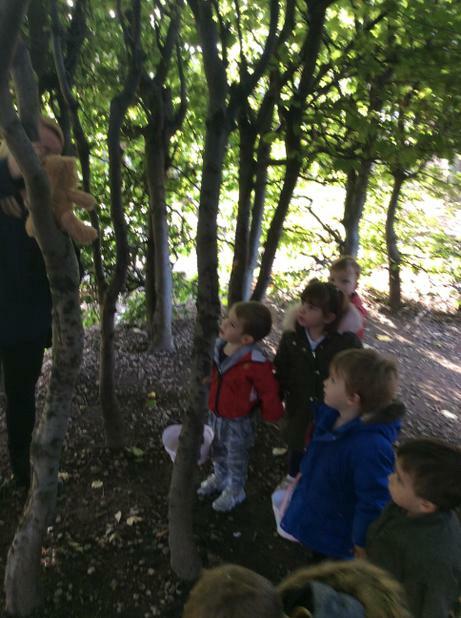 The children enjoyed going into the woods looking for the Bear . 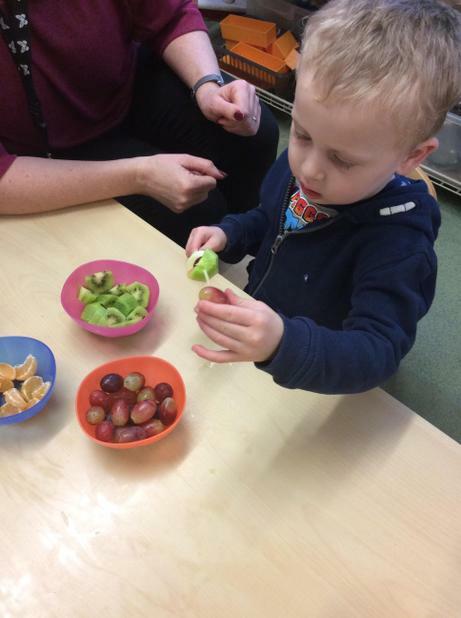 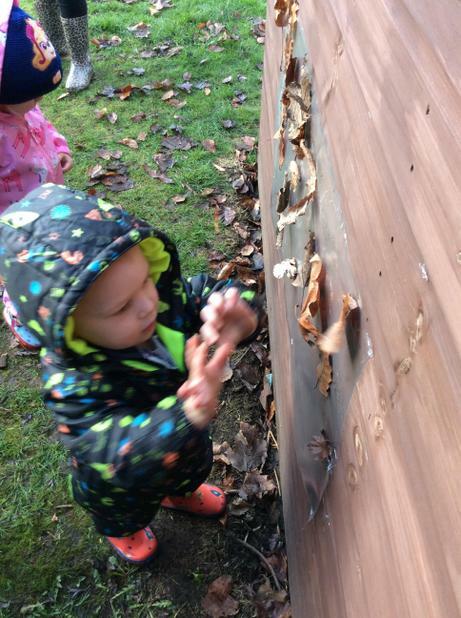 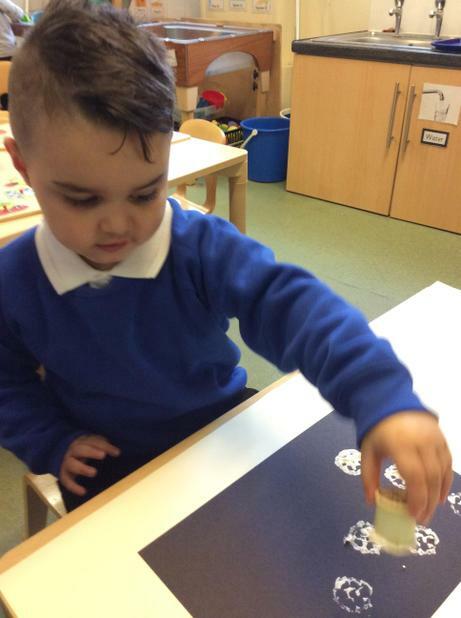 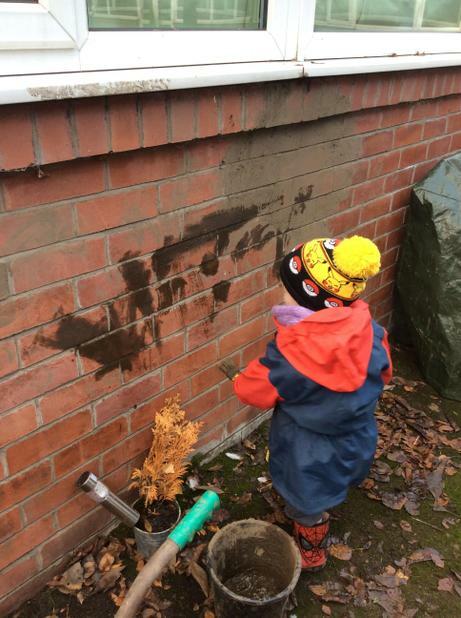 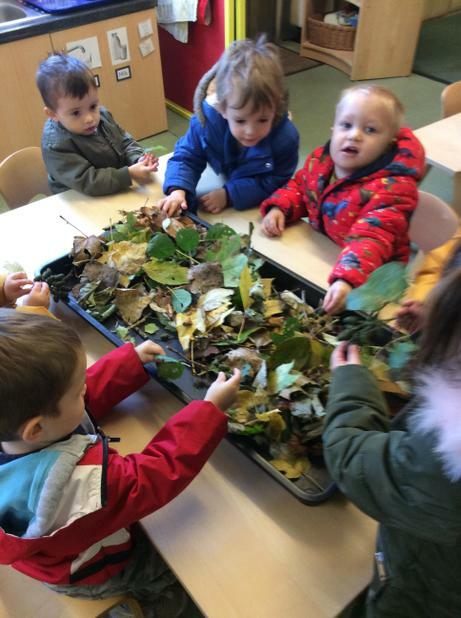 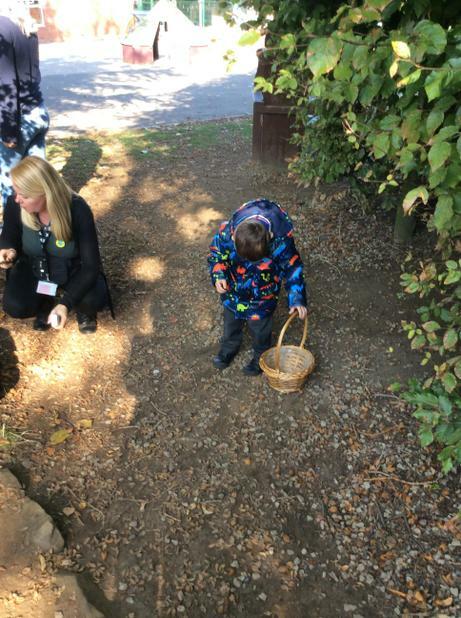 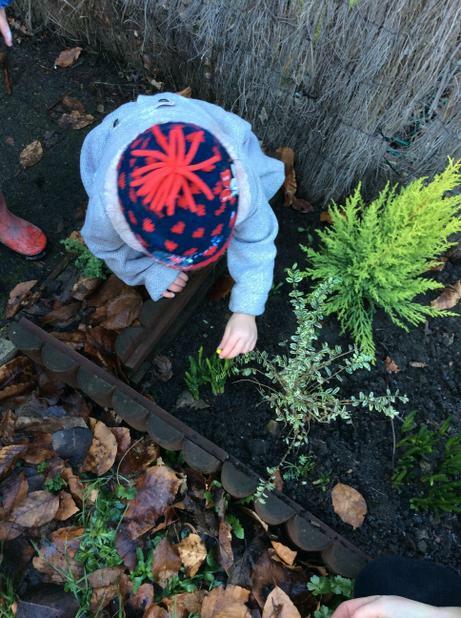 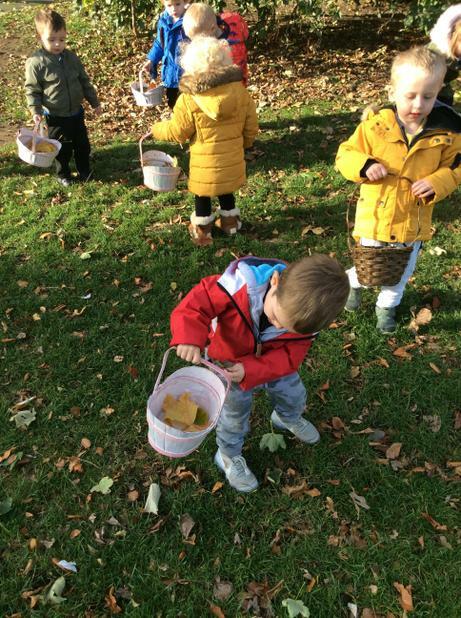 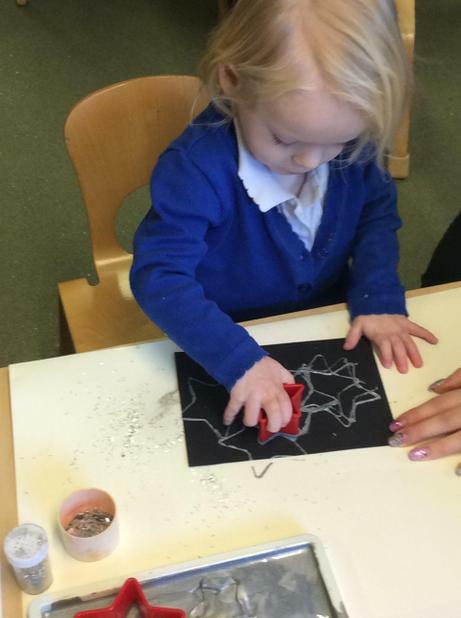 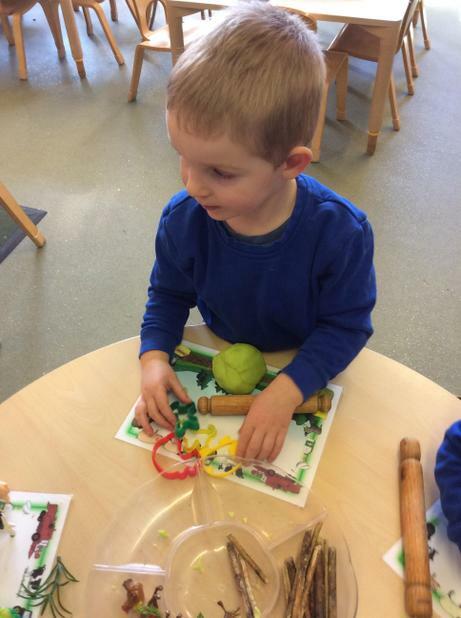 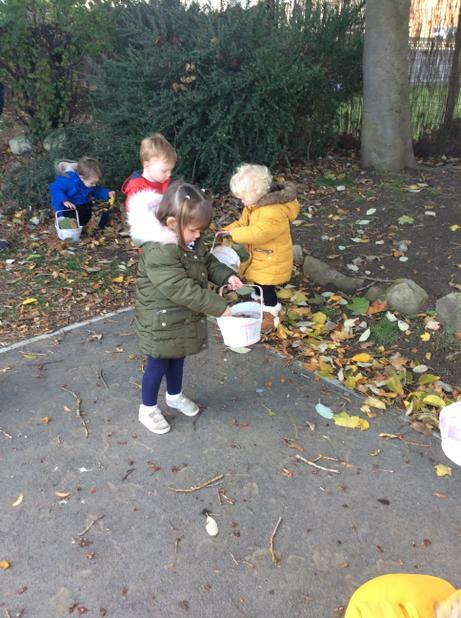 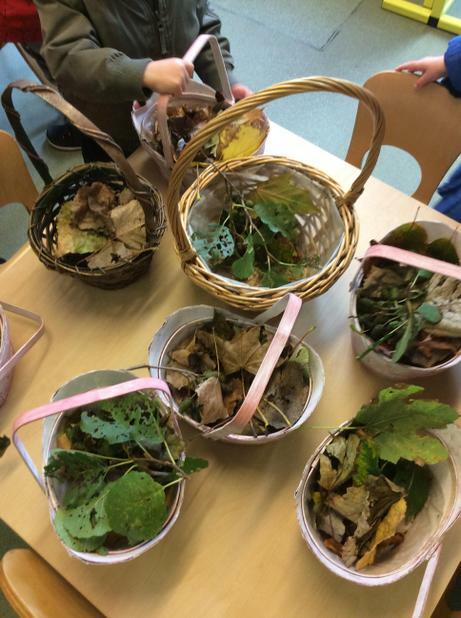 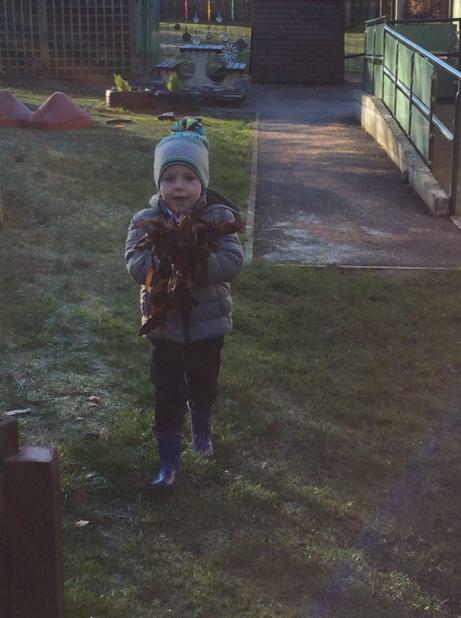 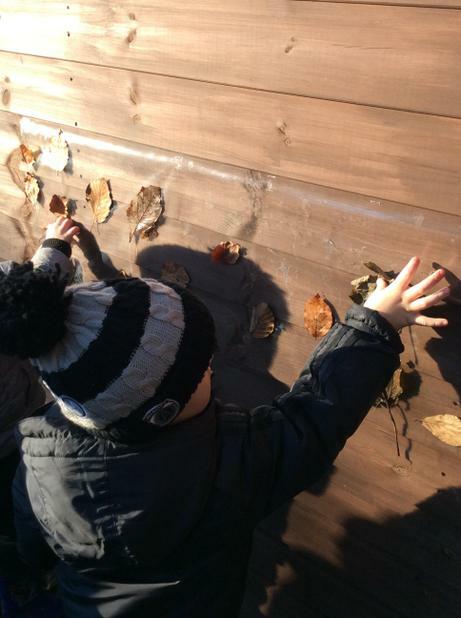 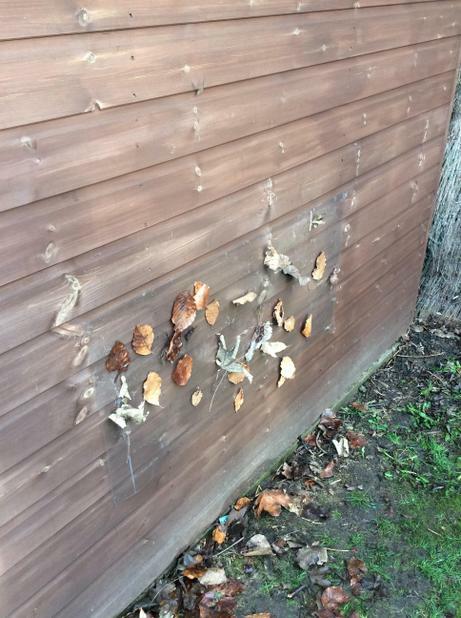 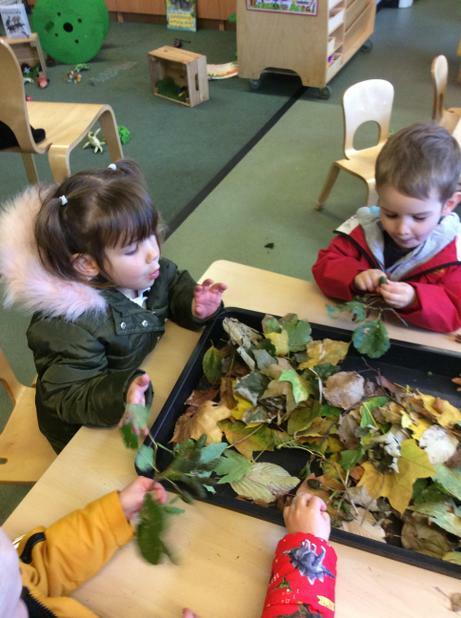 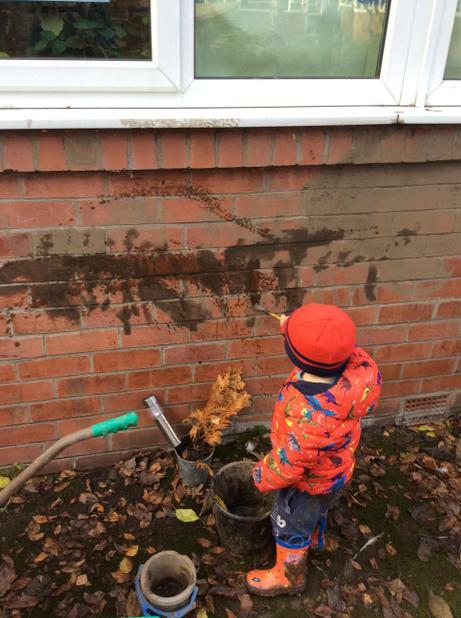 We also collected lots of leaves looking at the different colours, shapes and patterns. 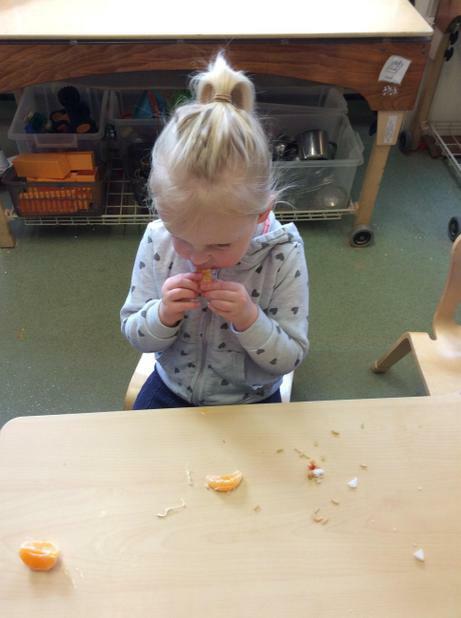 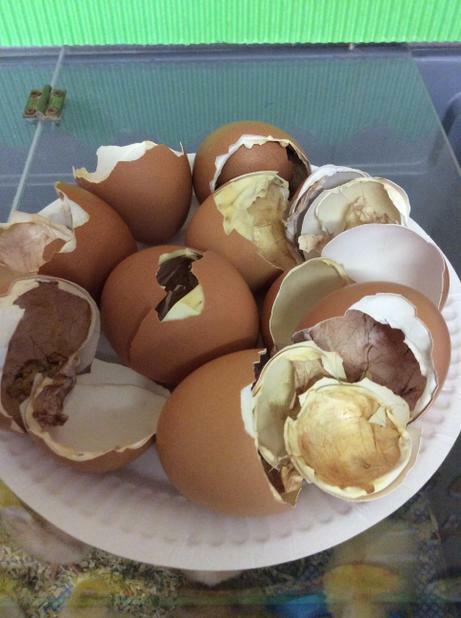 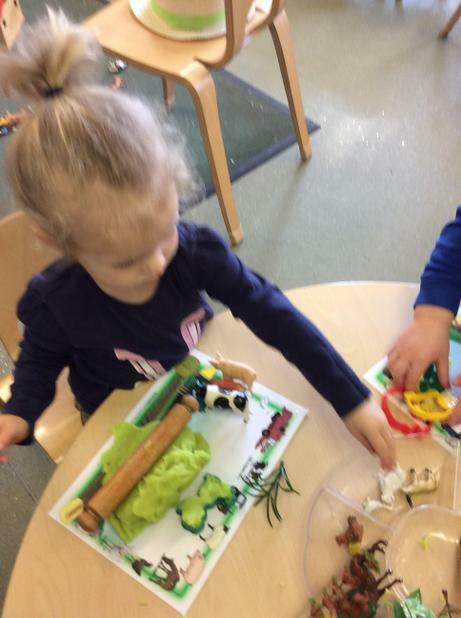 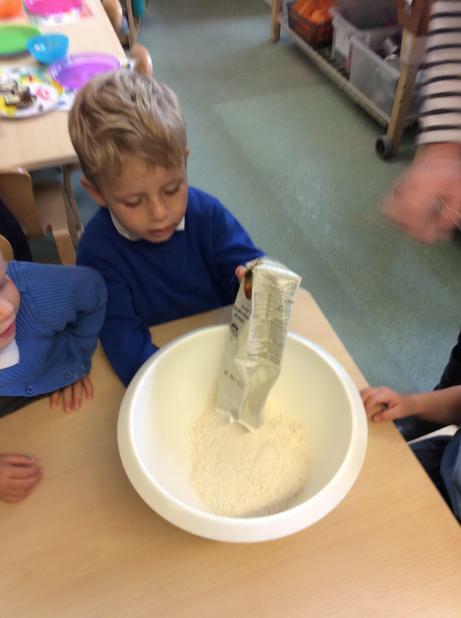 Following on from The Little Red Hen story the children have made their own bread. 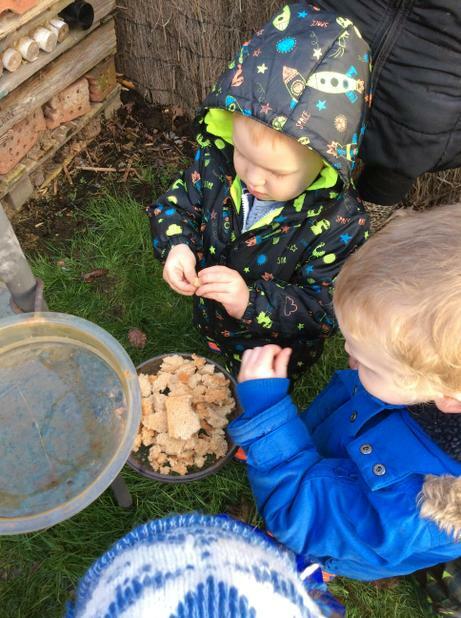 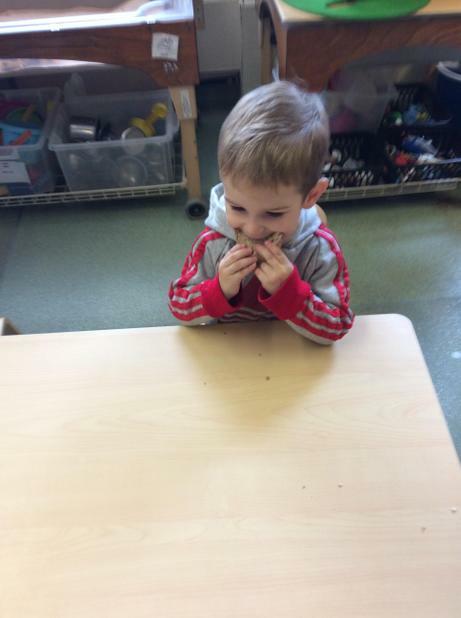 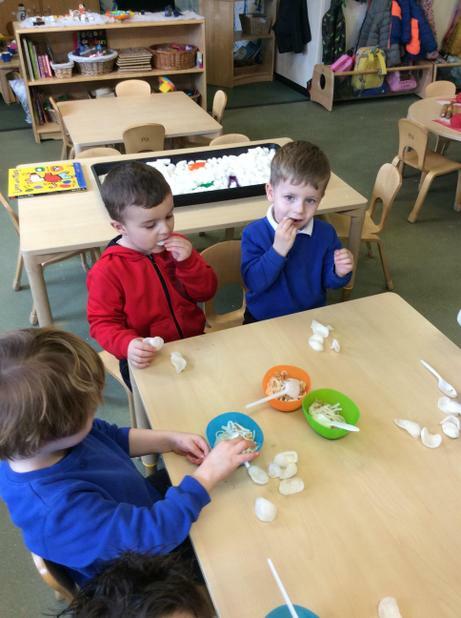 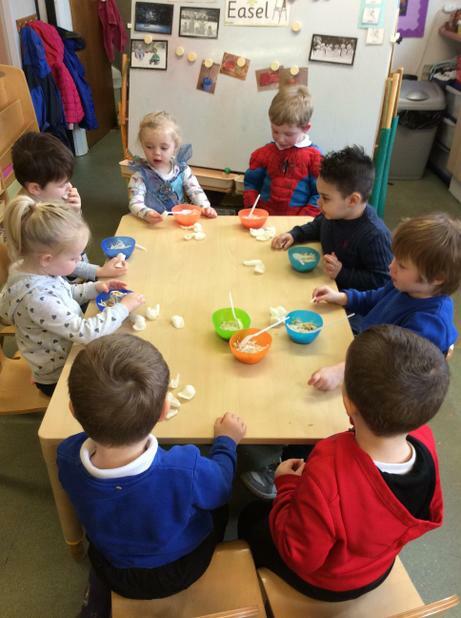 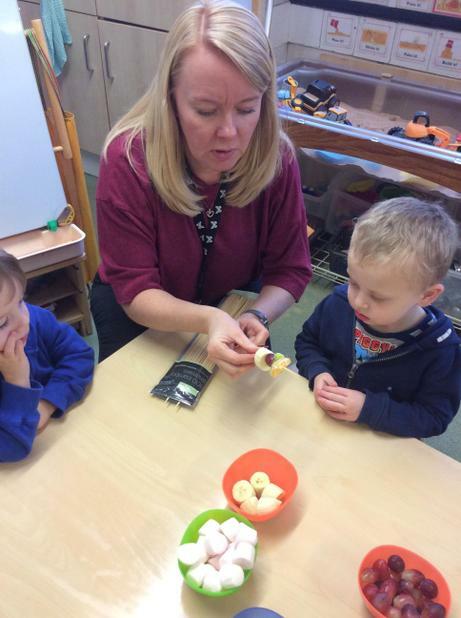 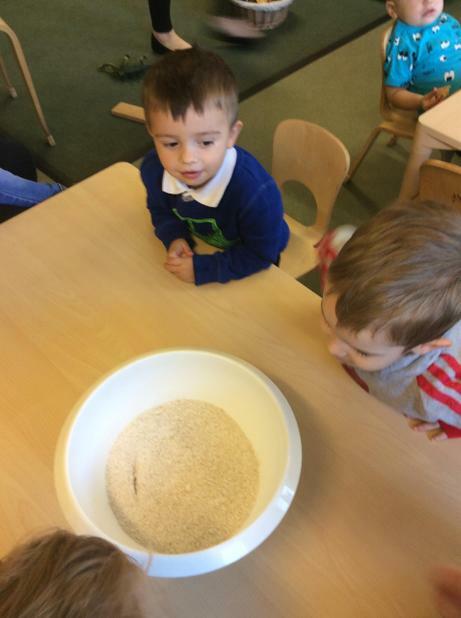 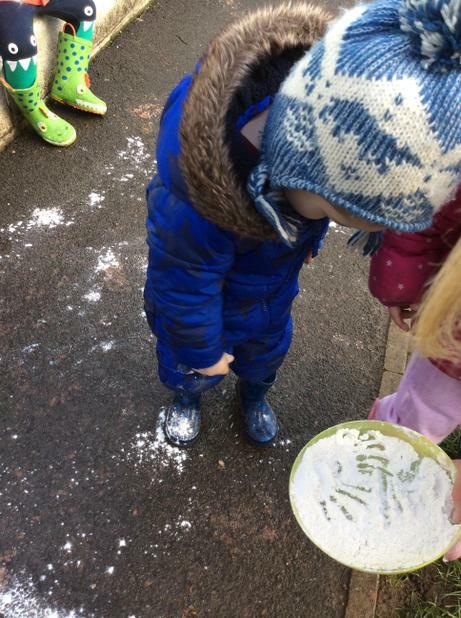 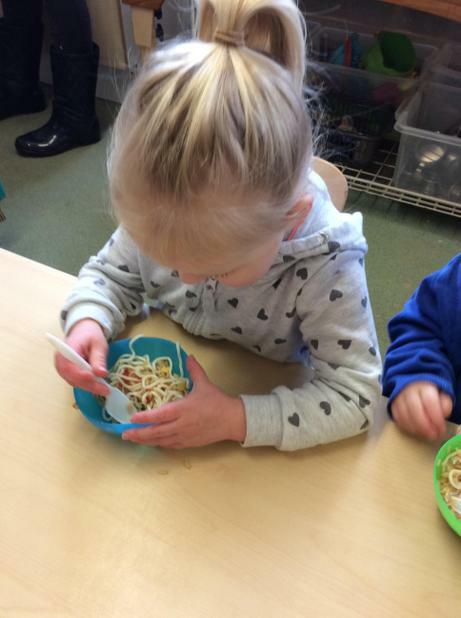 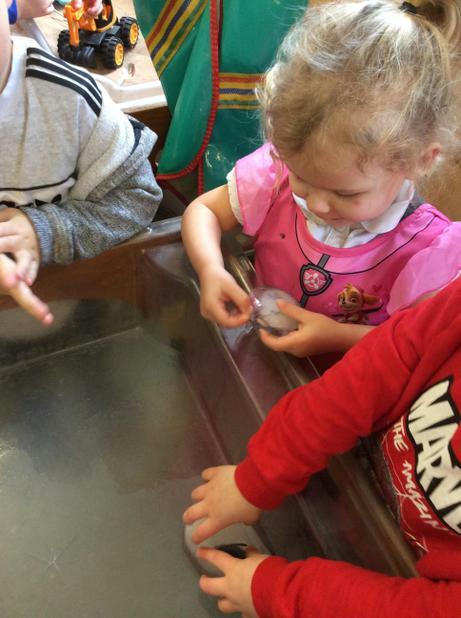 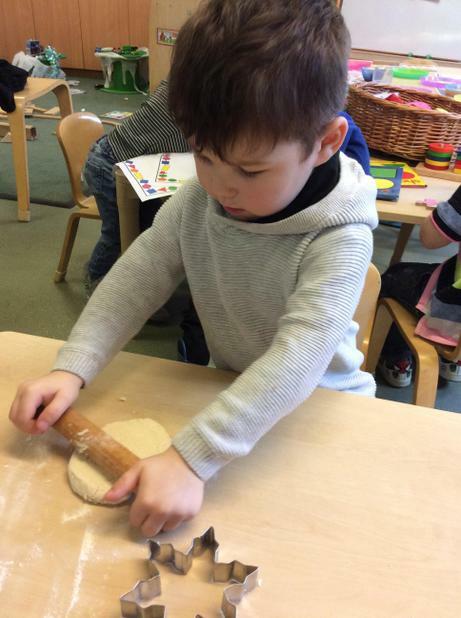 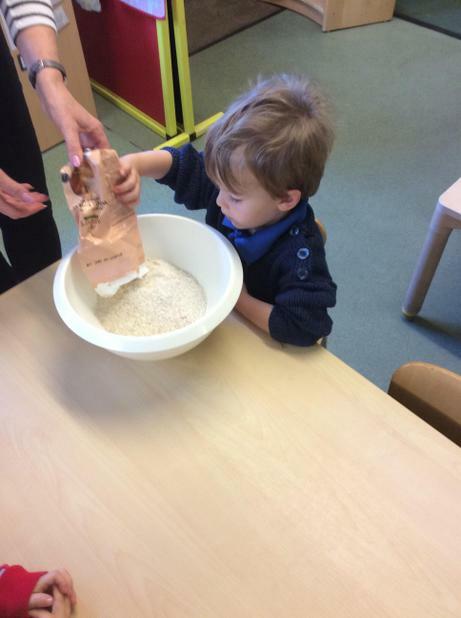 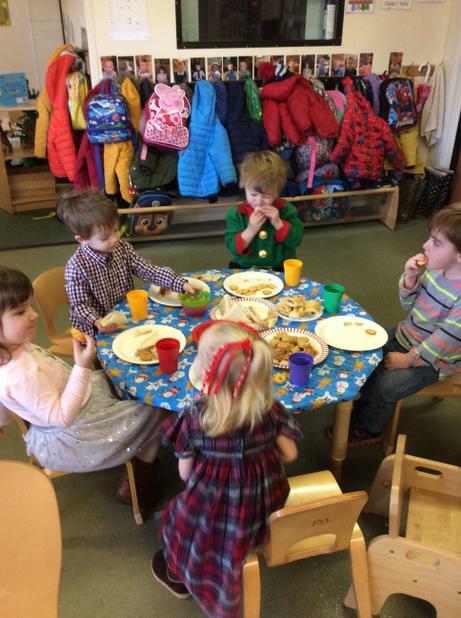 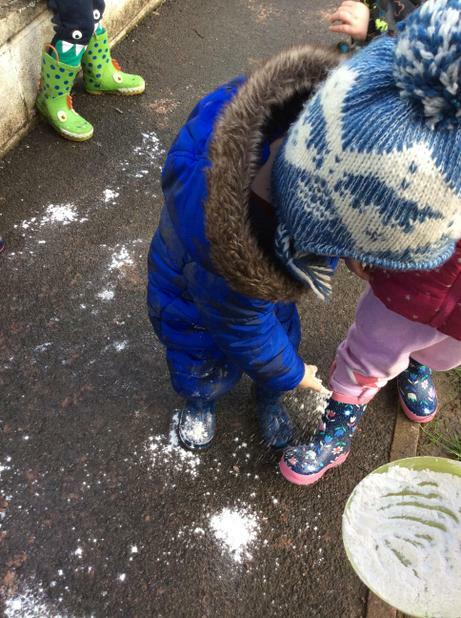 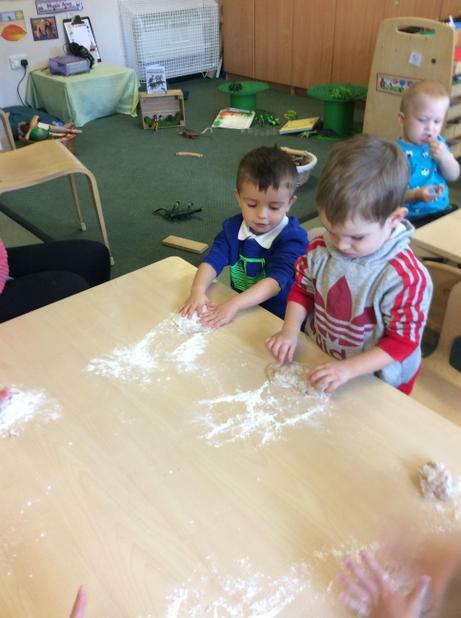 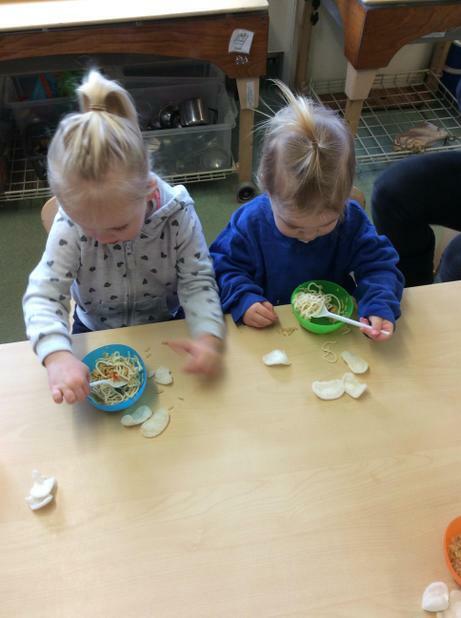 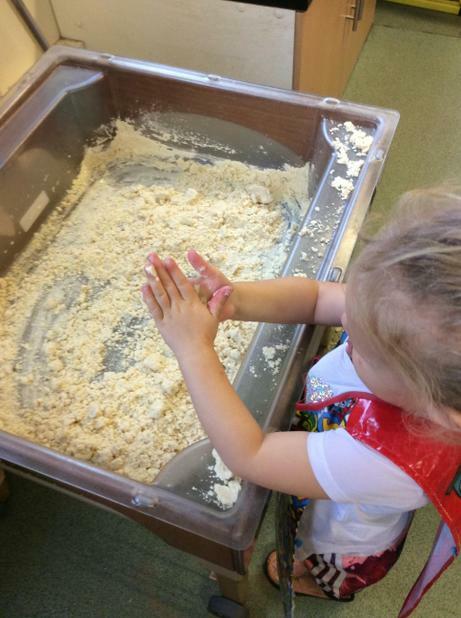 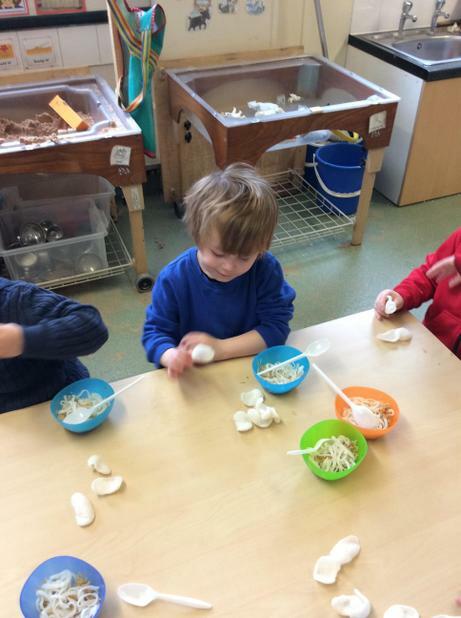 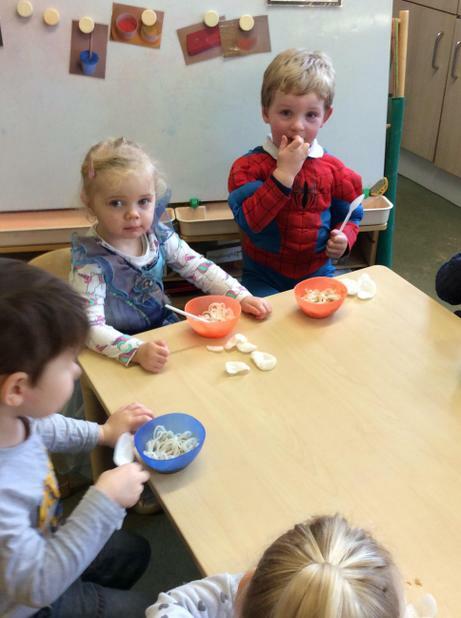 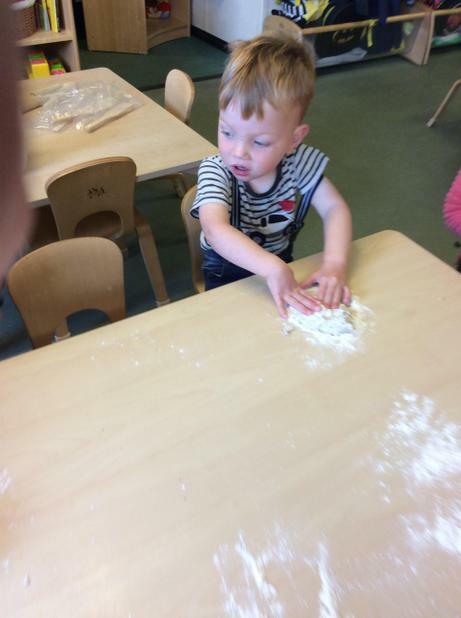 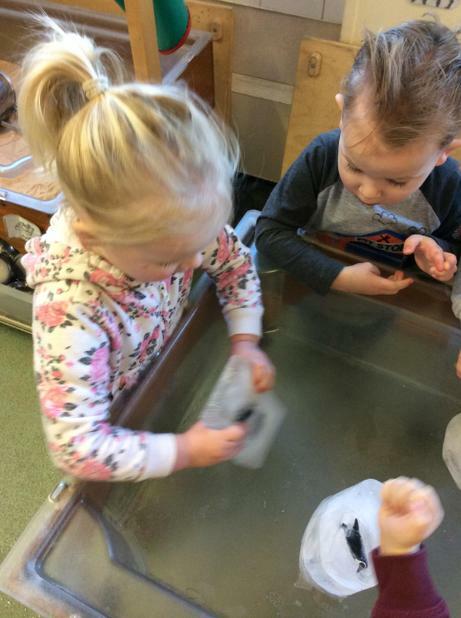 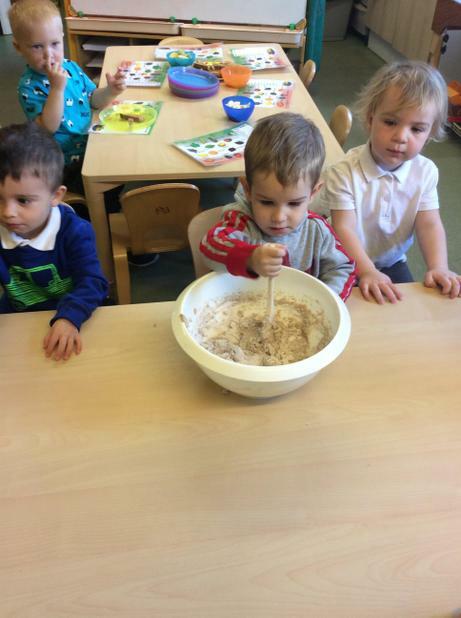 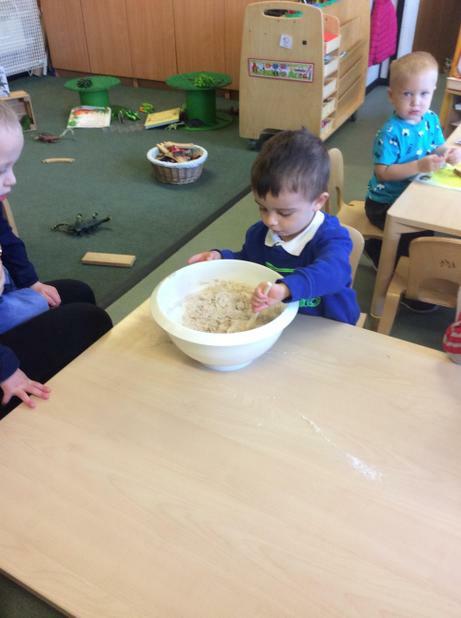 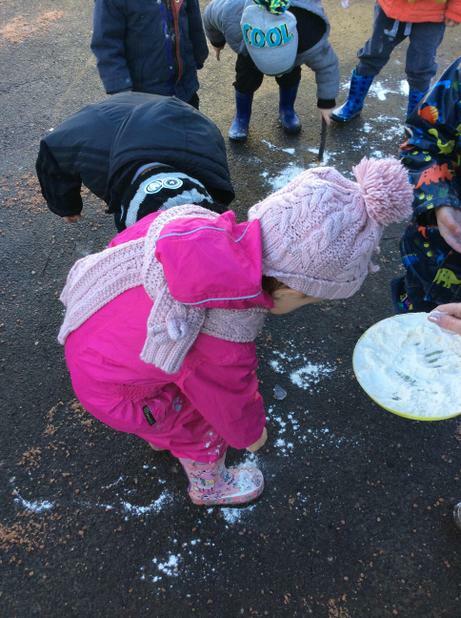 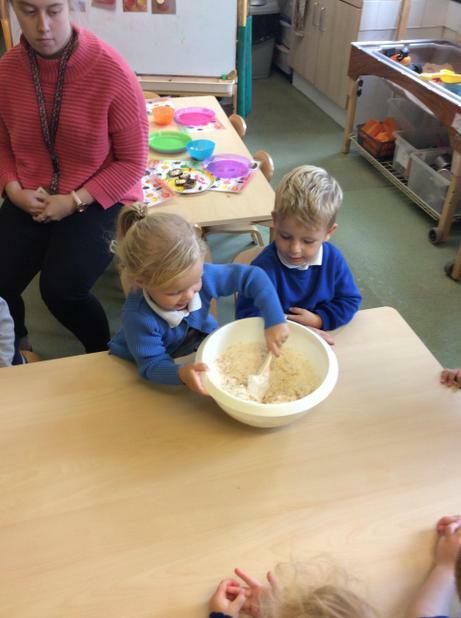 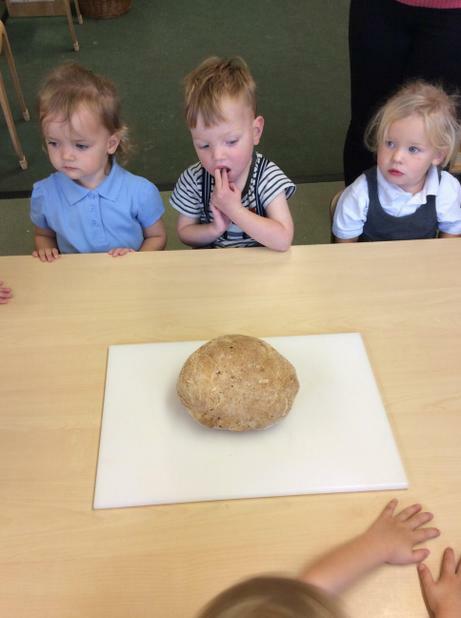 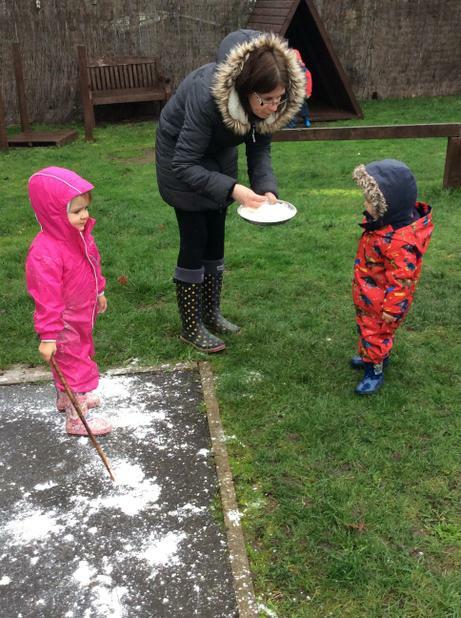 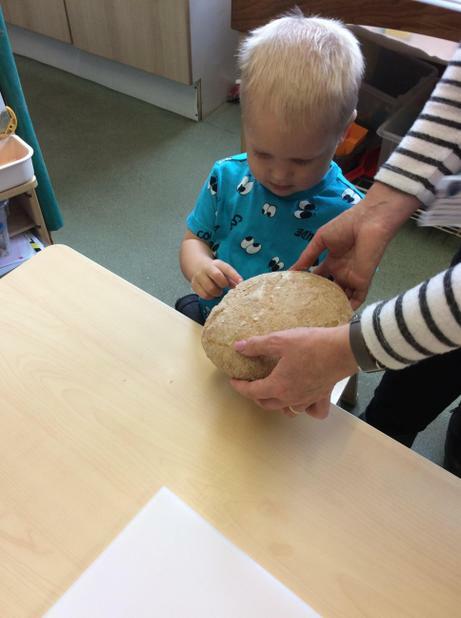 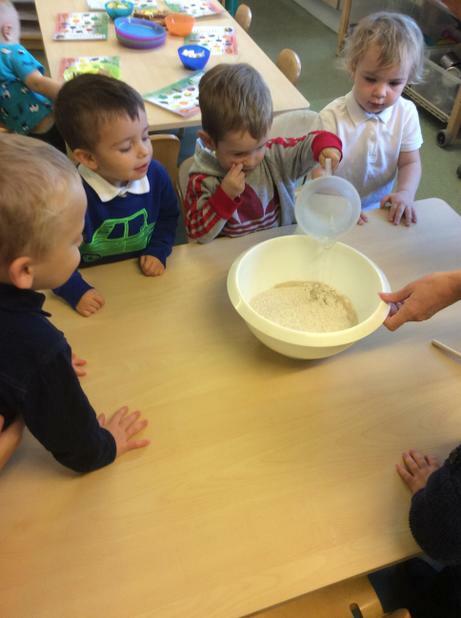 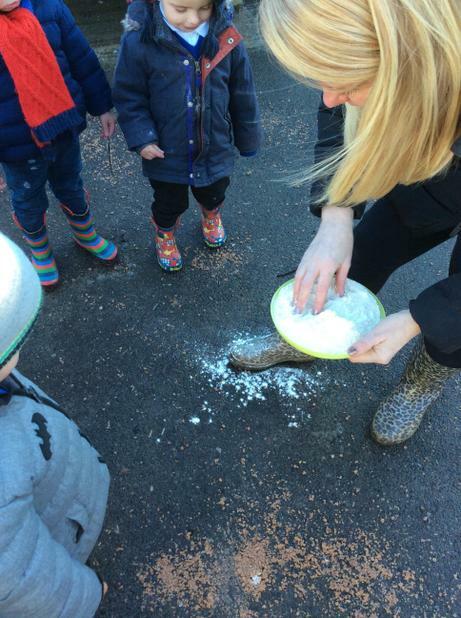 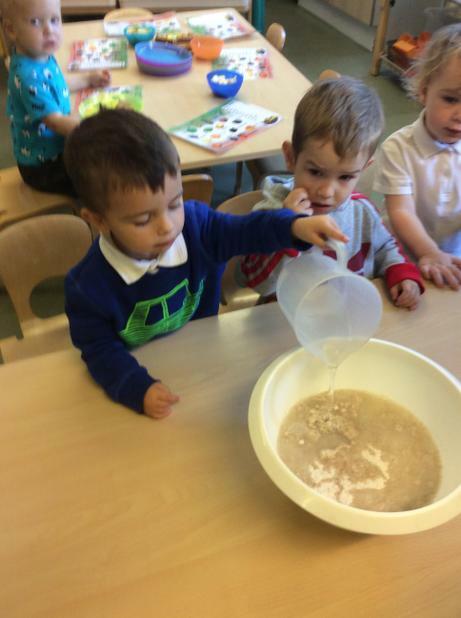 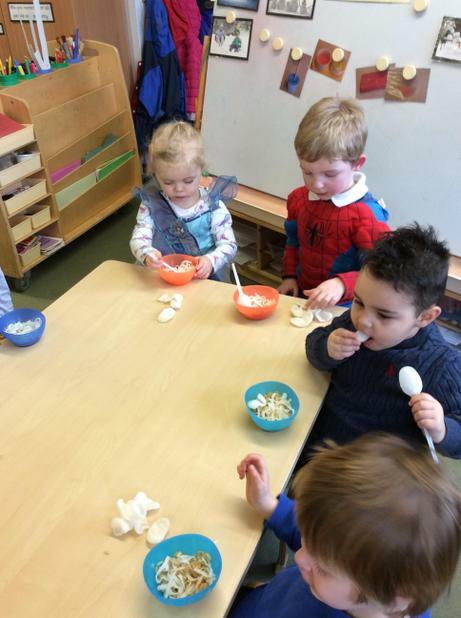 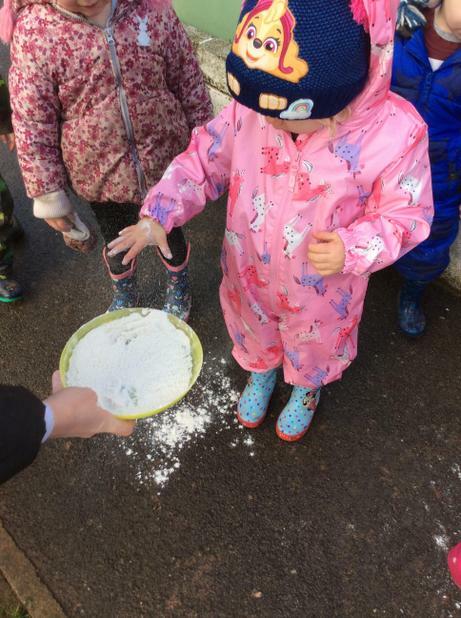 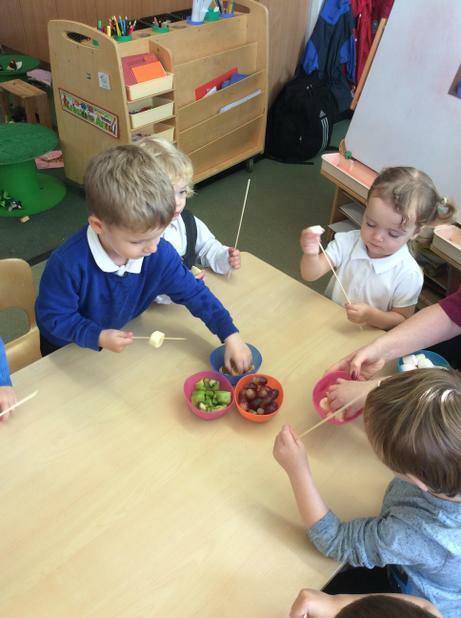 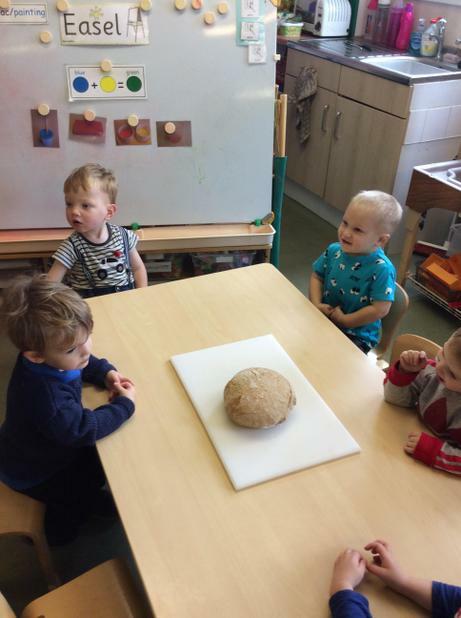 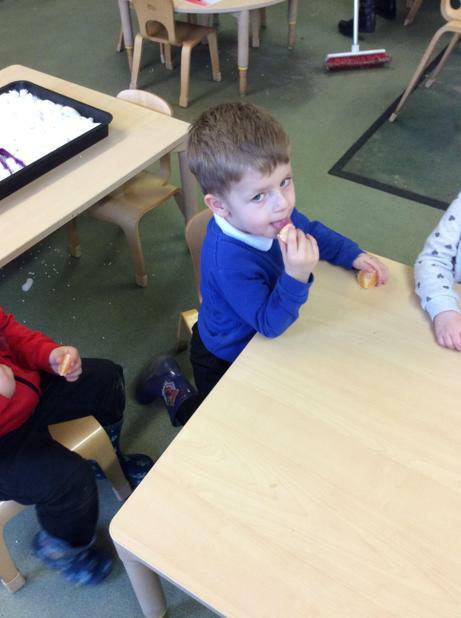 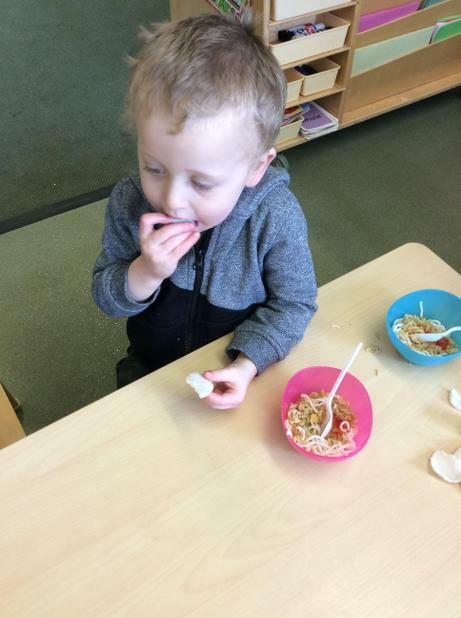 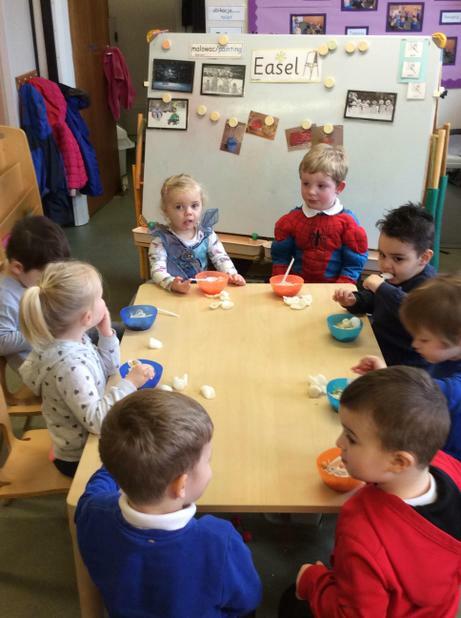 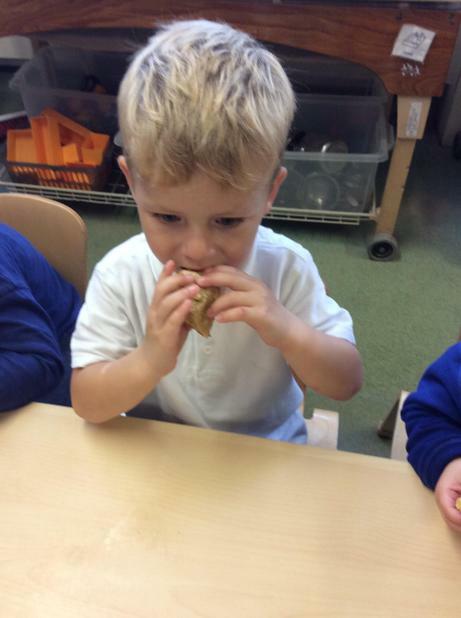 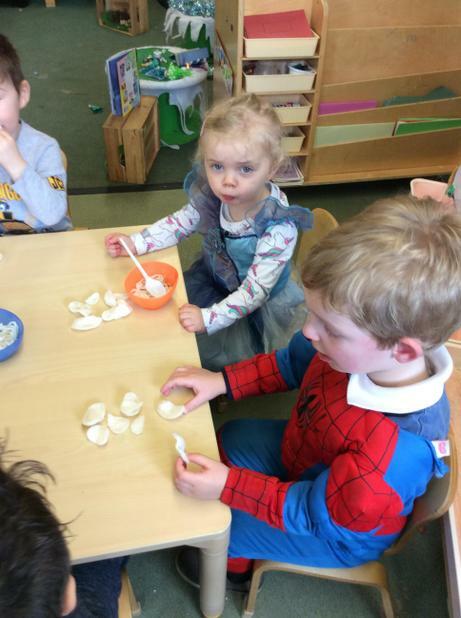 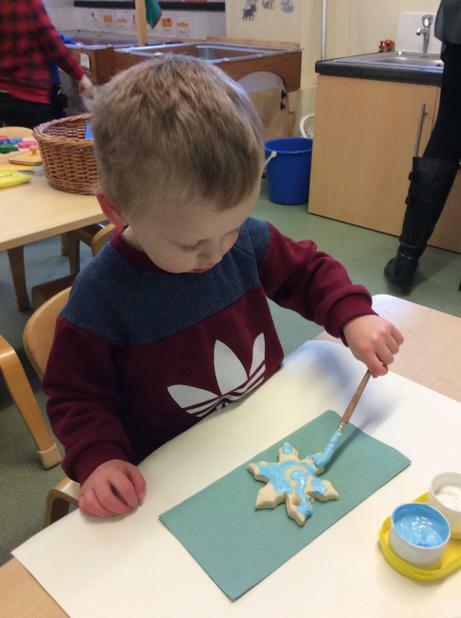 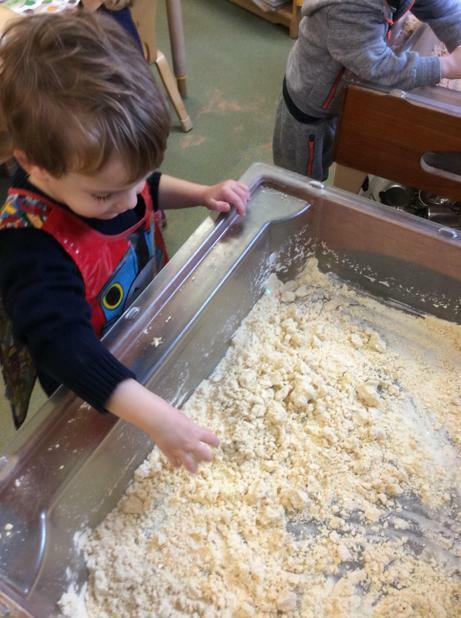 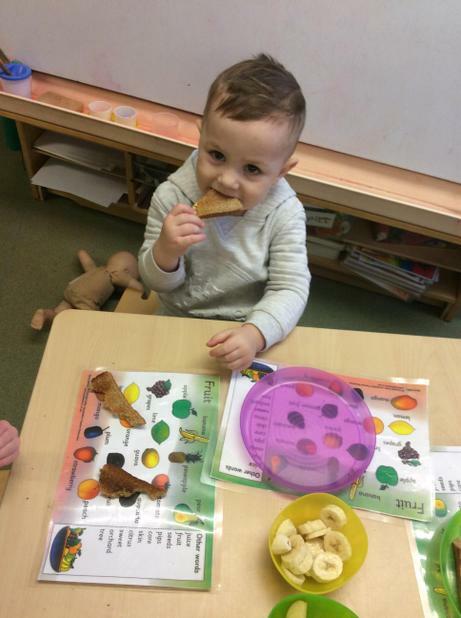 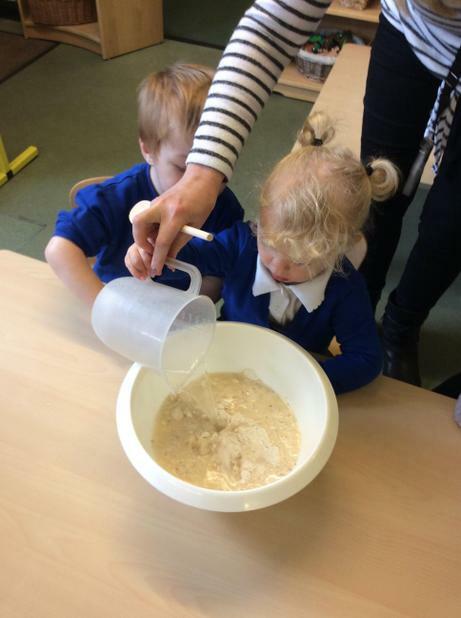 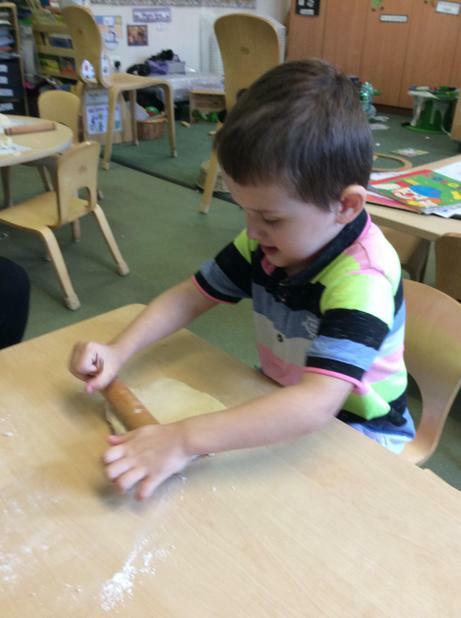 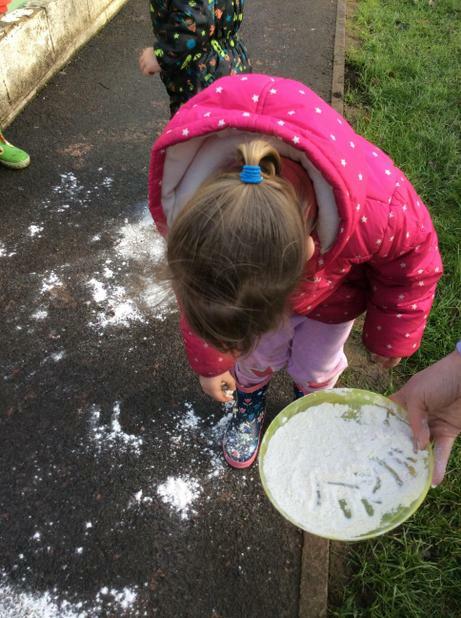 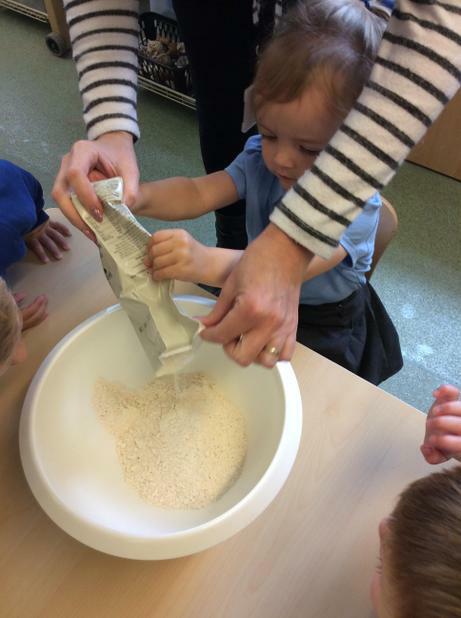 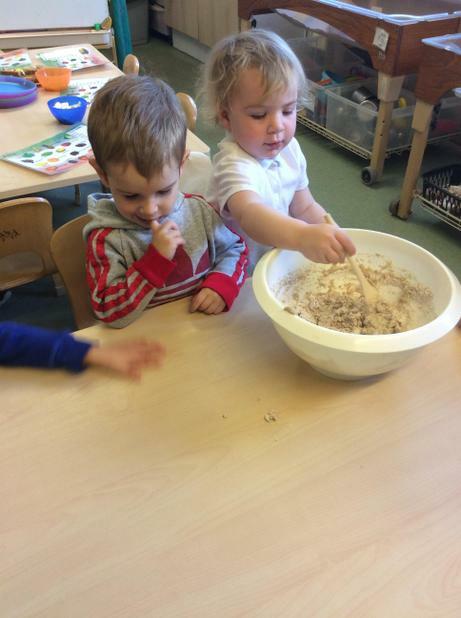 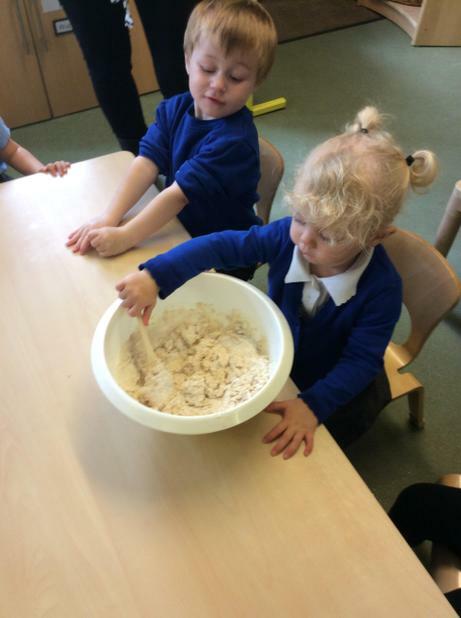 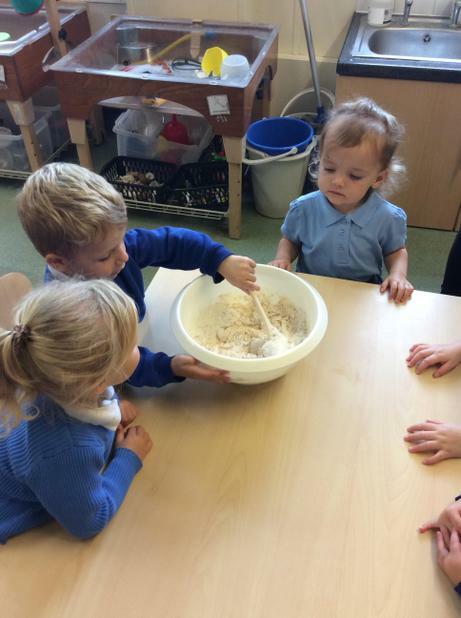 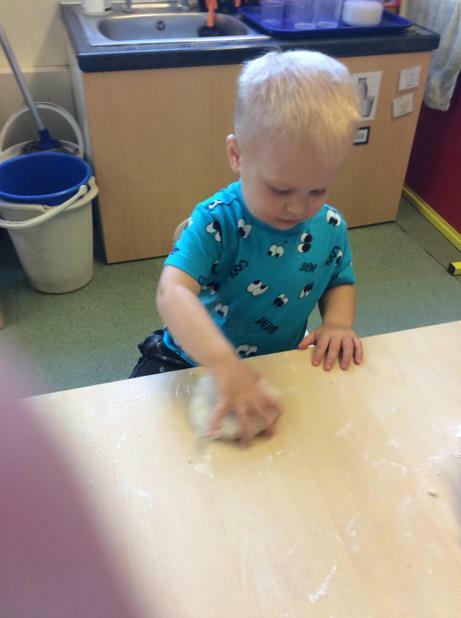 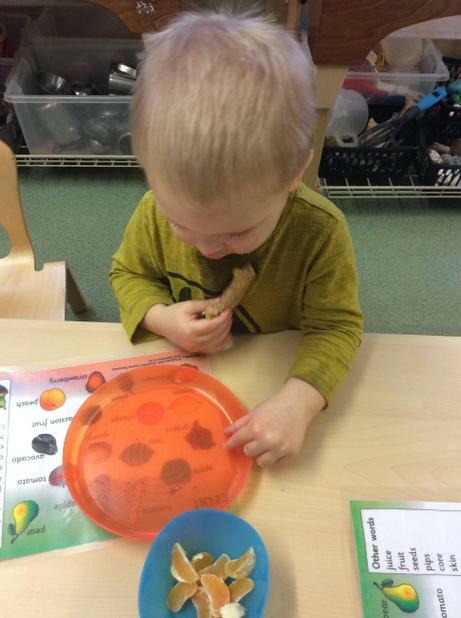 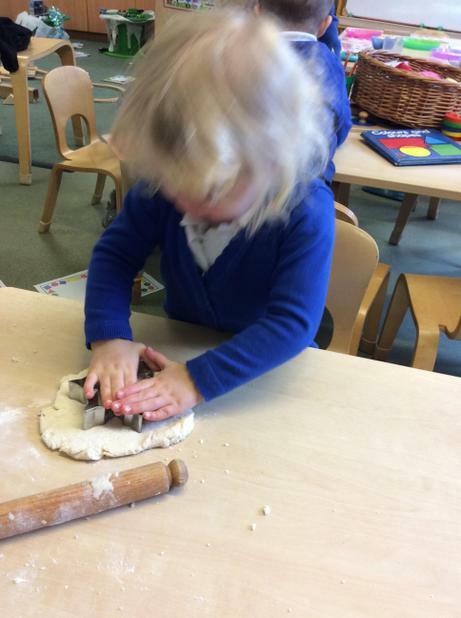 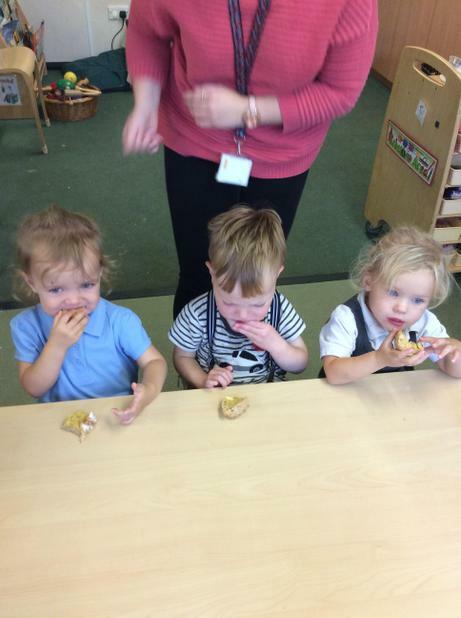 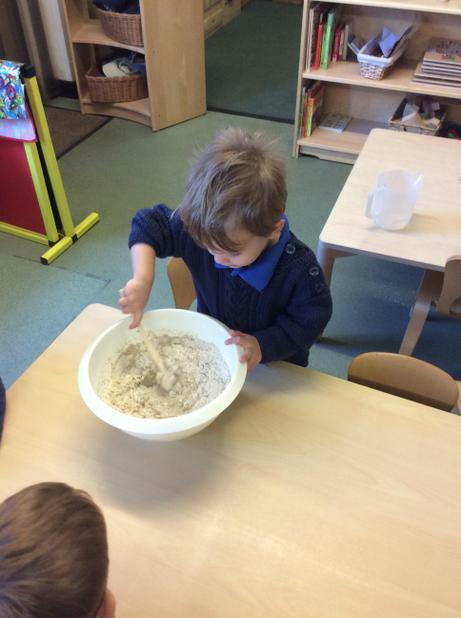 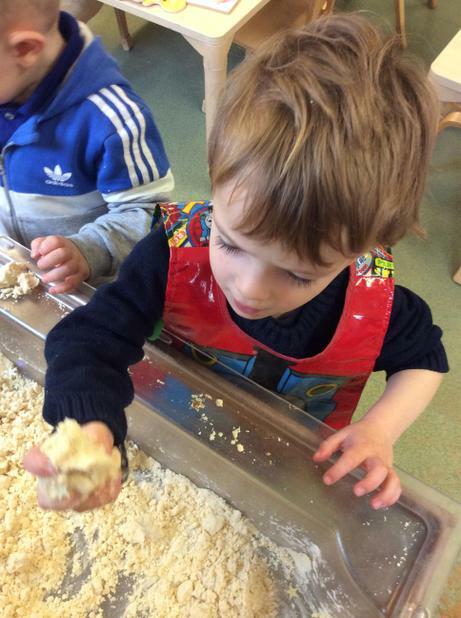 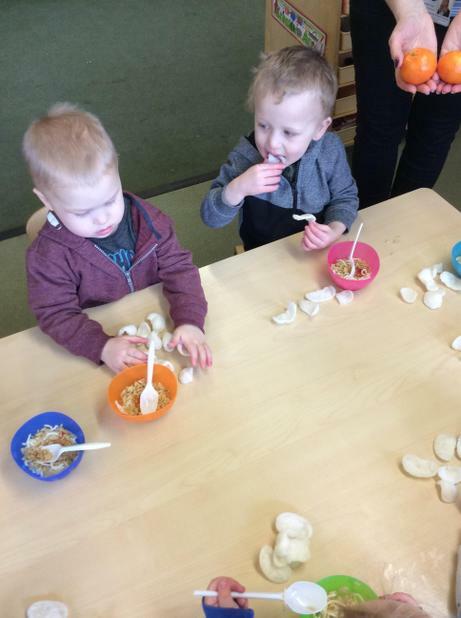 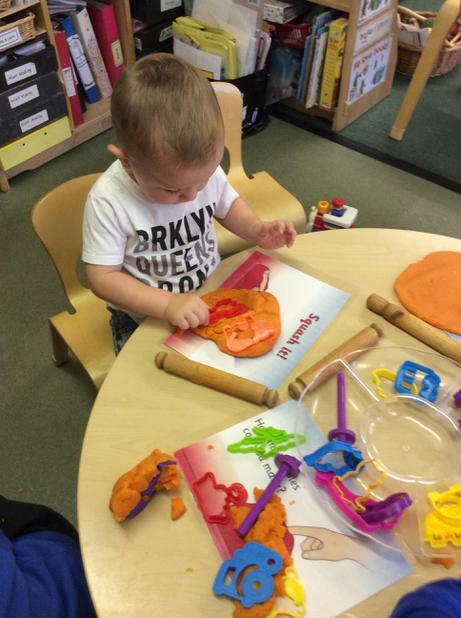 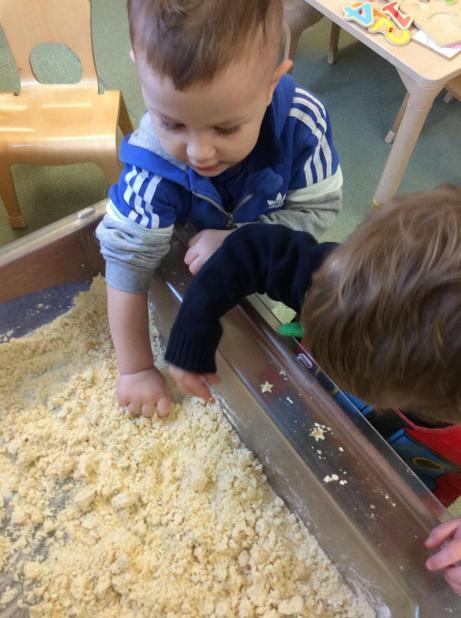 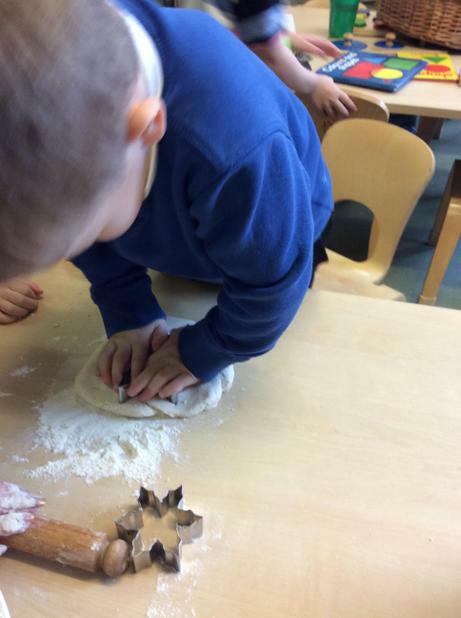 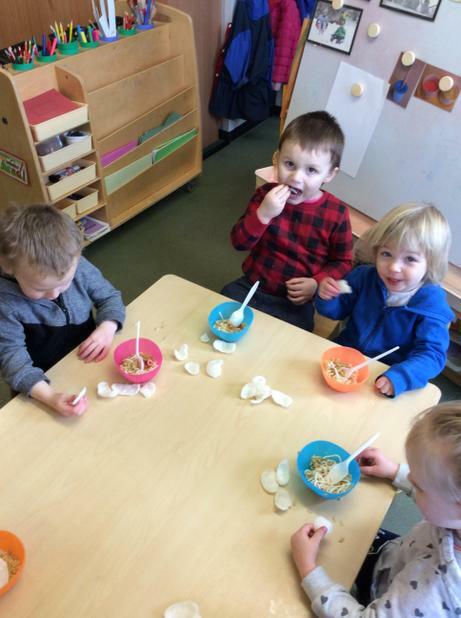 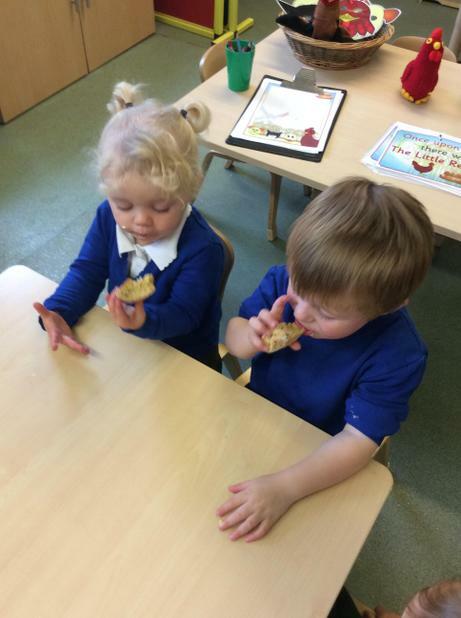 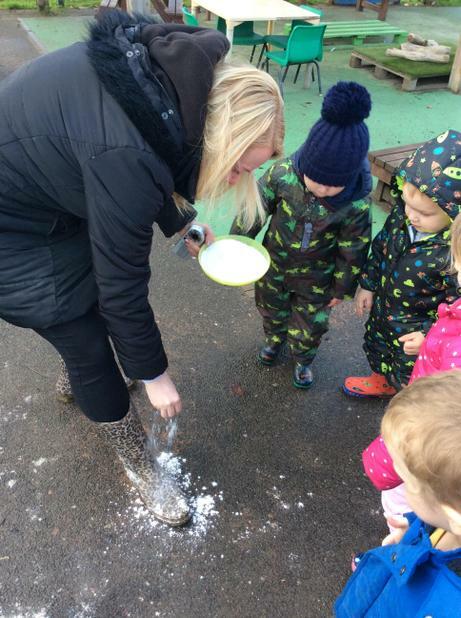 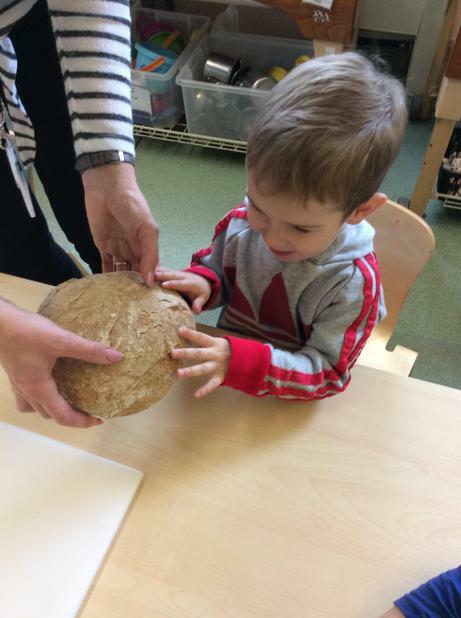 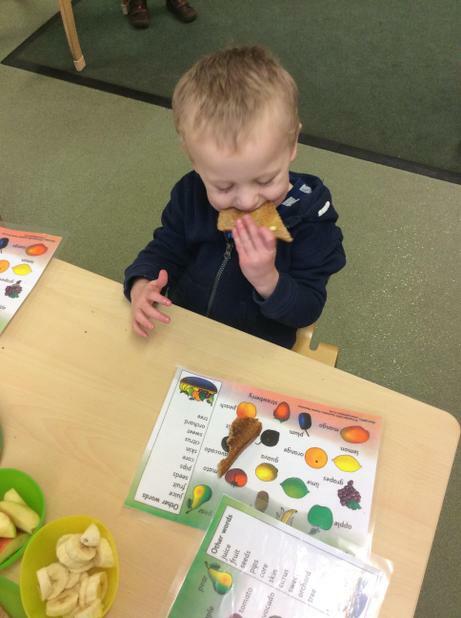 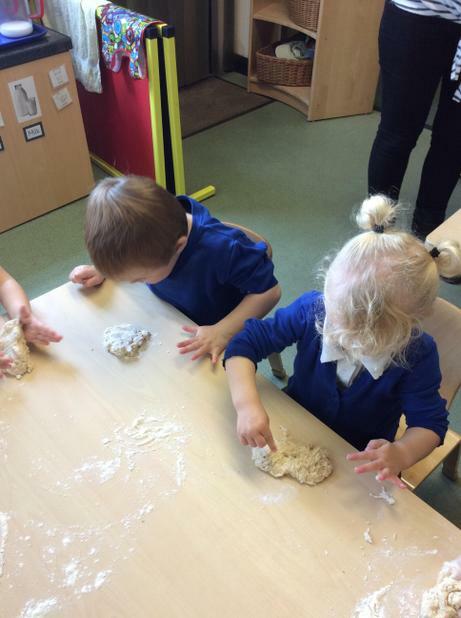 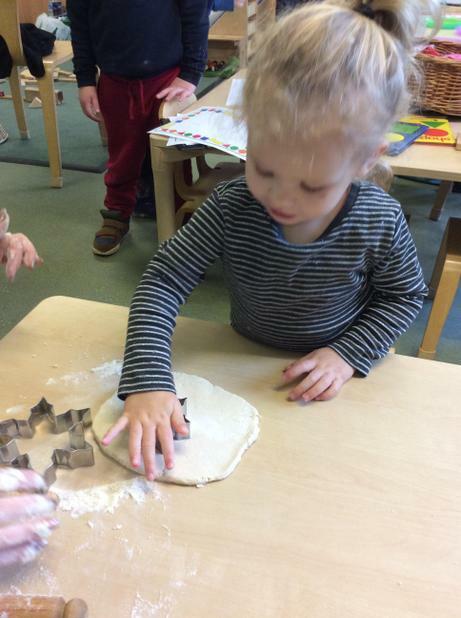 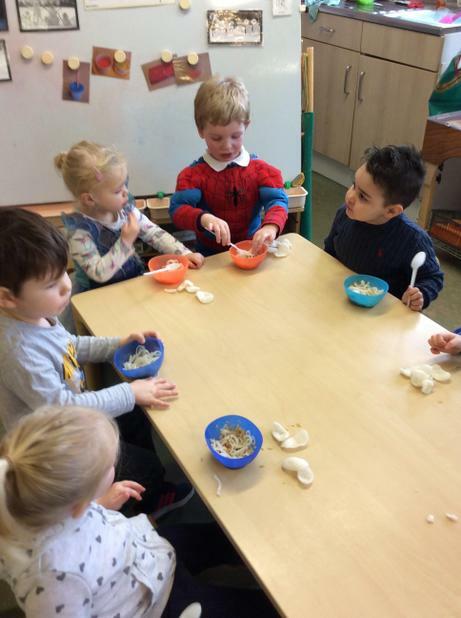 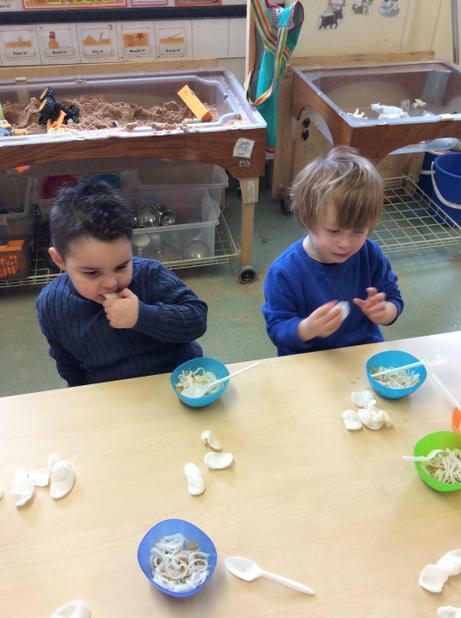 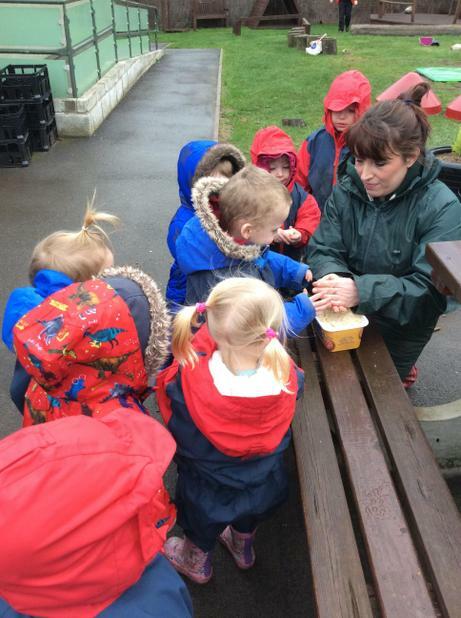 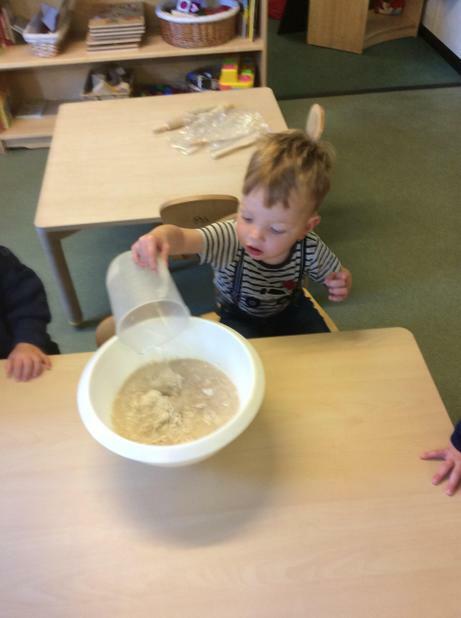 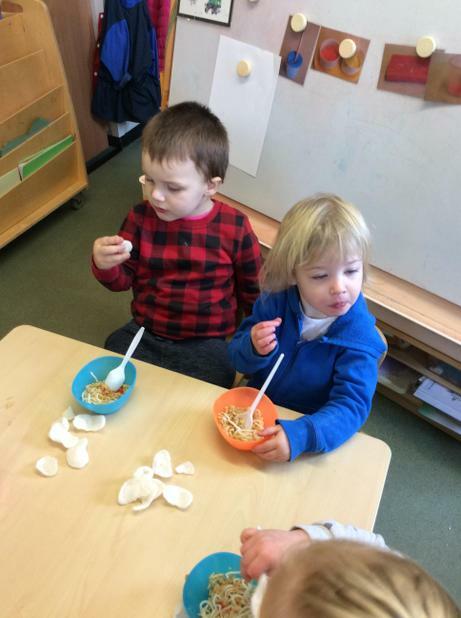 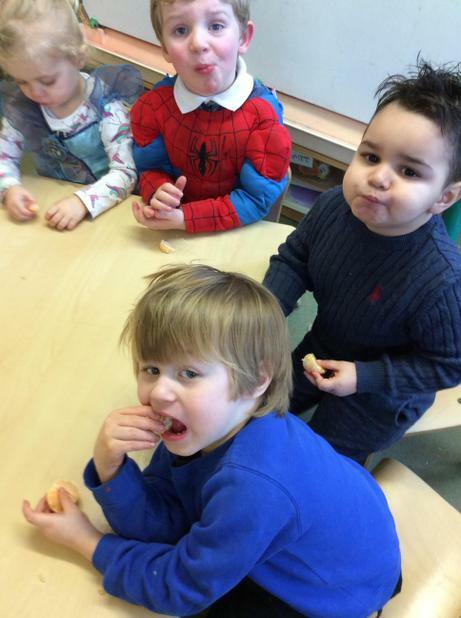 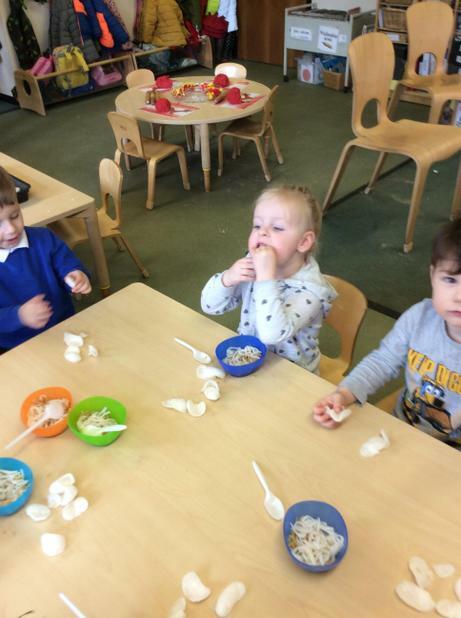 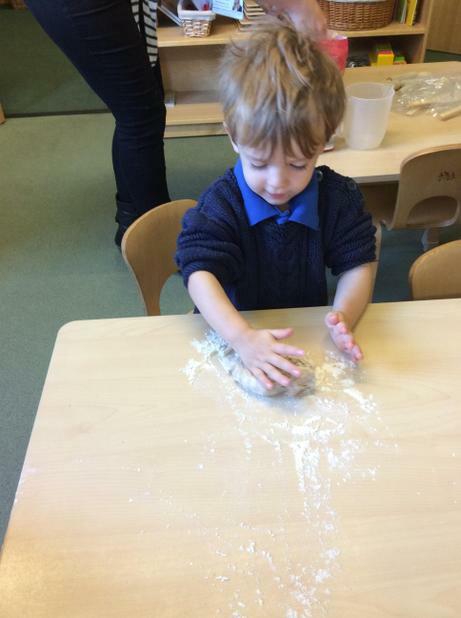 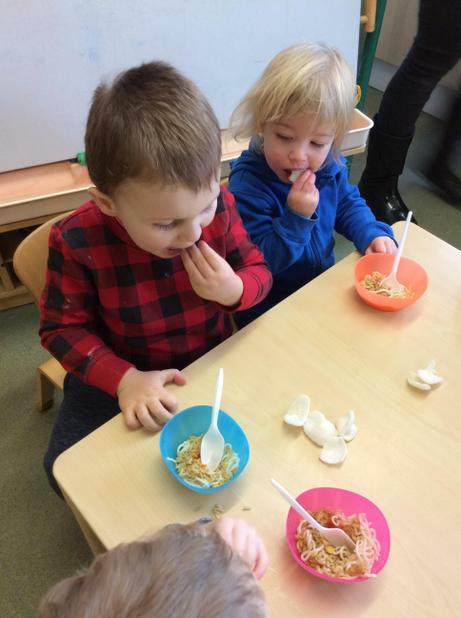 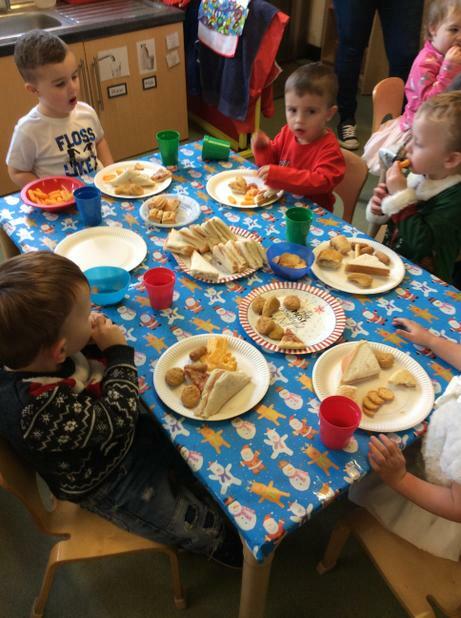 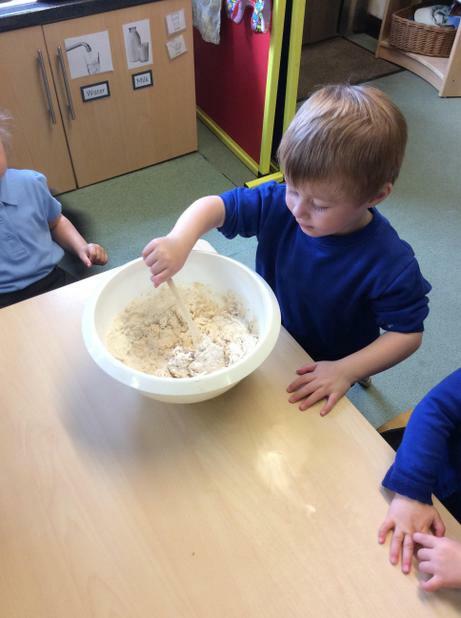 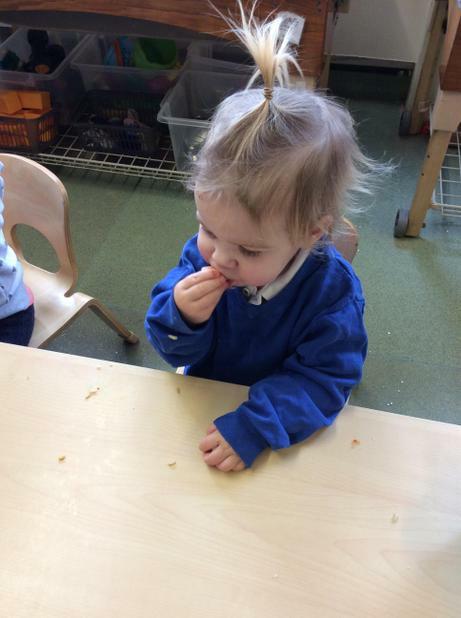 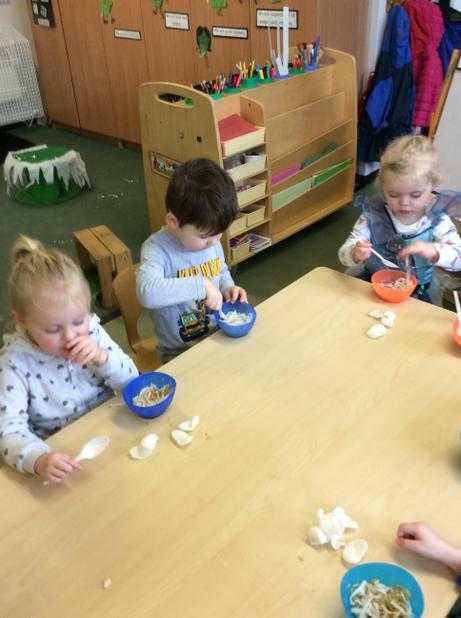 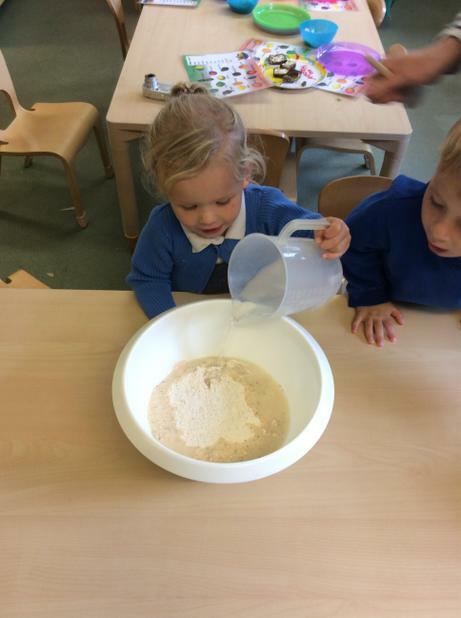 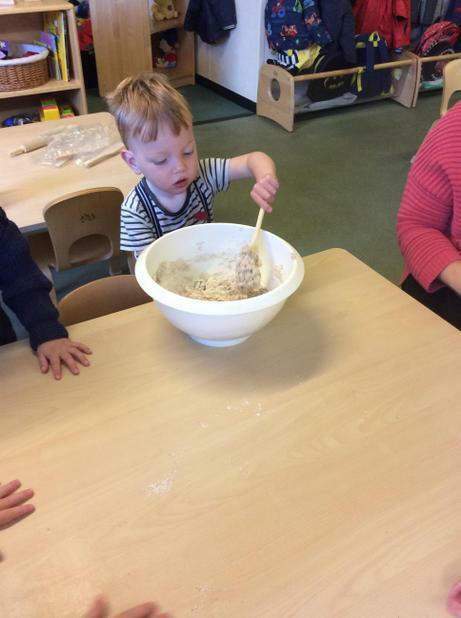 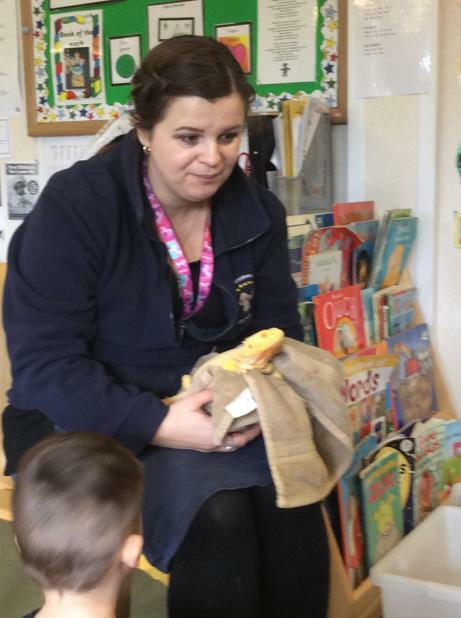 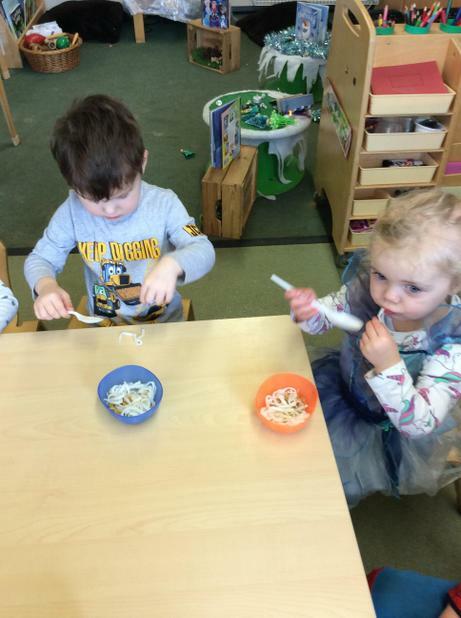 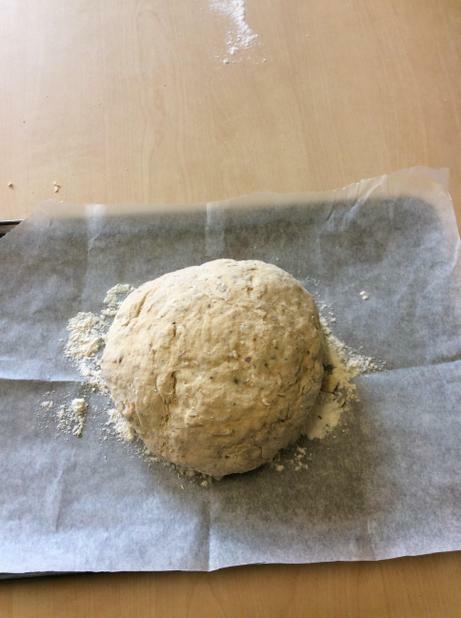 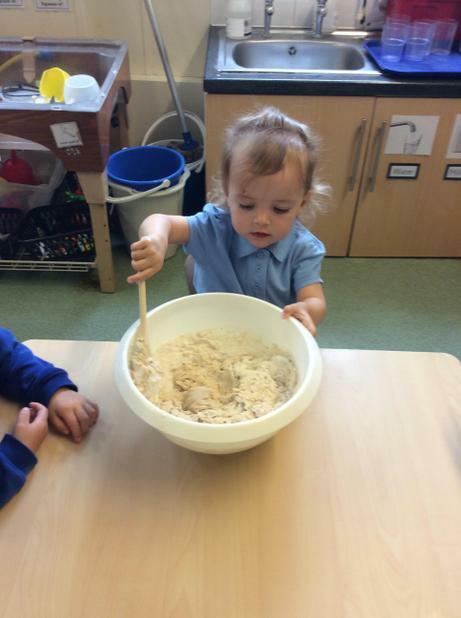 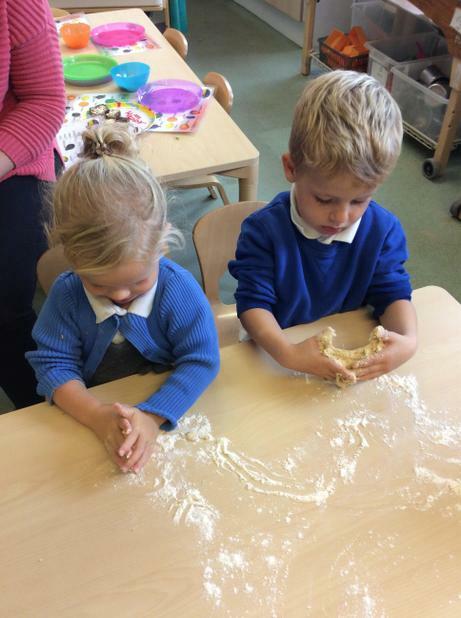 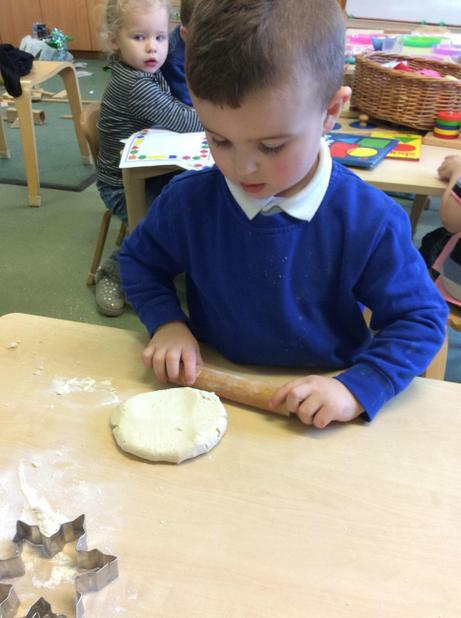 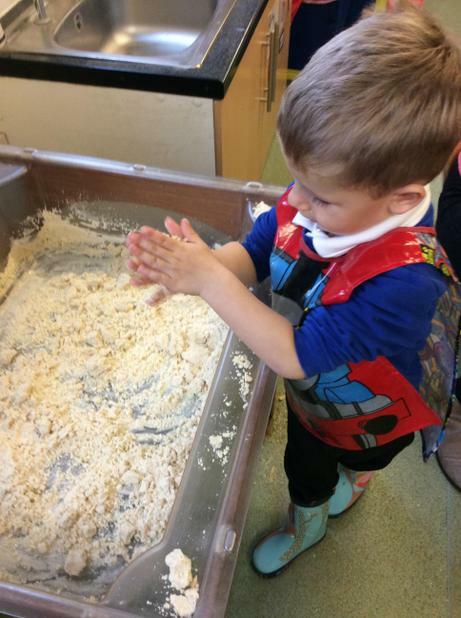 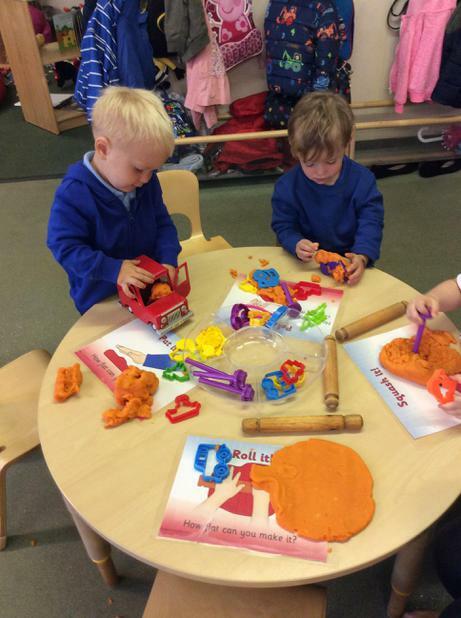 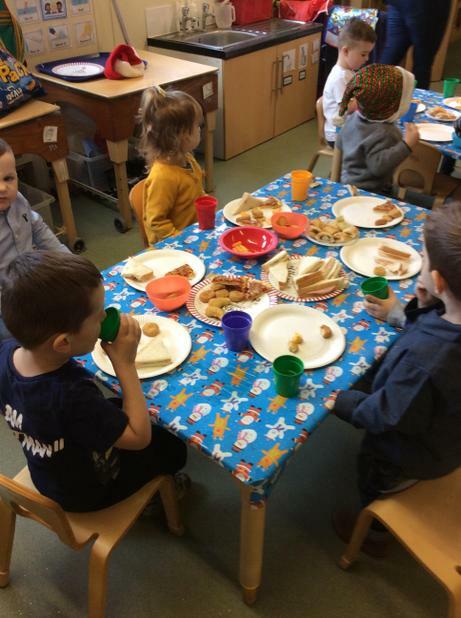 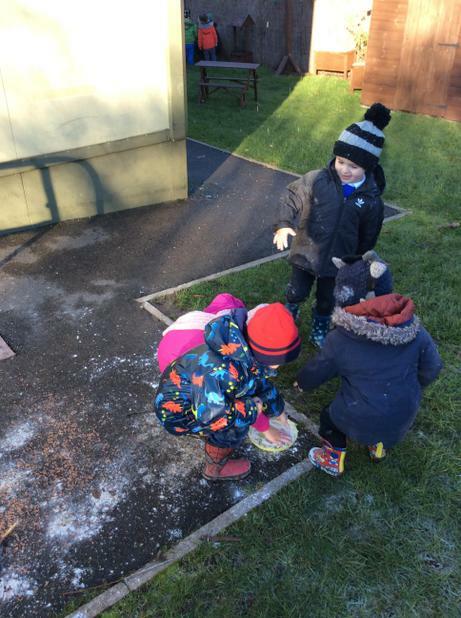 The children had lots of fun mixing and kneading the dough then buttering and tasting the delicious bread. 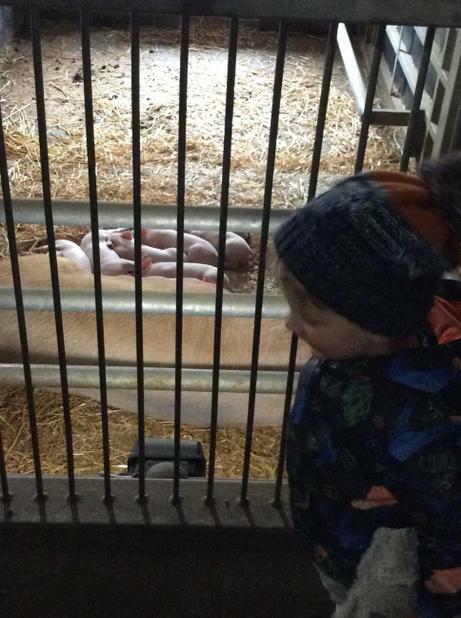 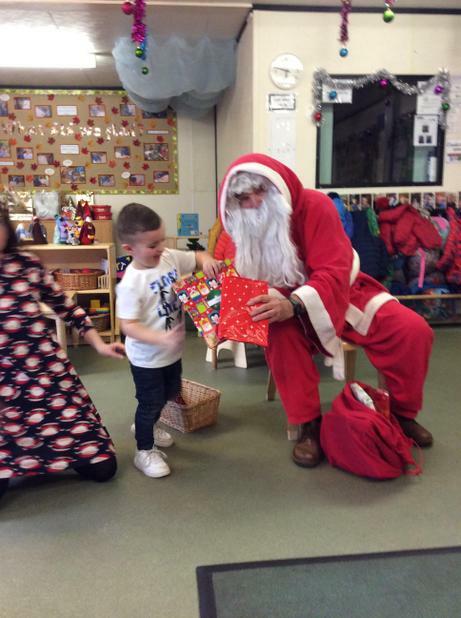 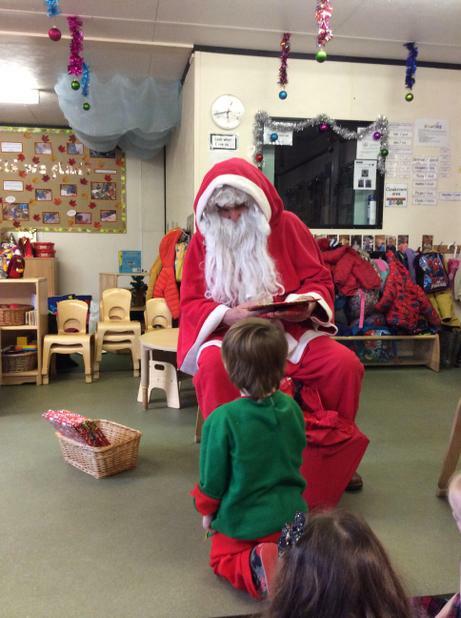 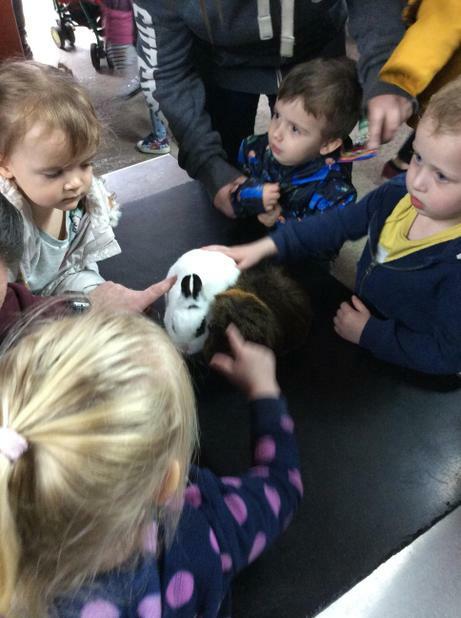 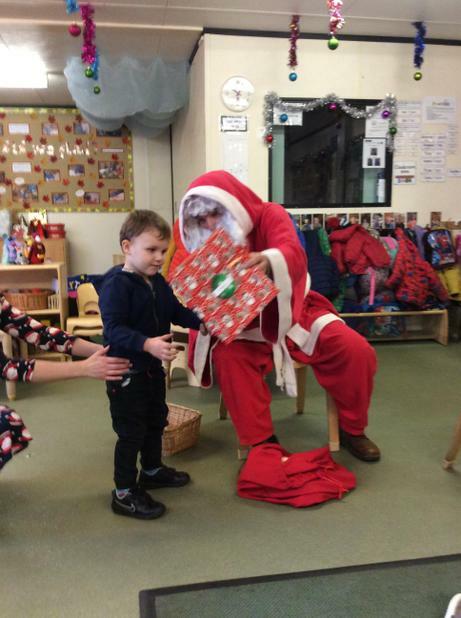 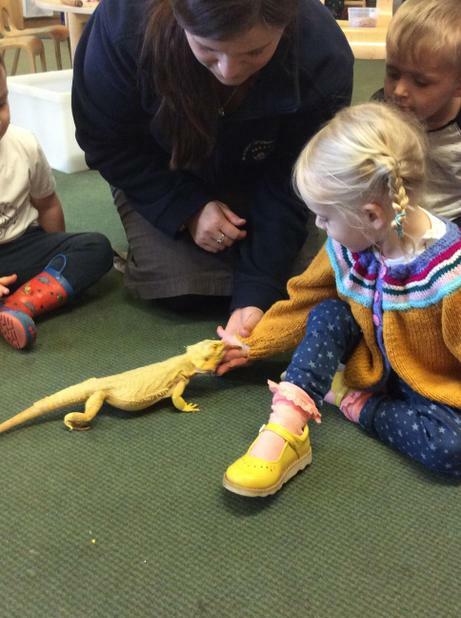 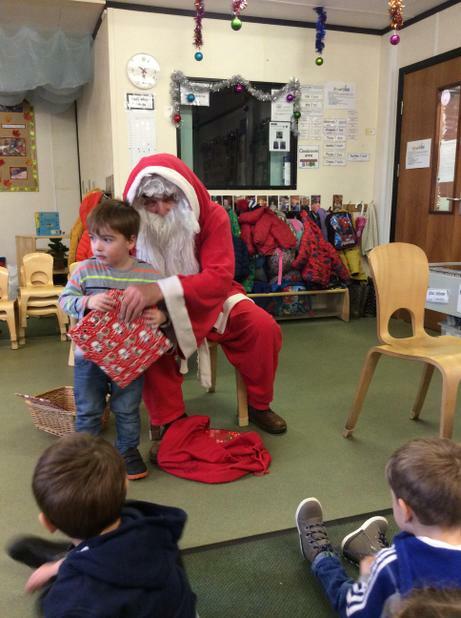 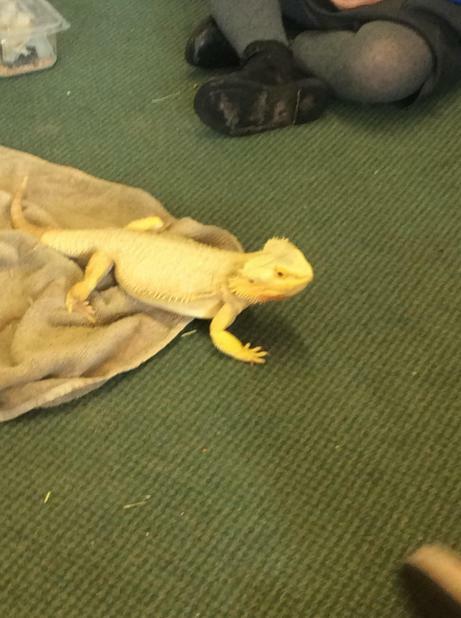 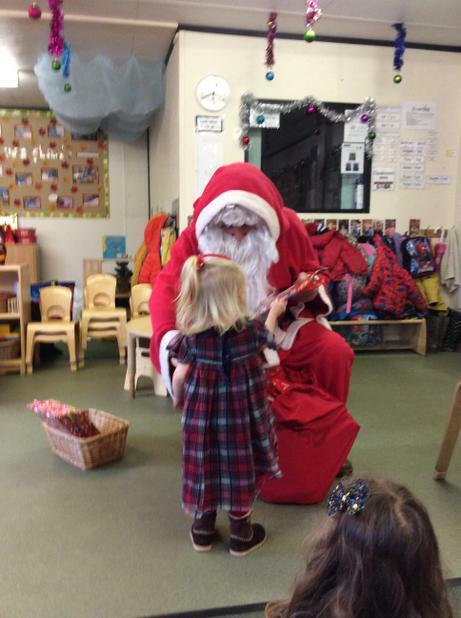 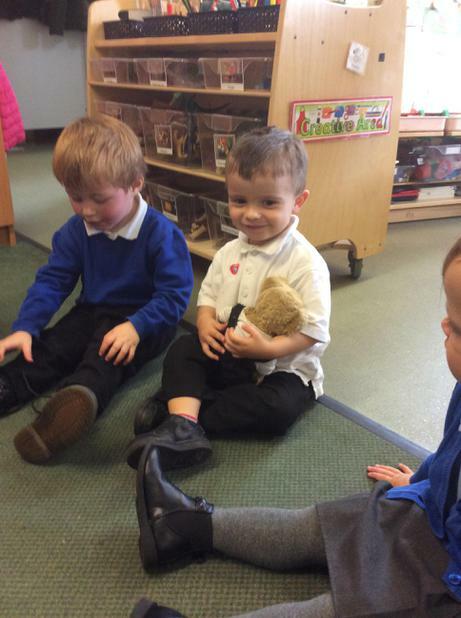 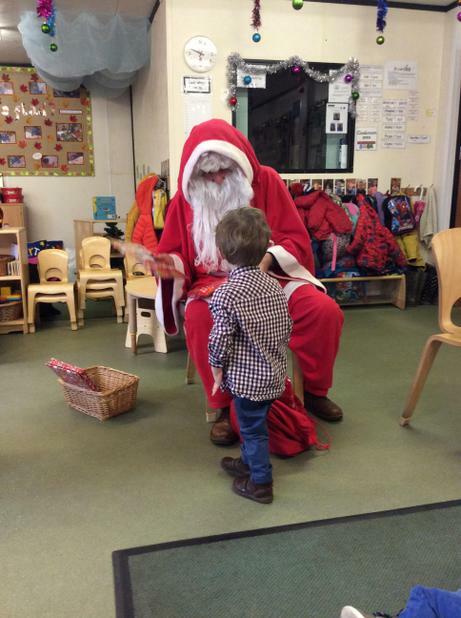 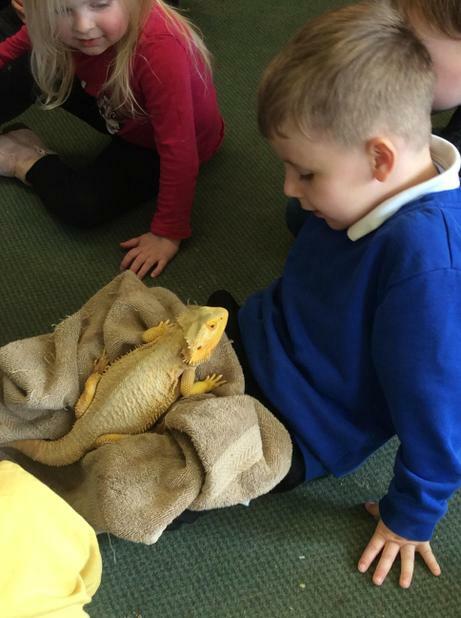 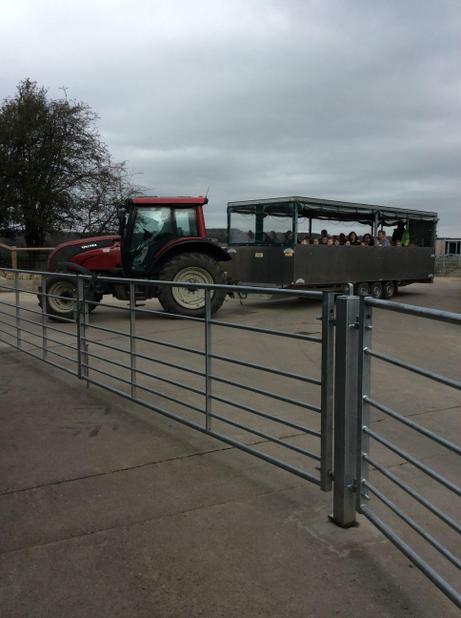 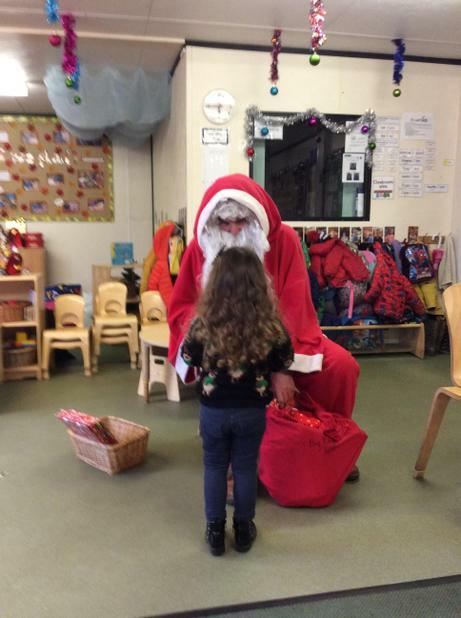 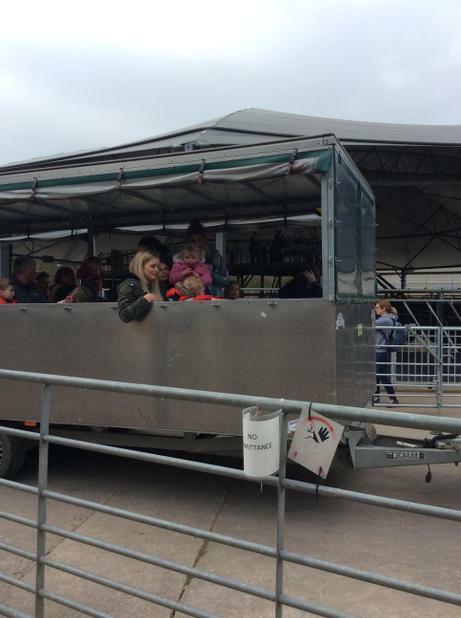 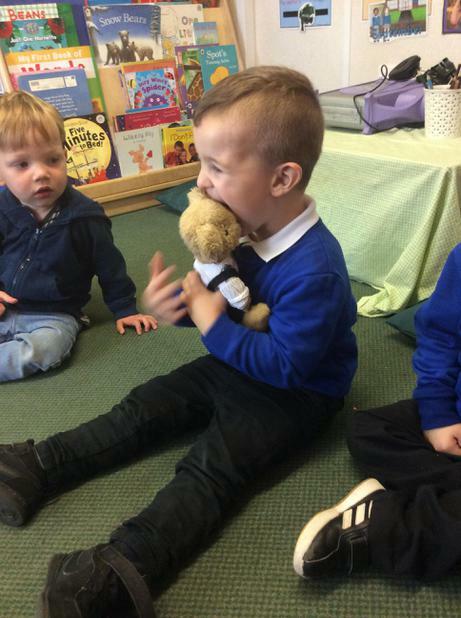 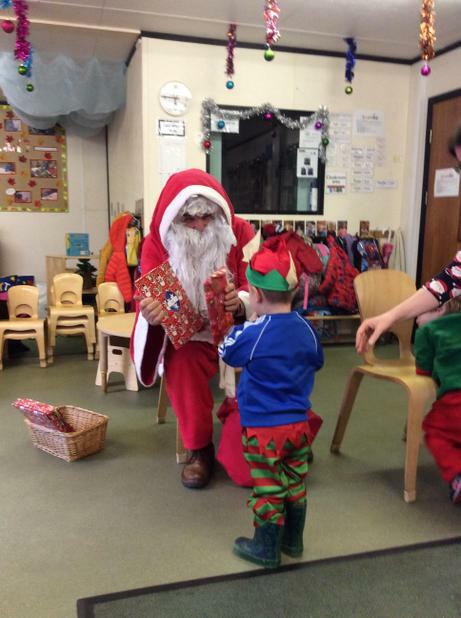 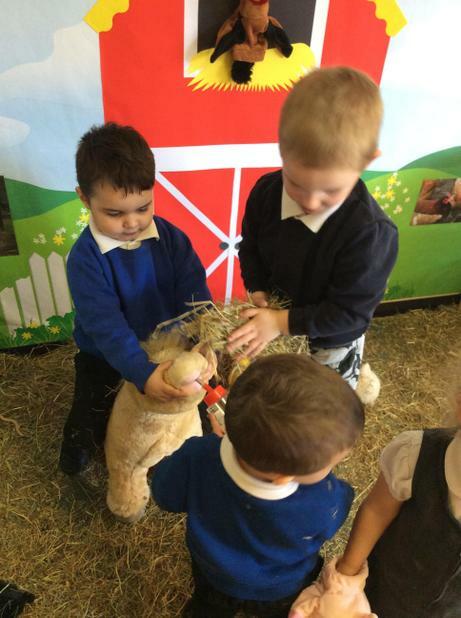 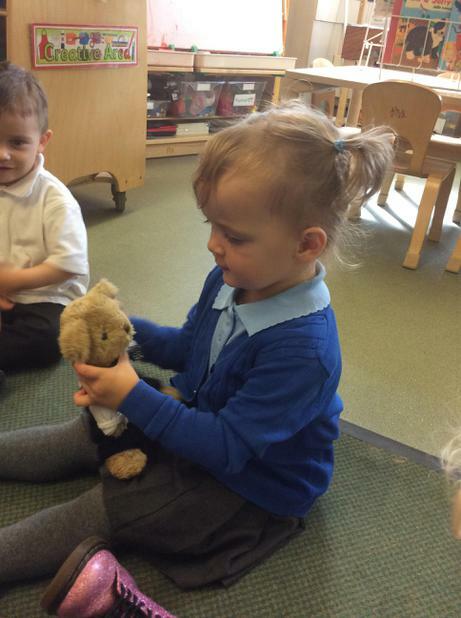 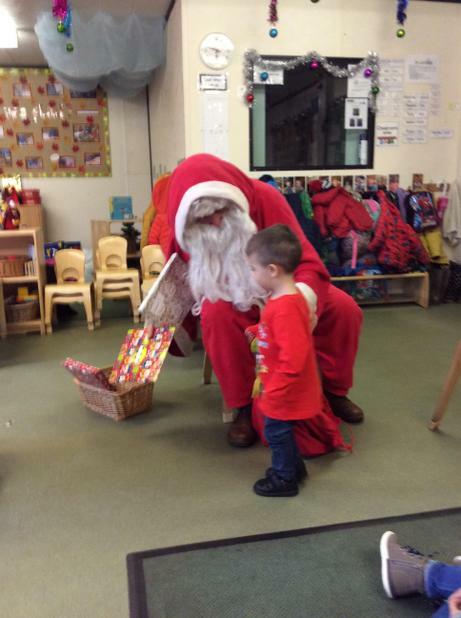 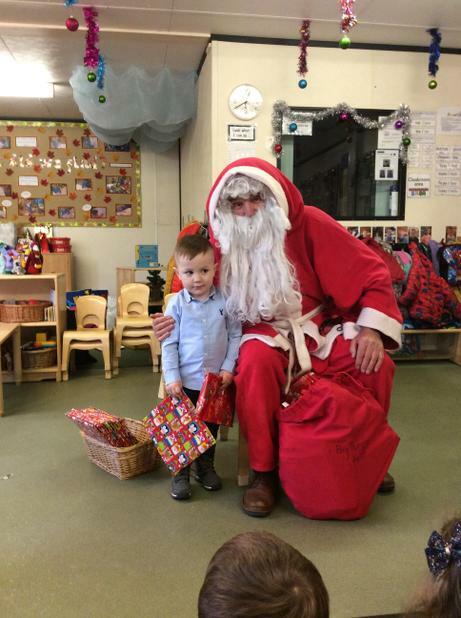 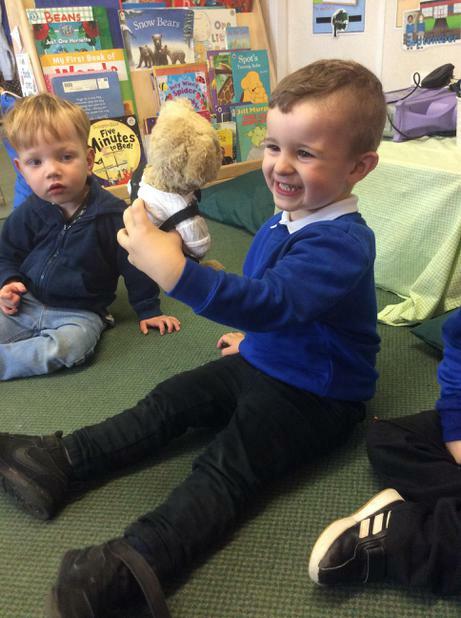 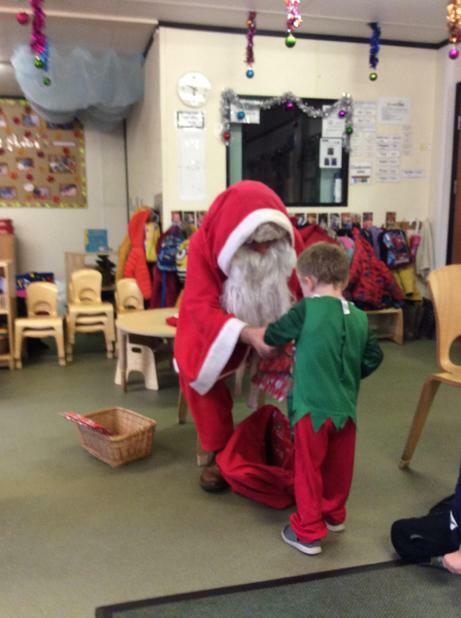 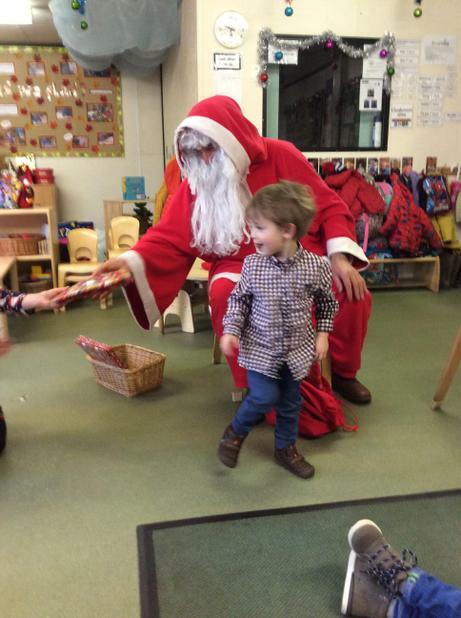 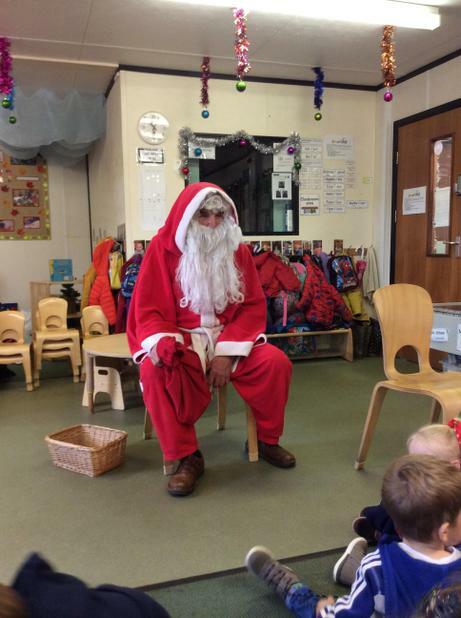 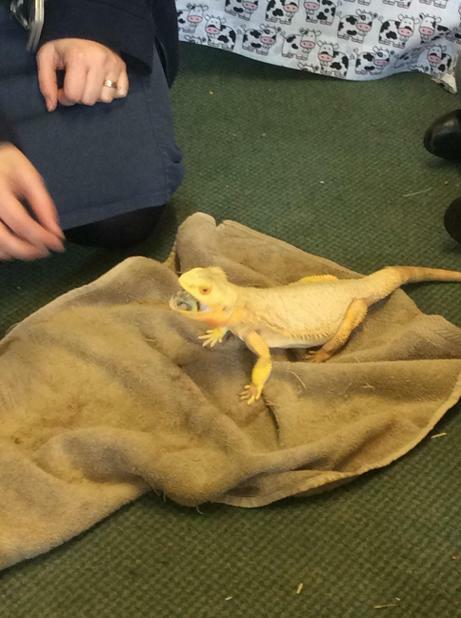 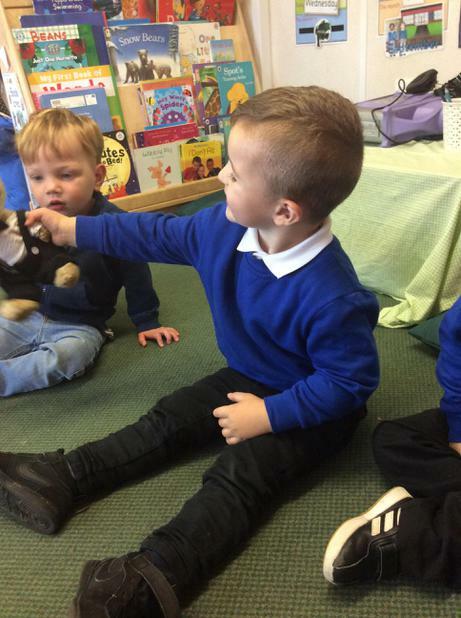 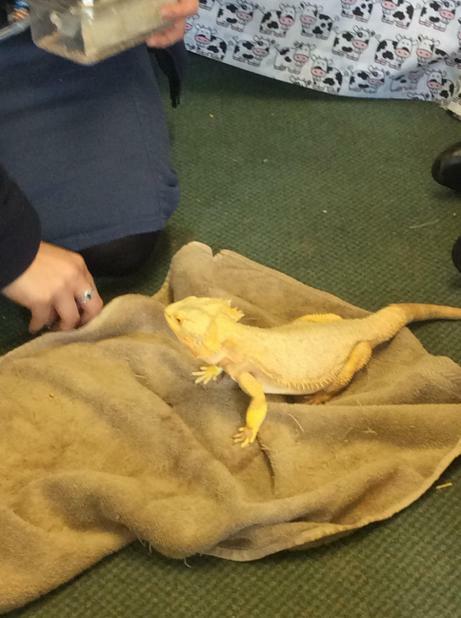 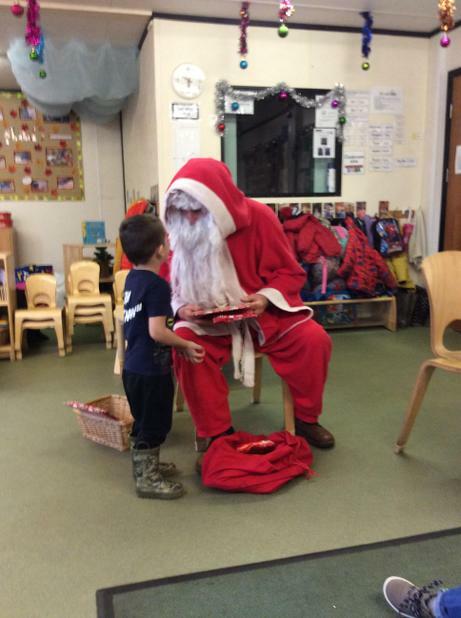 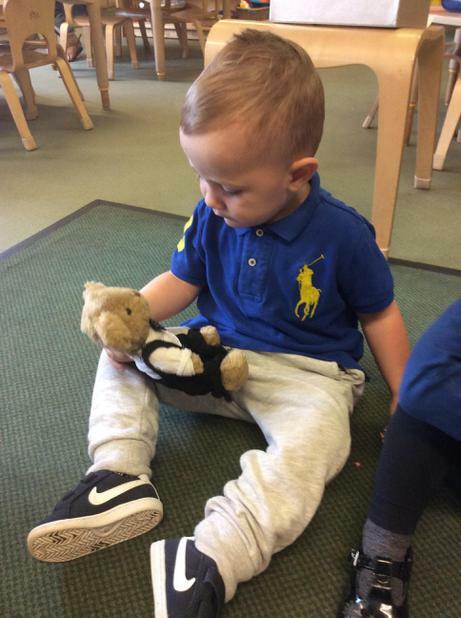 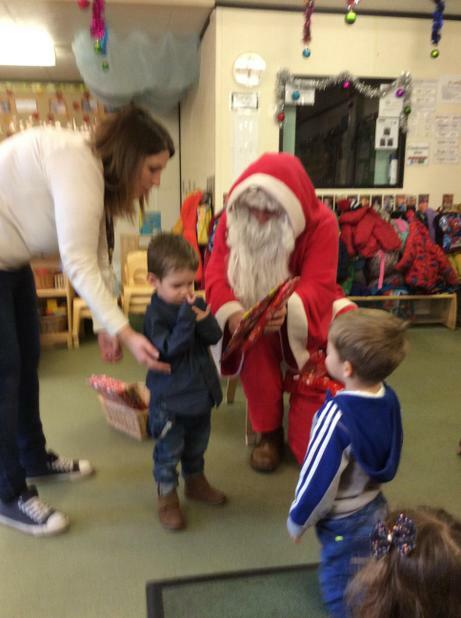 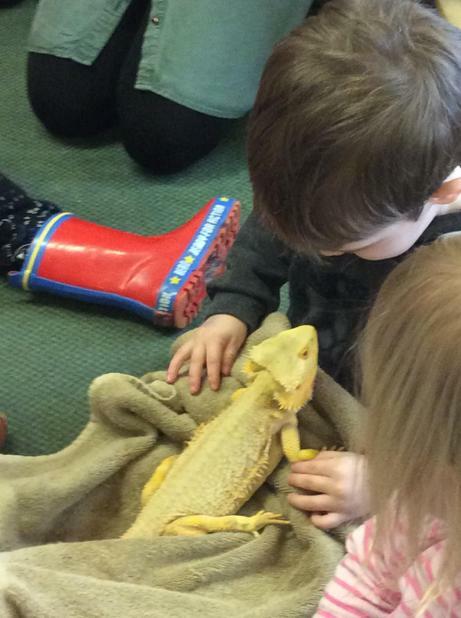 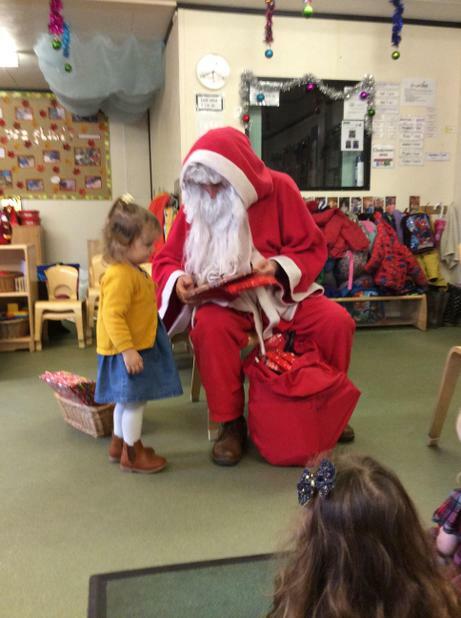 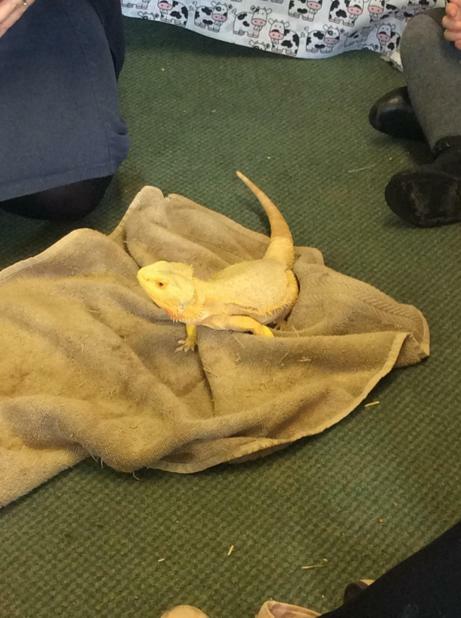 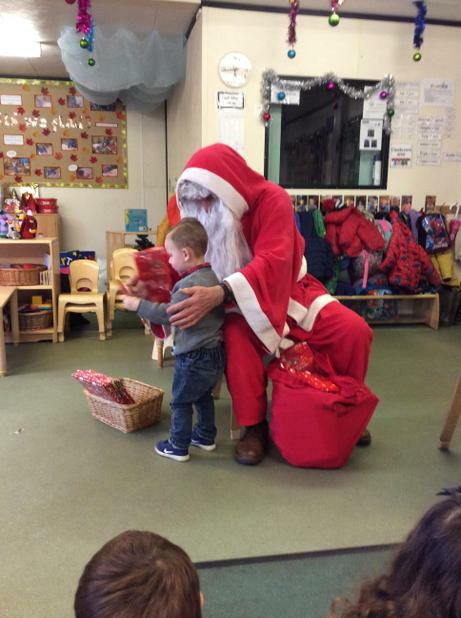 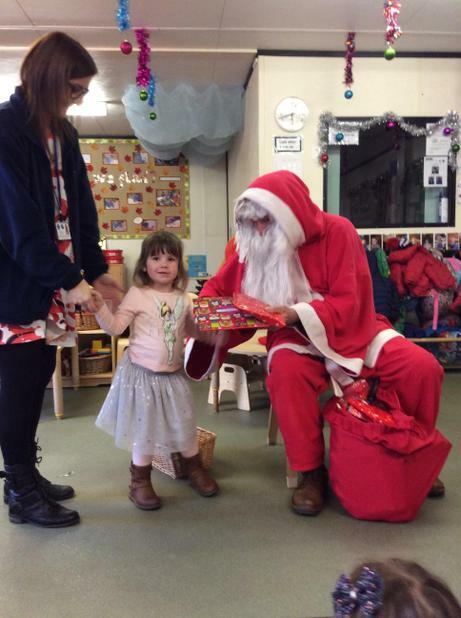 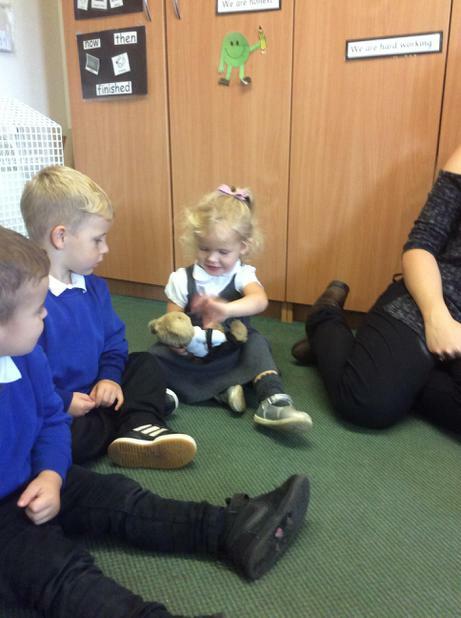 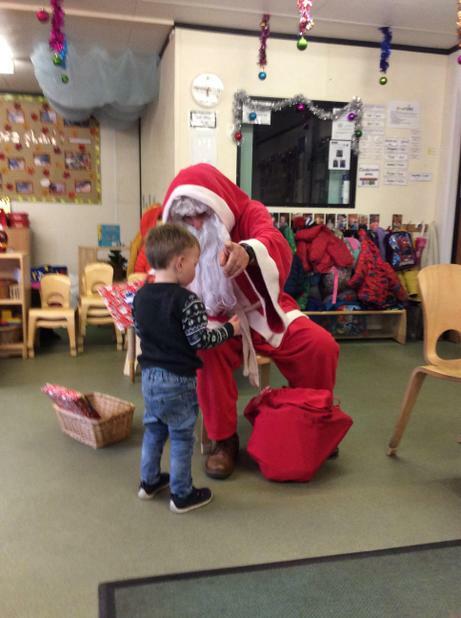 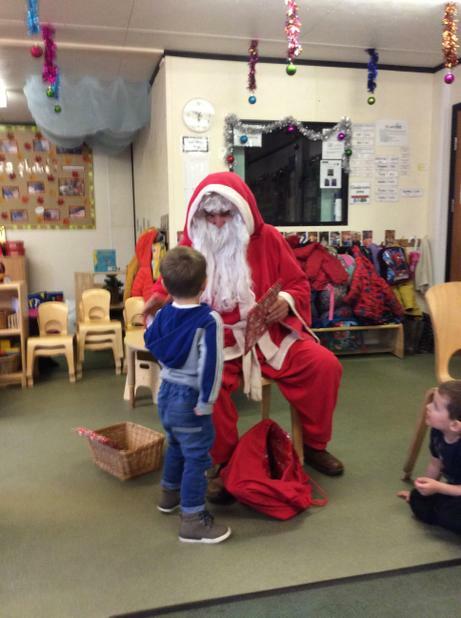 Smarties children were very excited to receive a special visit from Barney Bear this week. 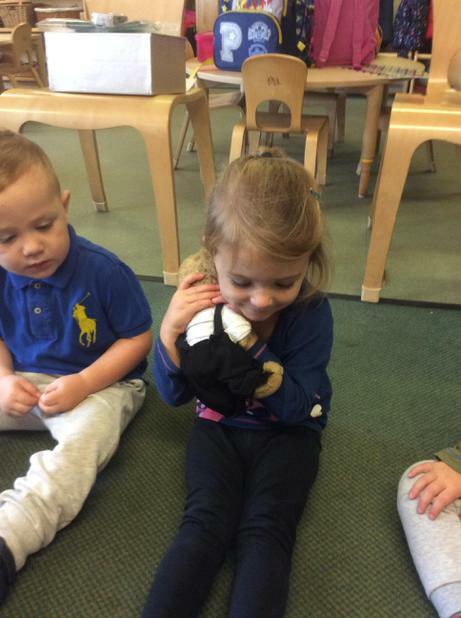 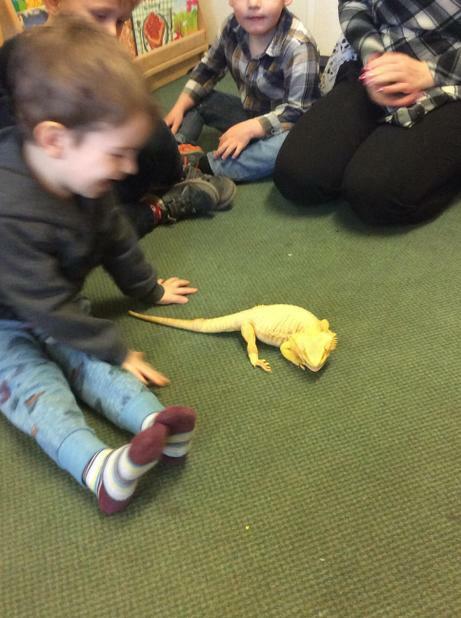 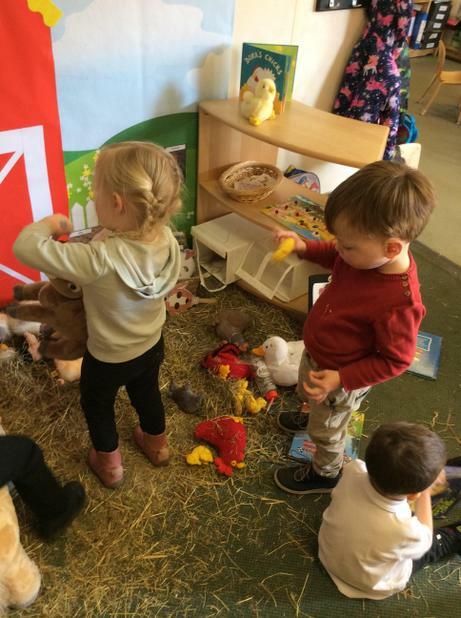 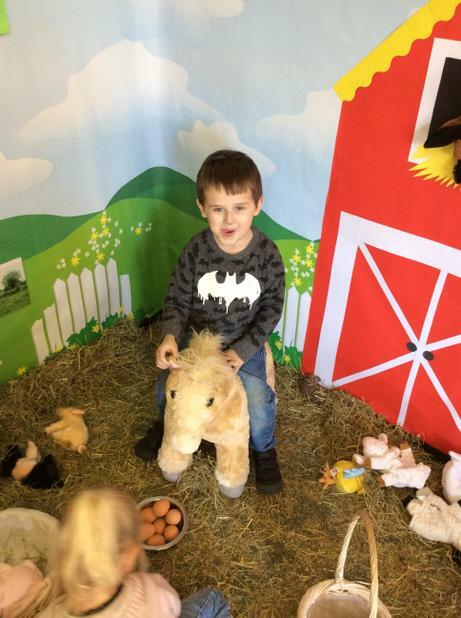 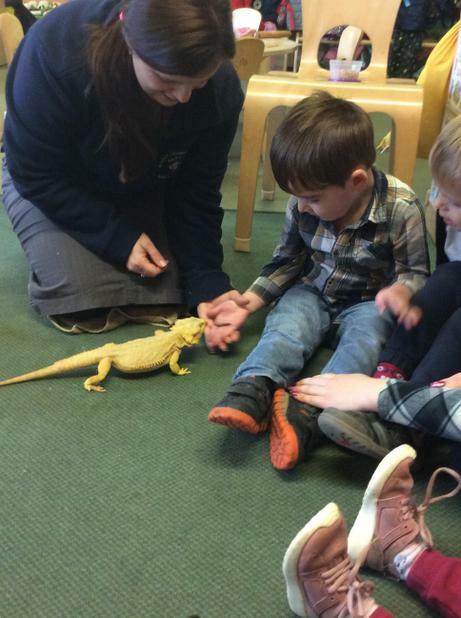 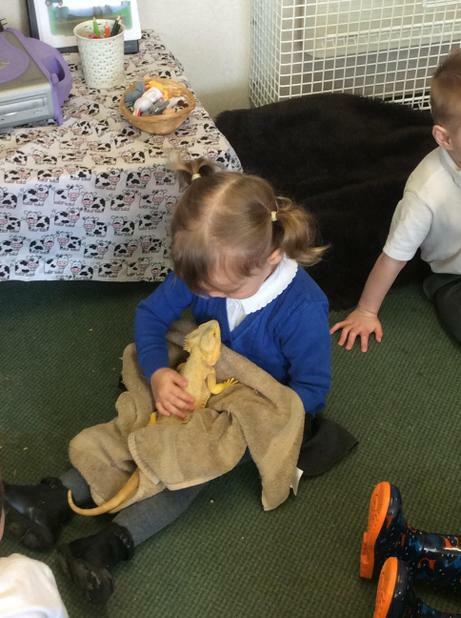 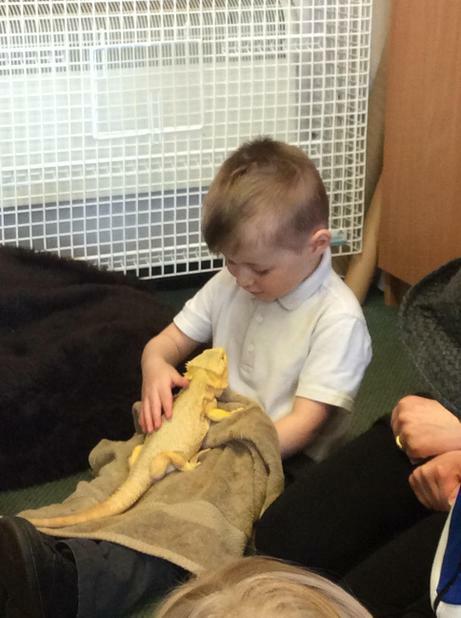 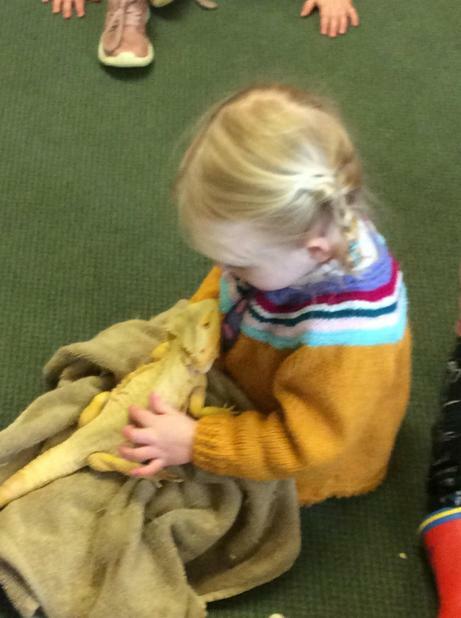 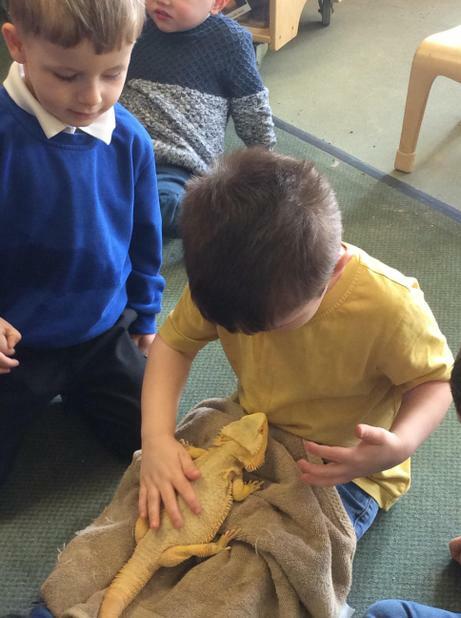 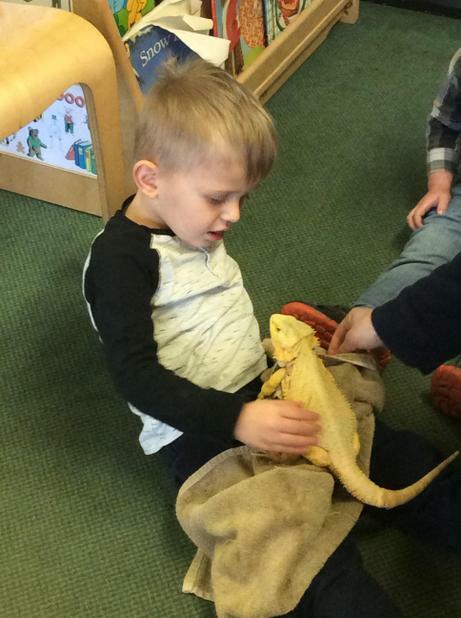 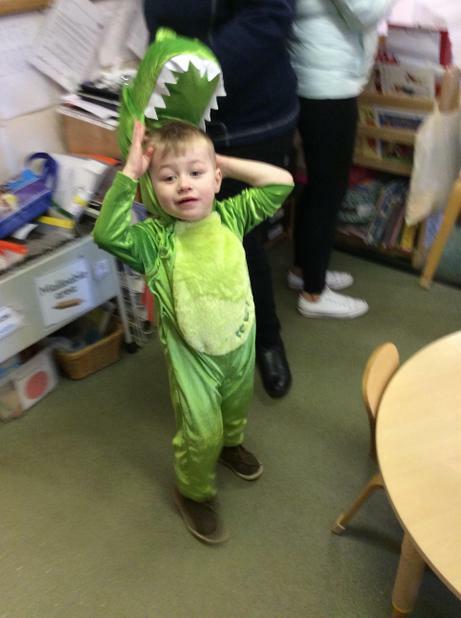 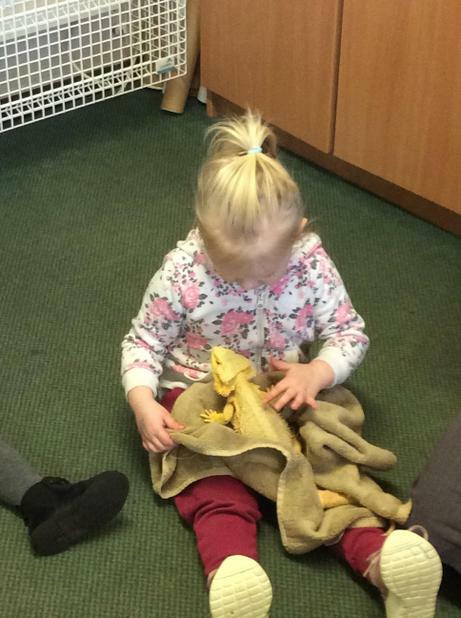 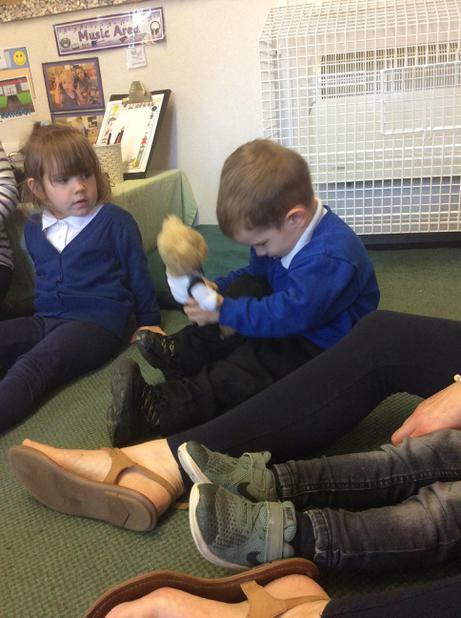 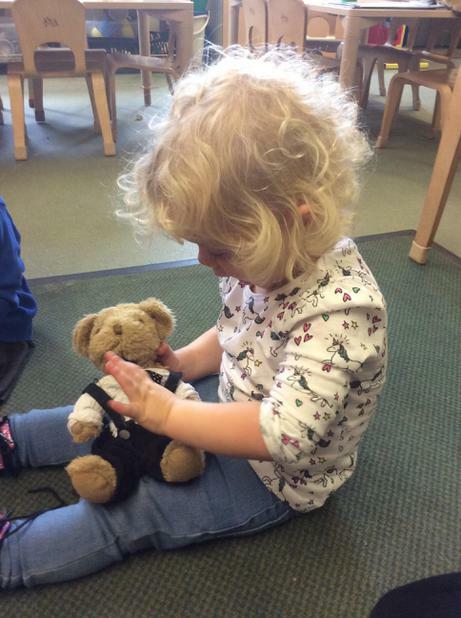 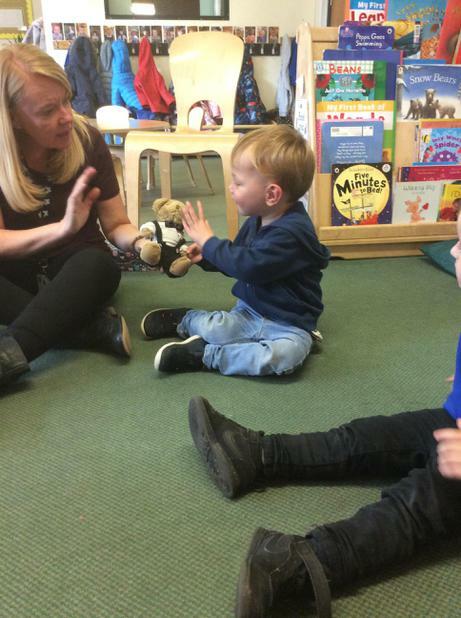 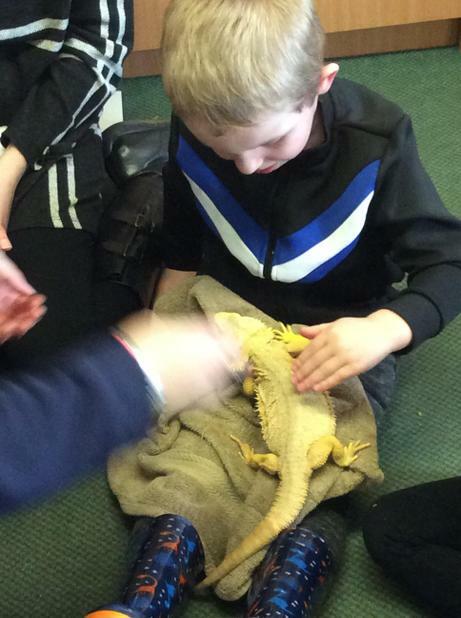 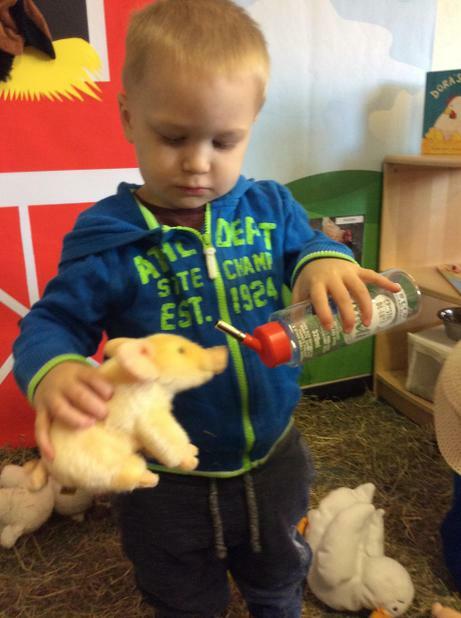 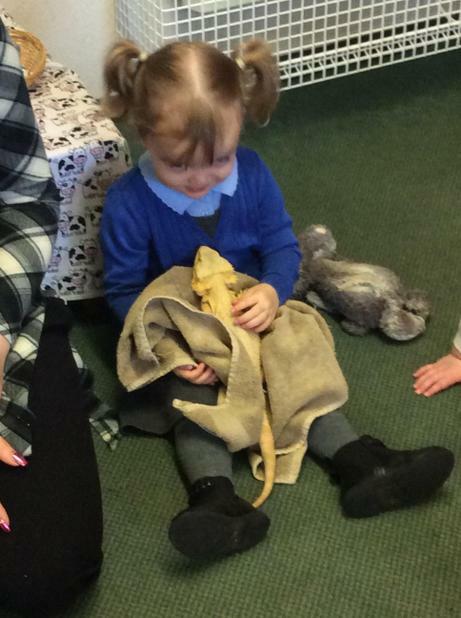 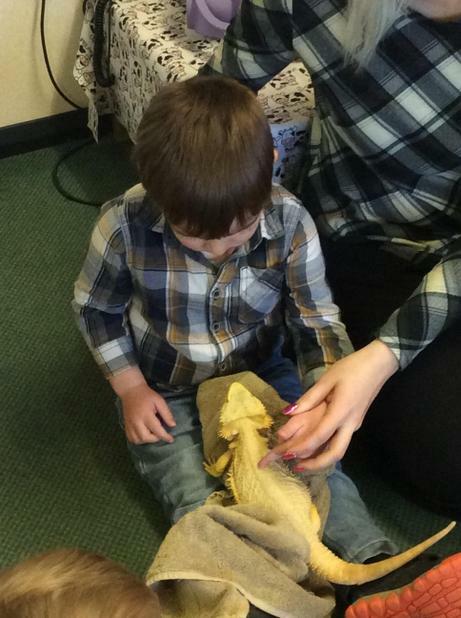 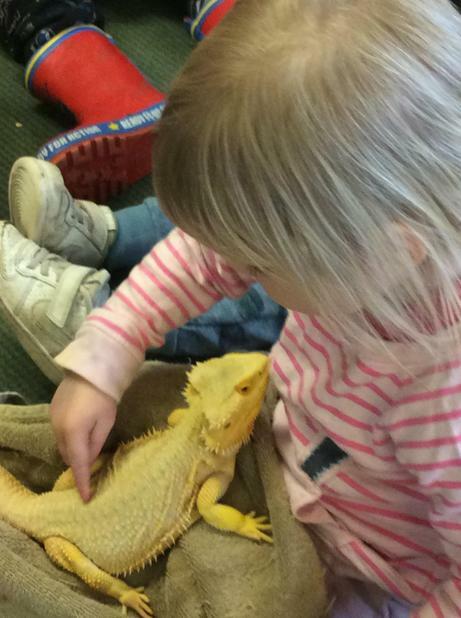 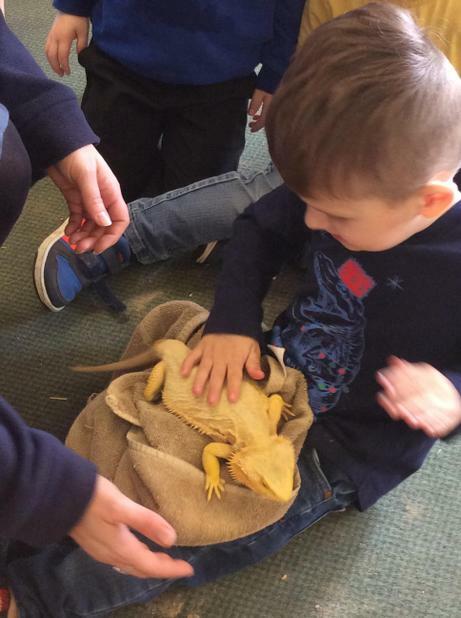 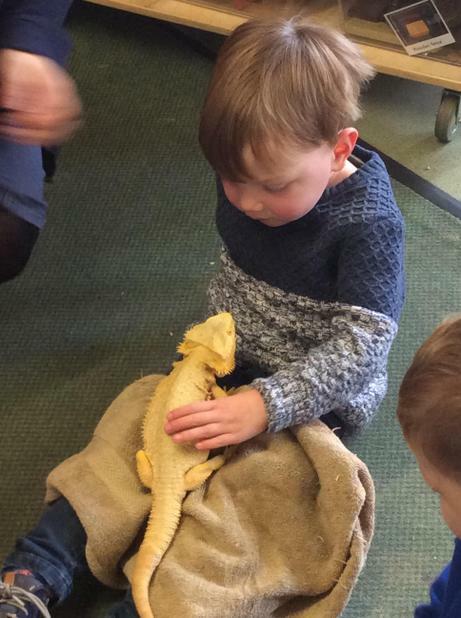 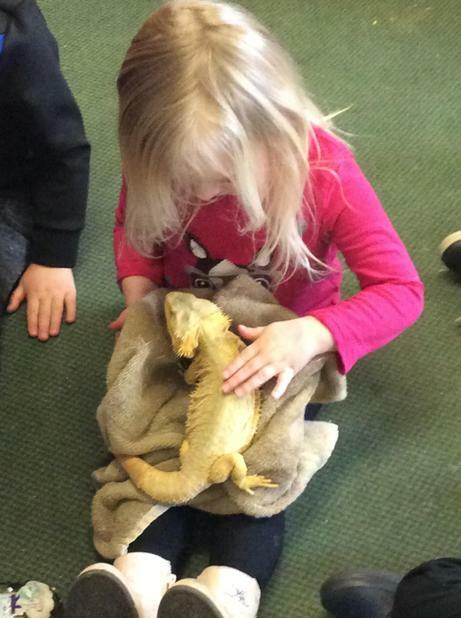 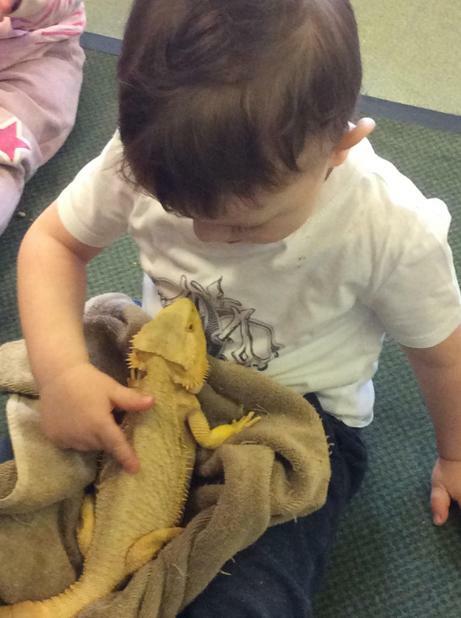 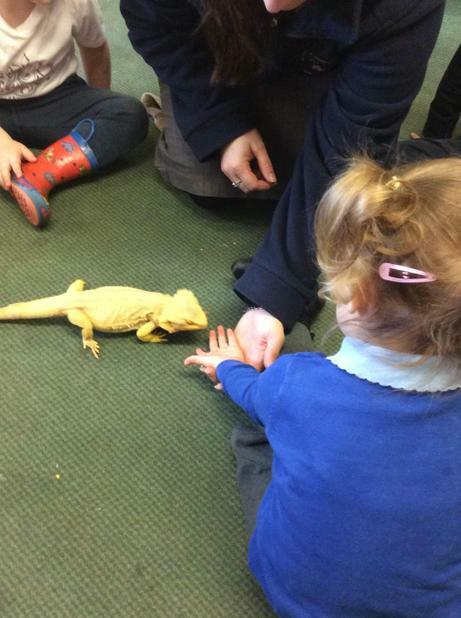 Barney helps our children to develop their communication and social skills. 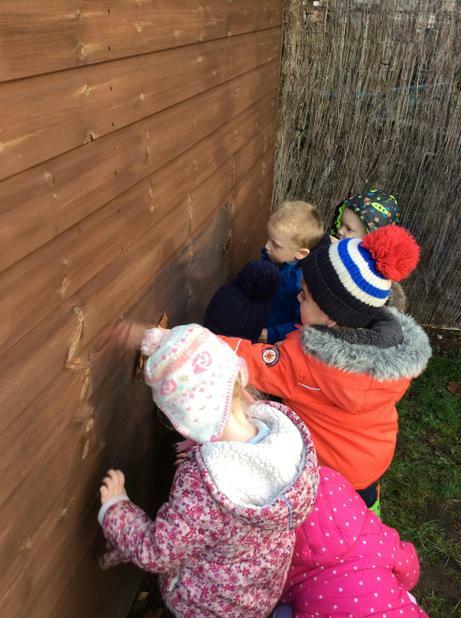 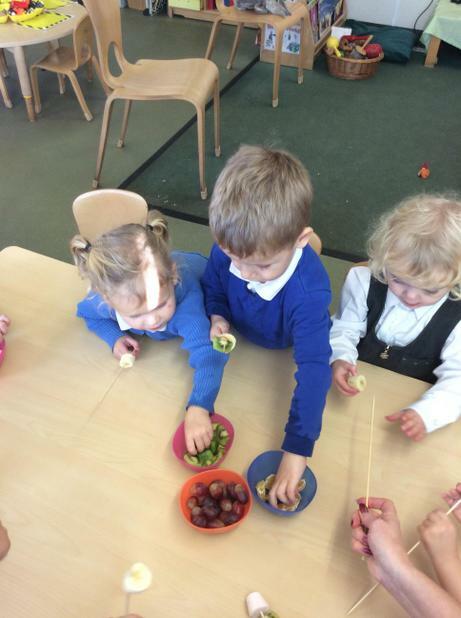 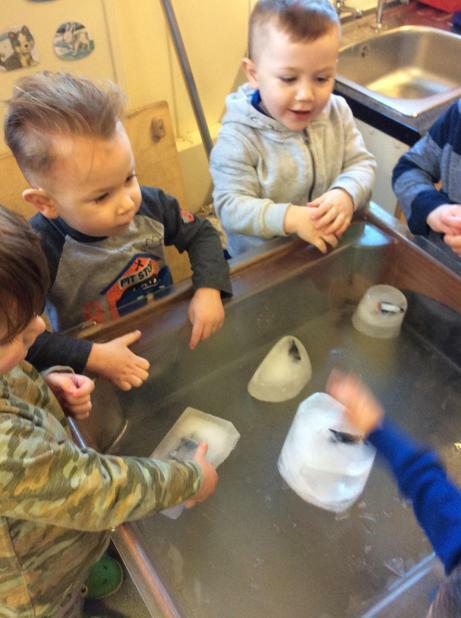 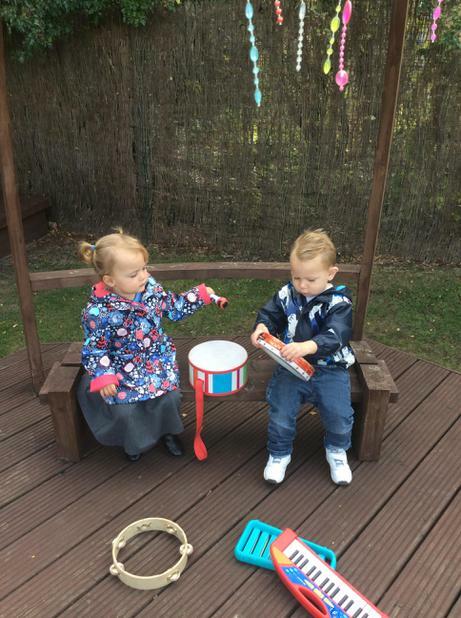 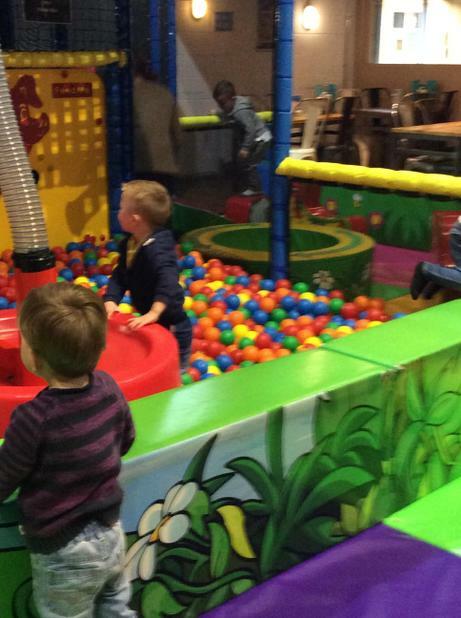 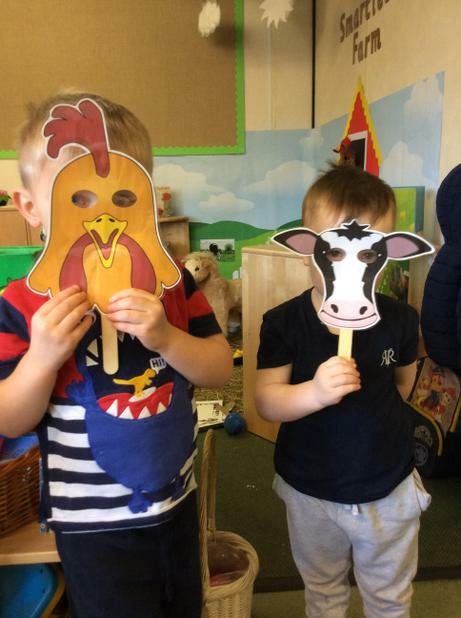 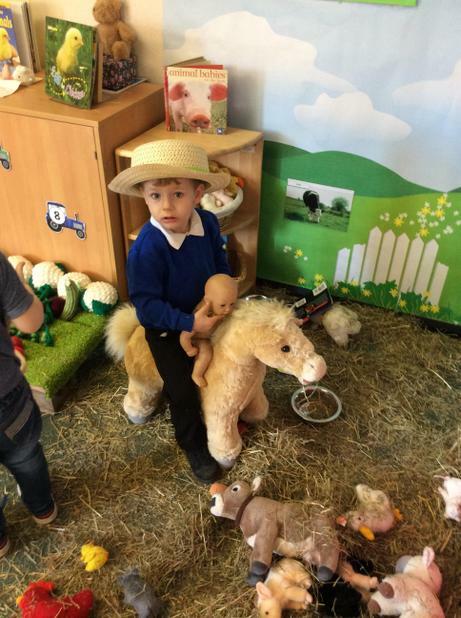 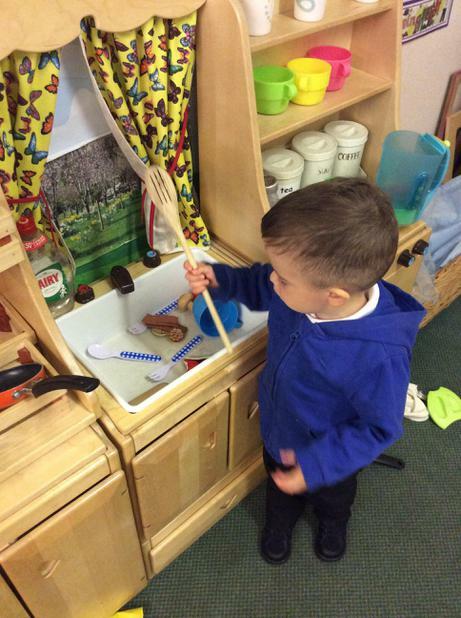 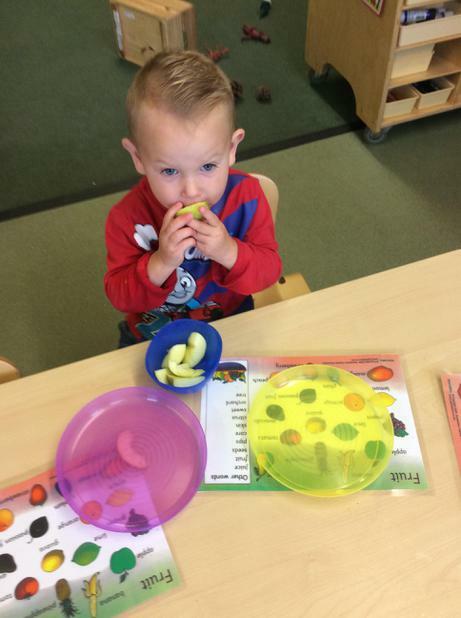 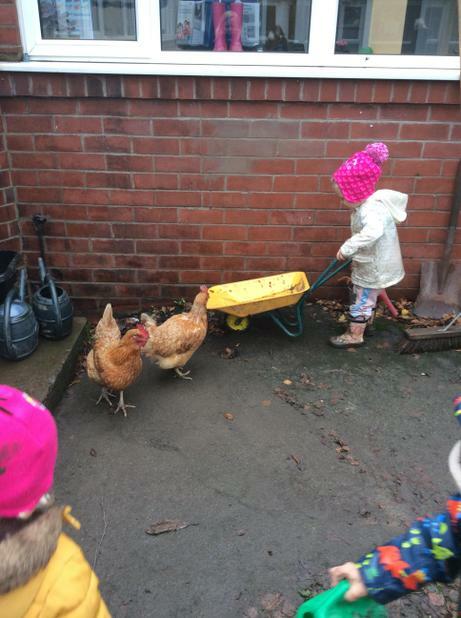 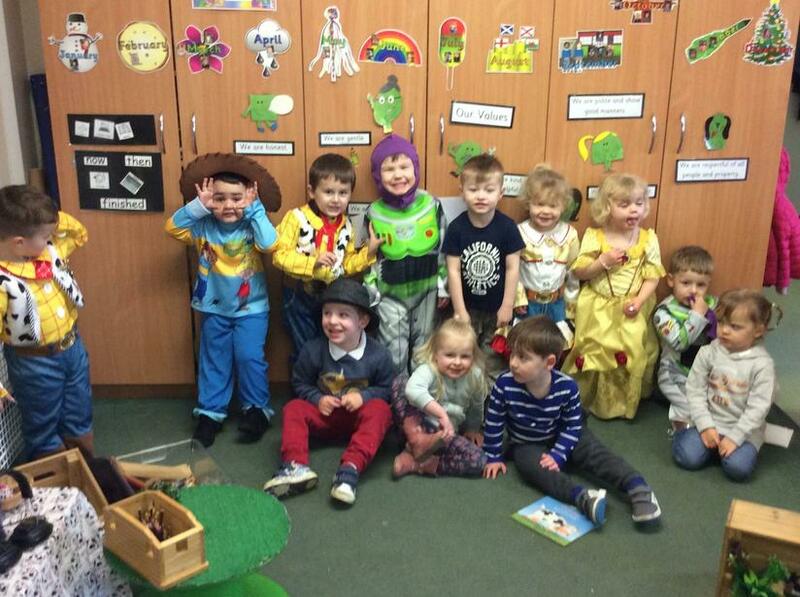 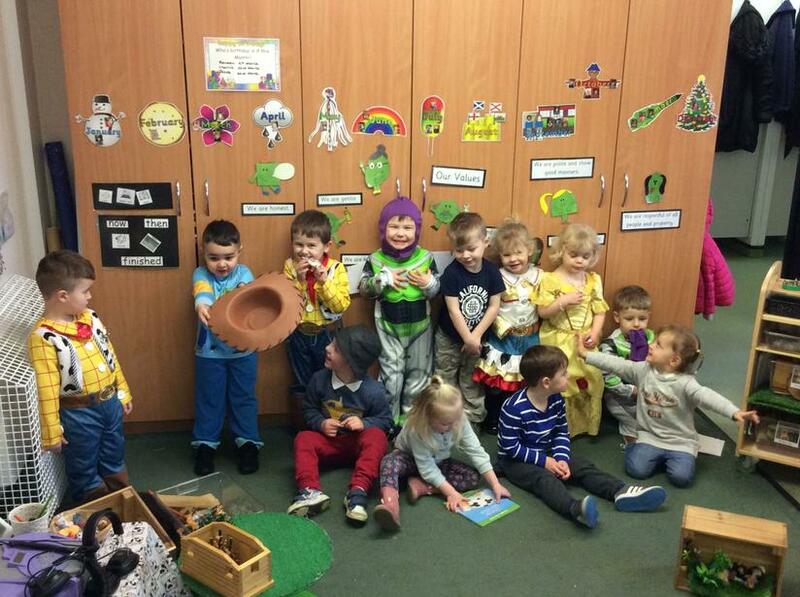 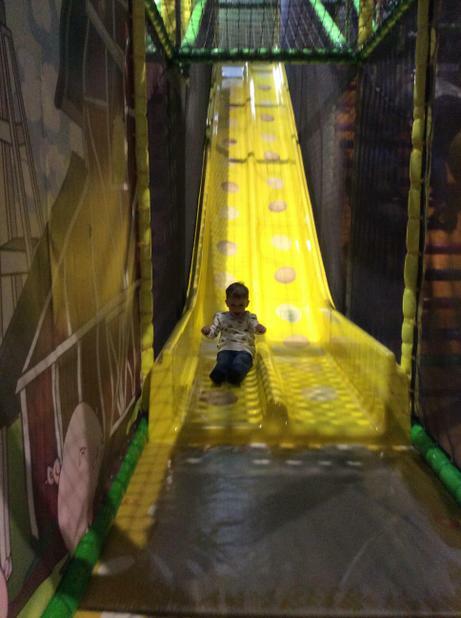 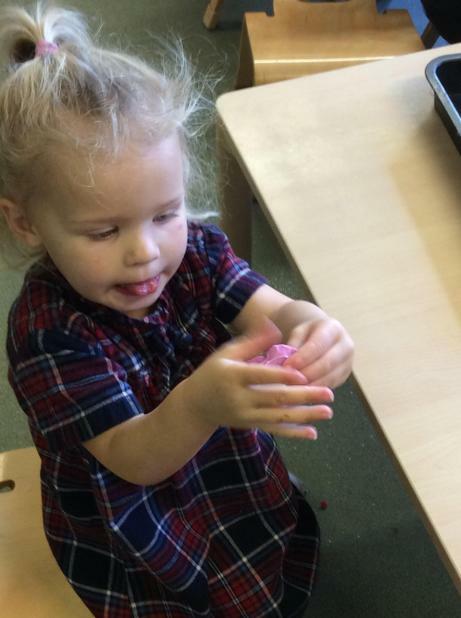 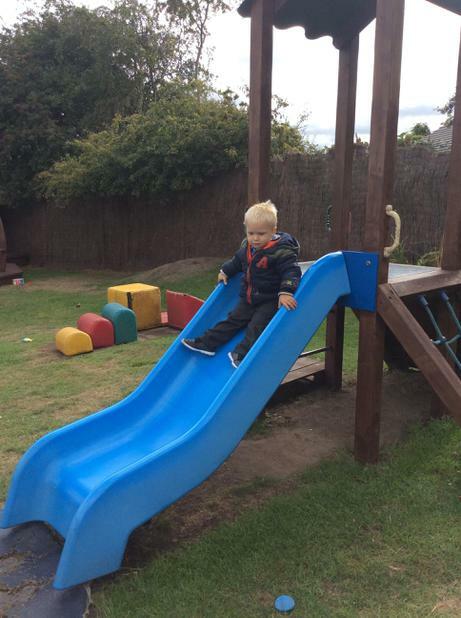 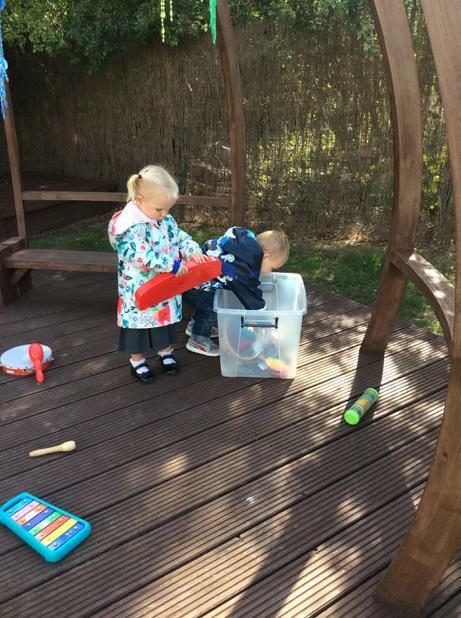 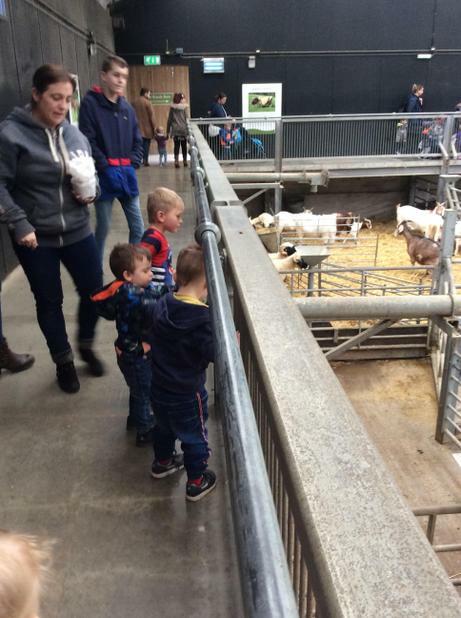 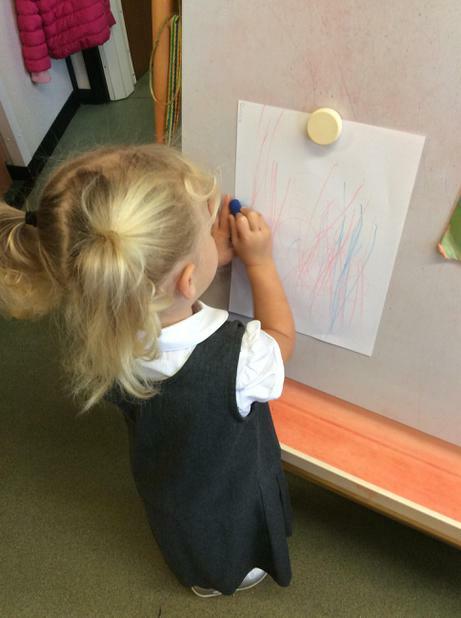 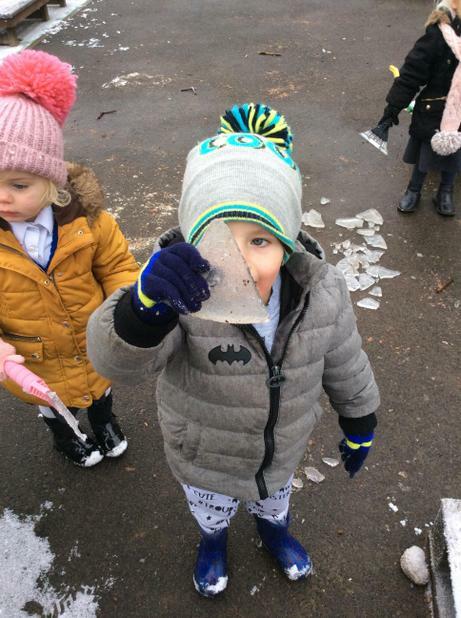 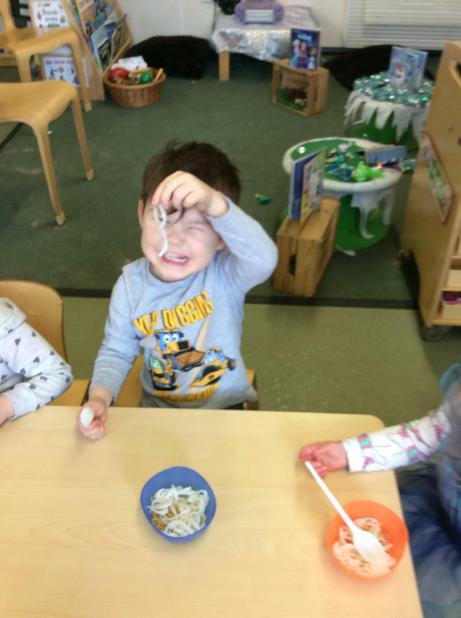 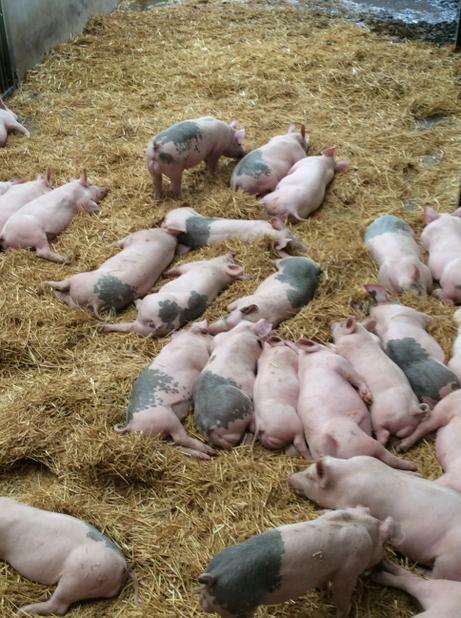 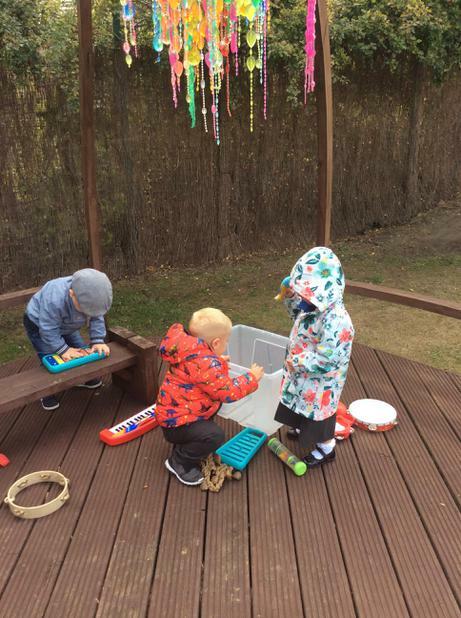 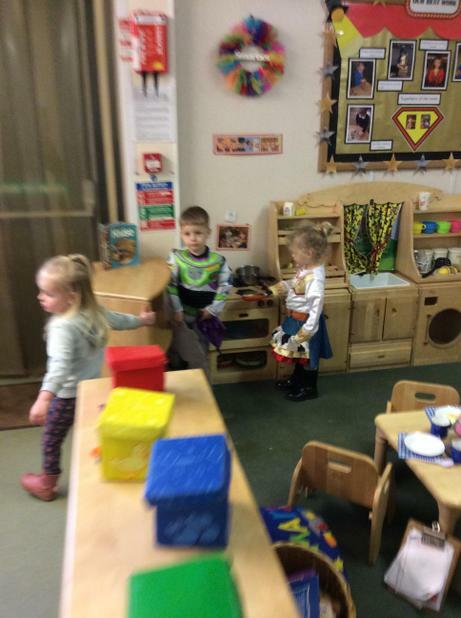 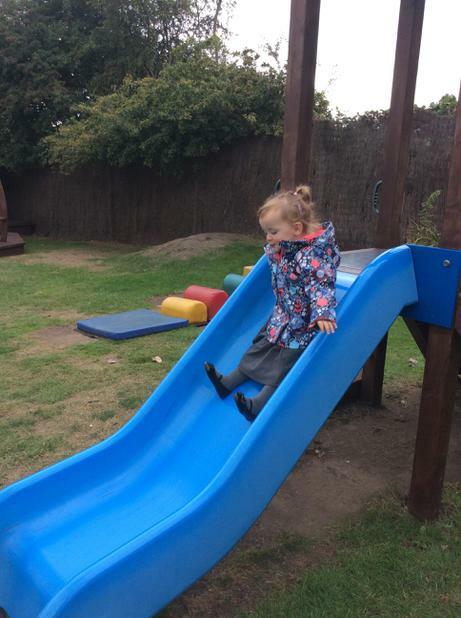 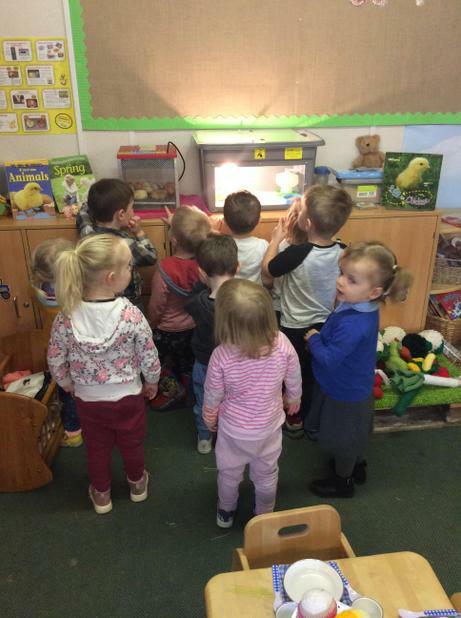 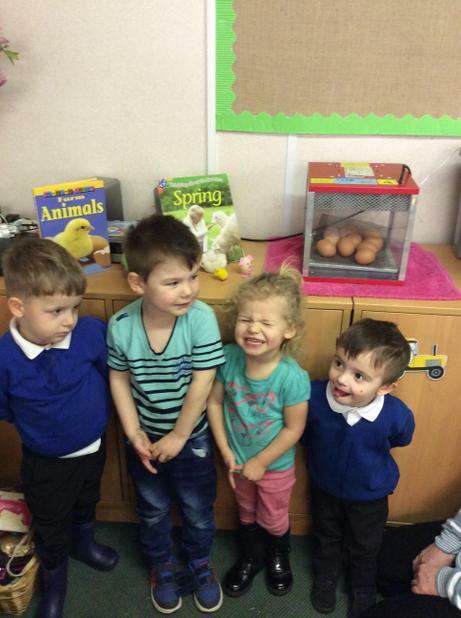 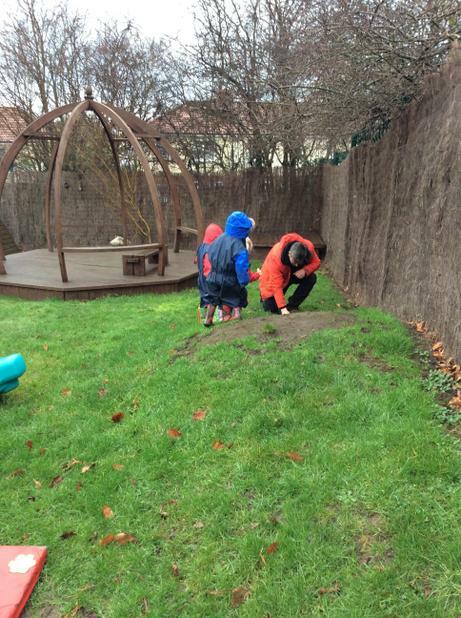 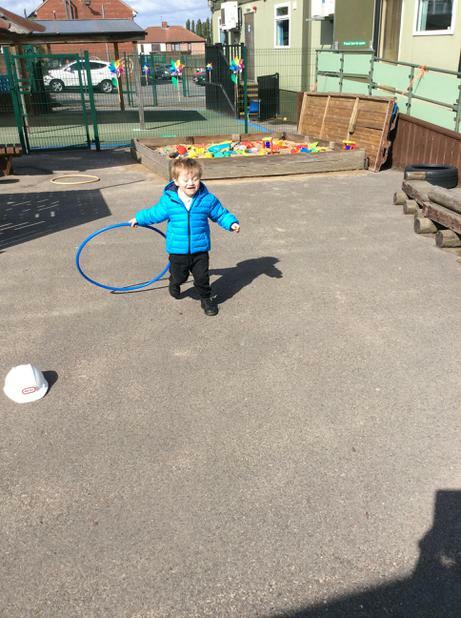 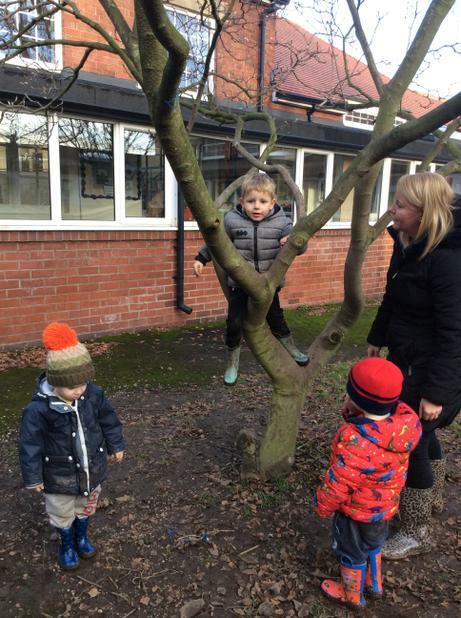 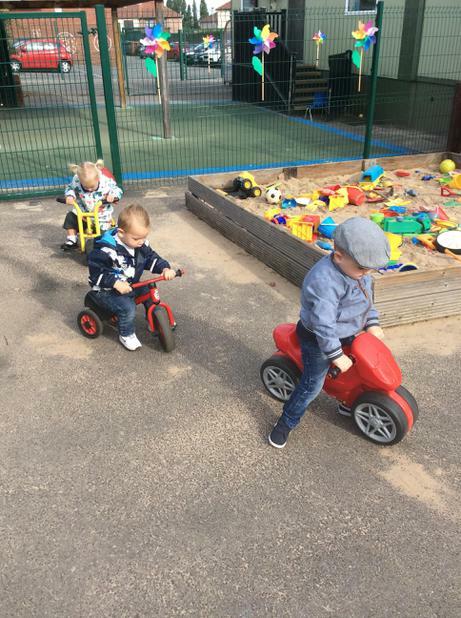 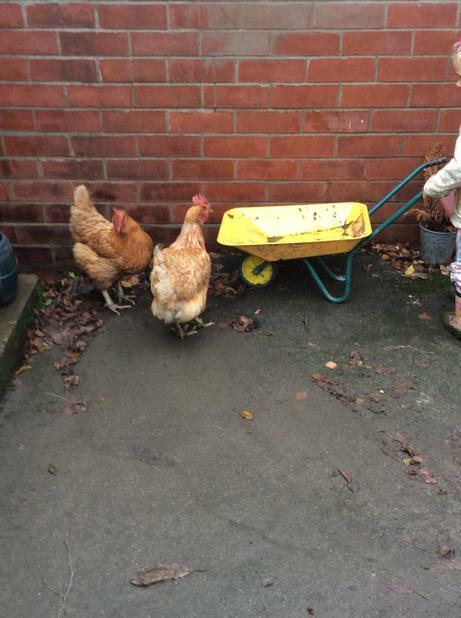 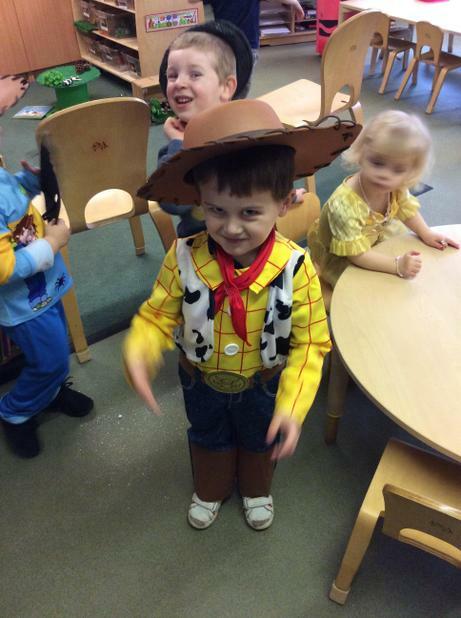 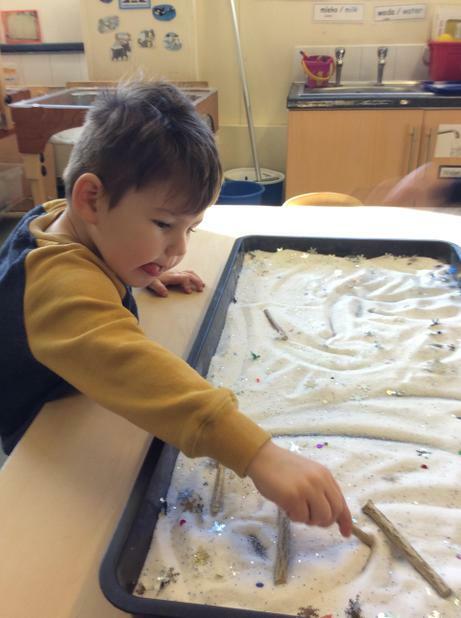 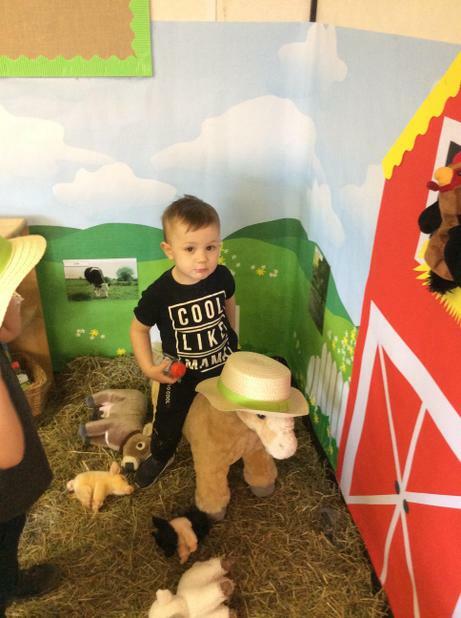 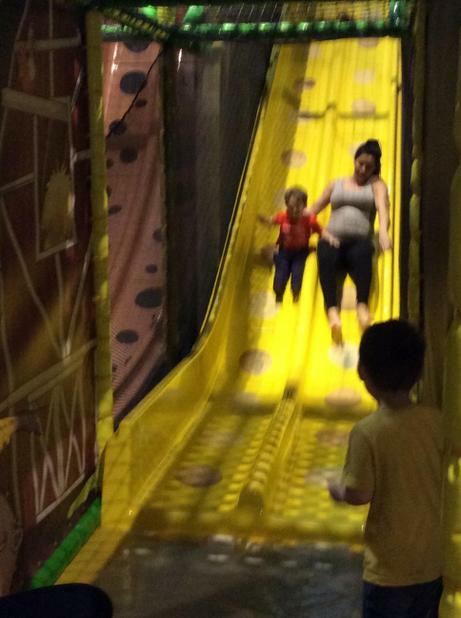 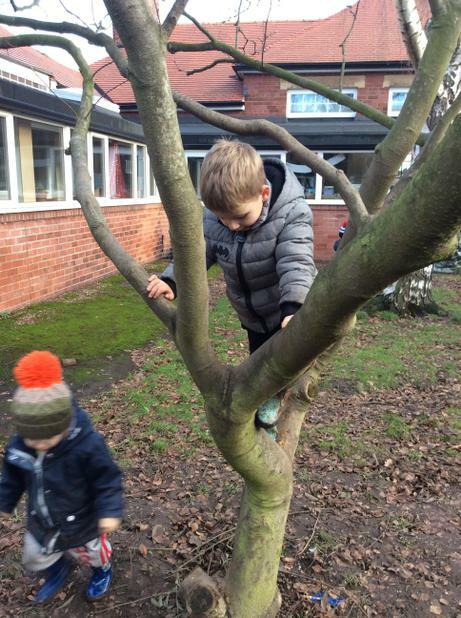 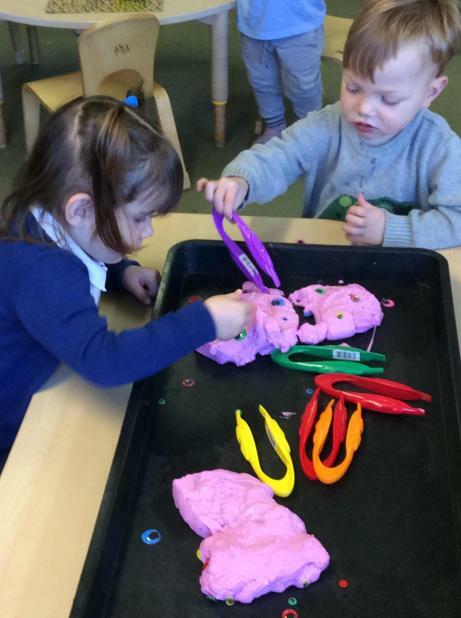 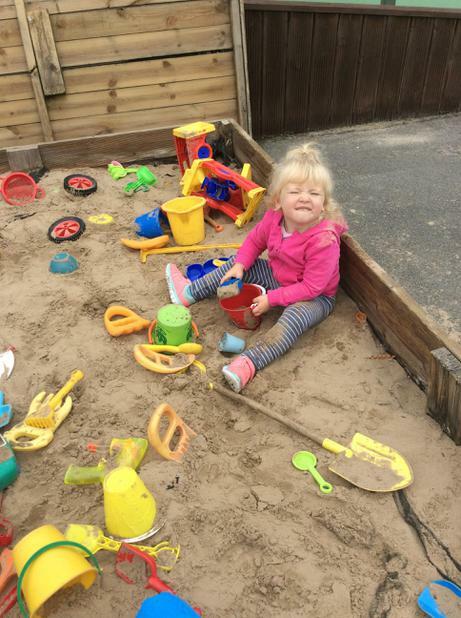 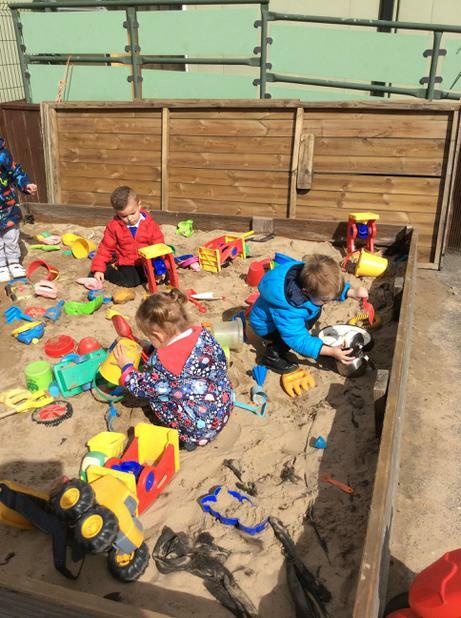 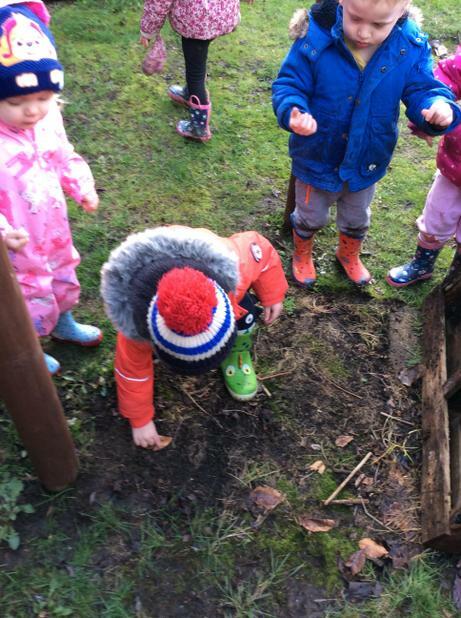 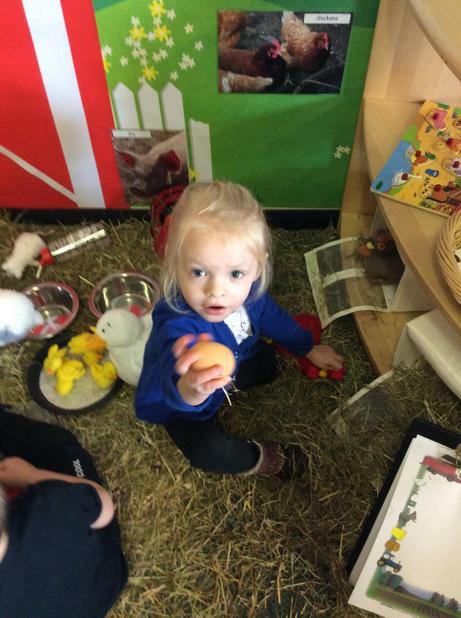 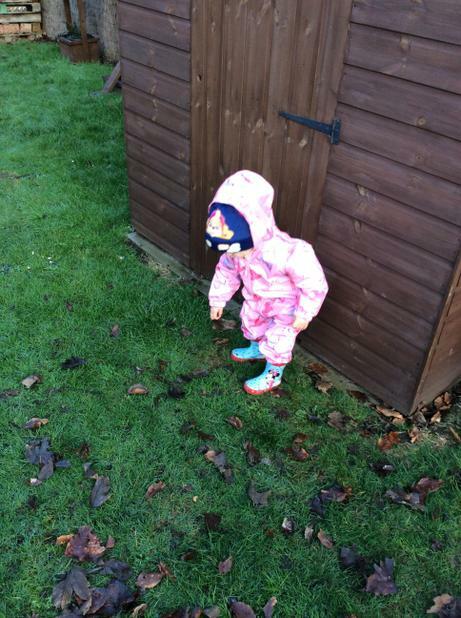 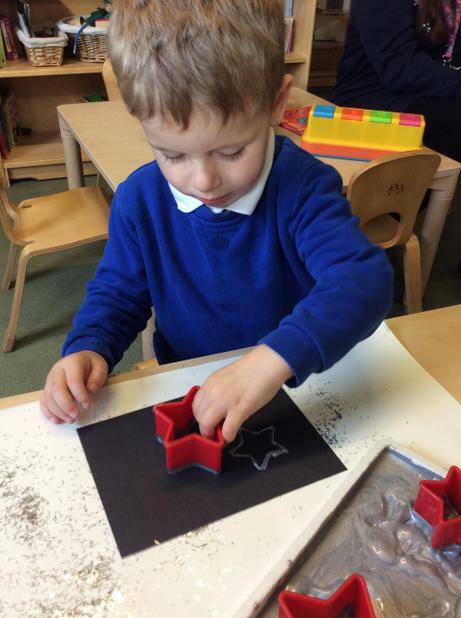 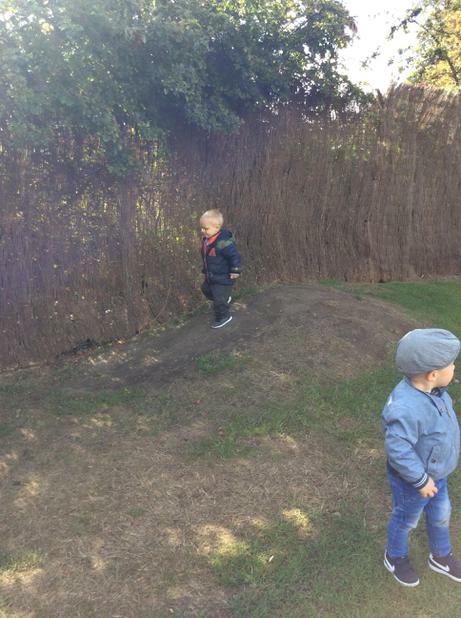 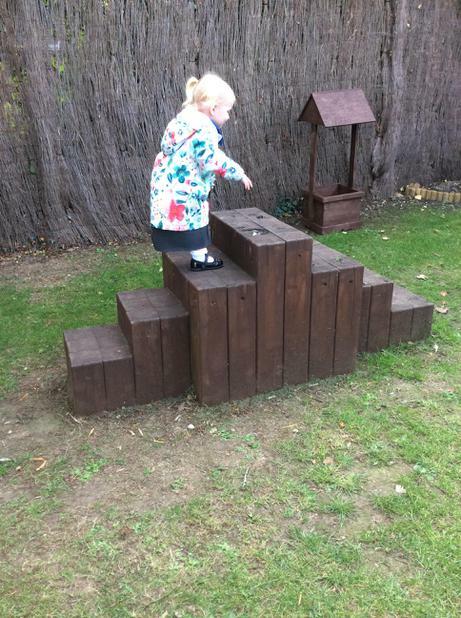 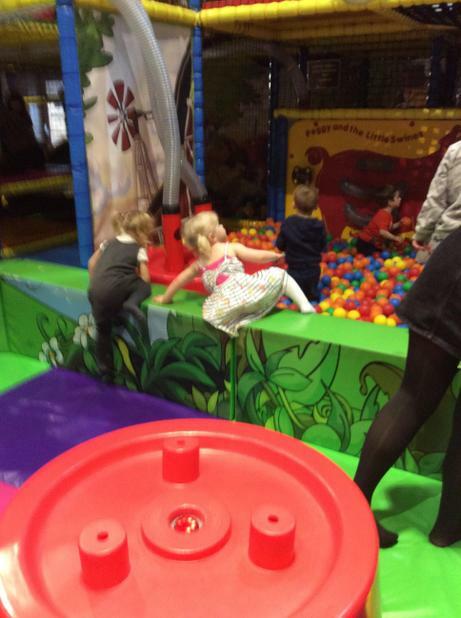 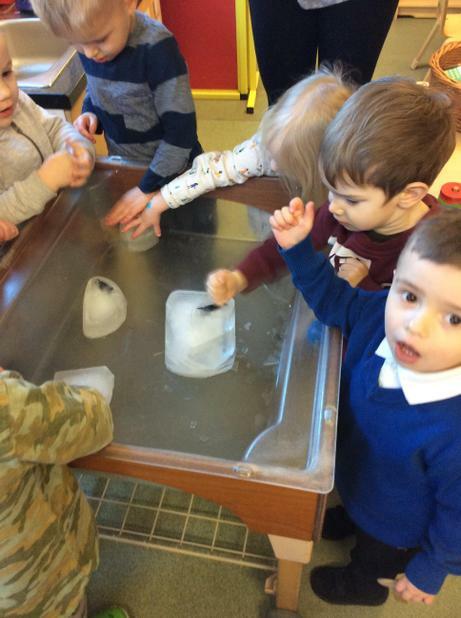 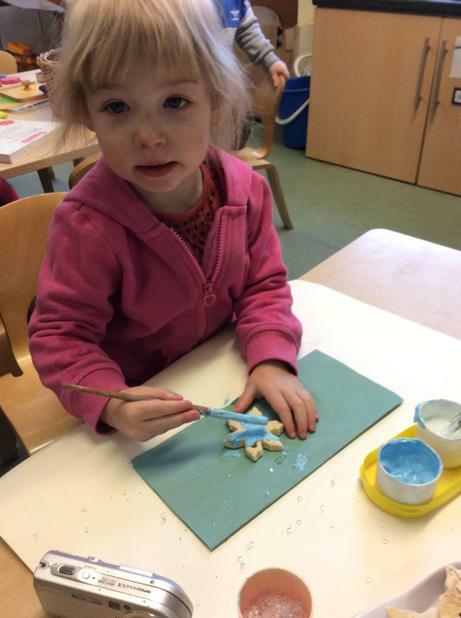 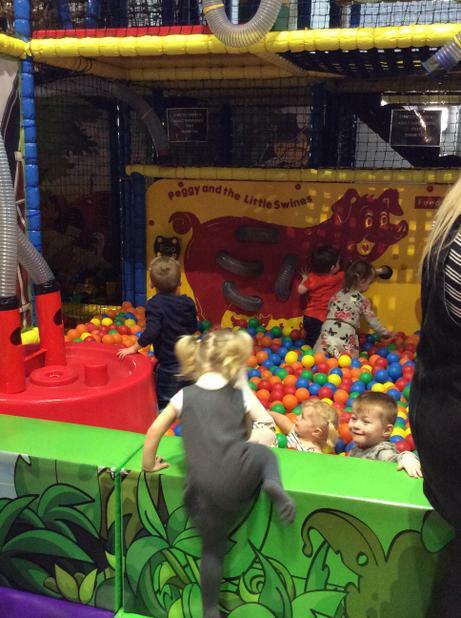 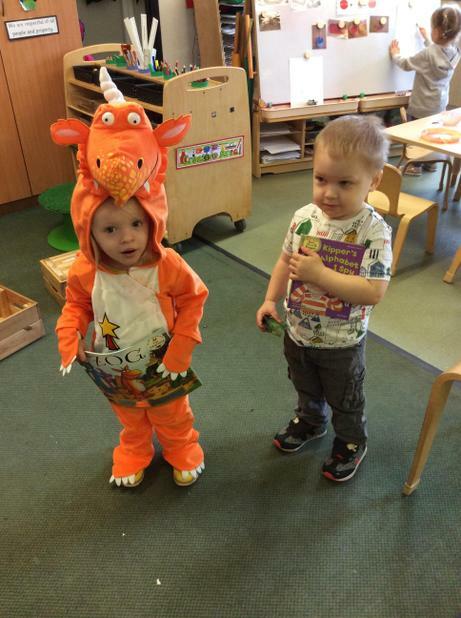 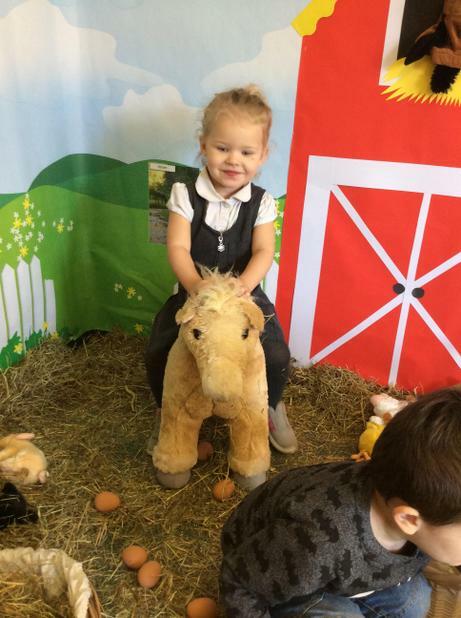 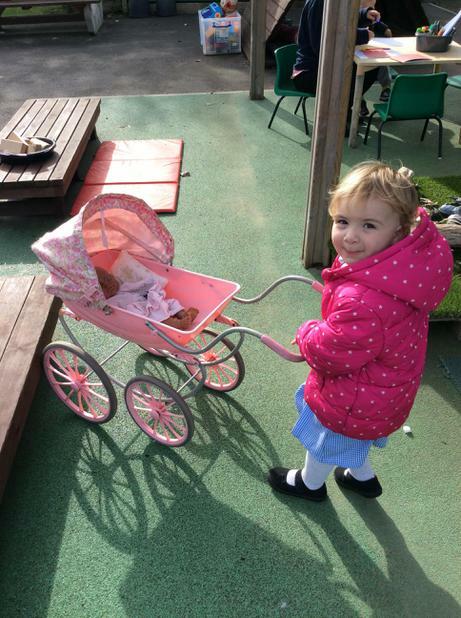 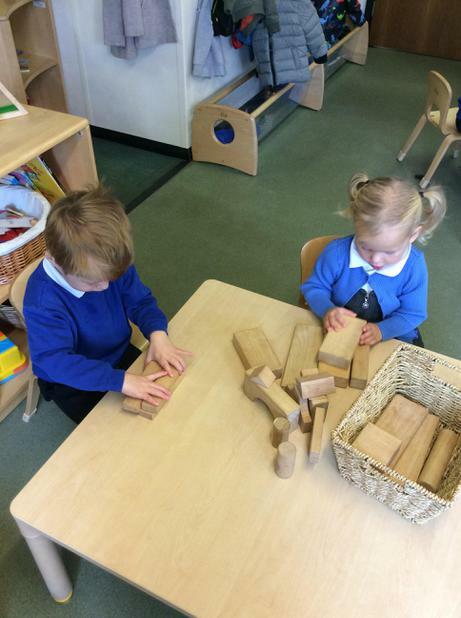 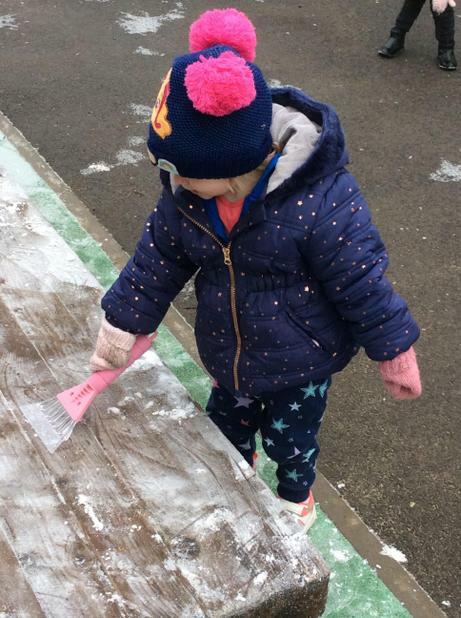 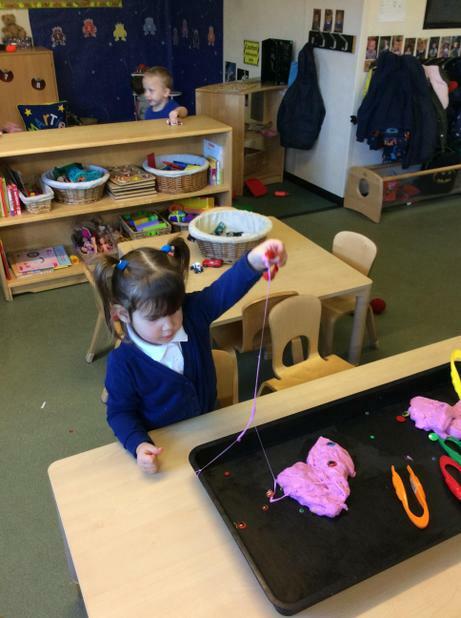 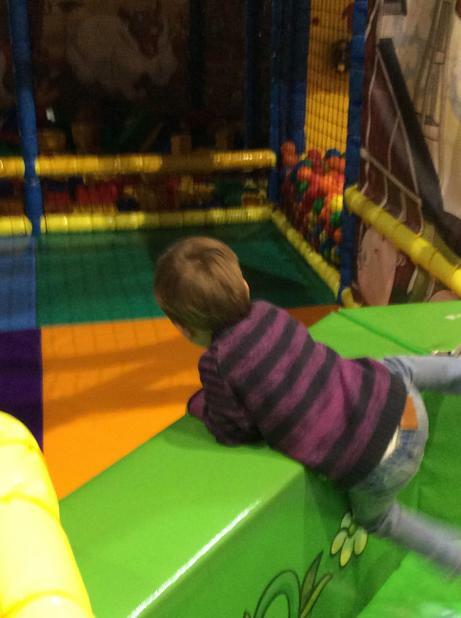 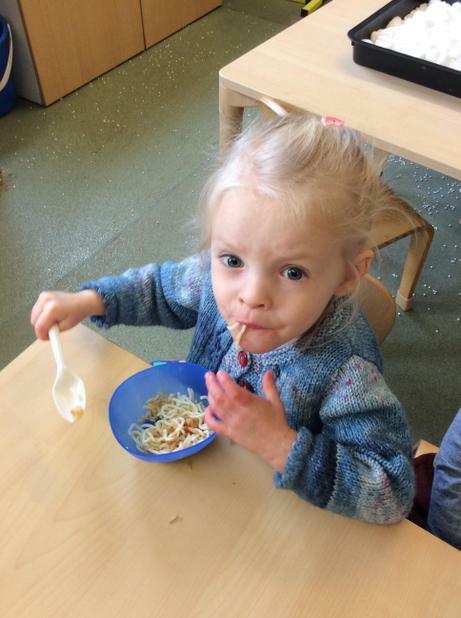 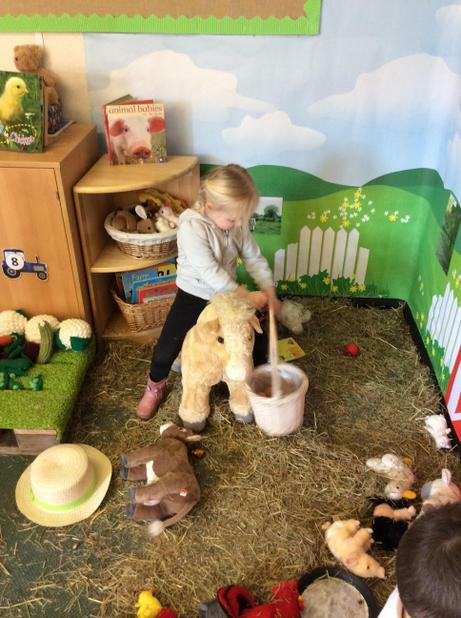 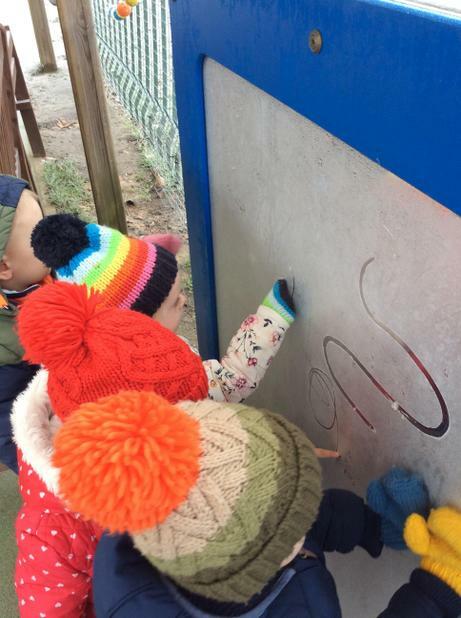 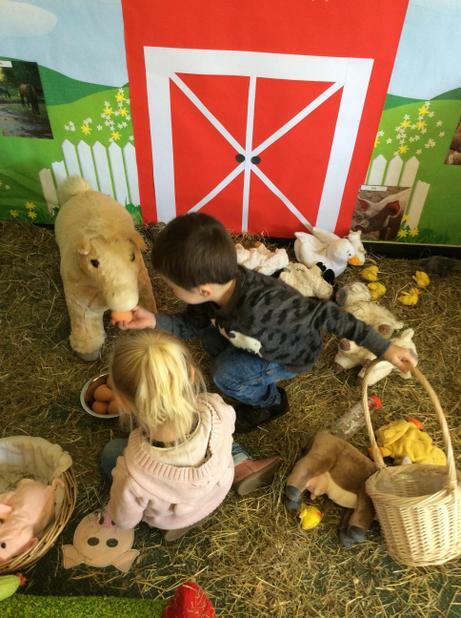 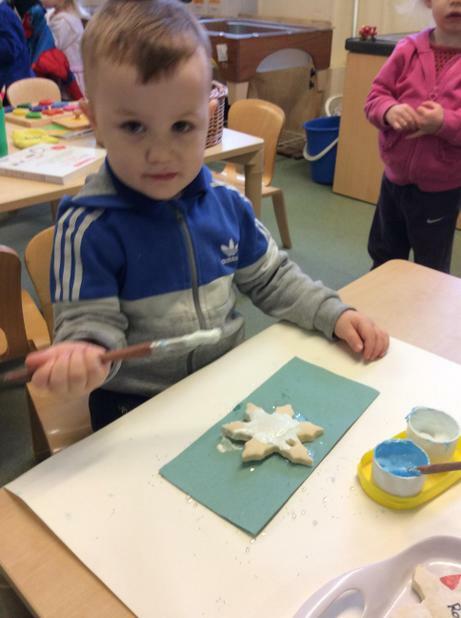 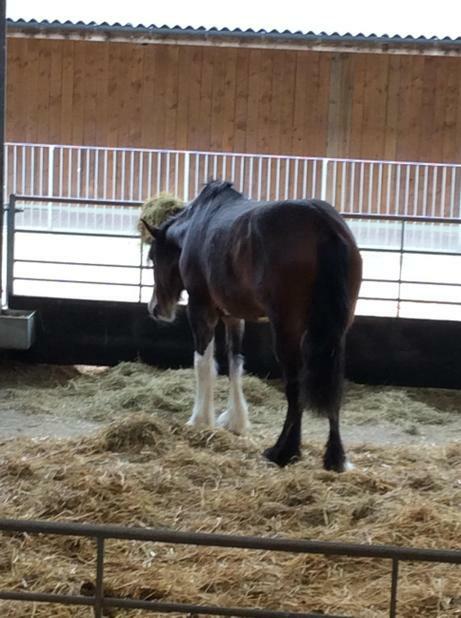 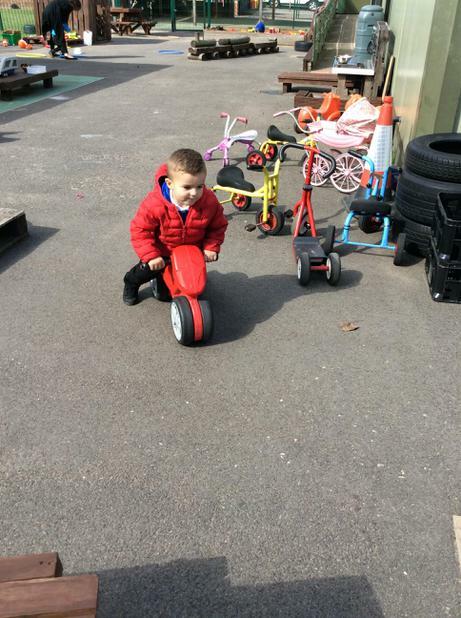 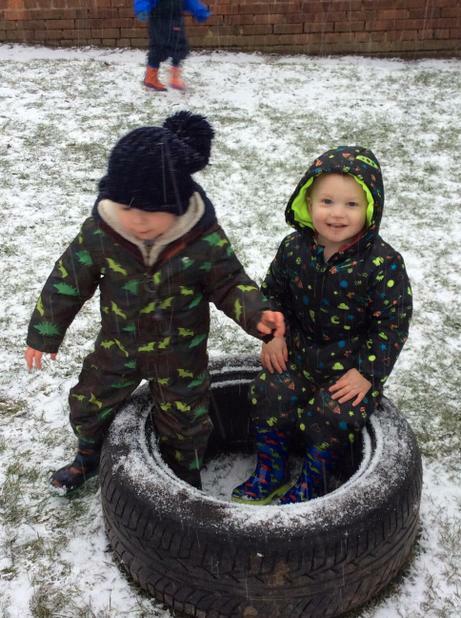 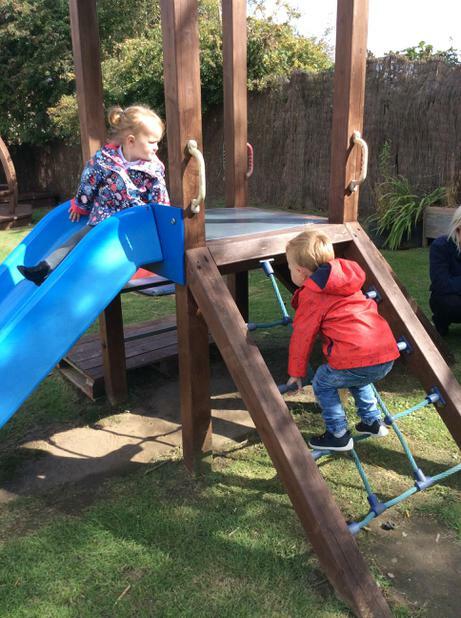 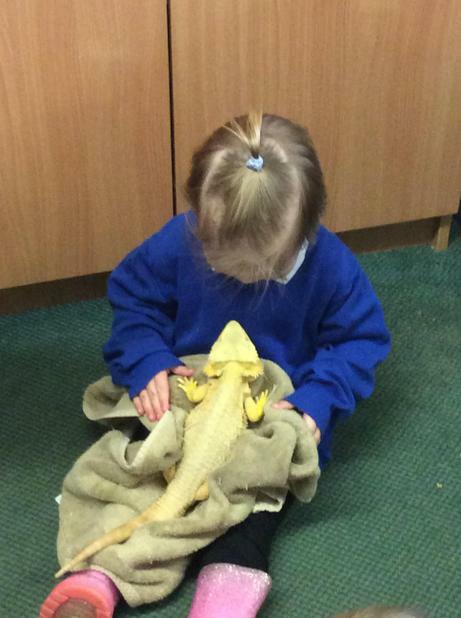 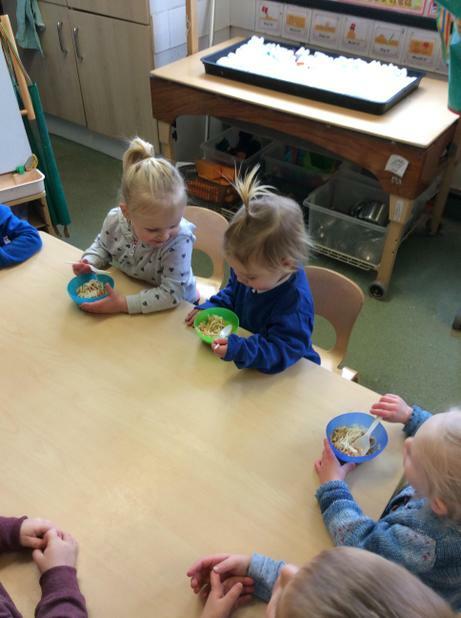 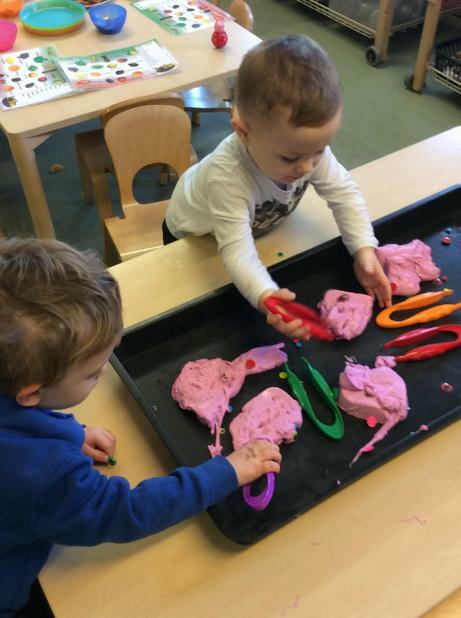 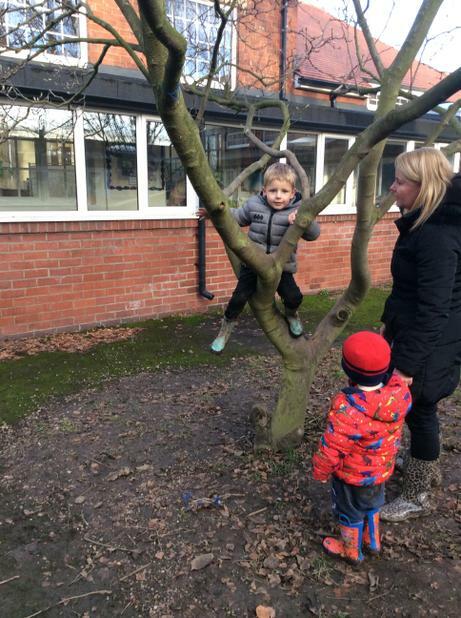 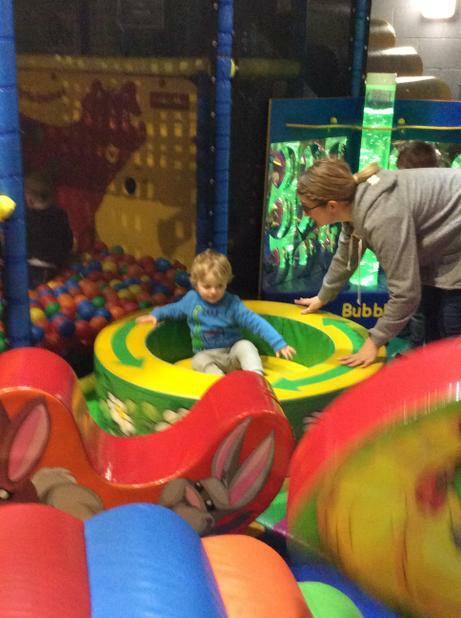 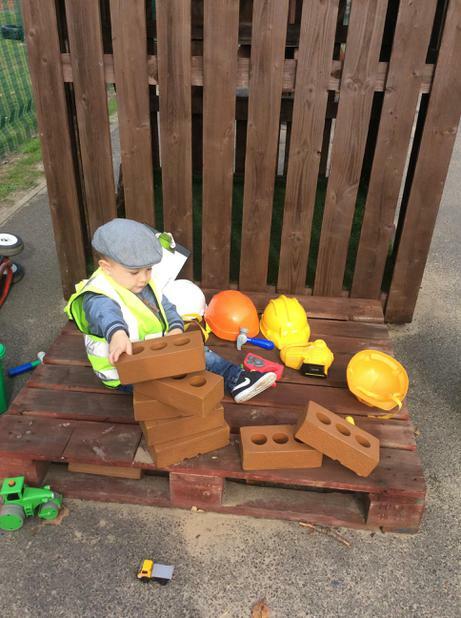 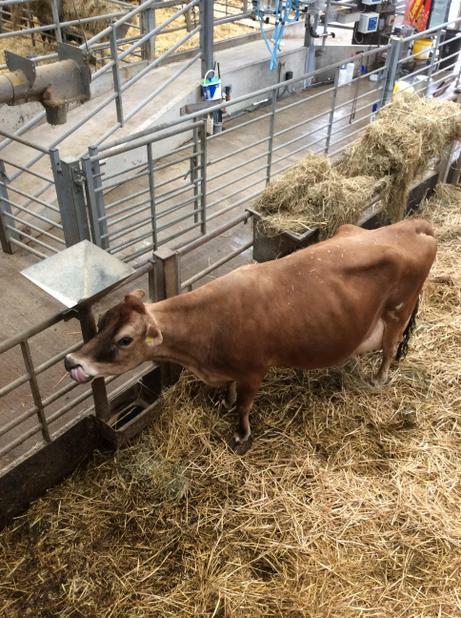 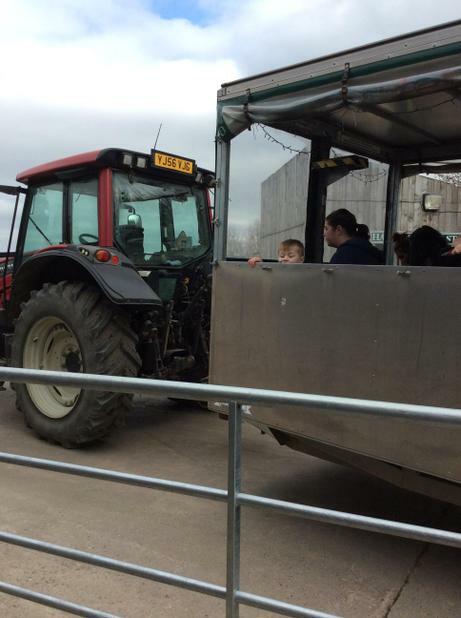 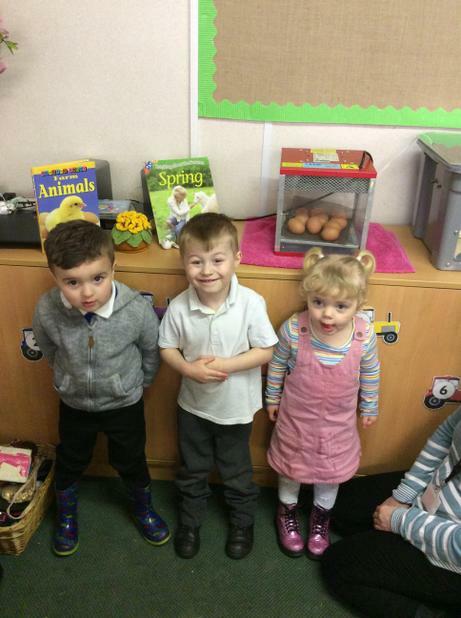 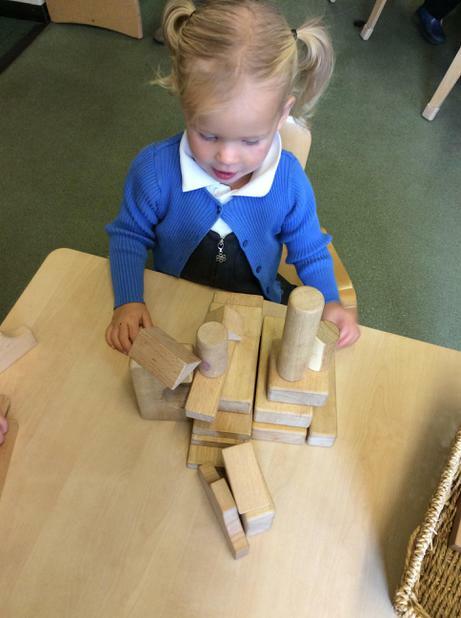 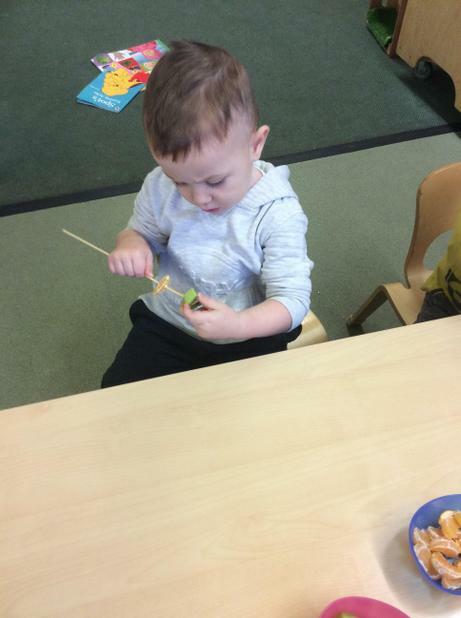 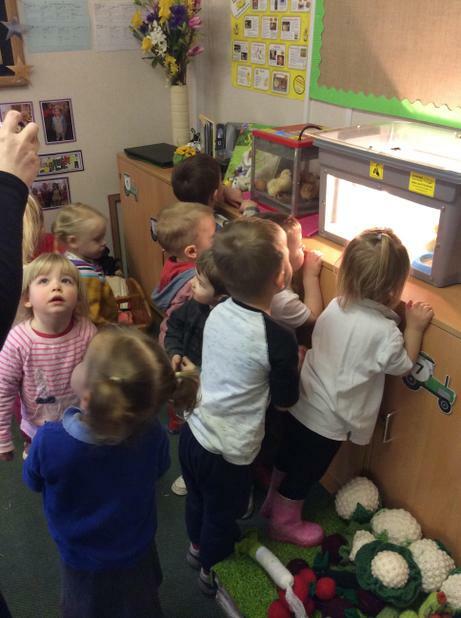 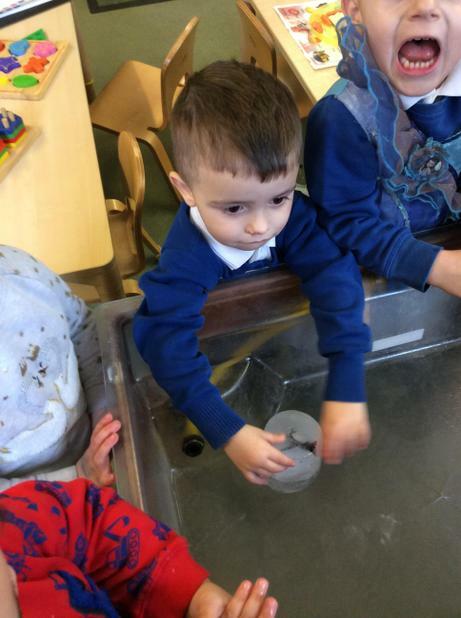 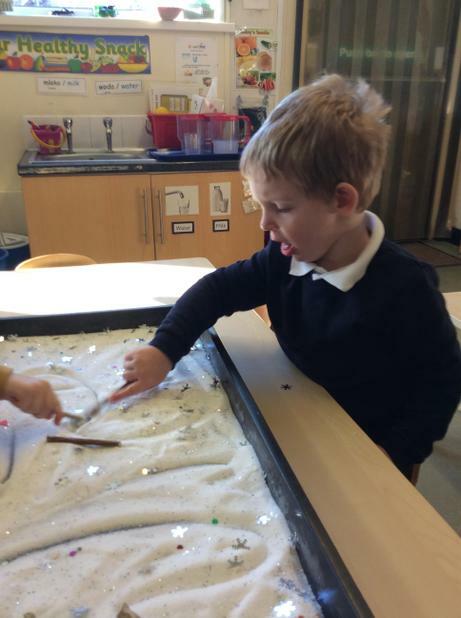 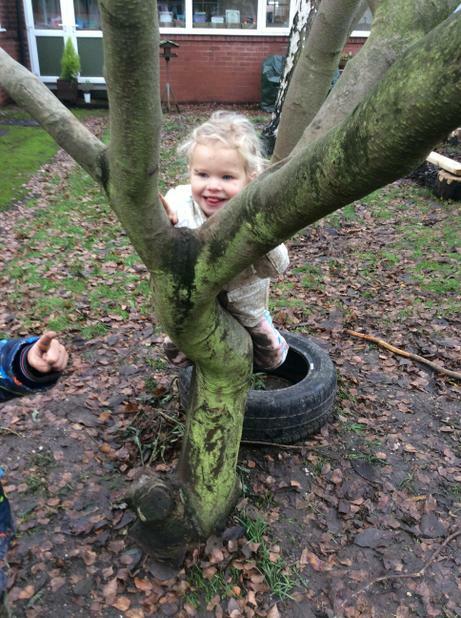 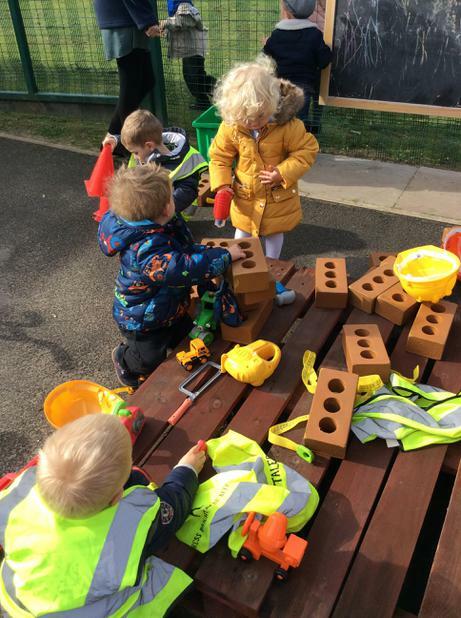 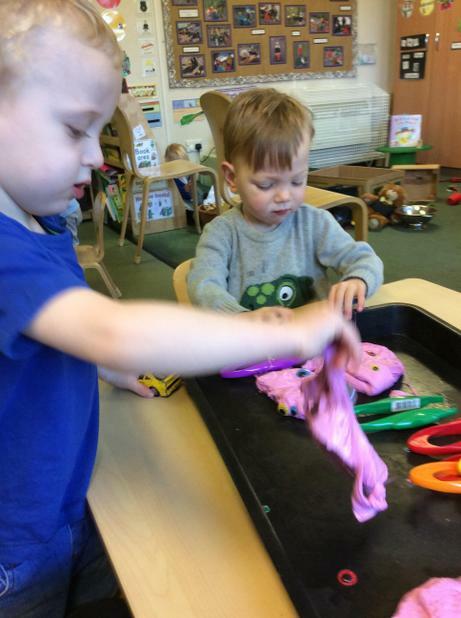 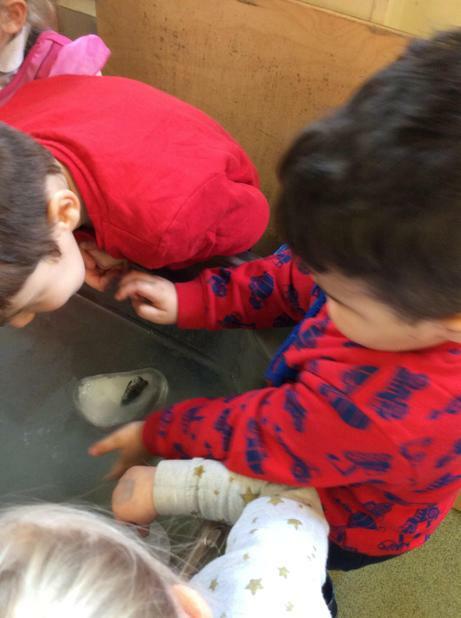 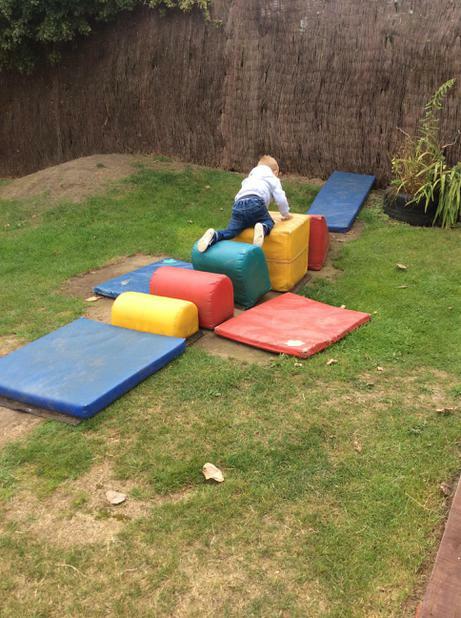 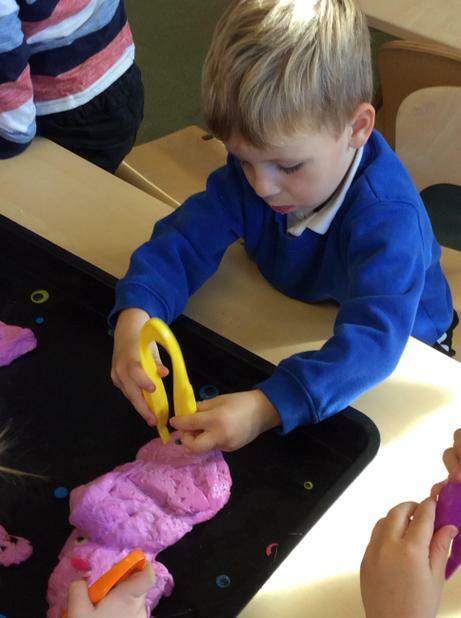 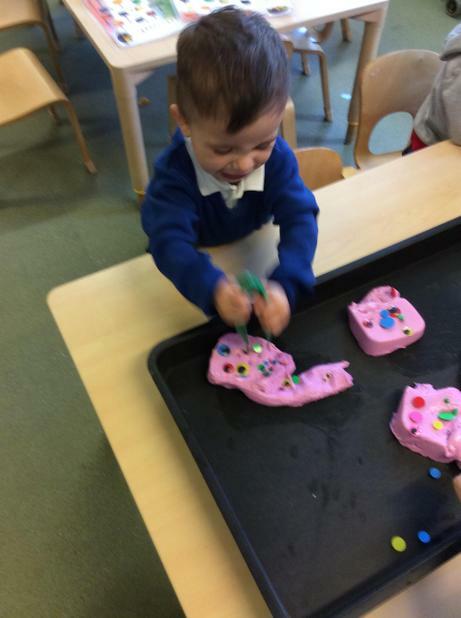 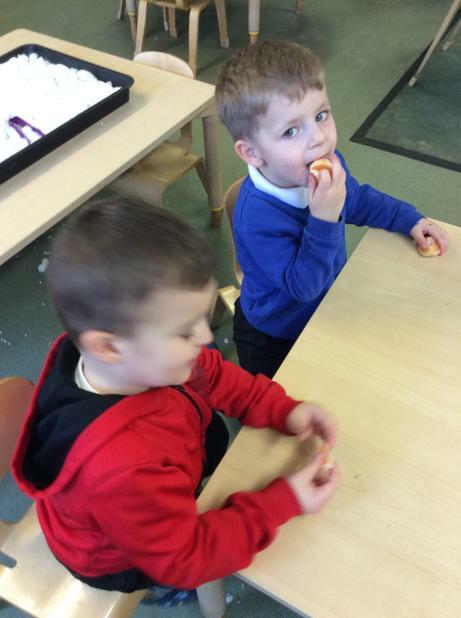 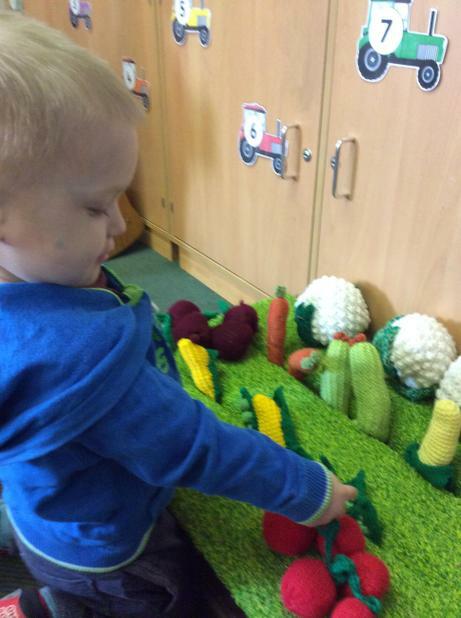 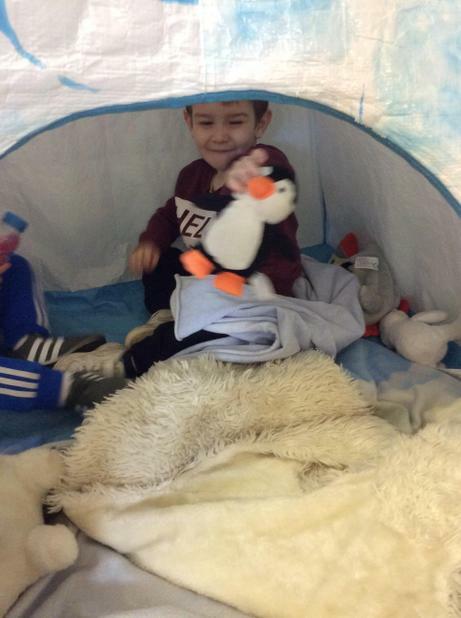 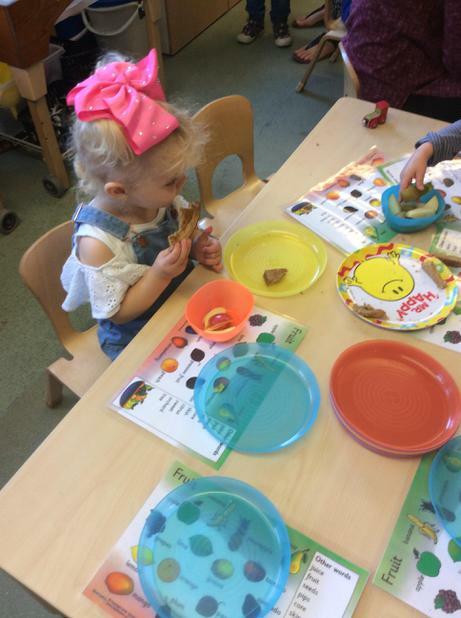 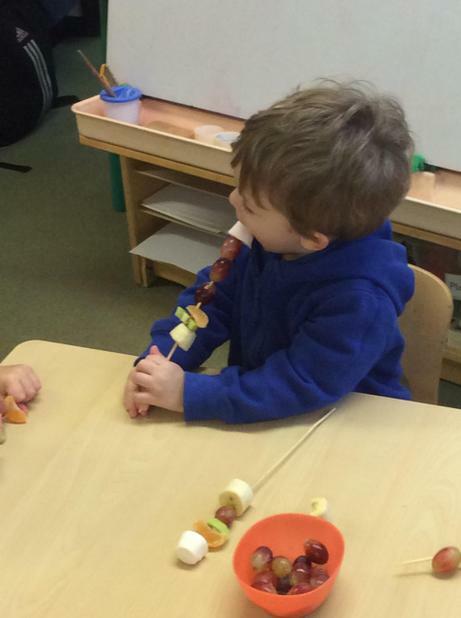 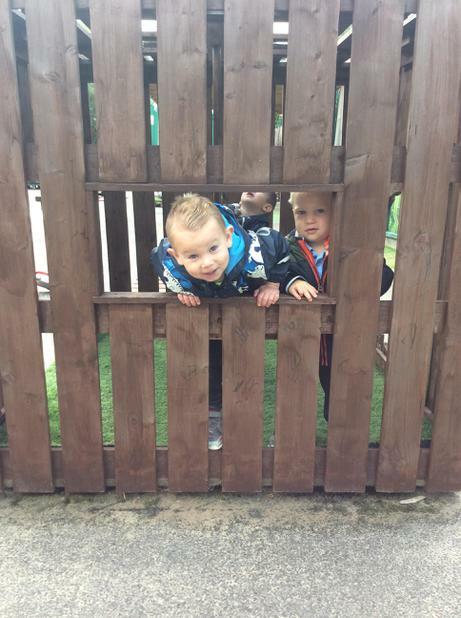 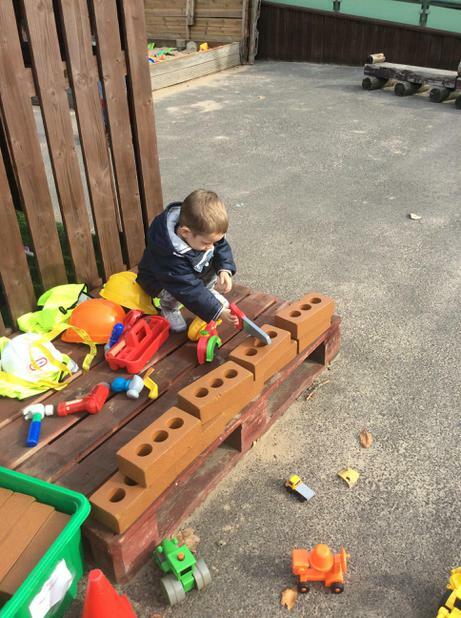 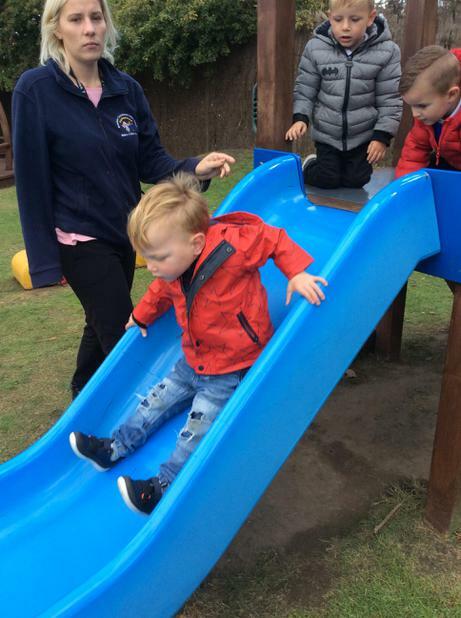 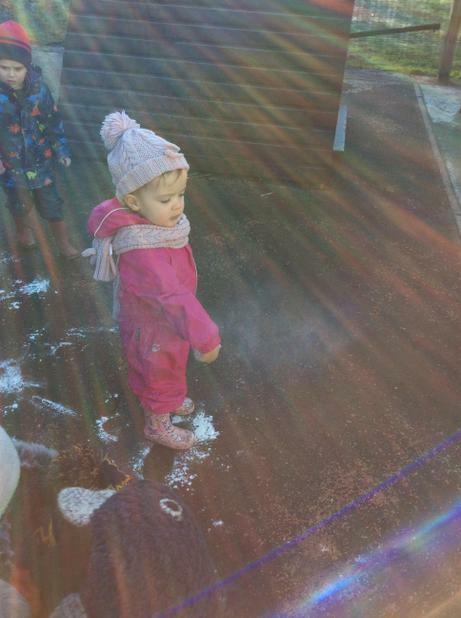 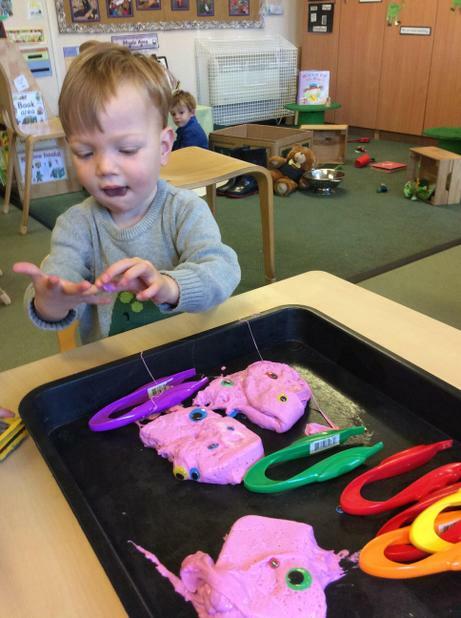 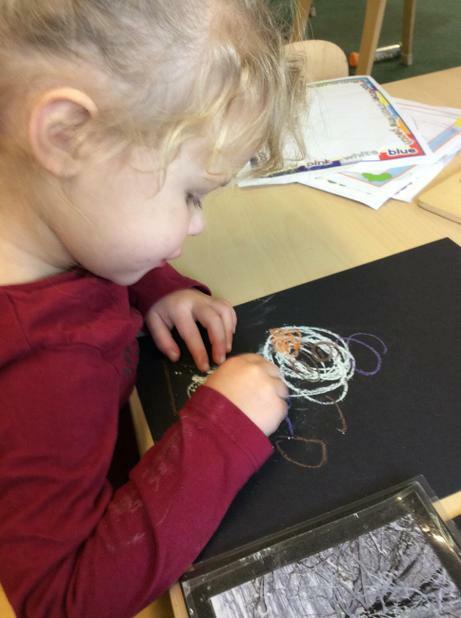 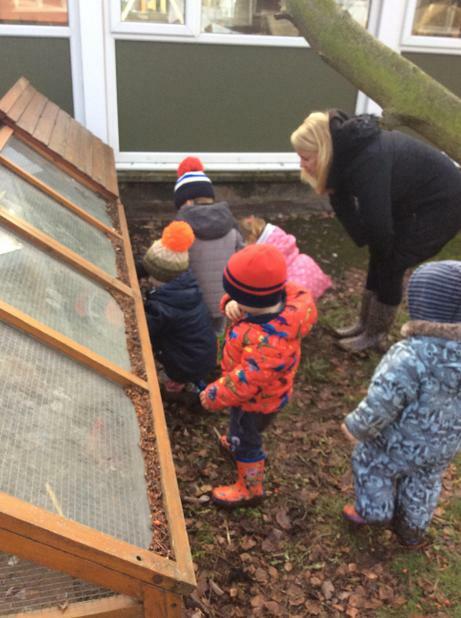 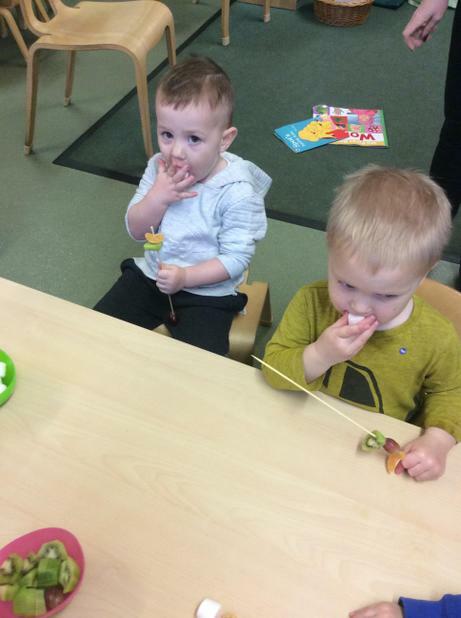 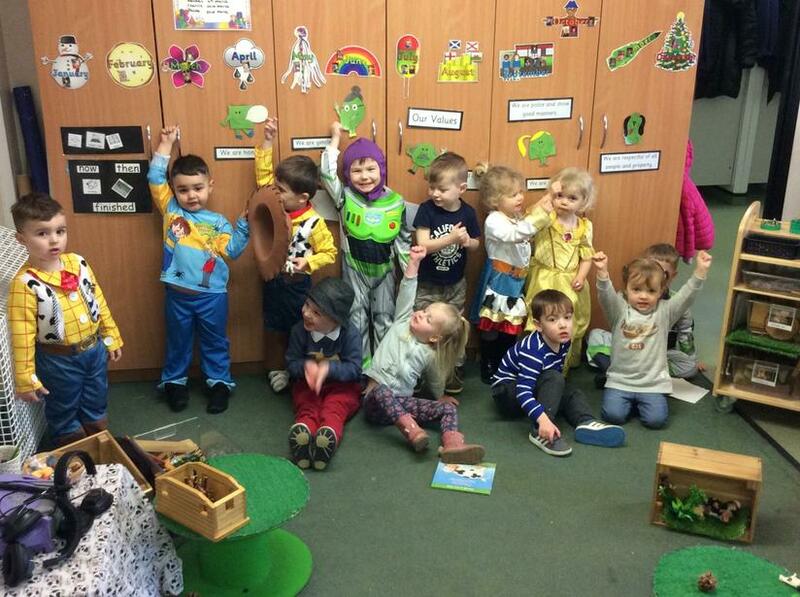 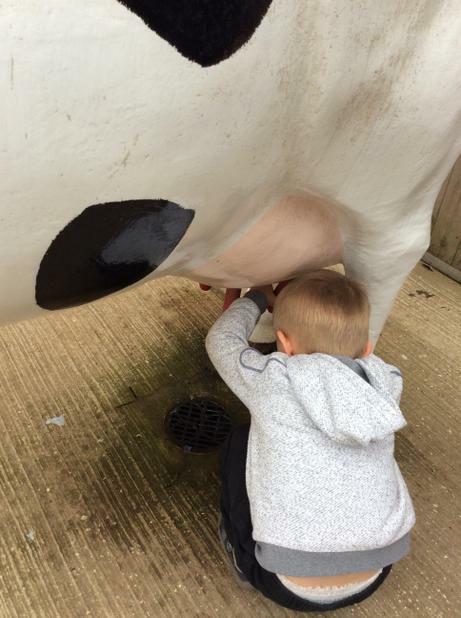 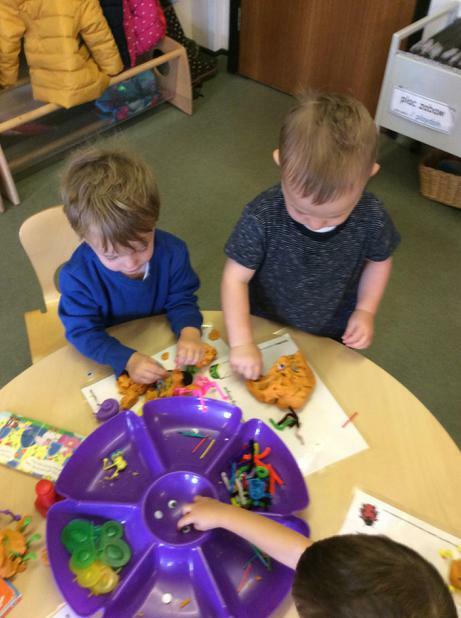 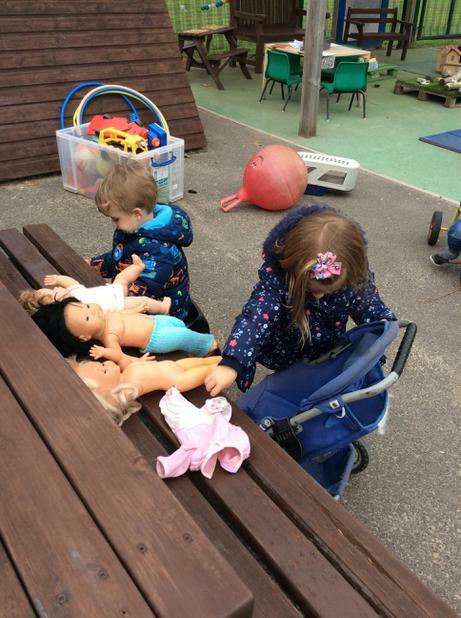 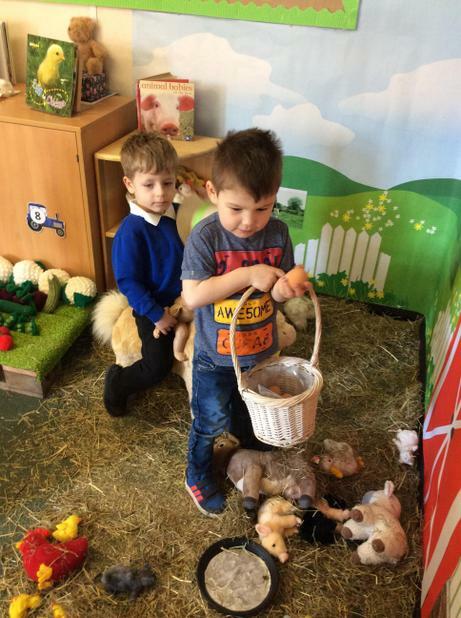 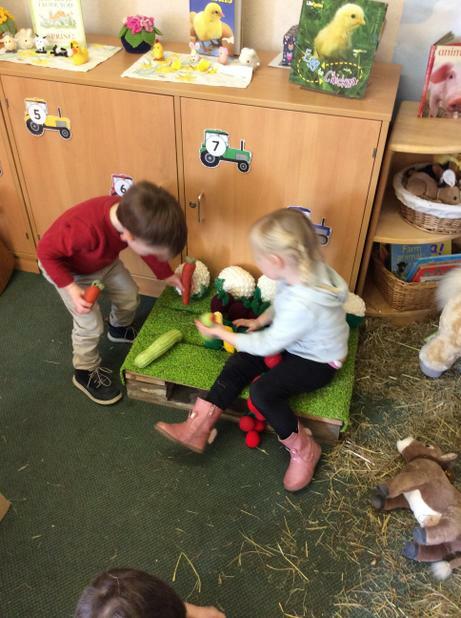 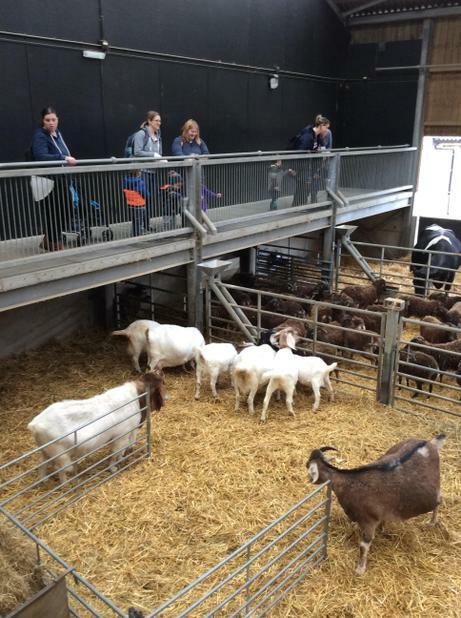 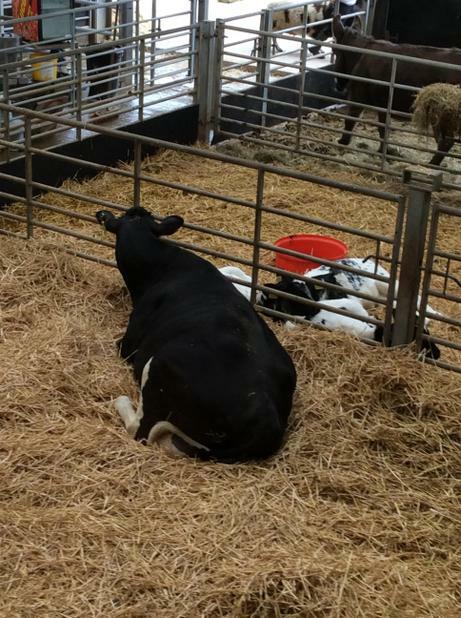 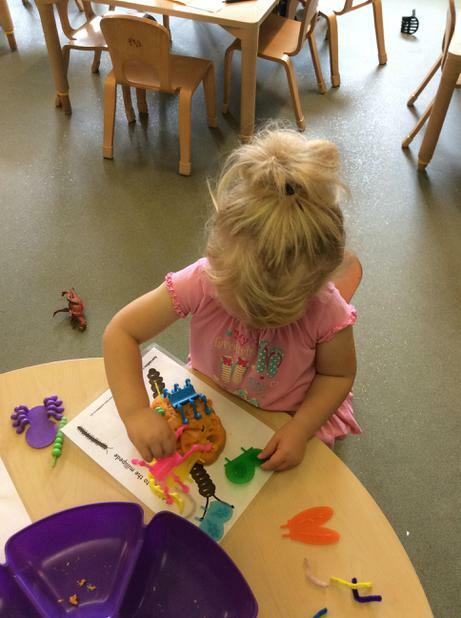 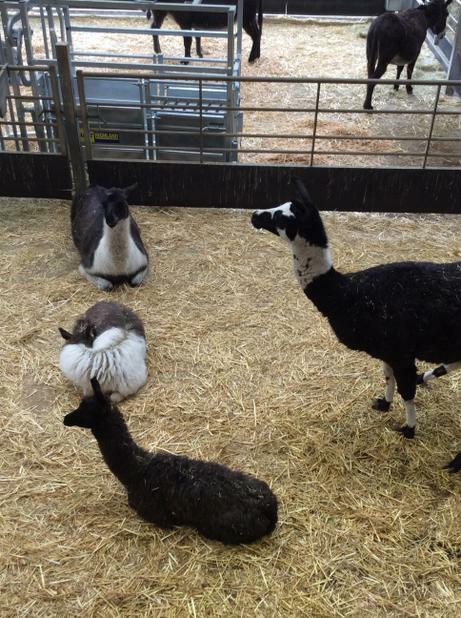 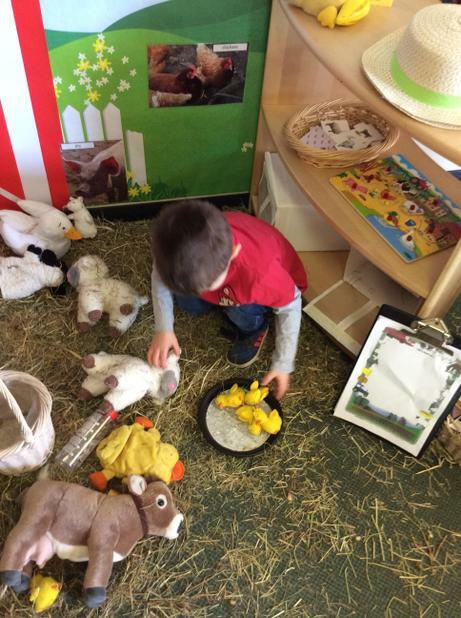 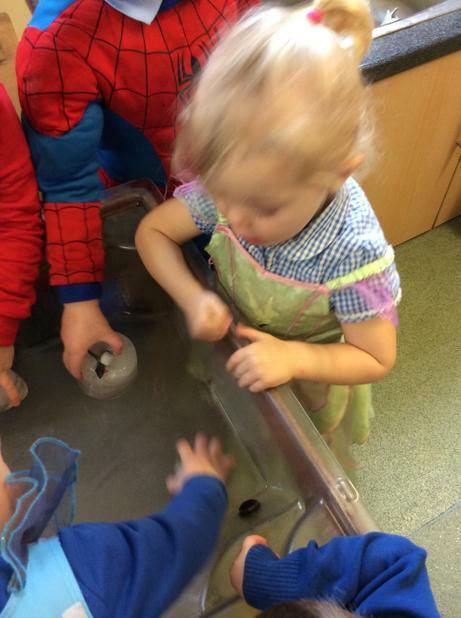 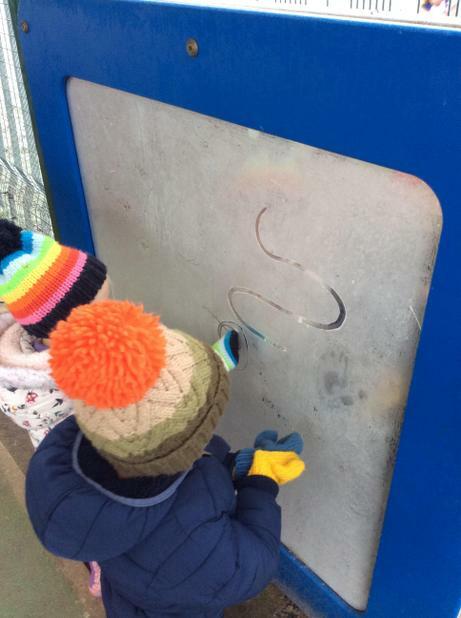 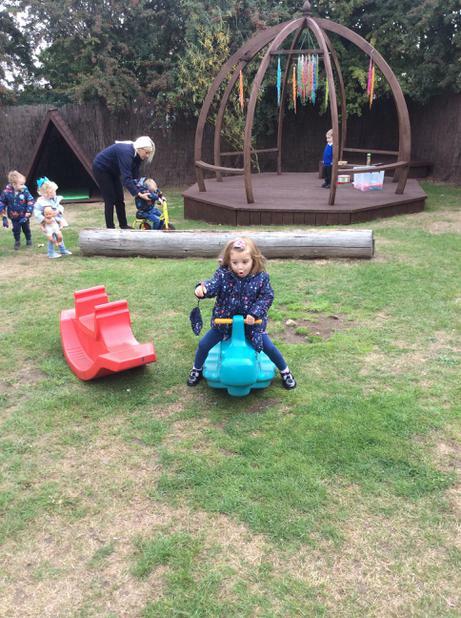 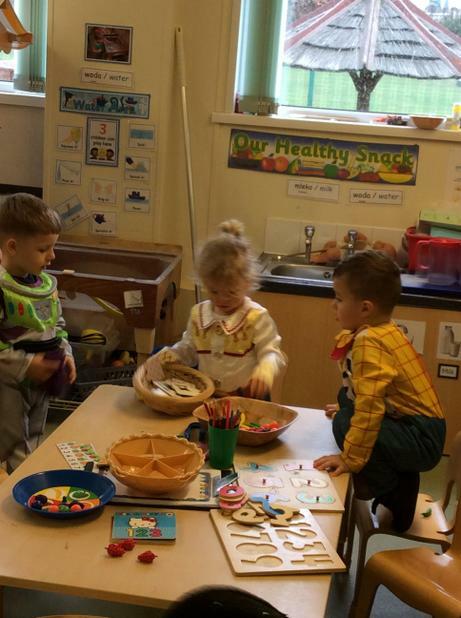 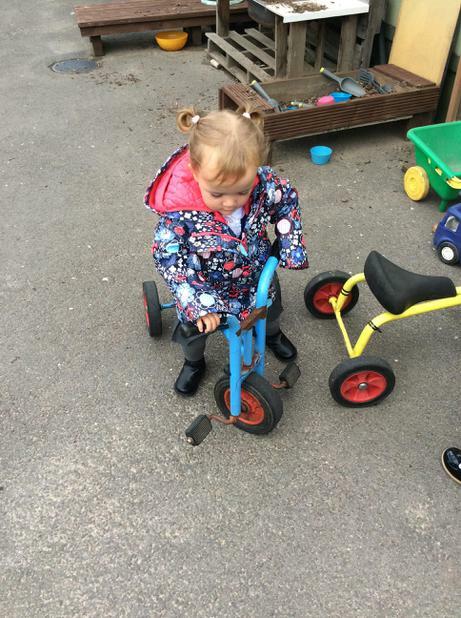 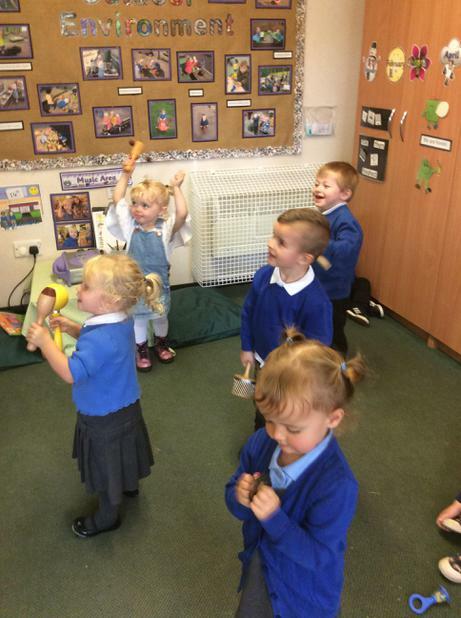 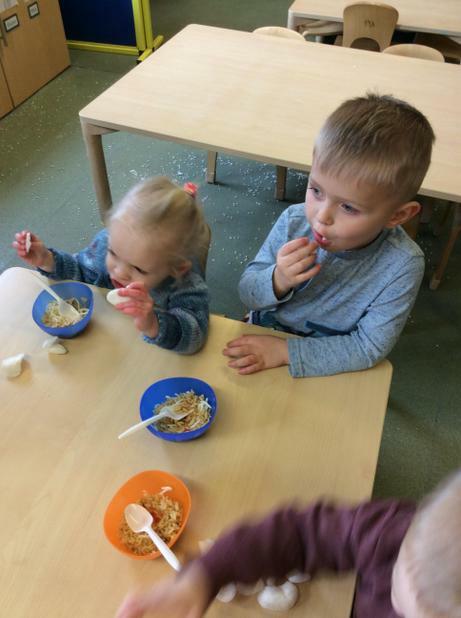 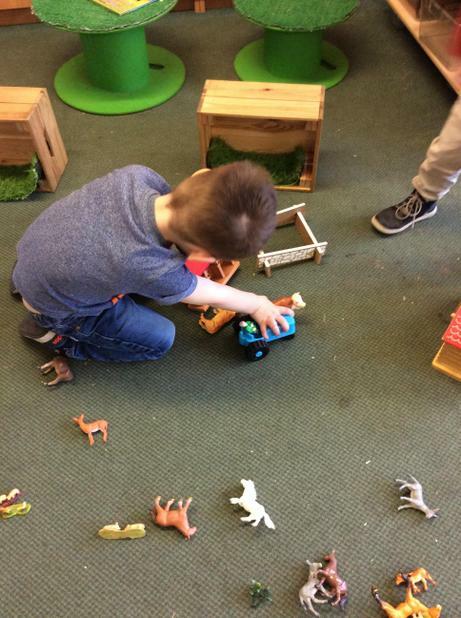 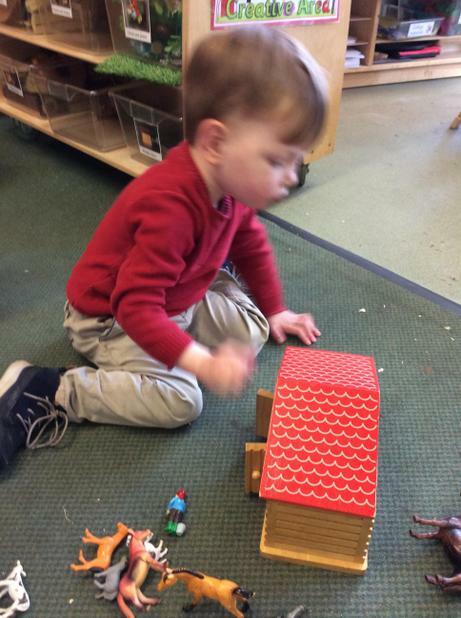 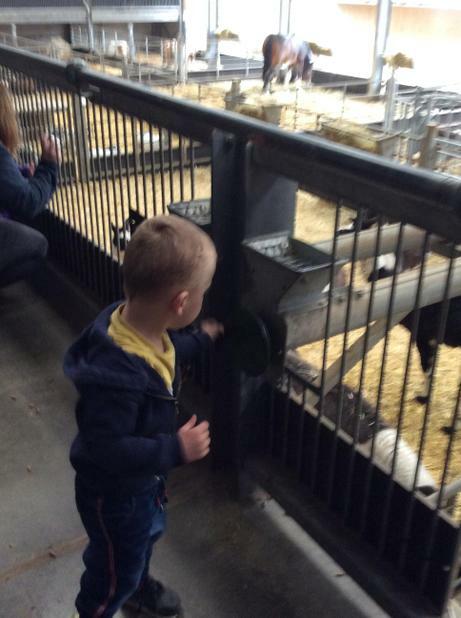 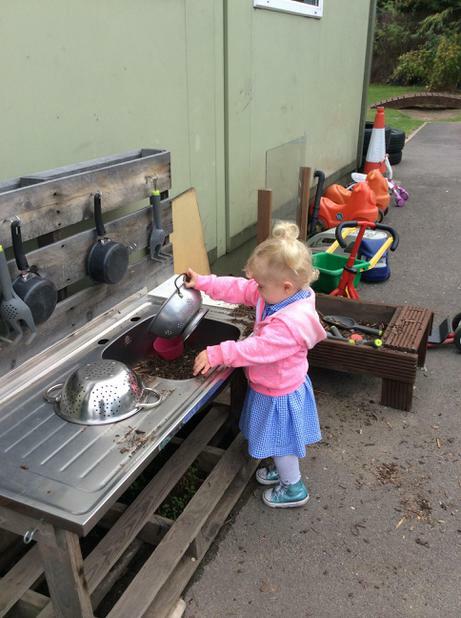 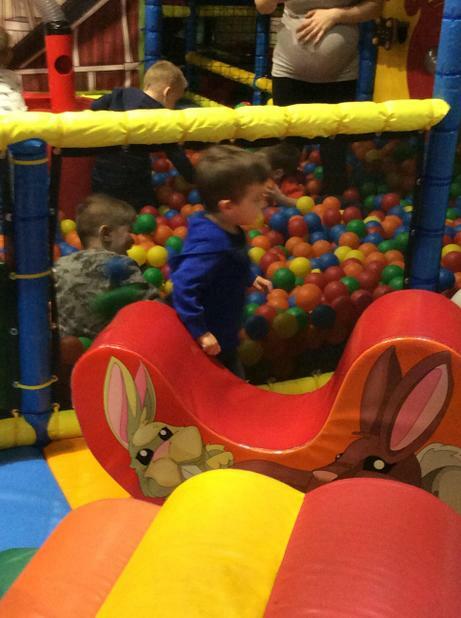 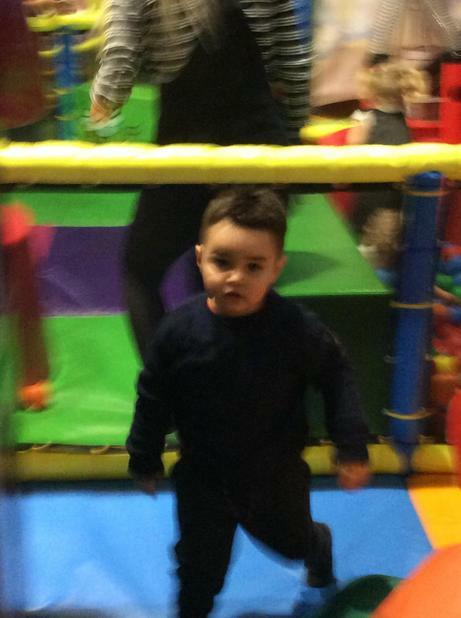 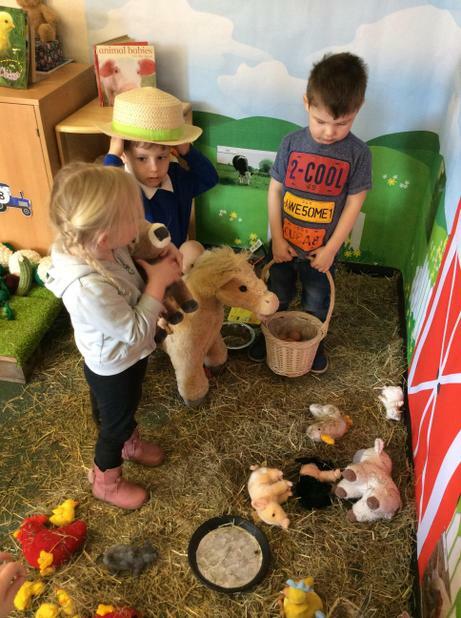 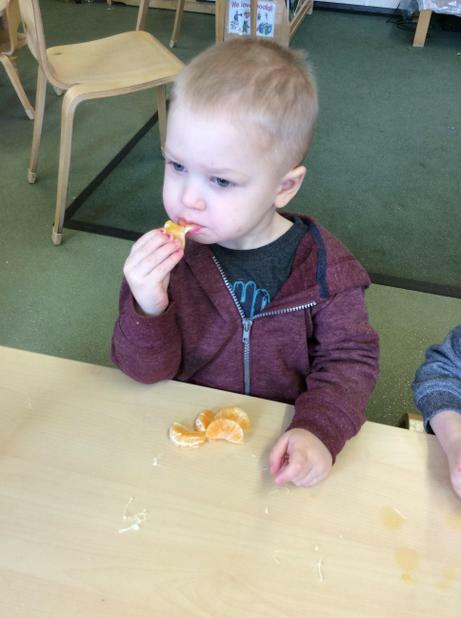 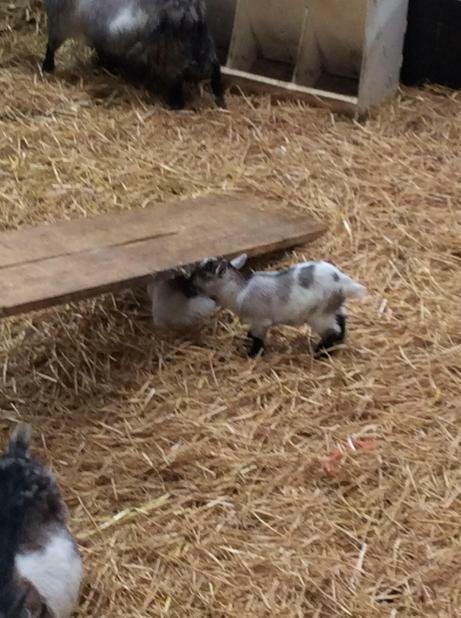 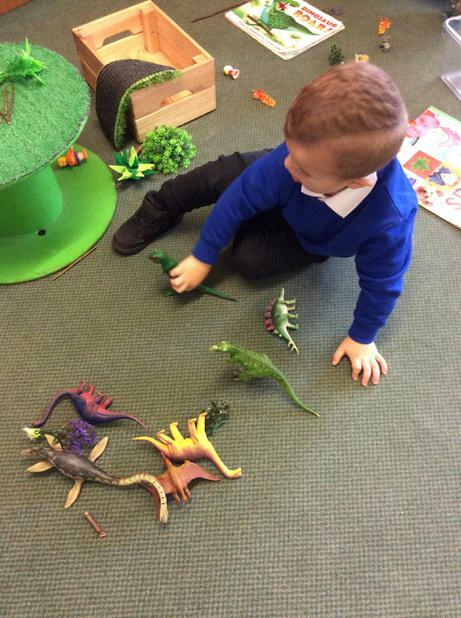 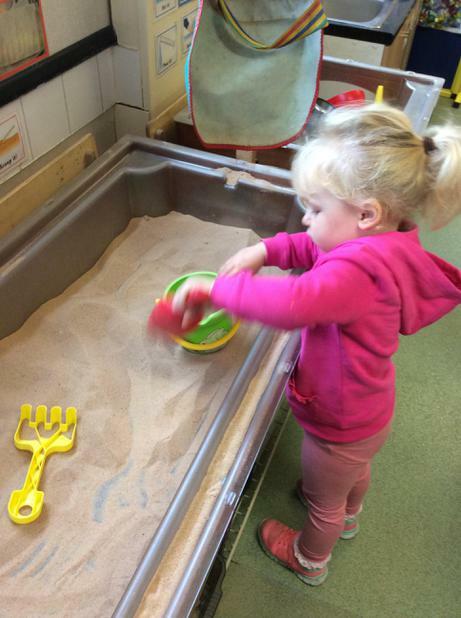 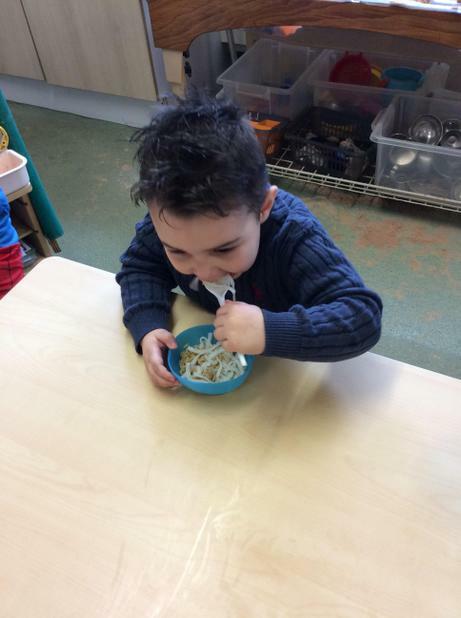 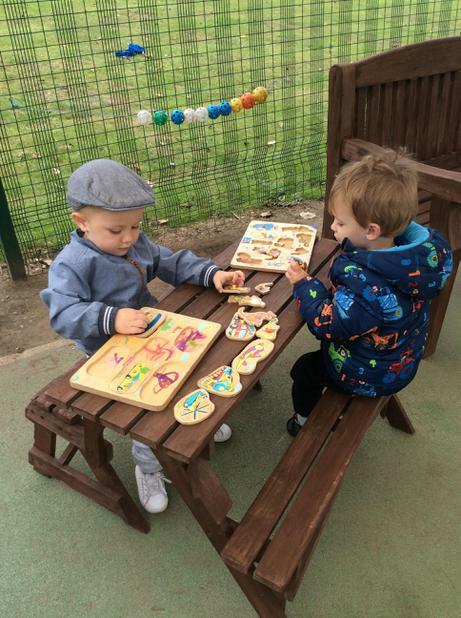 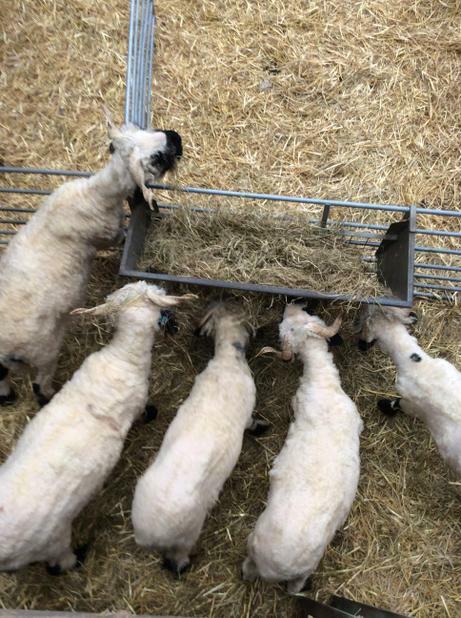 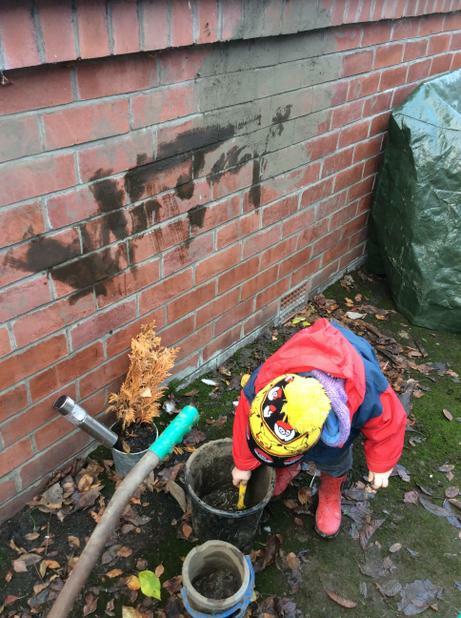 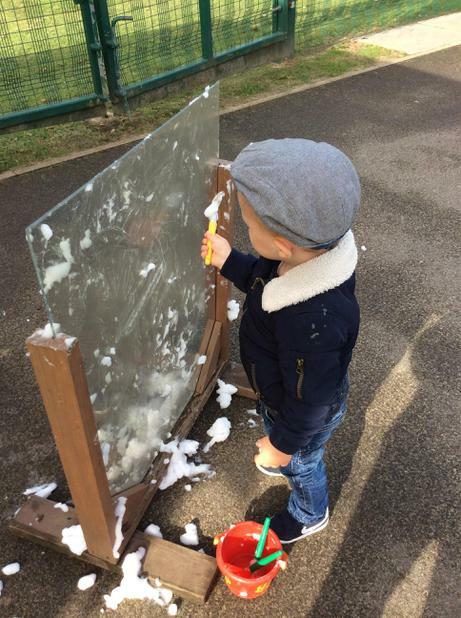 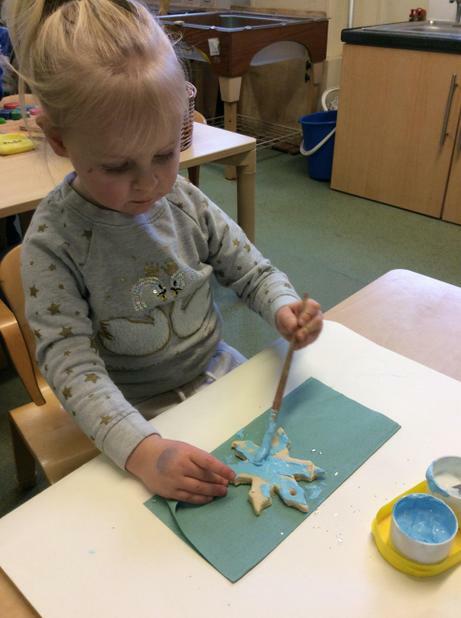 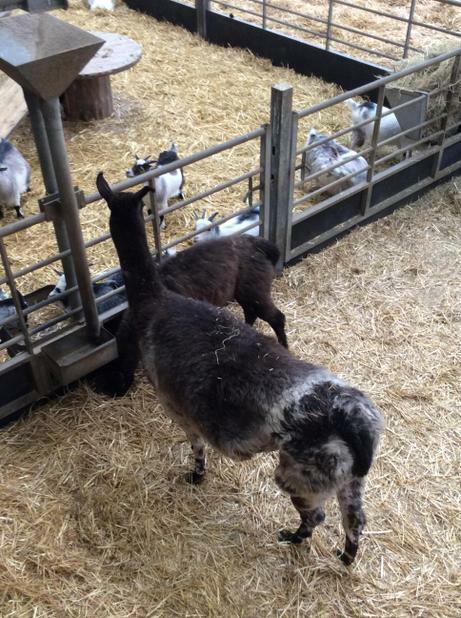 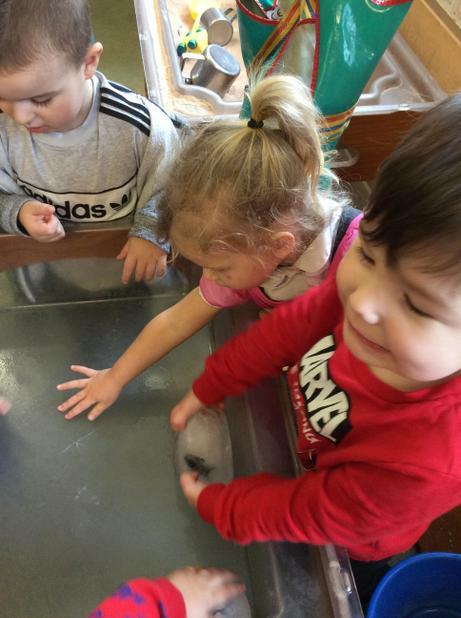 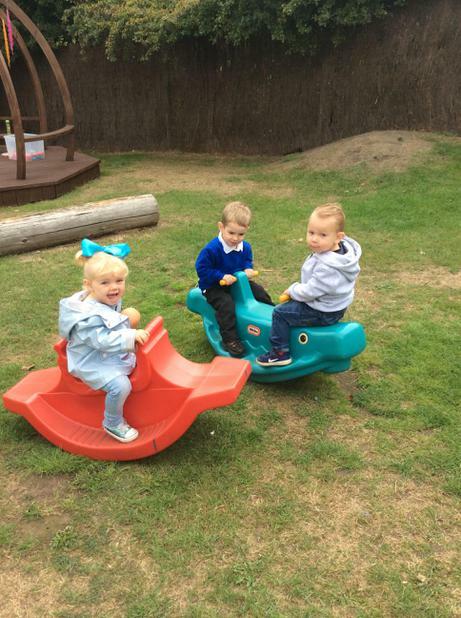 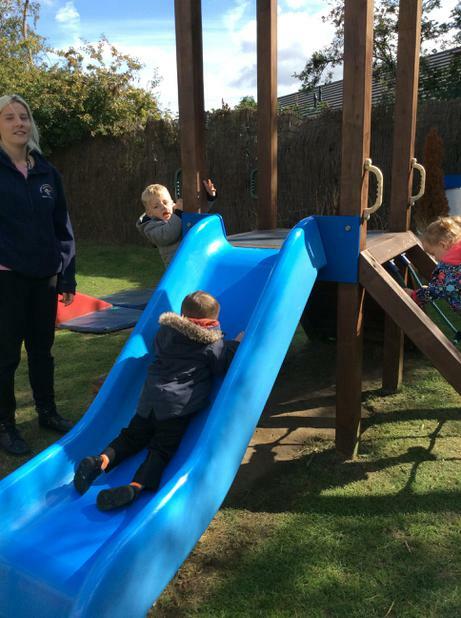 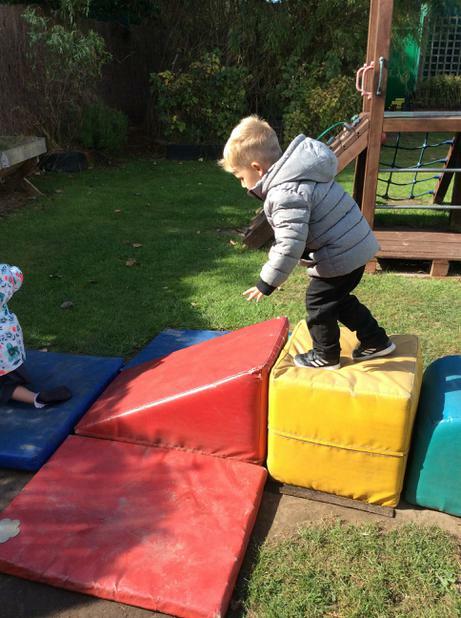 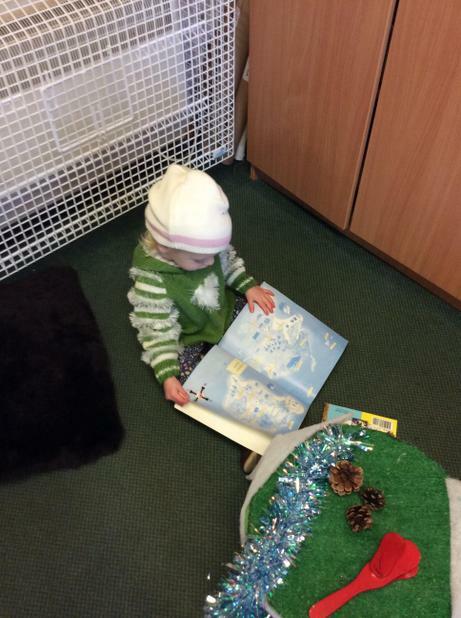 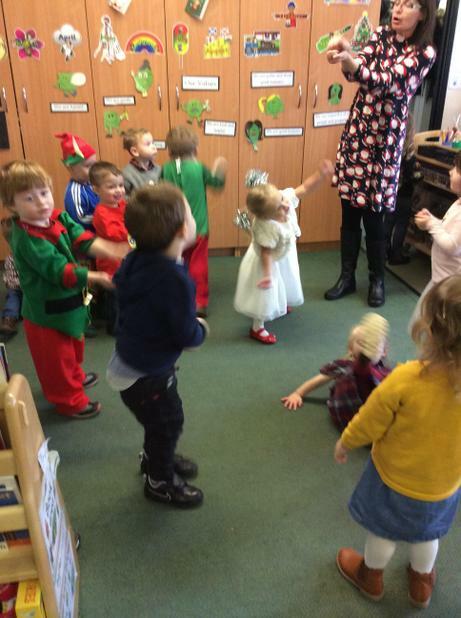 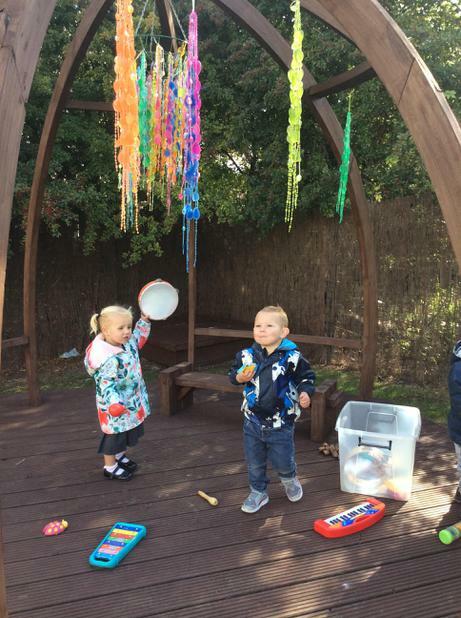 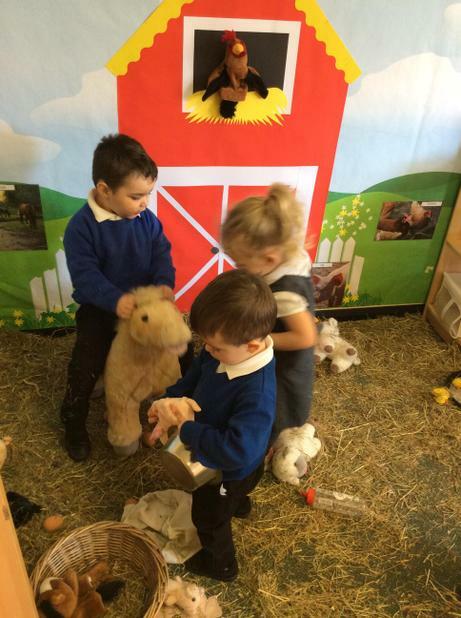 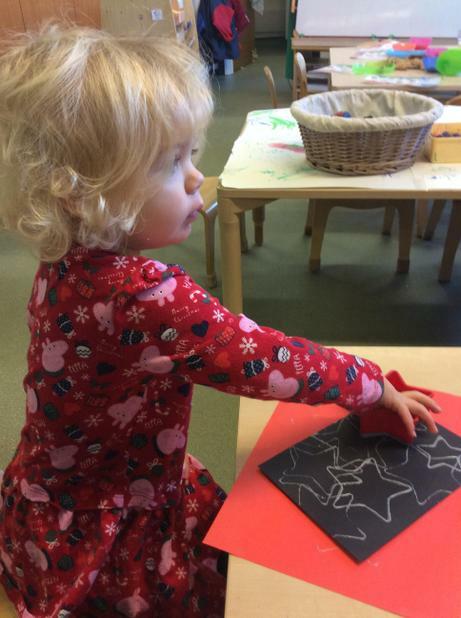 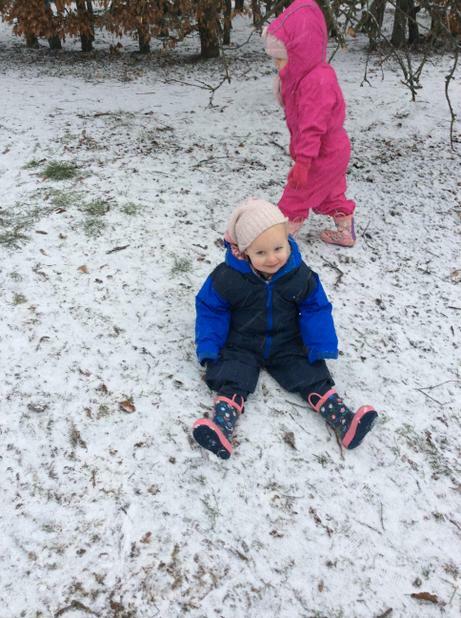 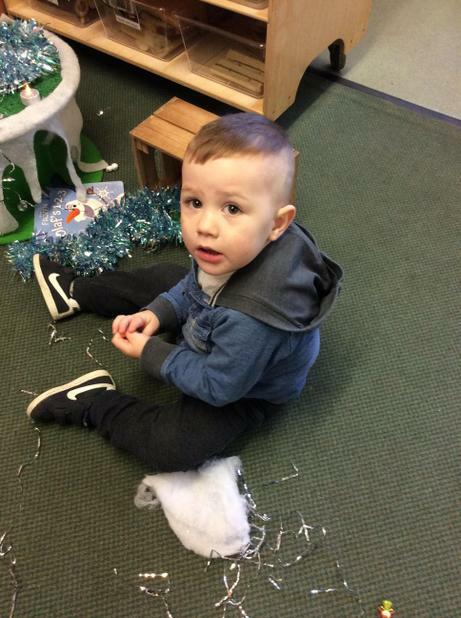 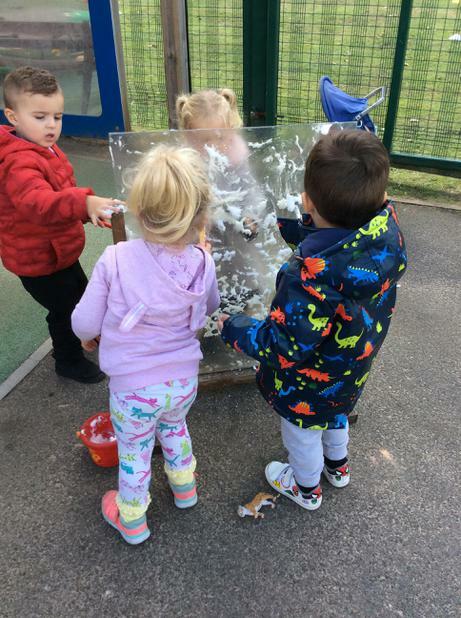 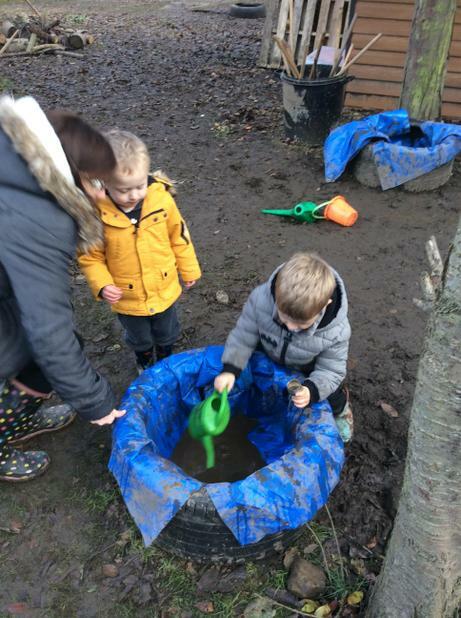 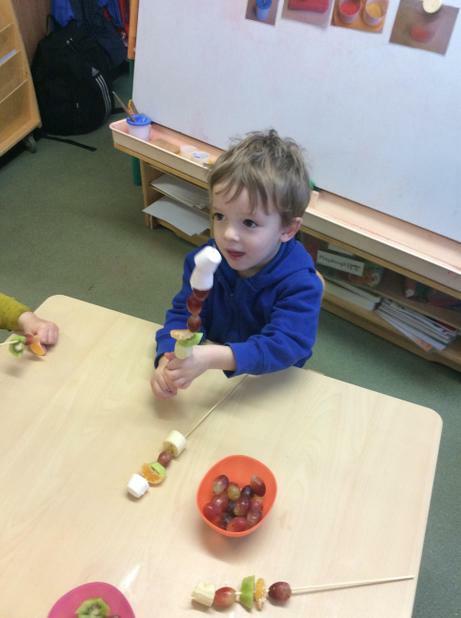 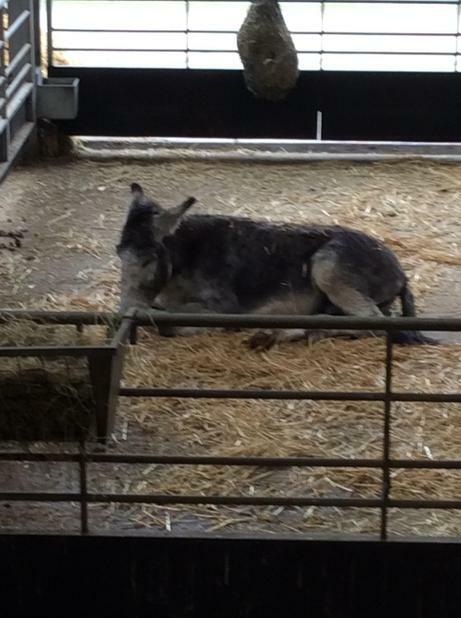 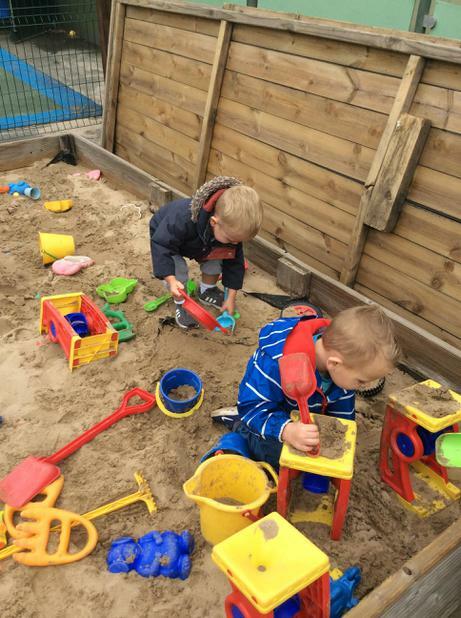 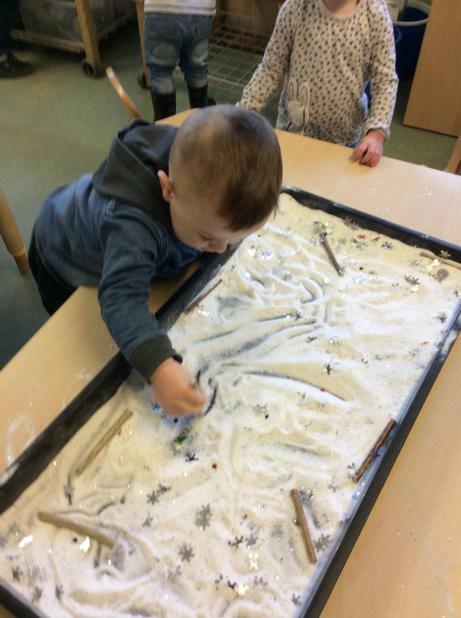 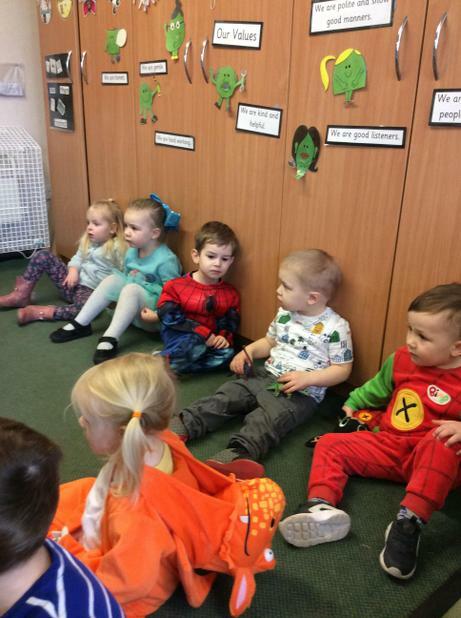 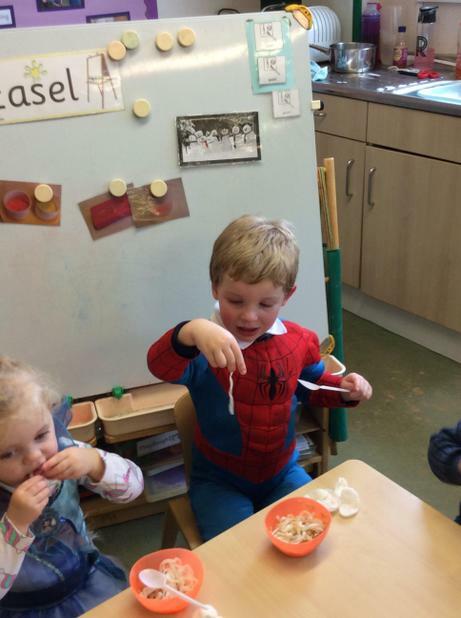 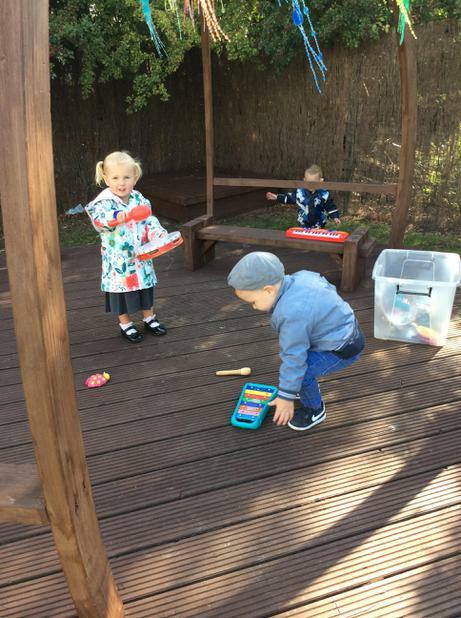 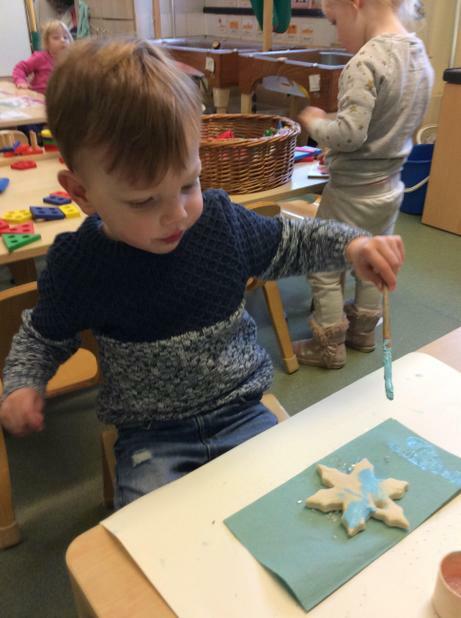 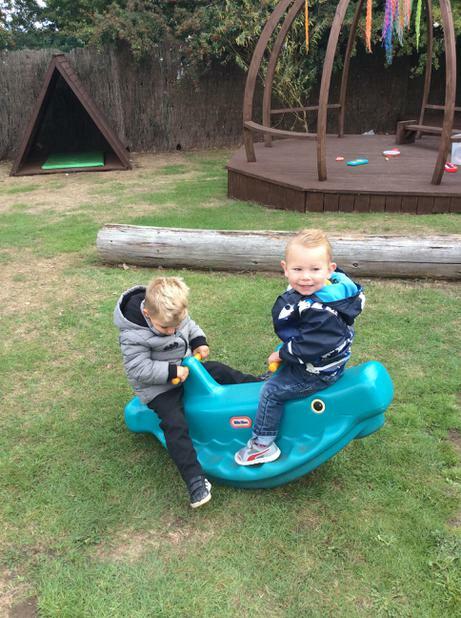 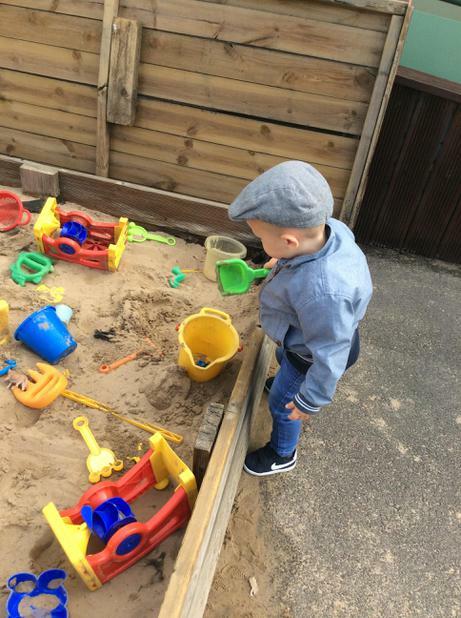 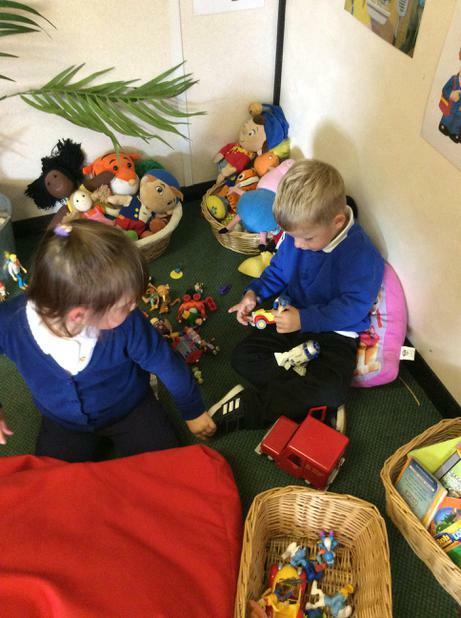 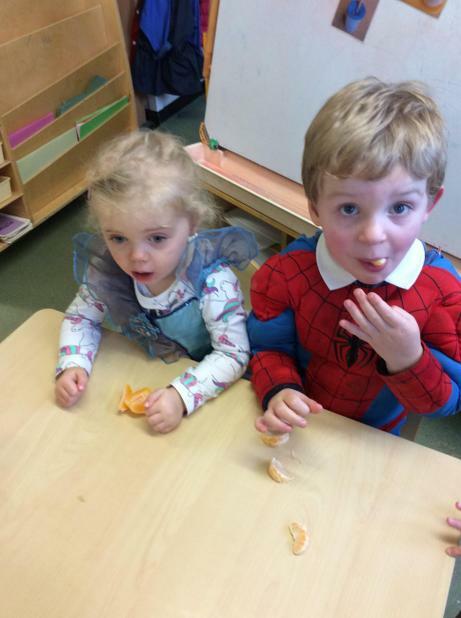 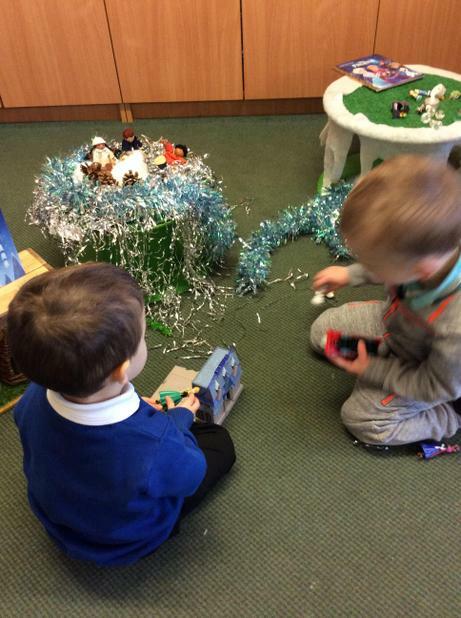 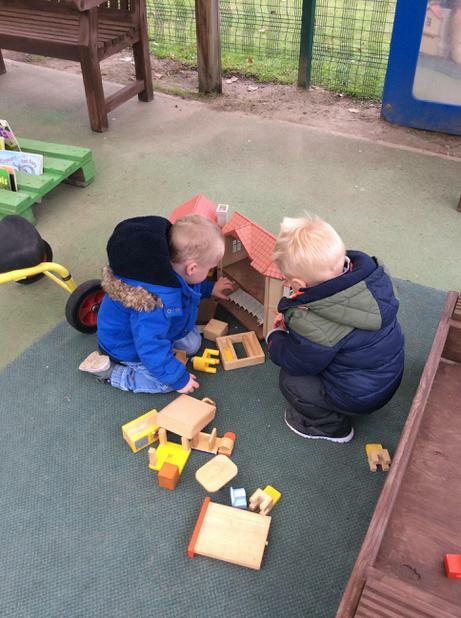 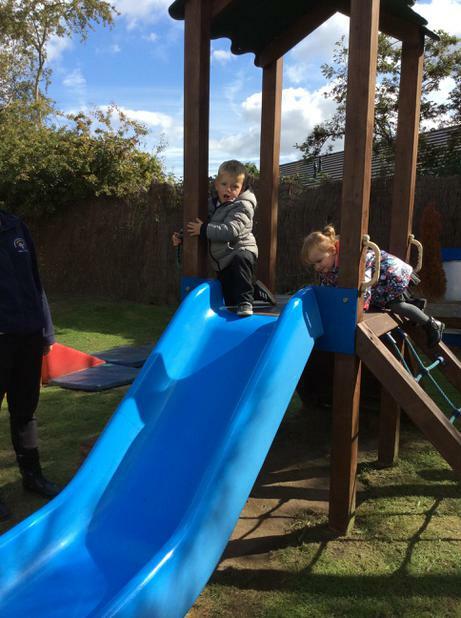 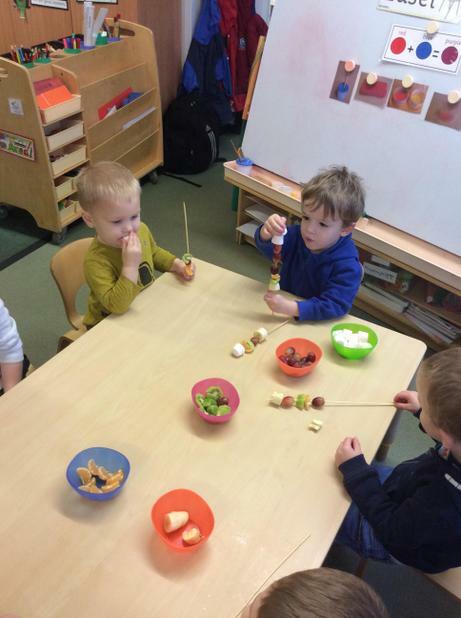 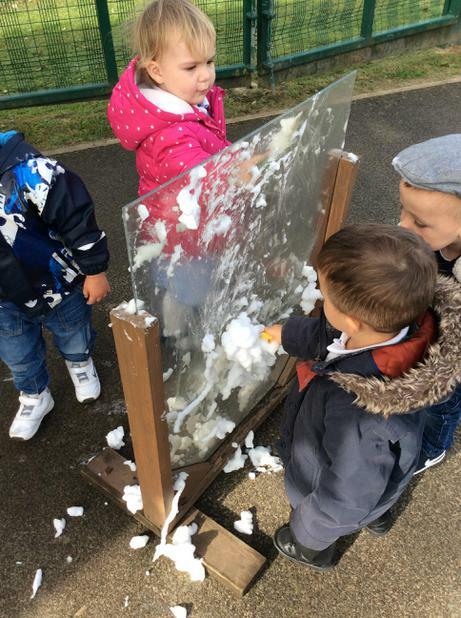 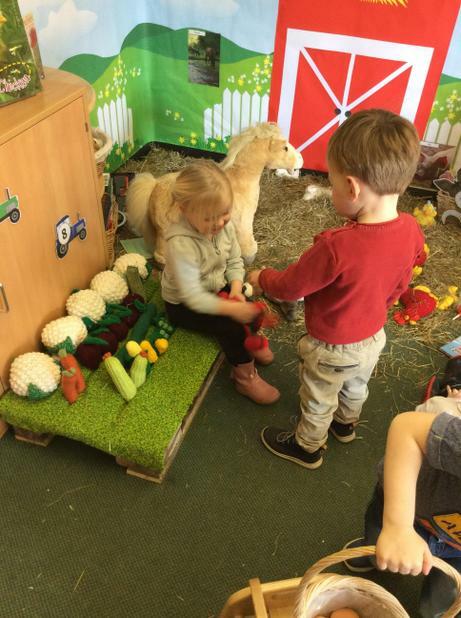 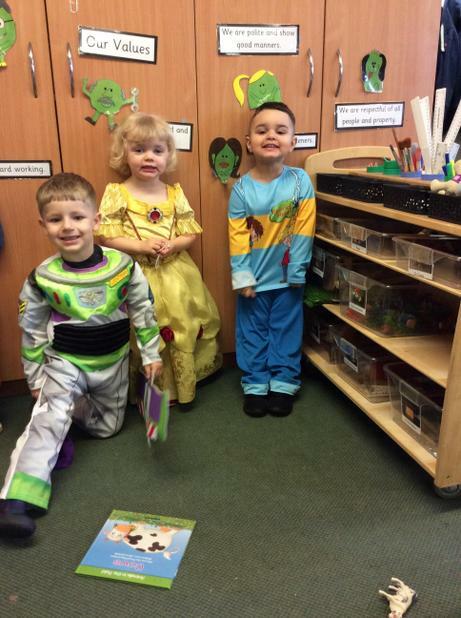 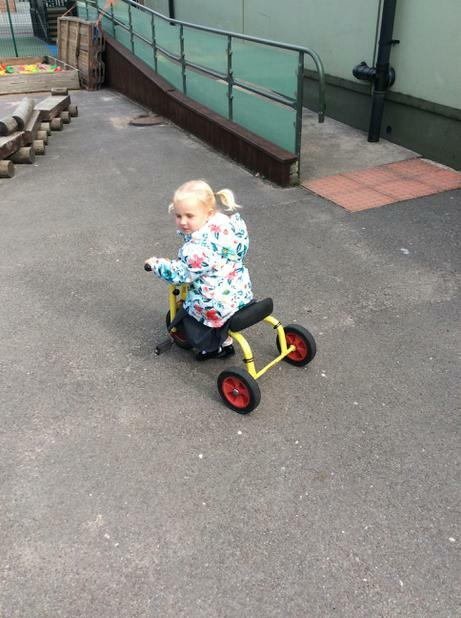 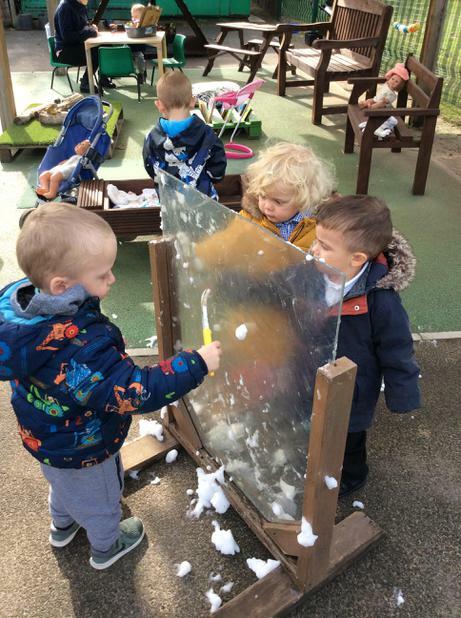 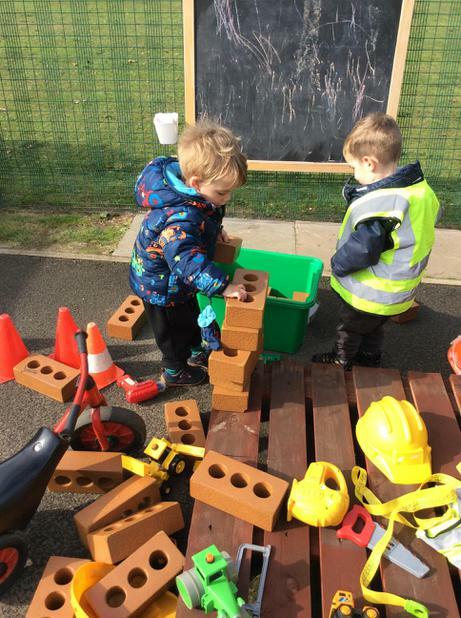 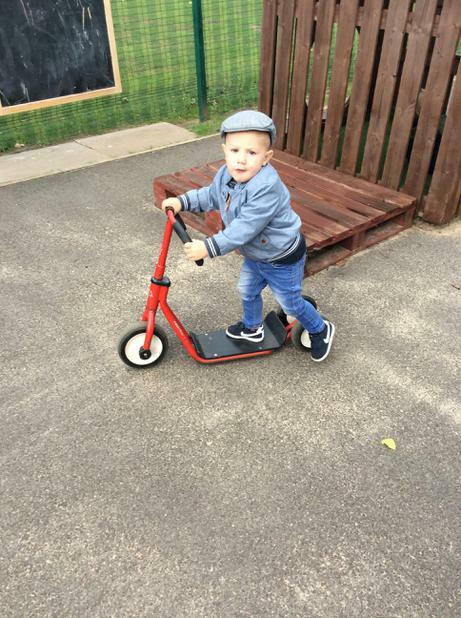 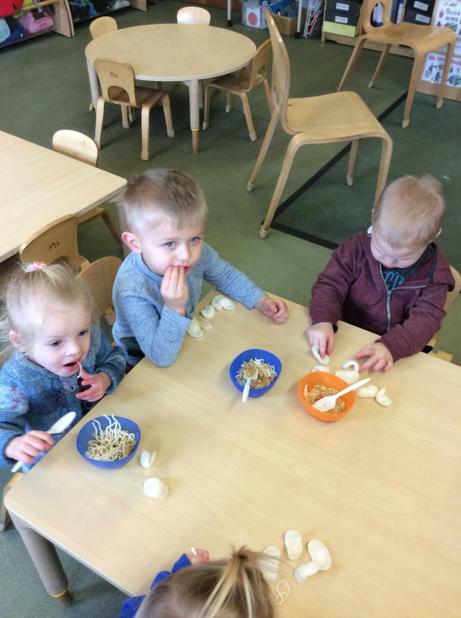 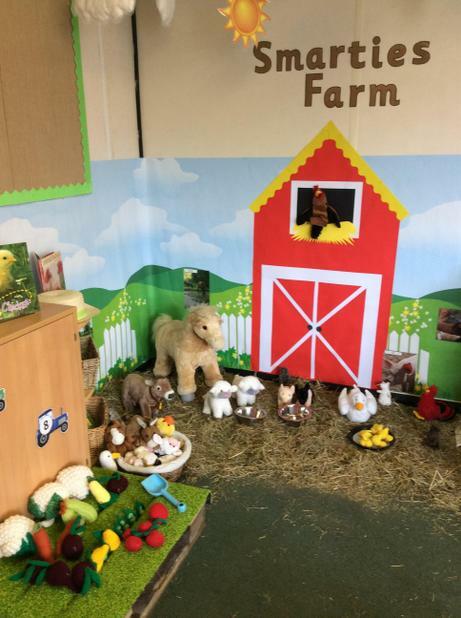 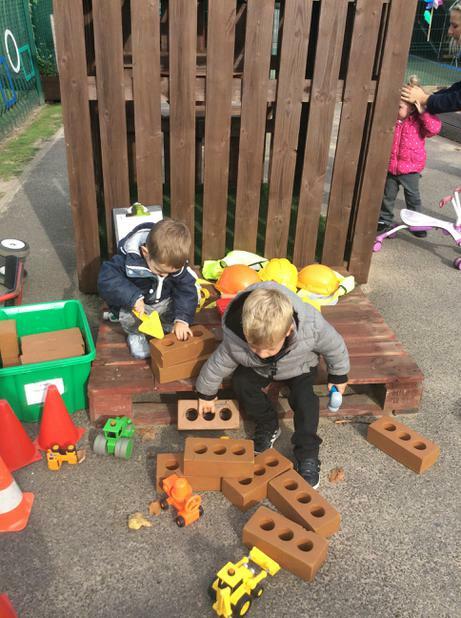 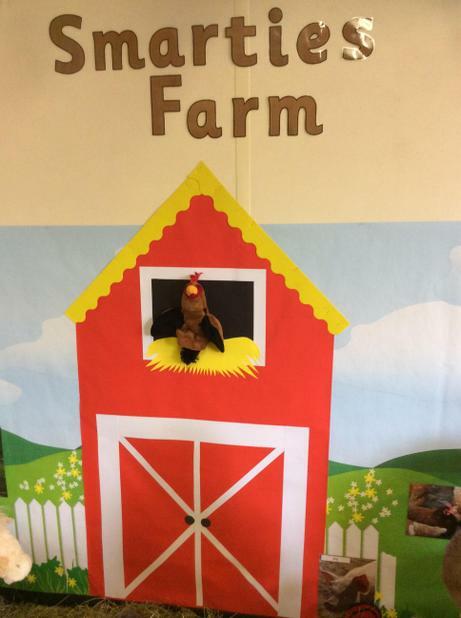 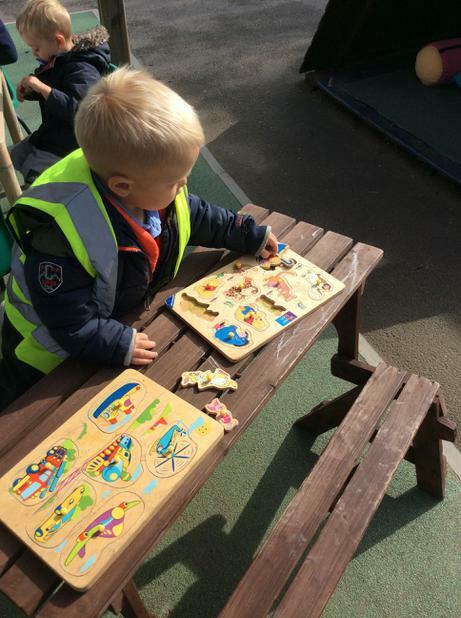 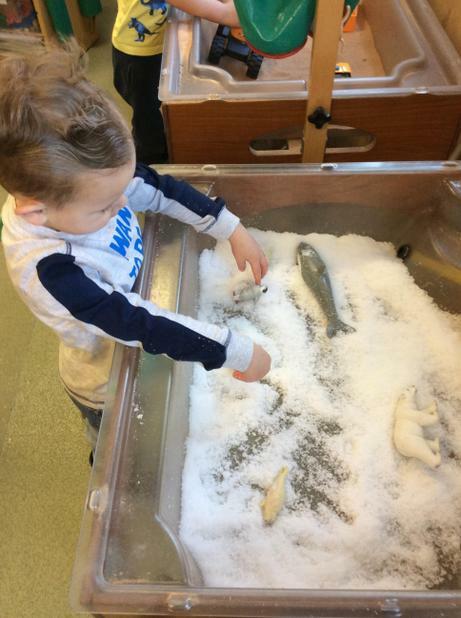 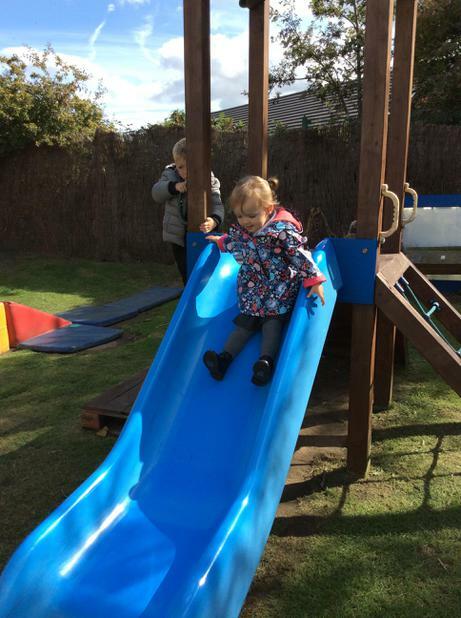 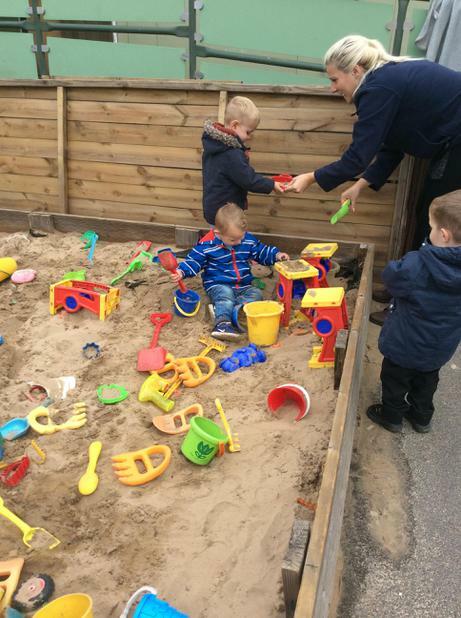 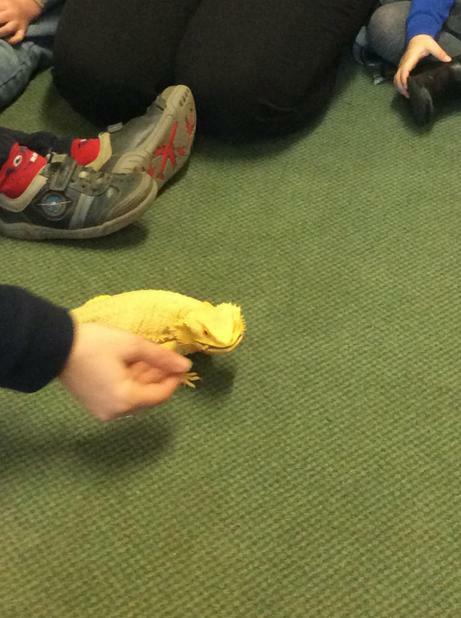 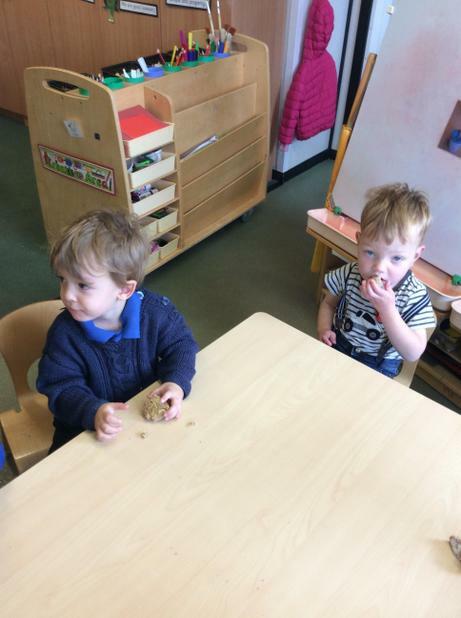 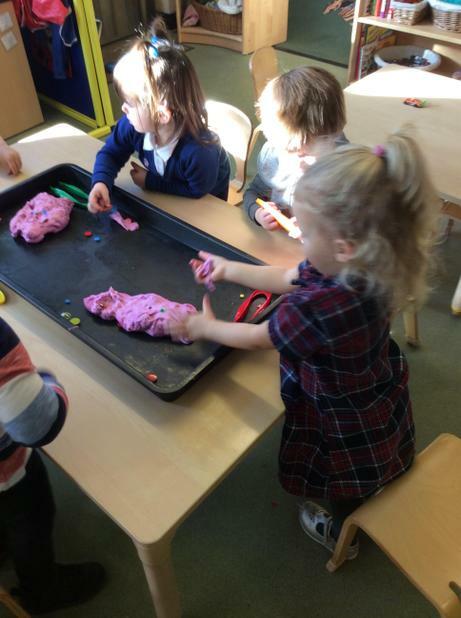 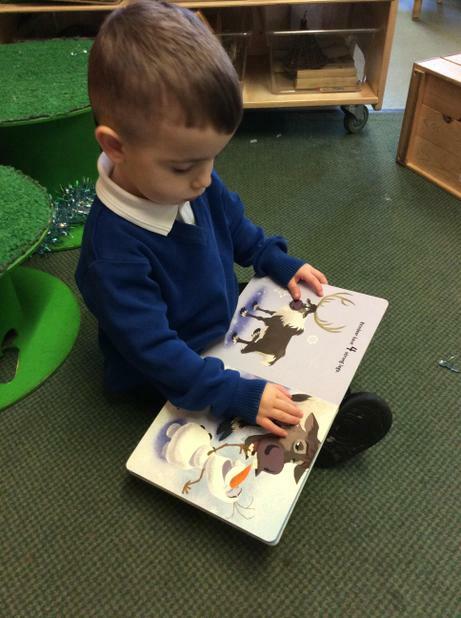 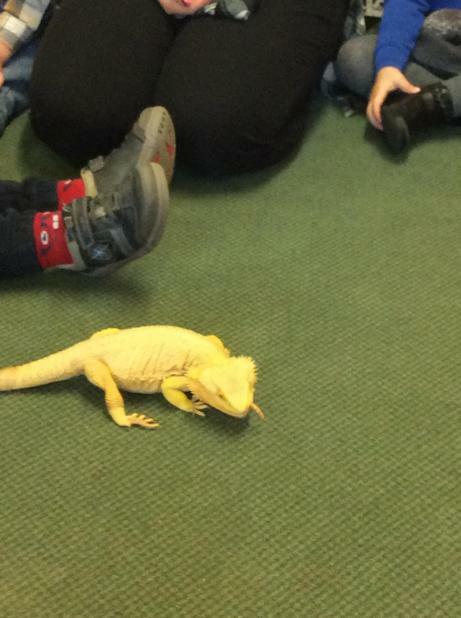 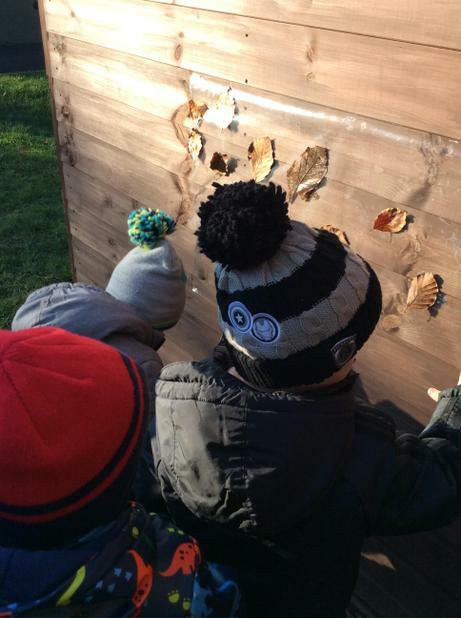 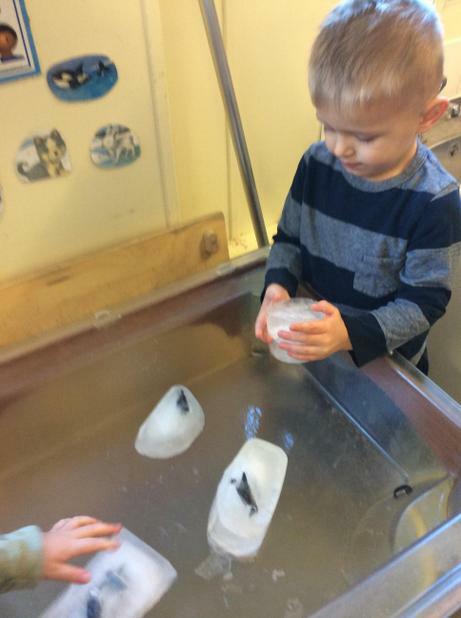 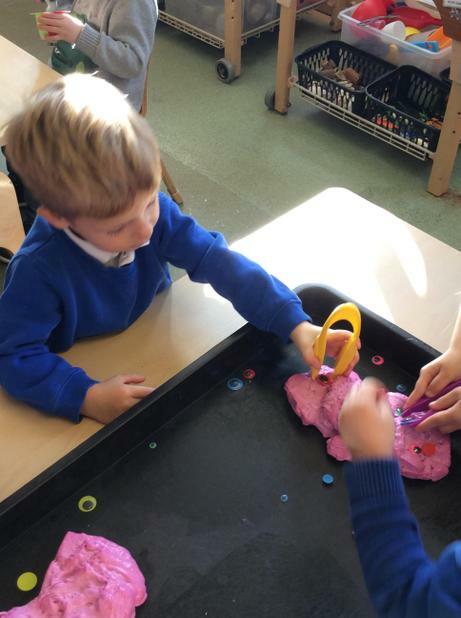 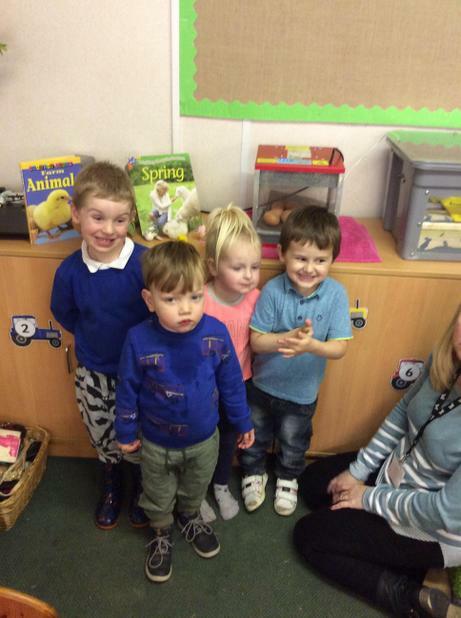 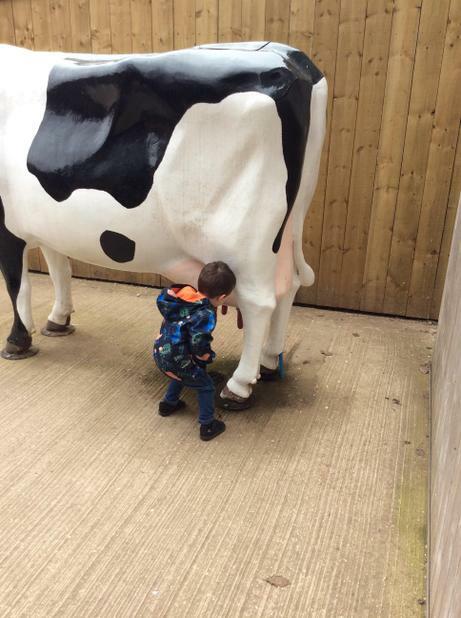 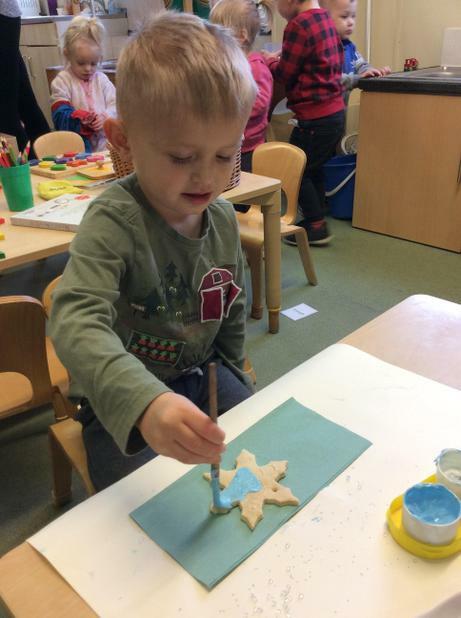 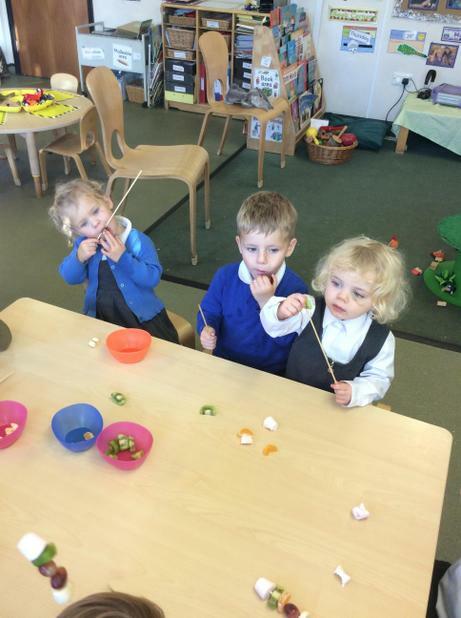 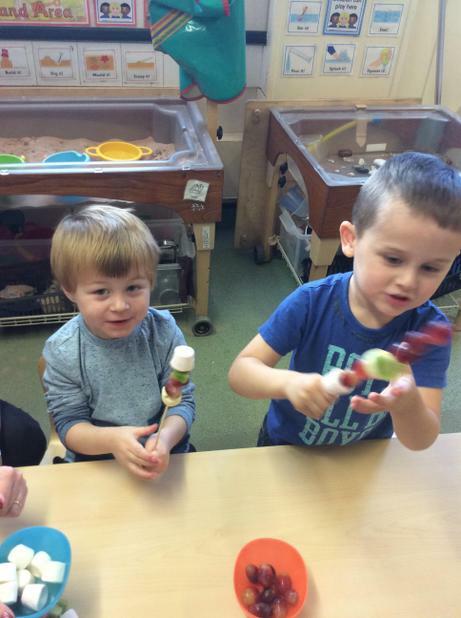 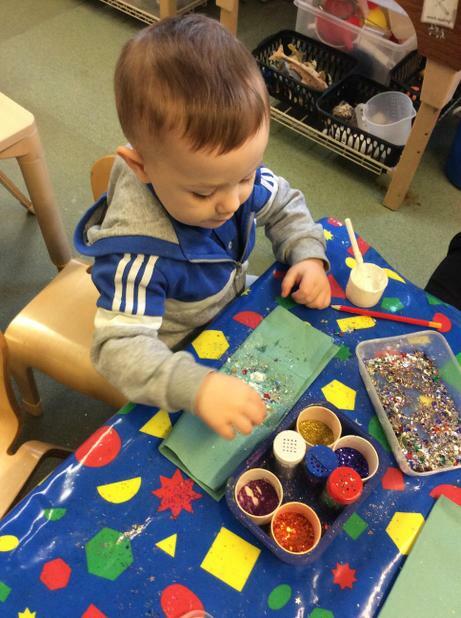 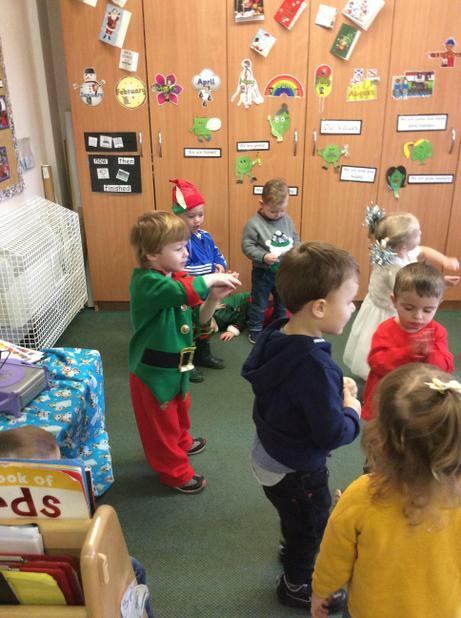 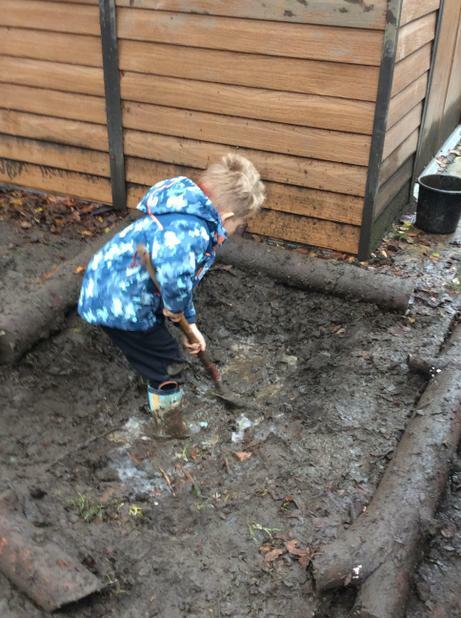 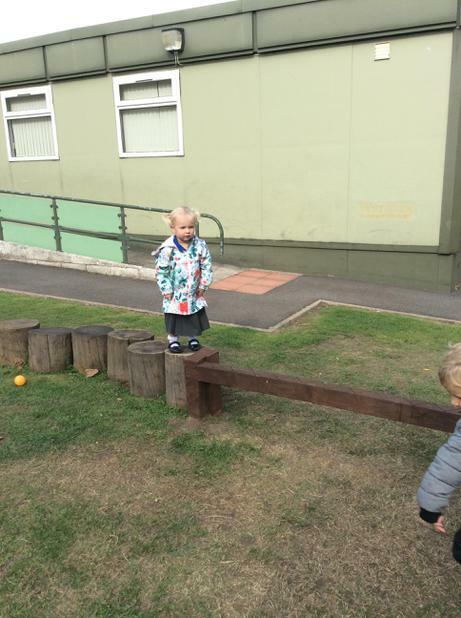 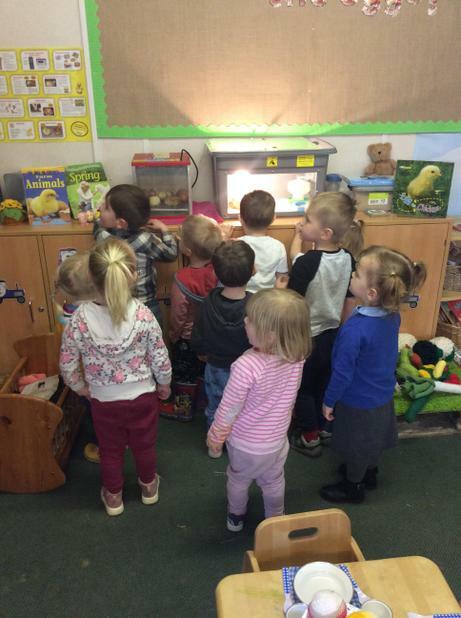 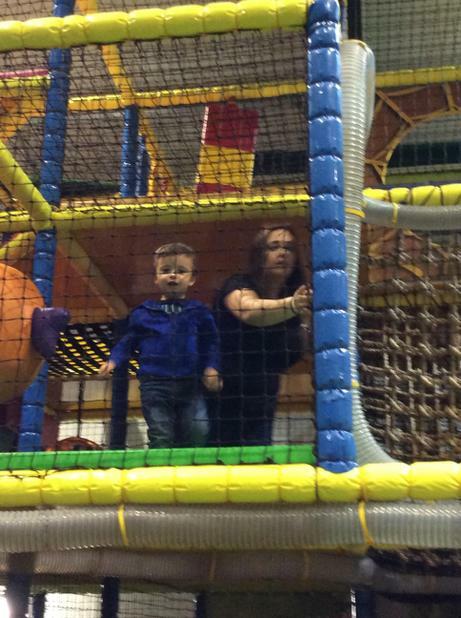 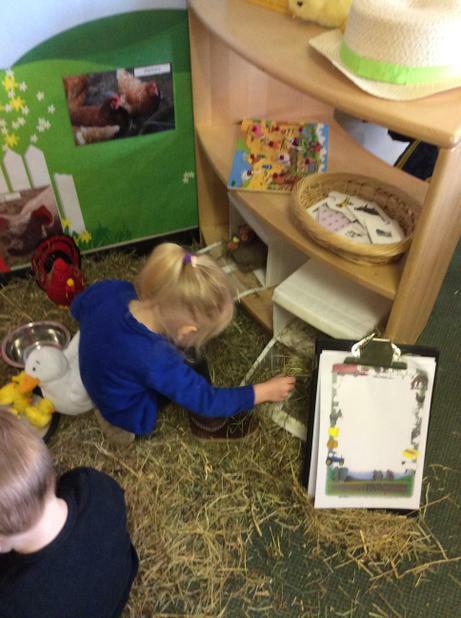 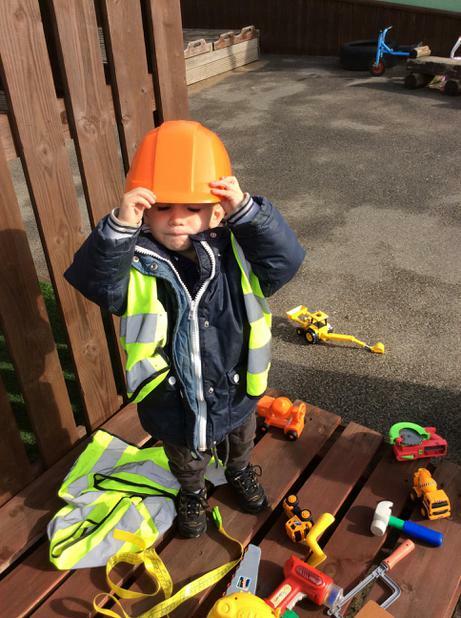 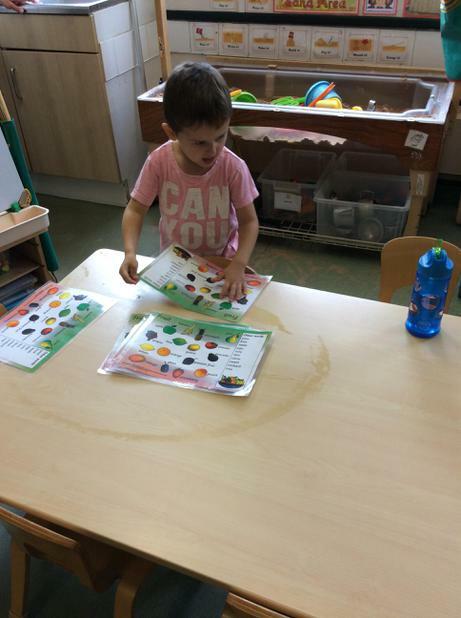 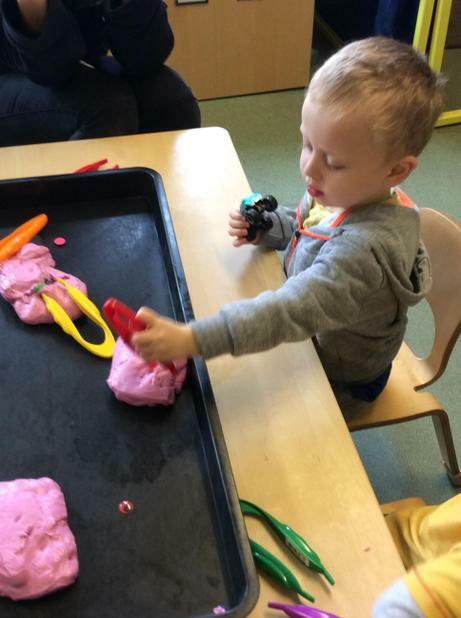 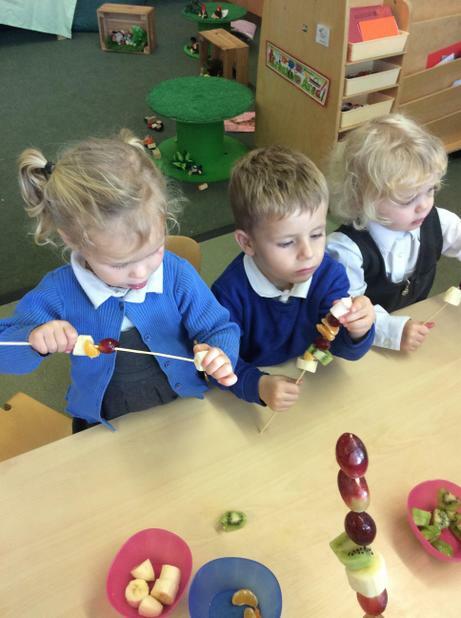 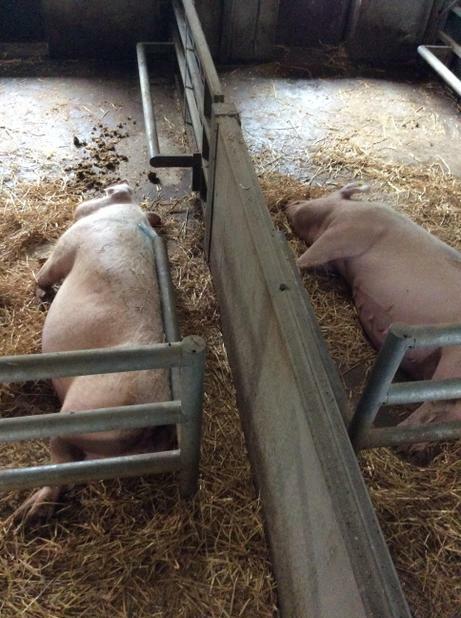 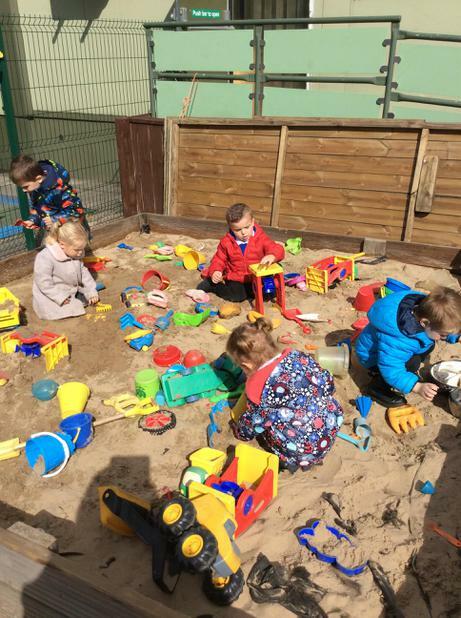 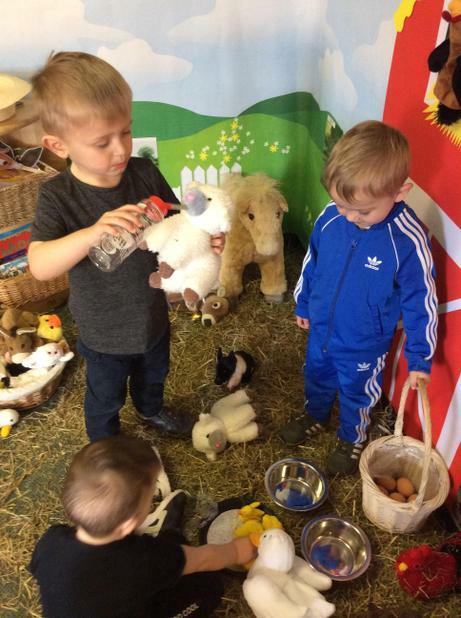 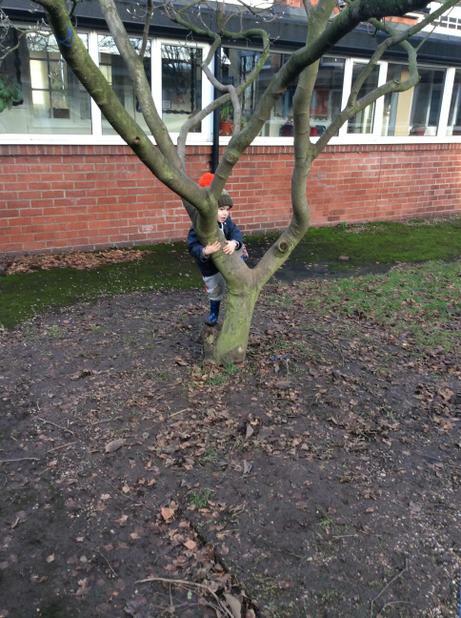 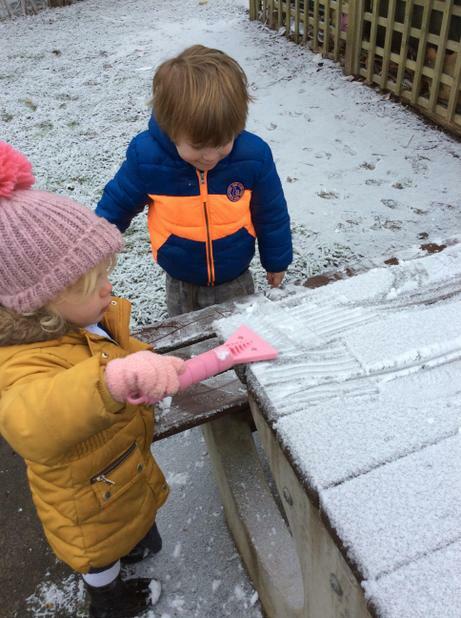 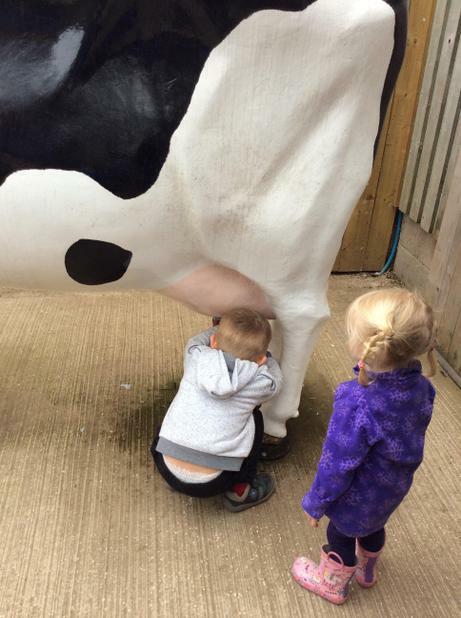 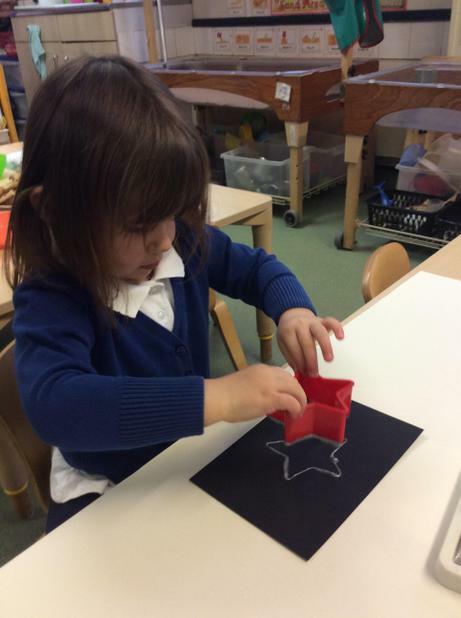 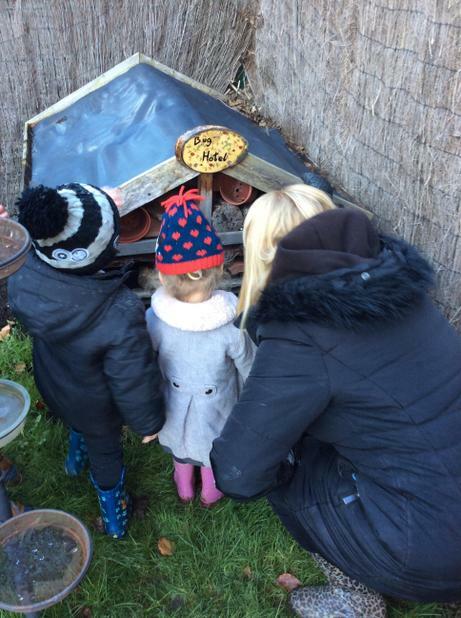 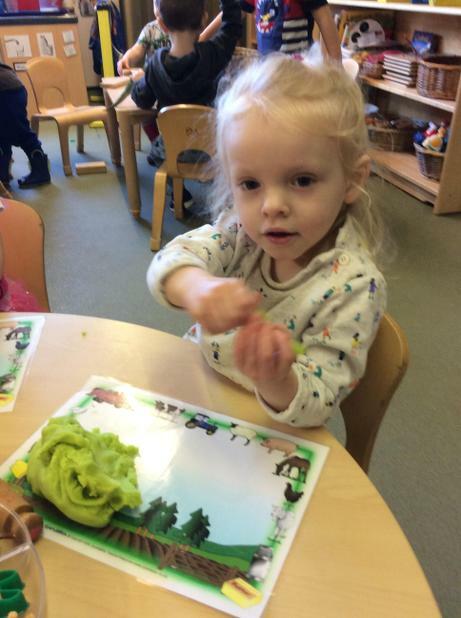 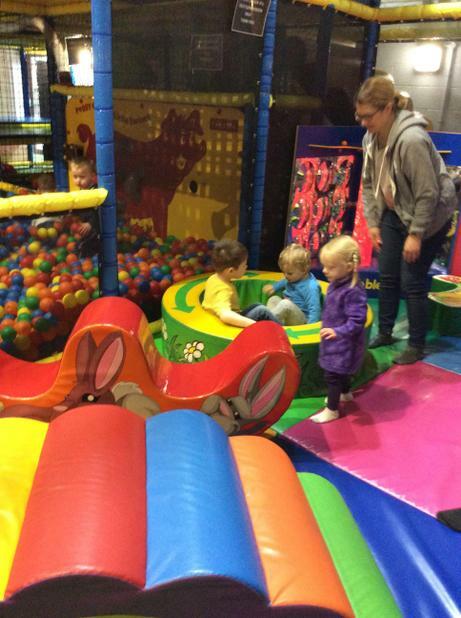 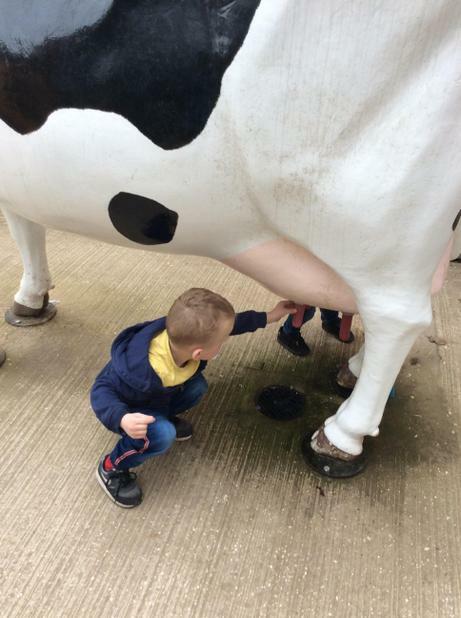 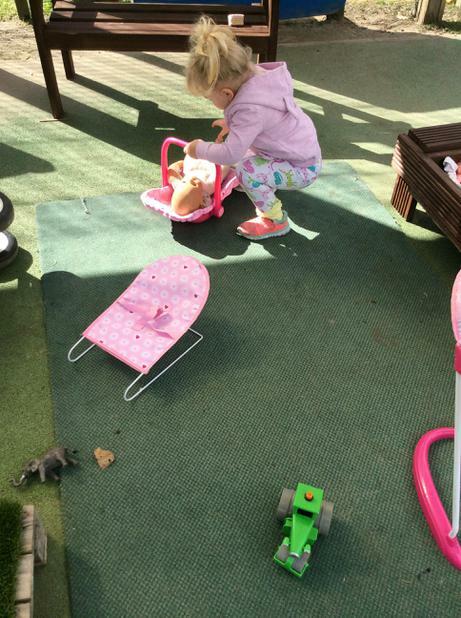 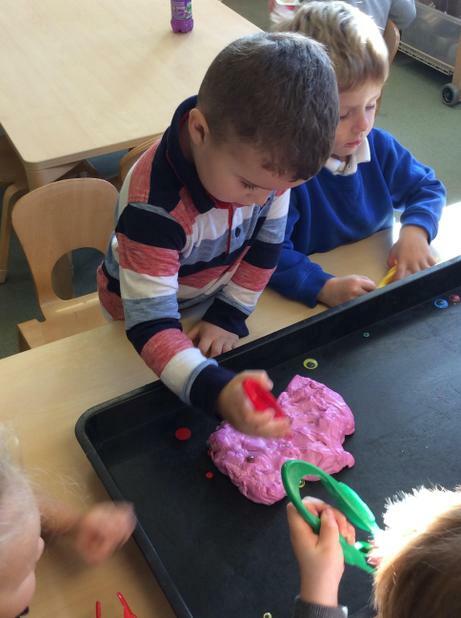 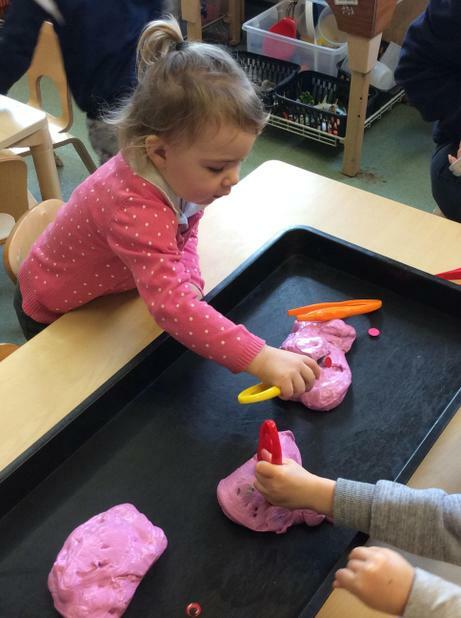 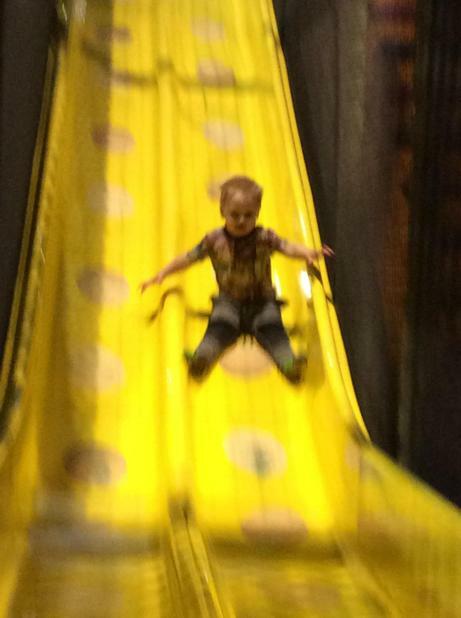 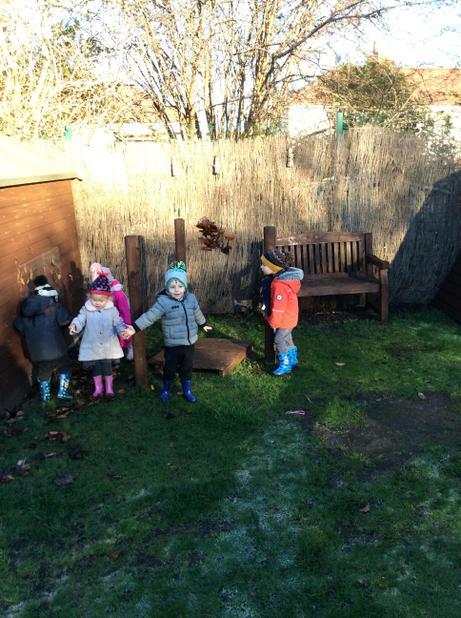 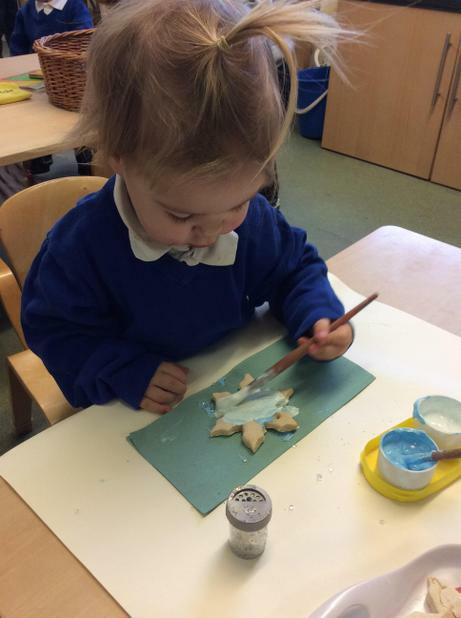 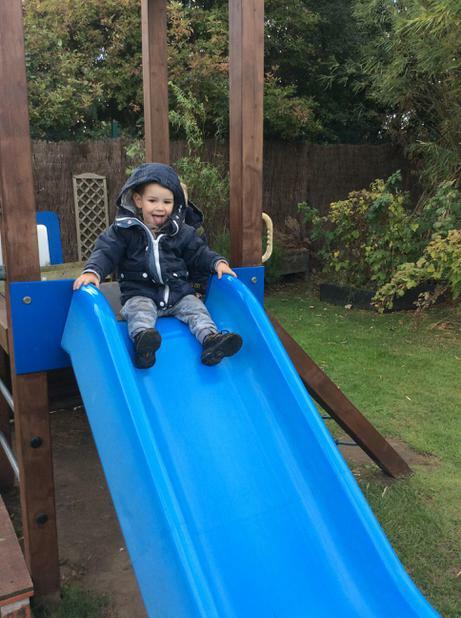 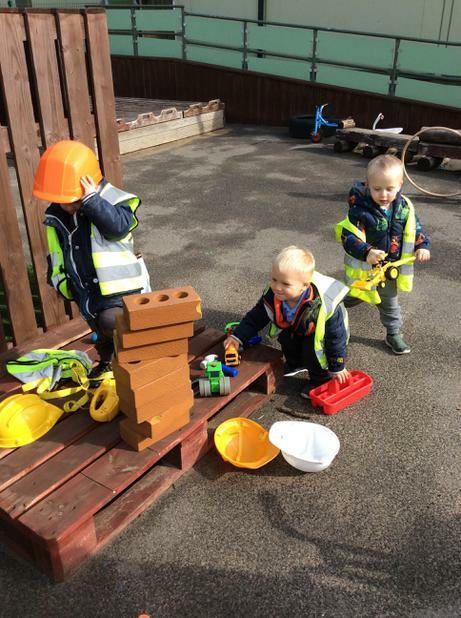 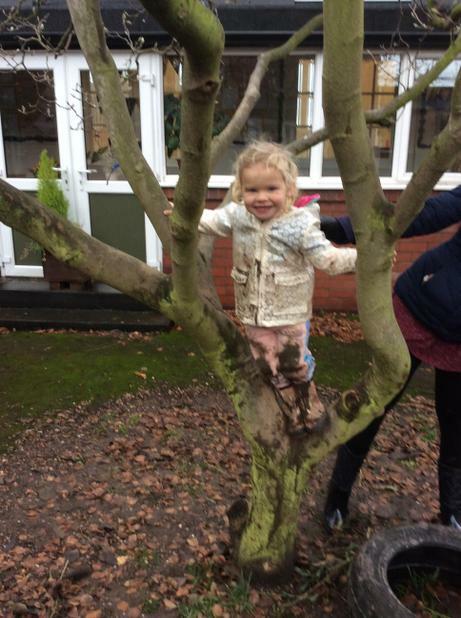 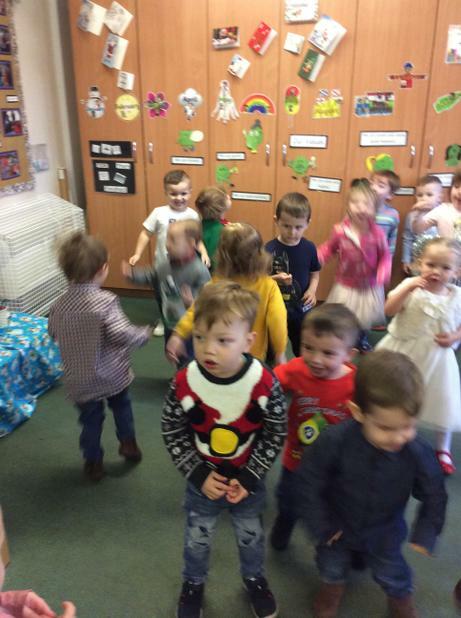 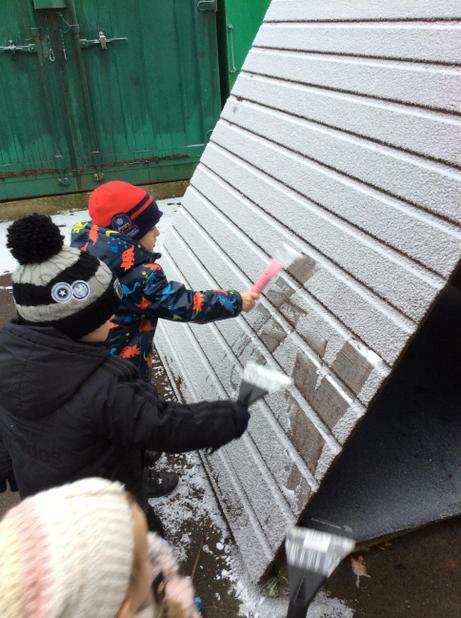 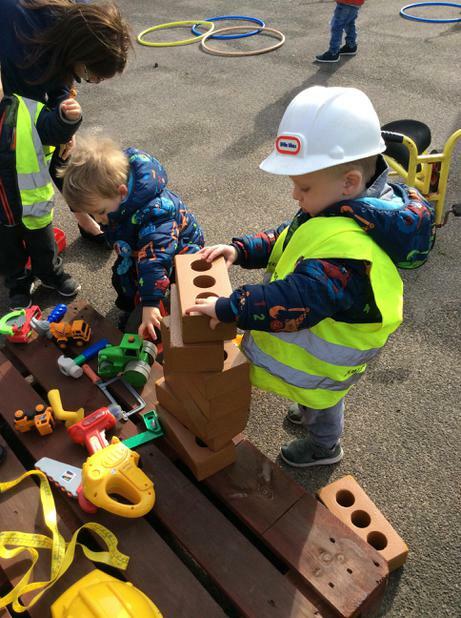 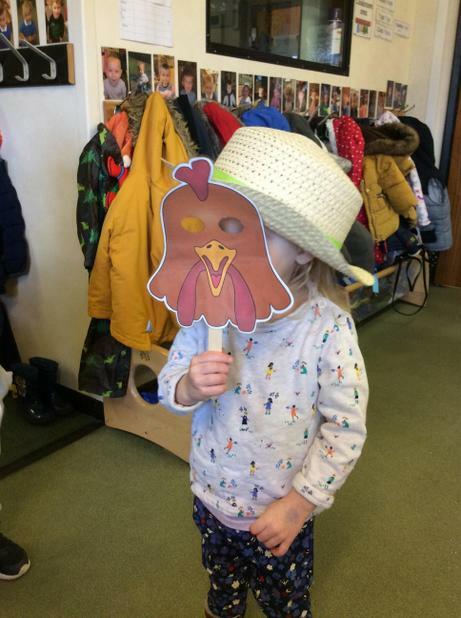 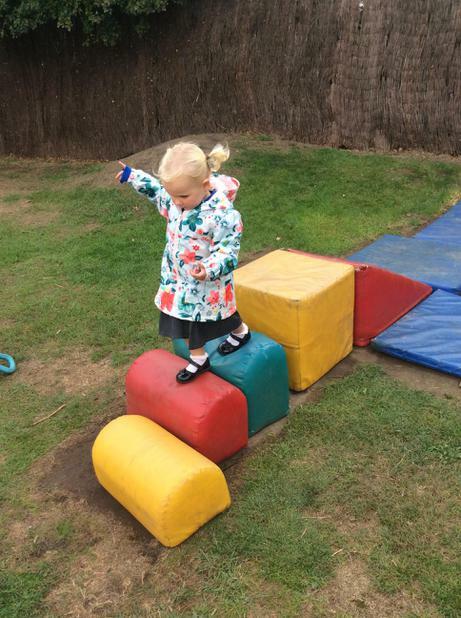 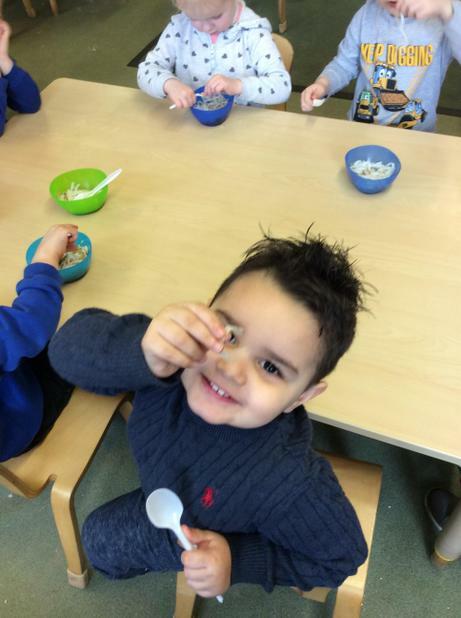 This week in Smarties the children have enjoyed exploring their new environment. 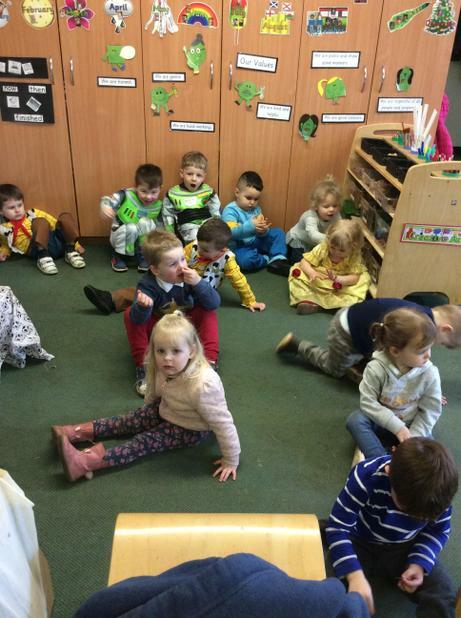 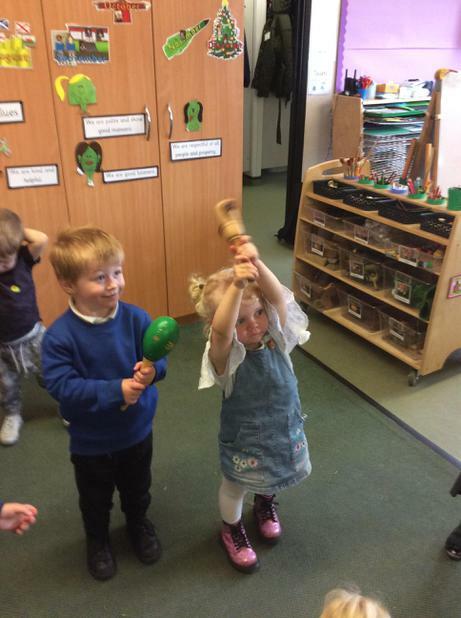 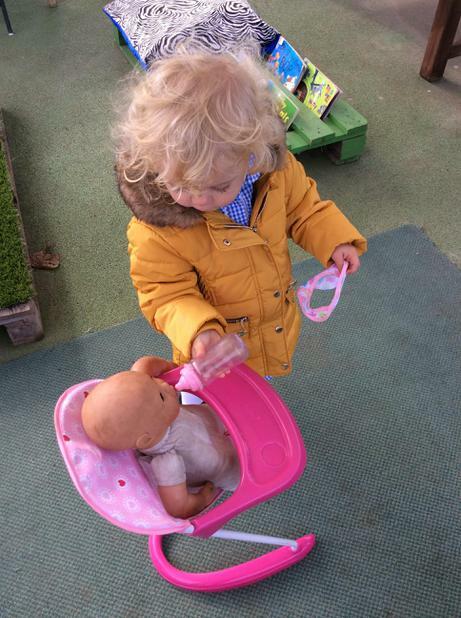 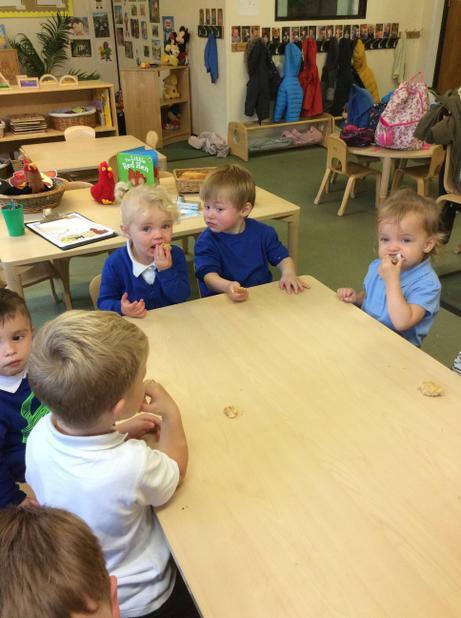 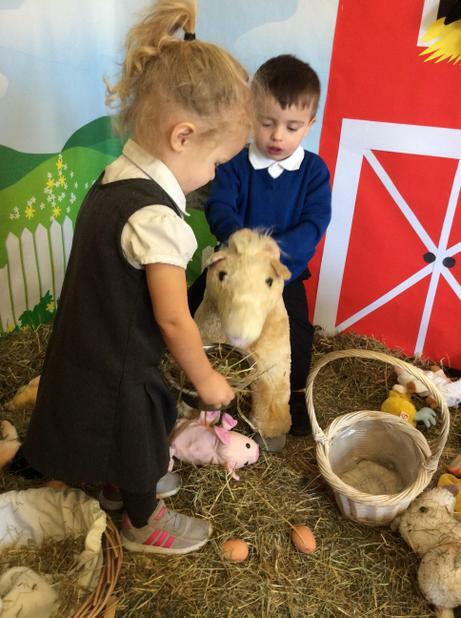 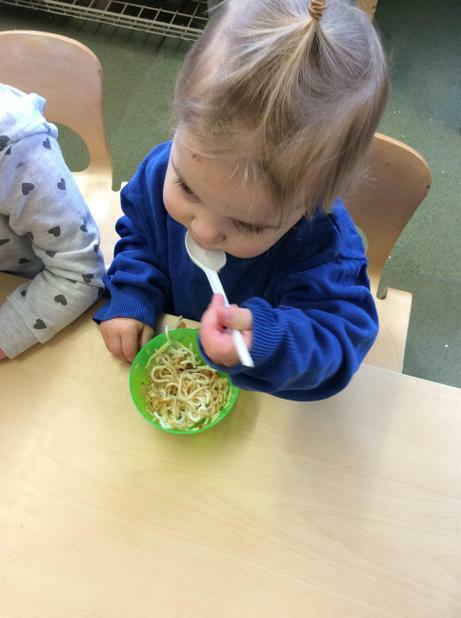 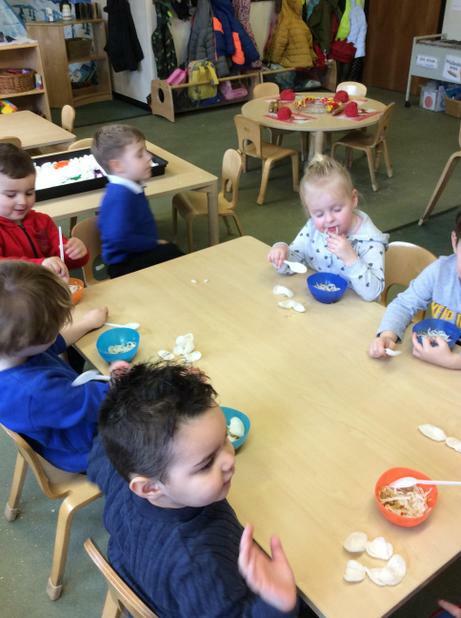 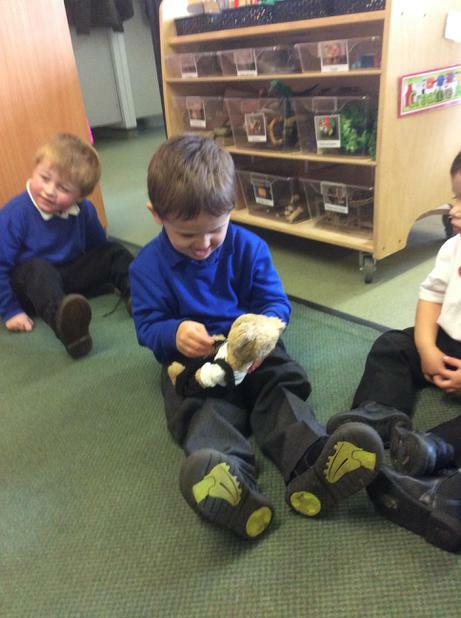 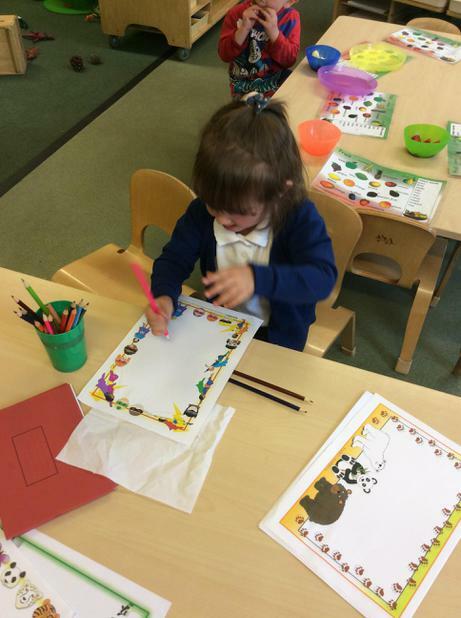 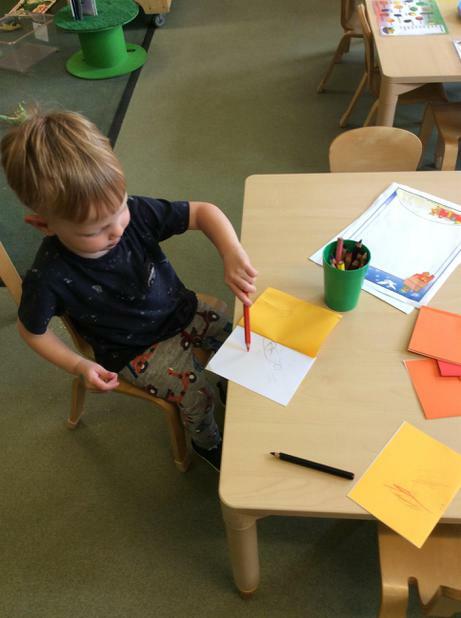 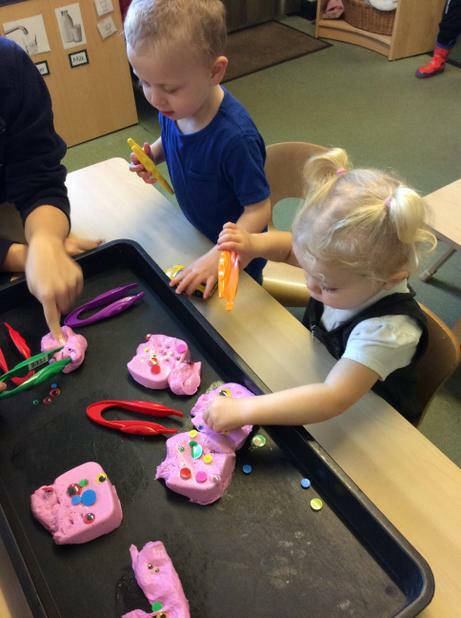 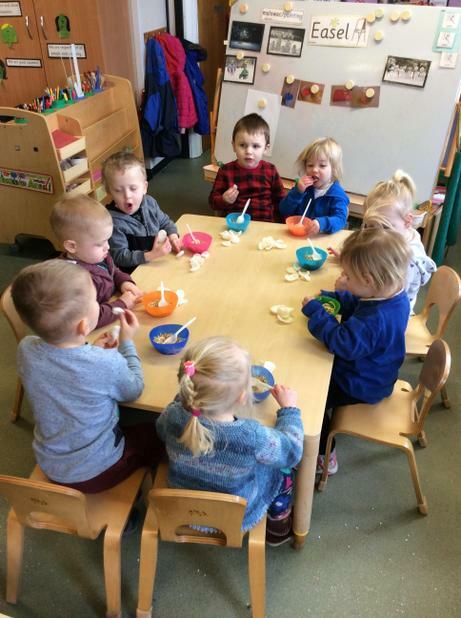 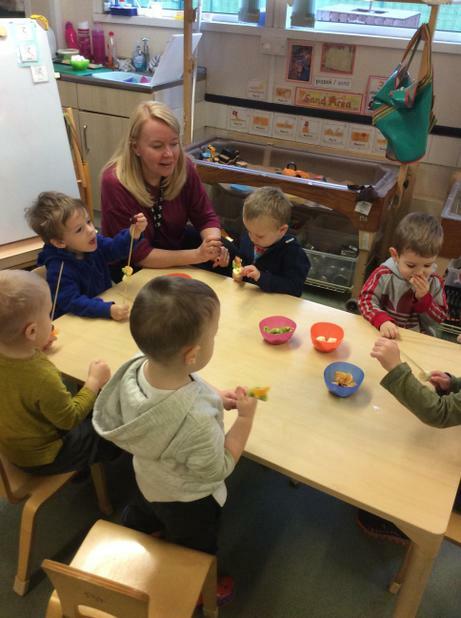 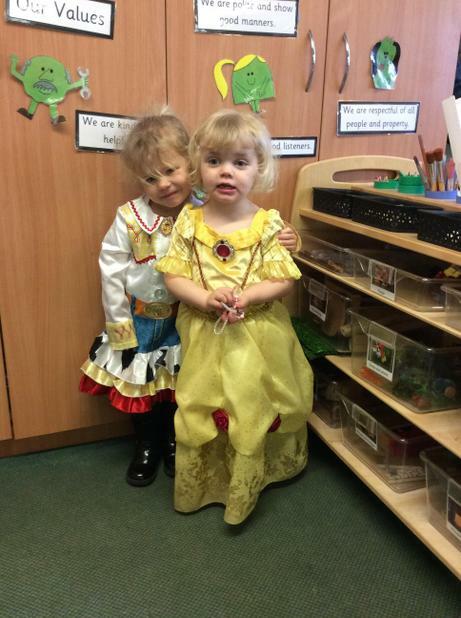 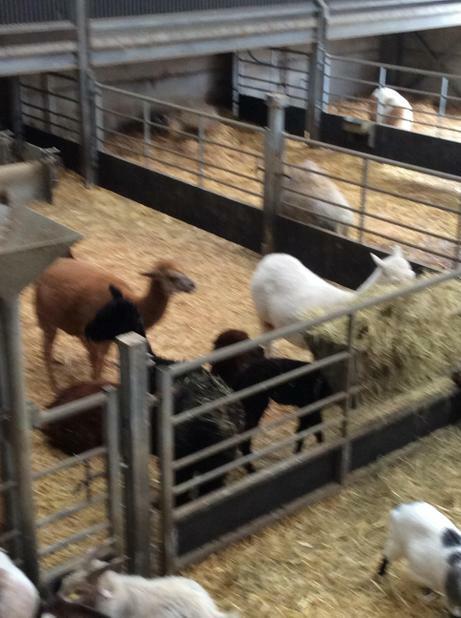 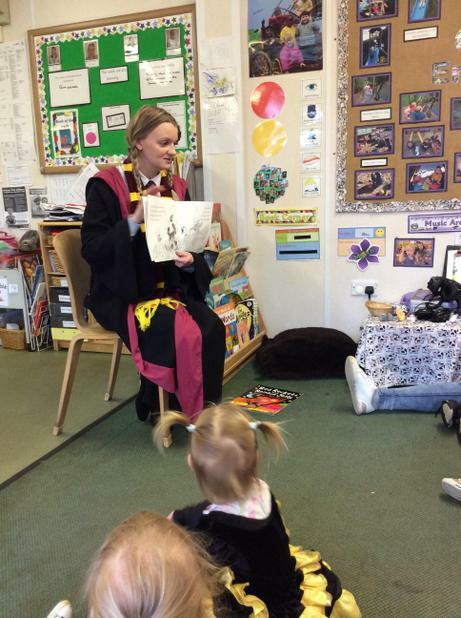 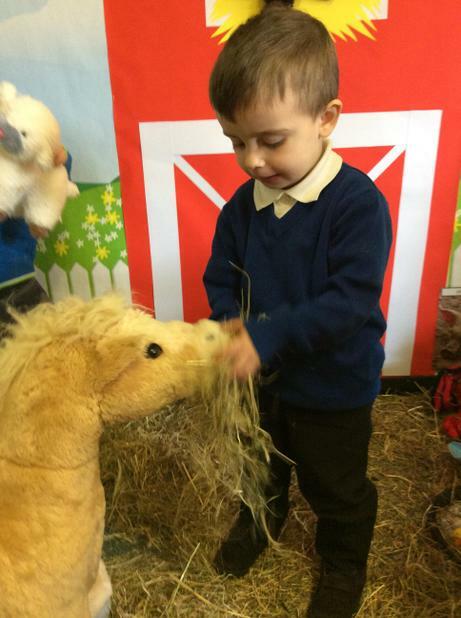 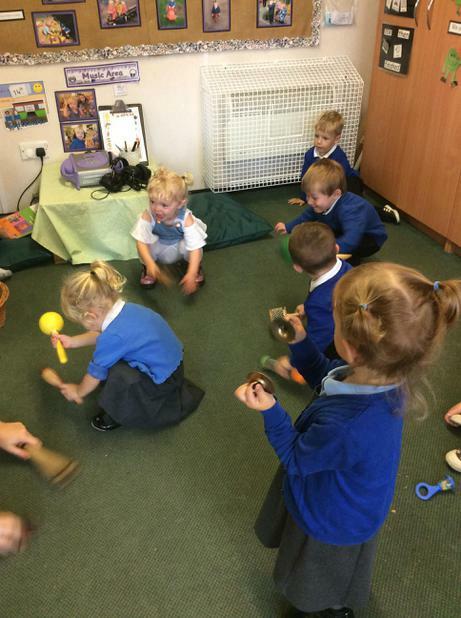 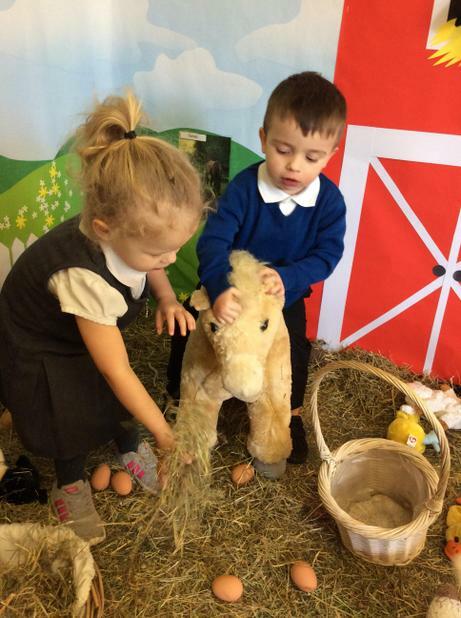 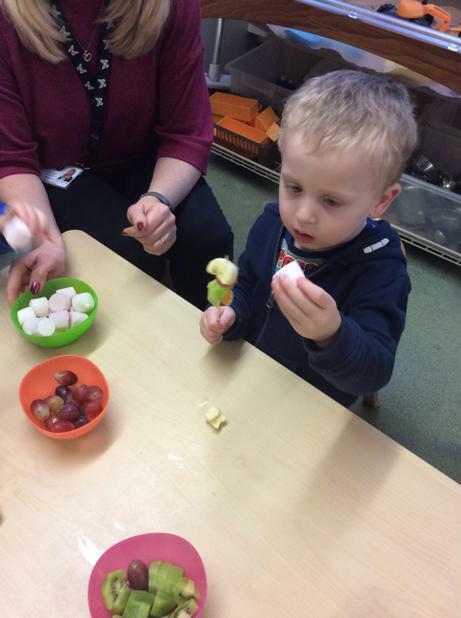 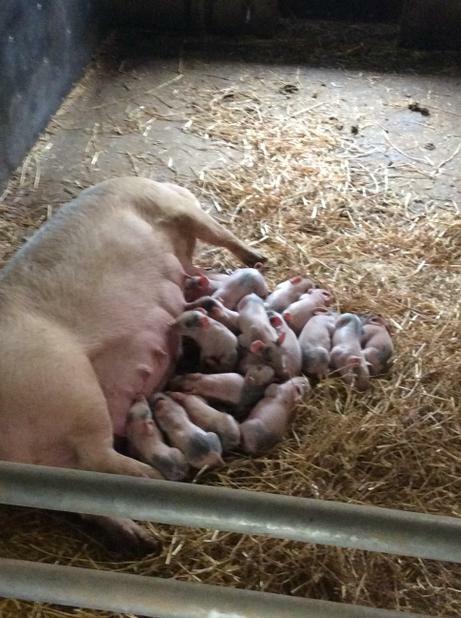 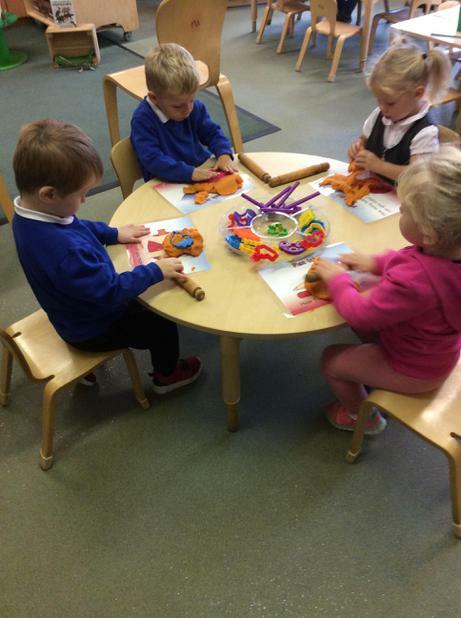 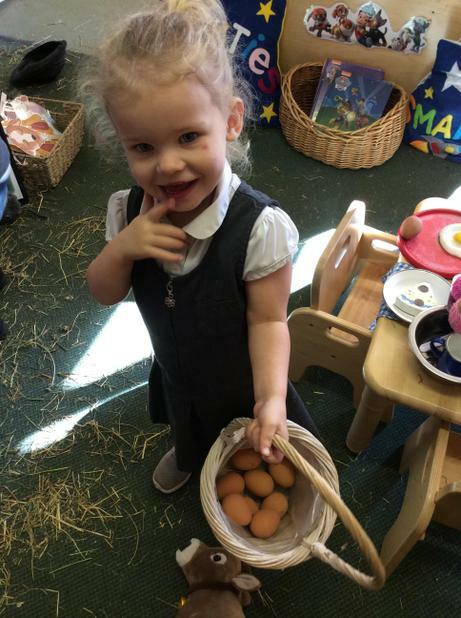 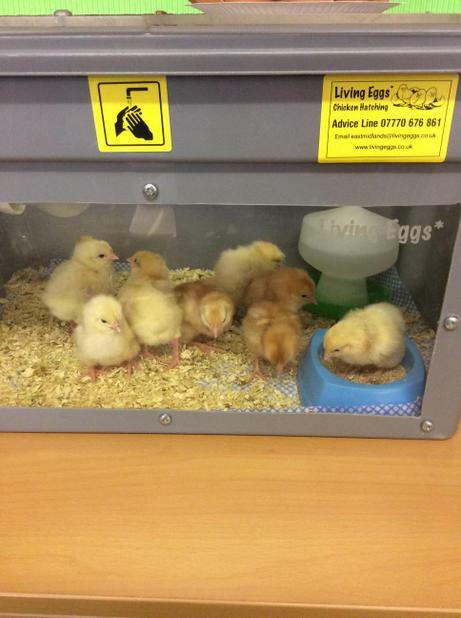 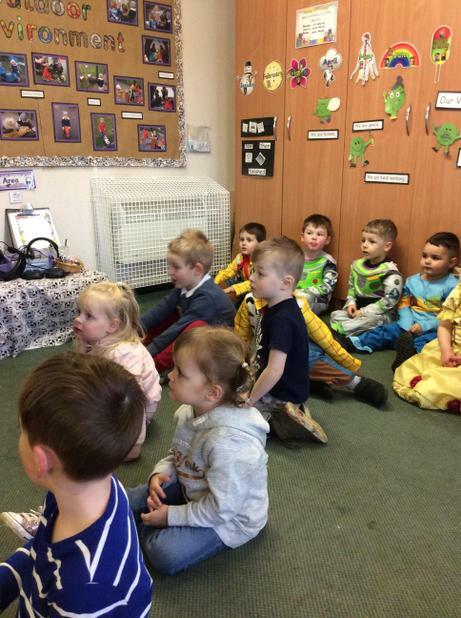 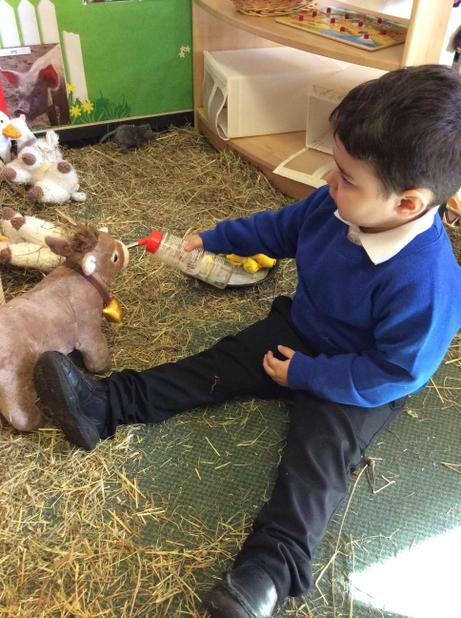 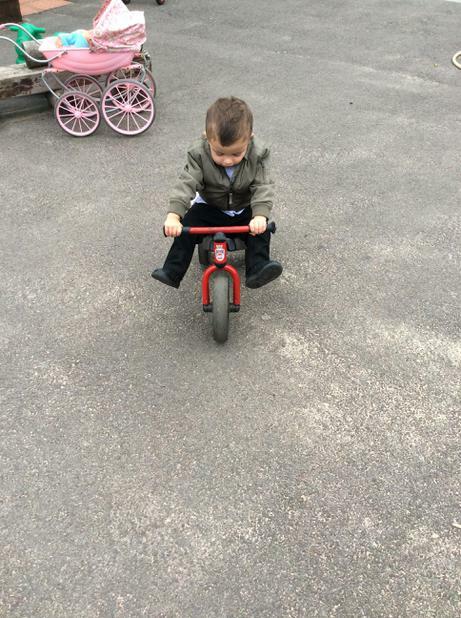 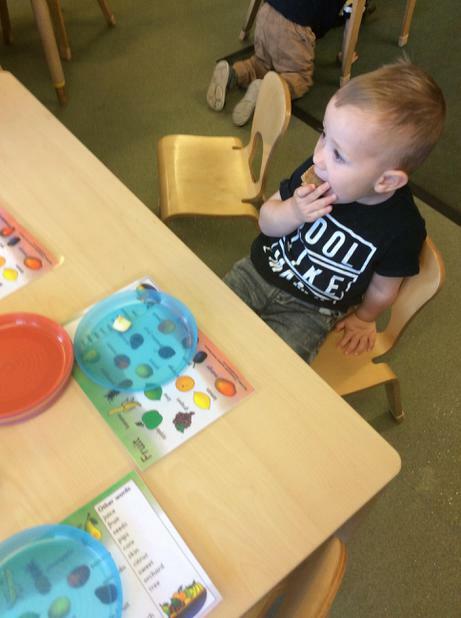 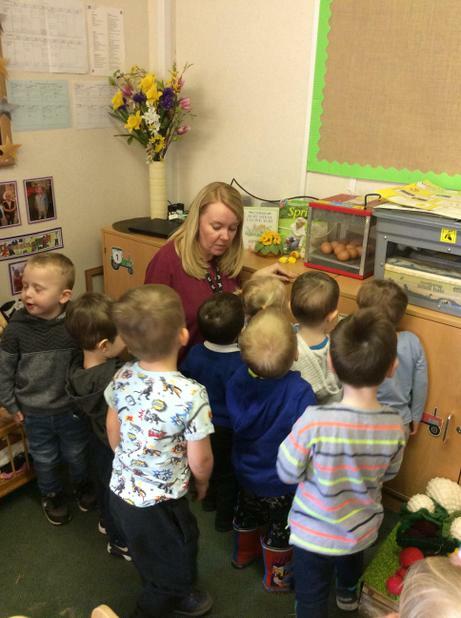 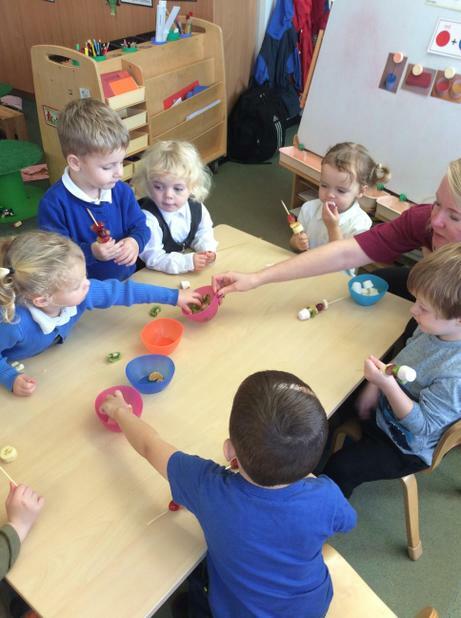 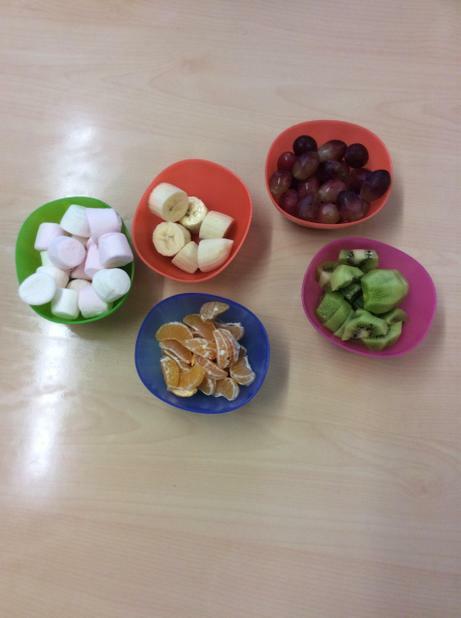 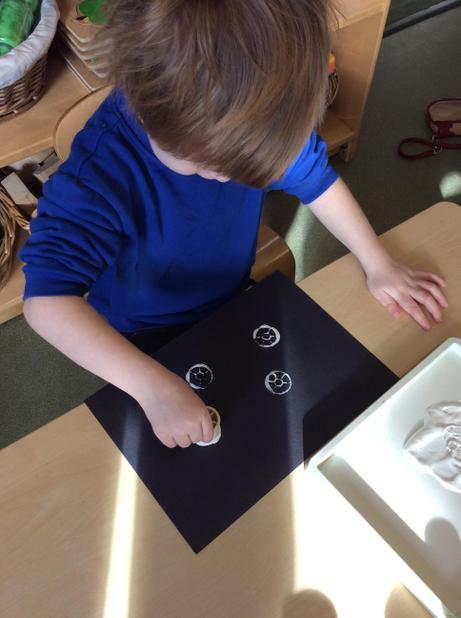 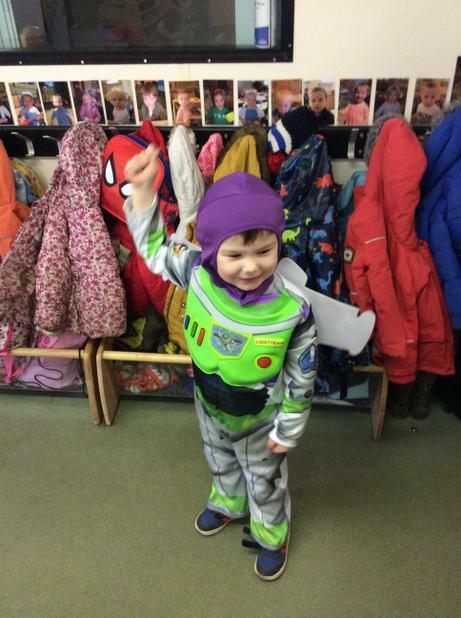 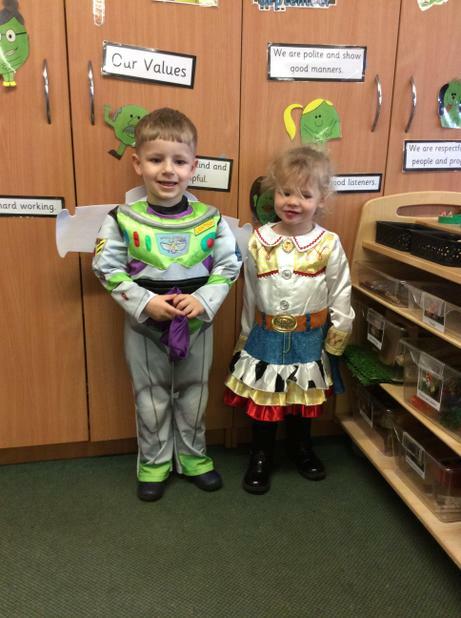 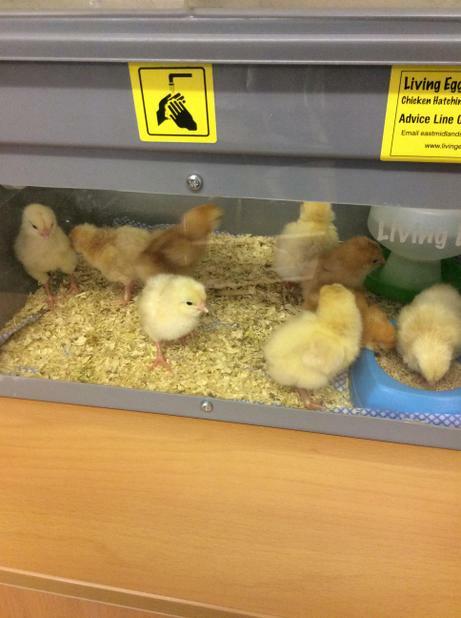 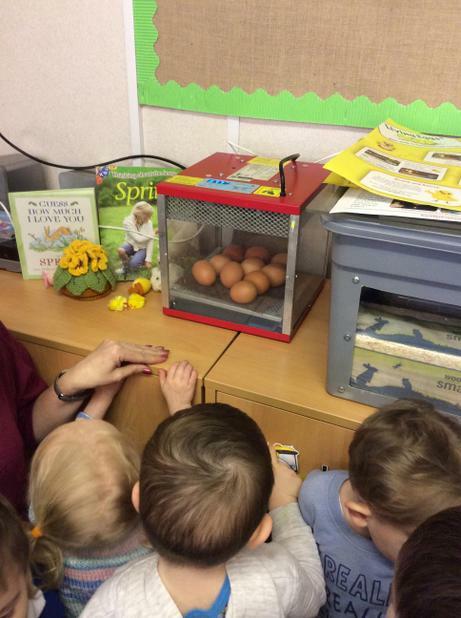 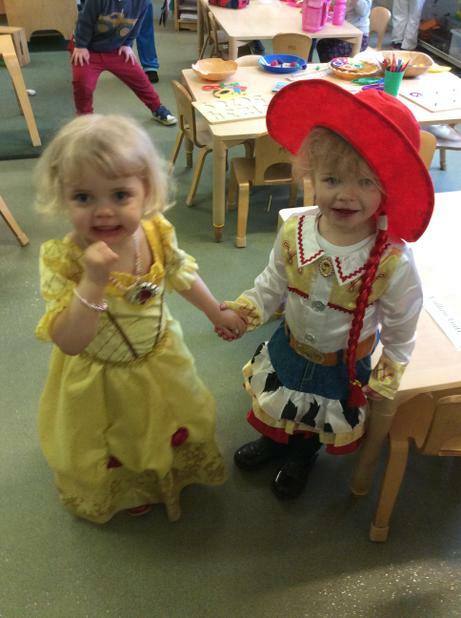 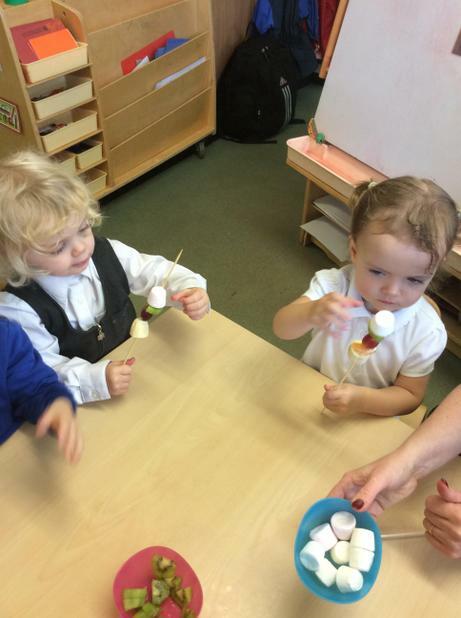 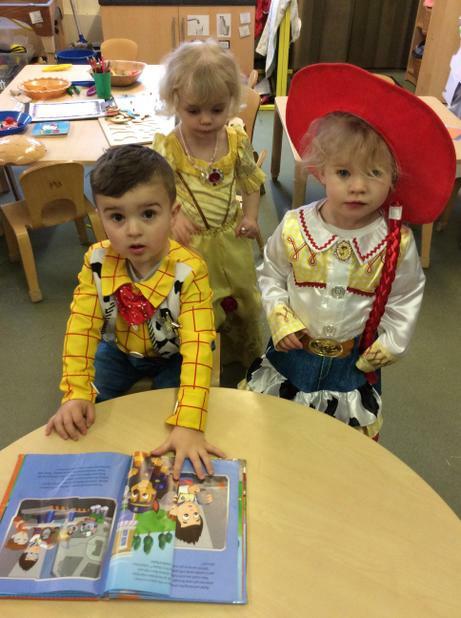 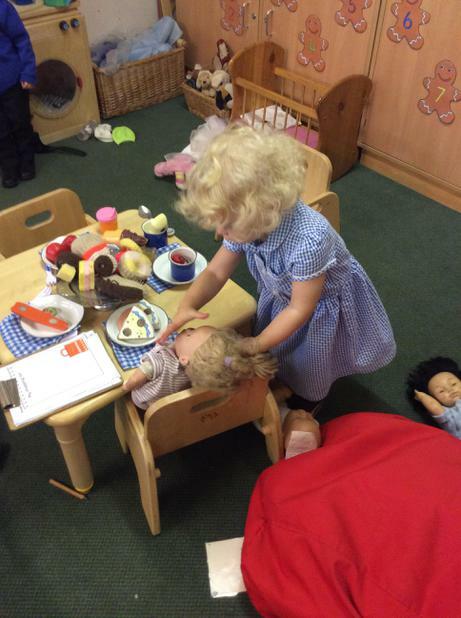 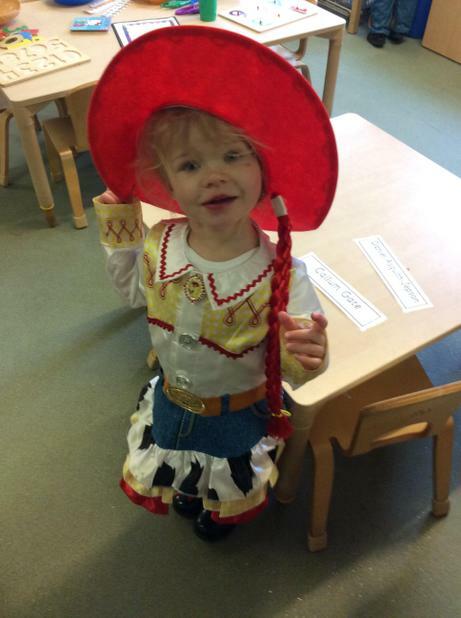 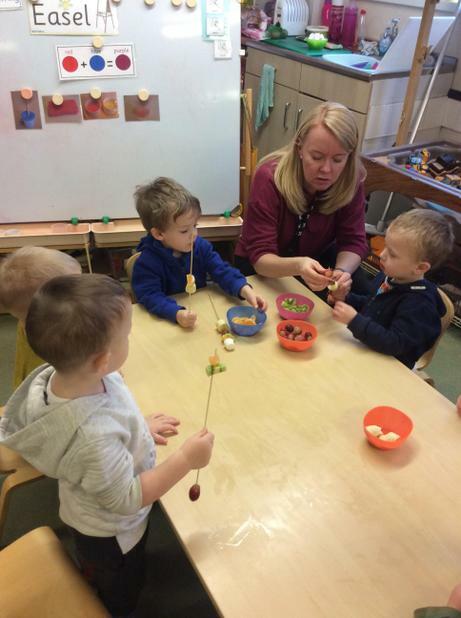 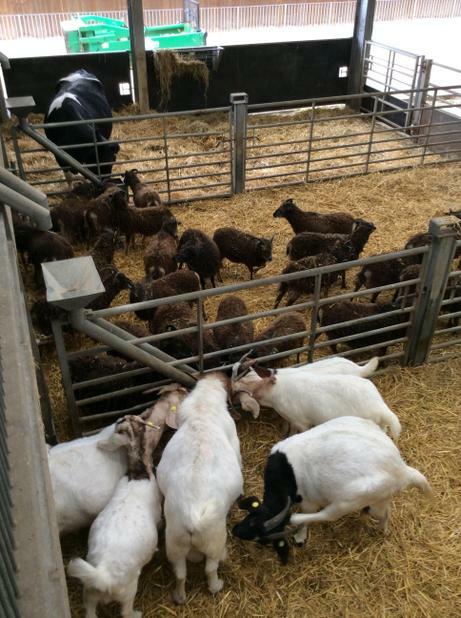 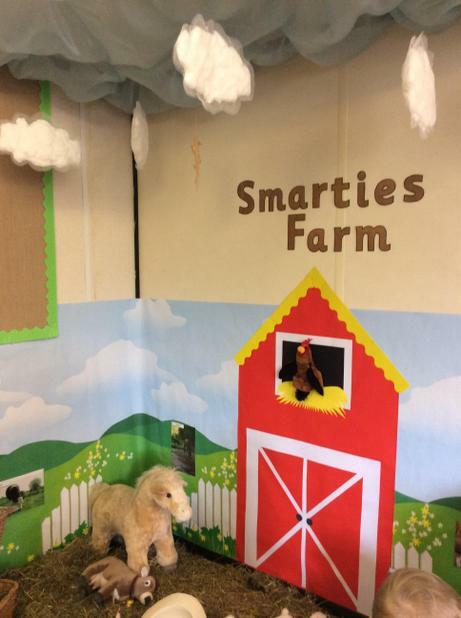 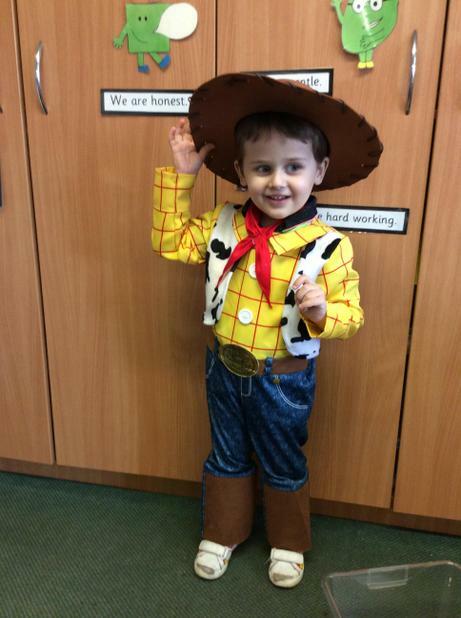 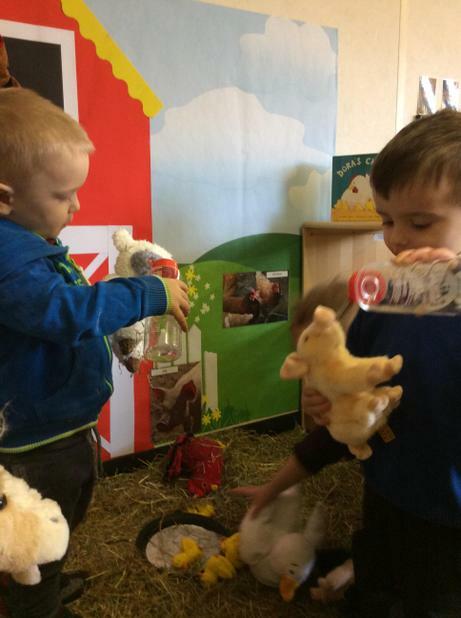 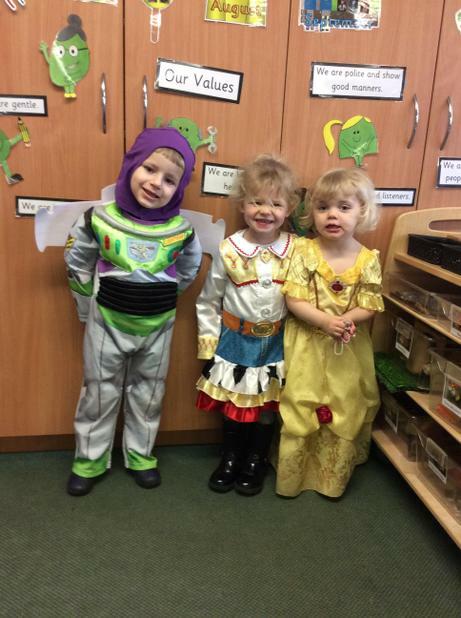 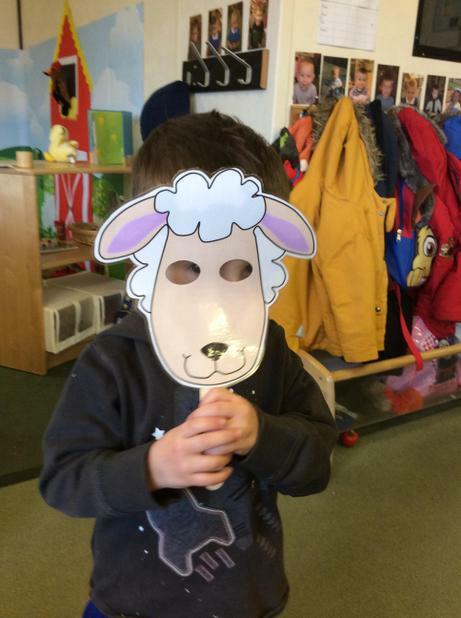 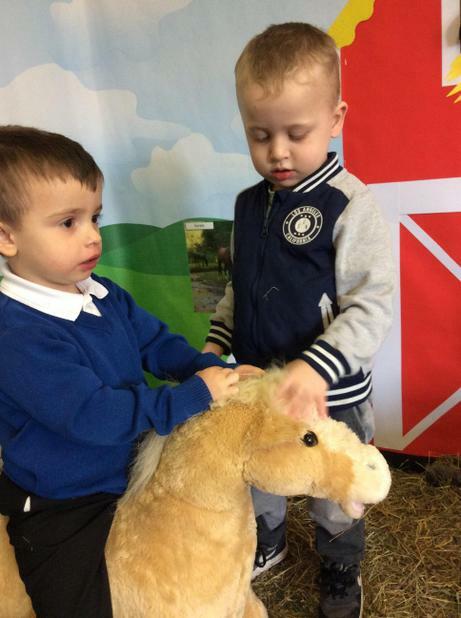 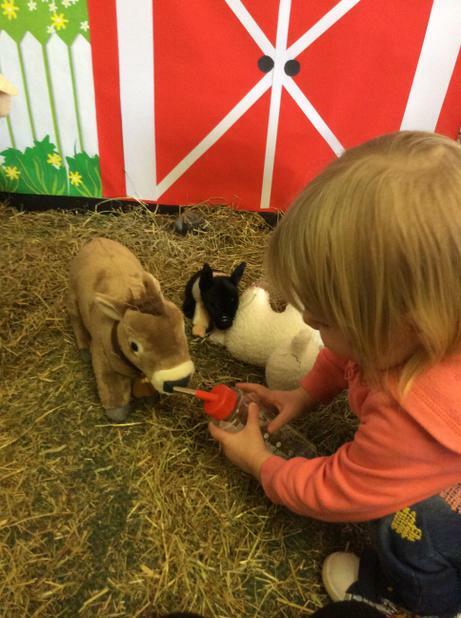 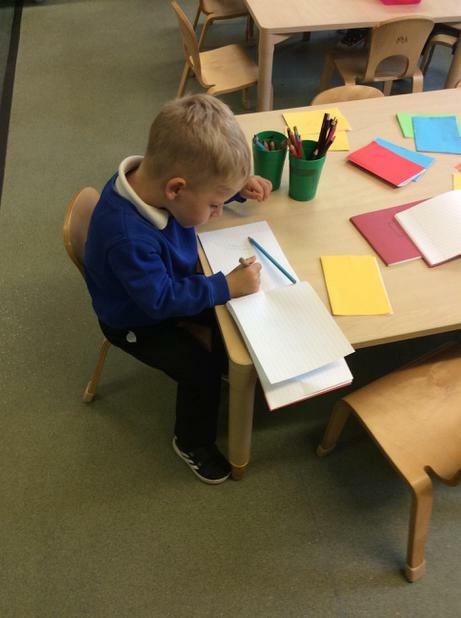 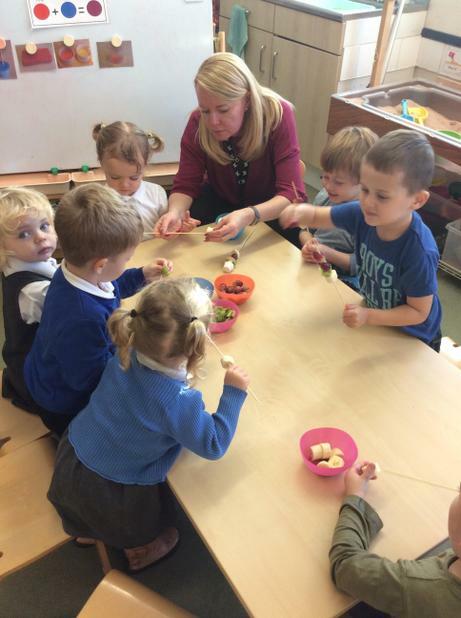 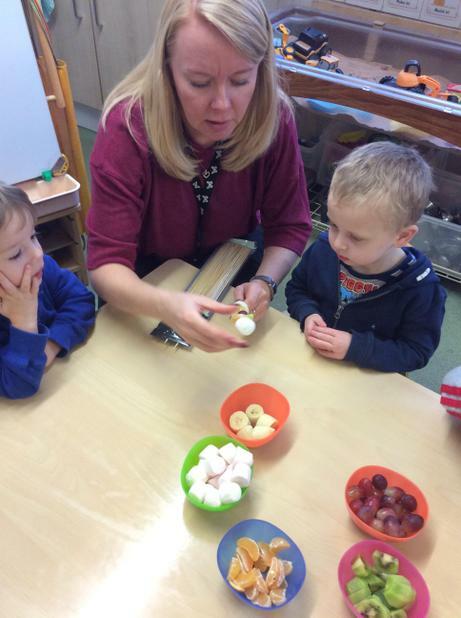 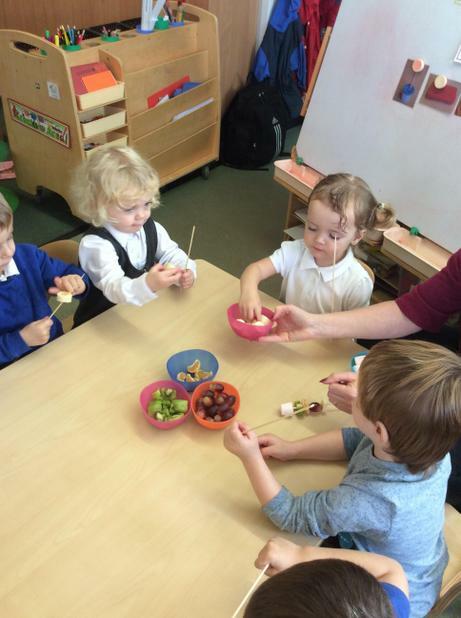 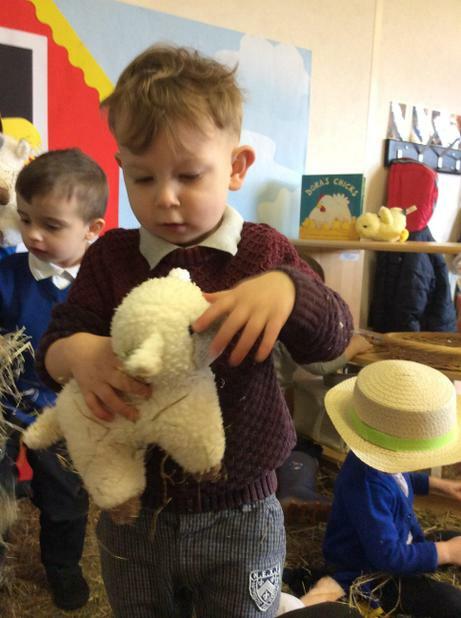 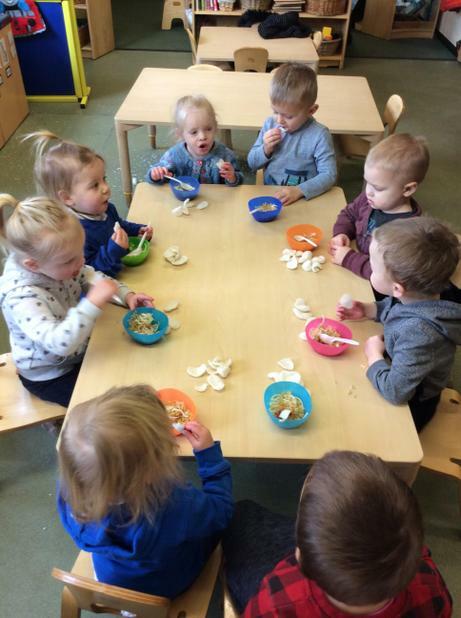 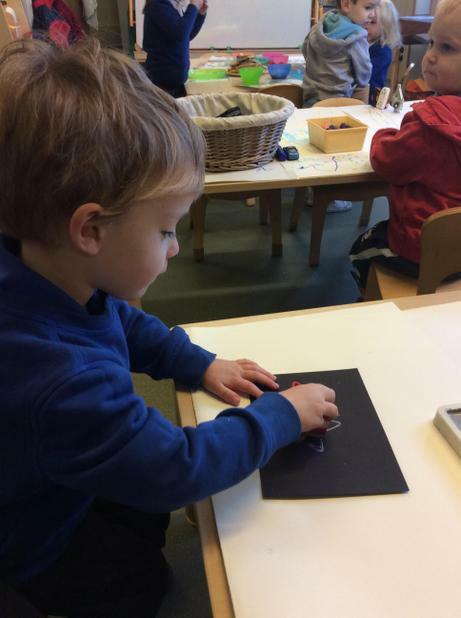 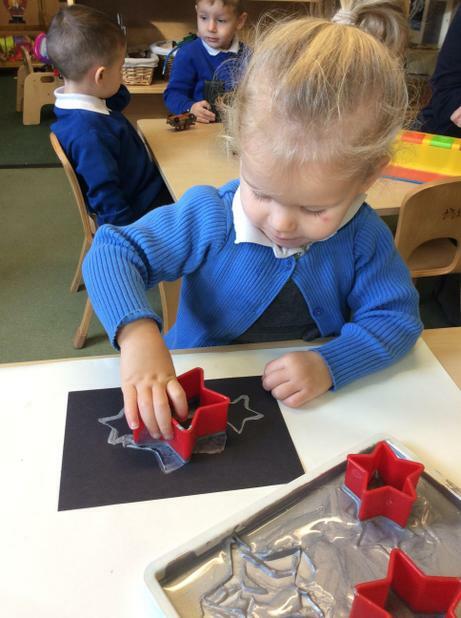 This week in Smarties we have welcomed our new children into setting.